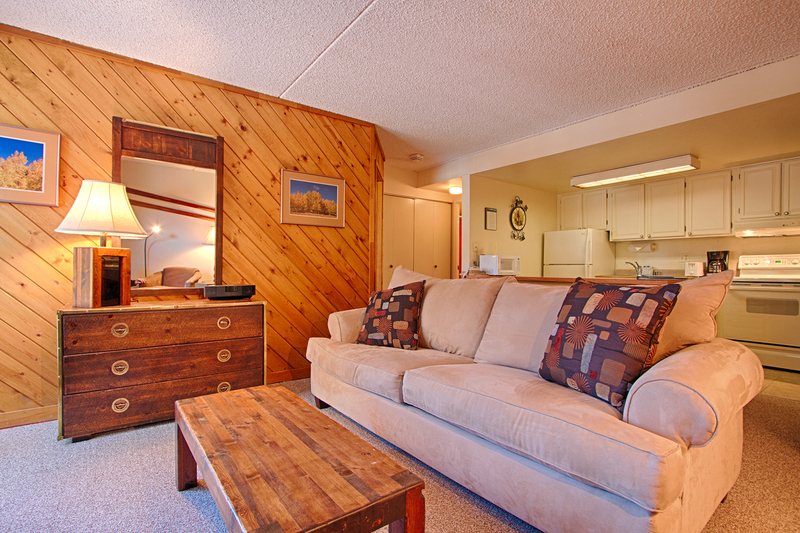 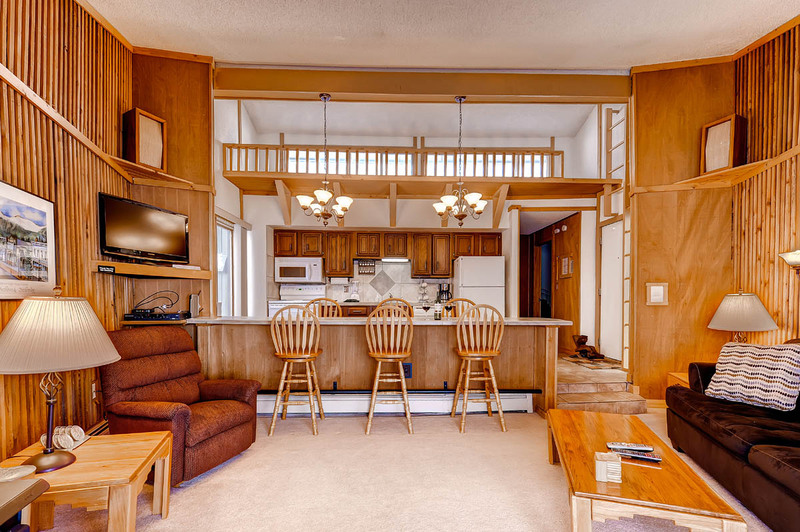 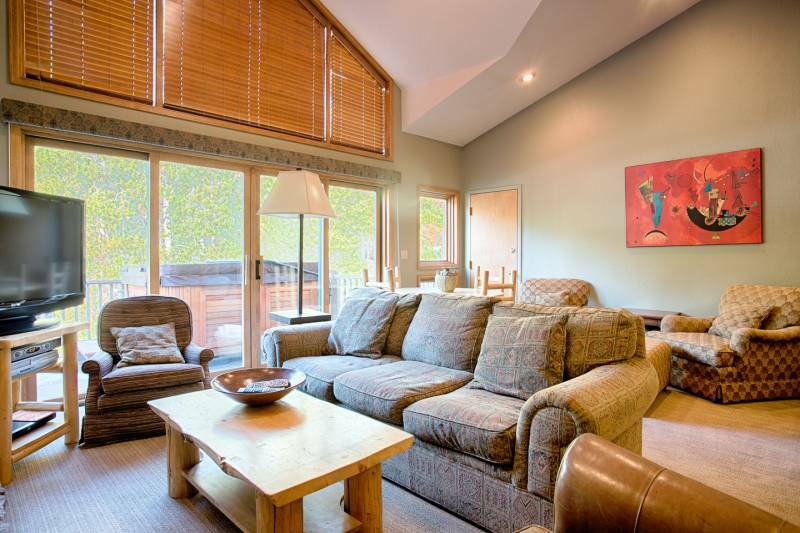 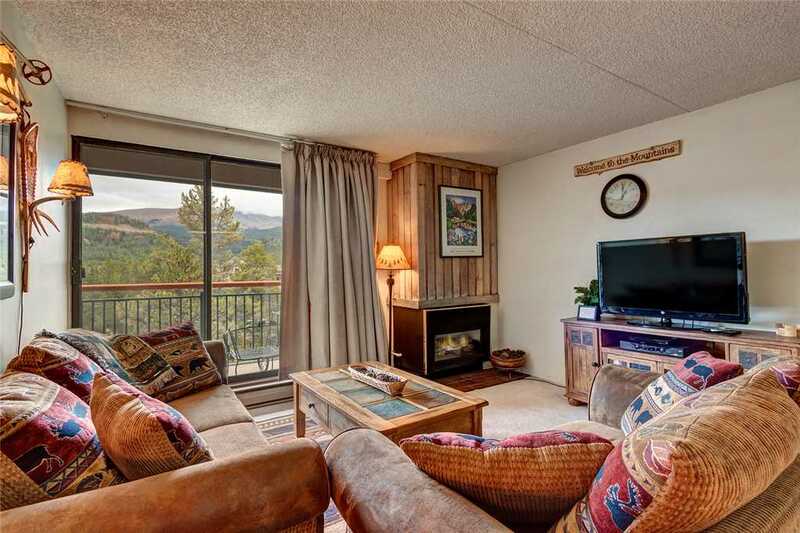 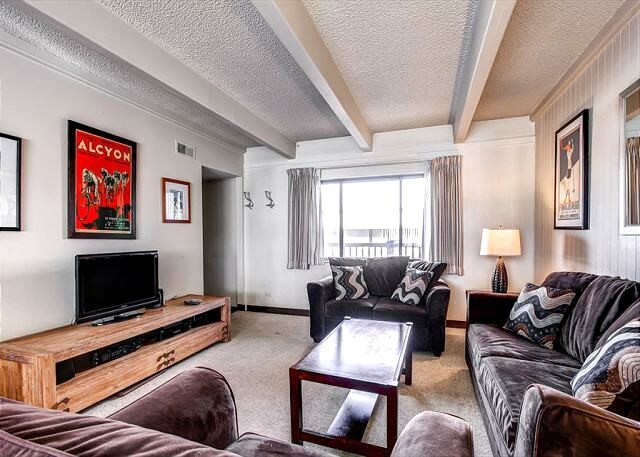 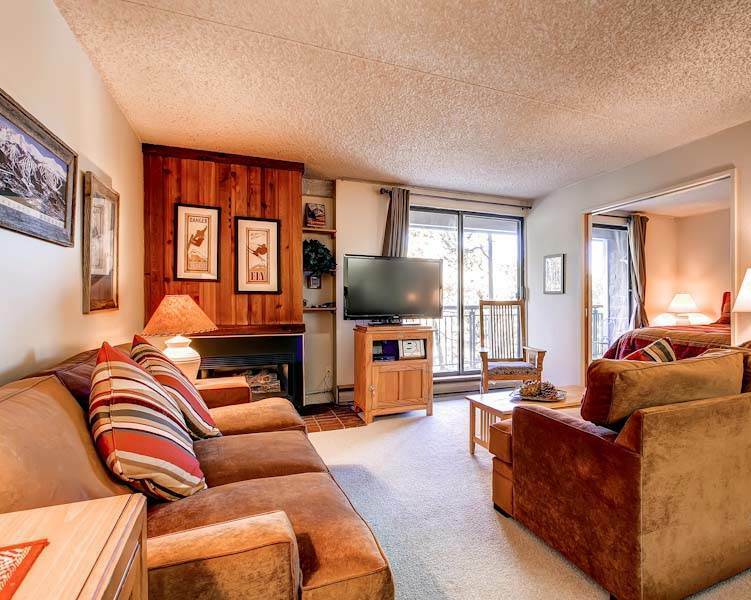 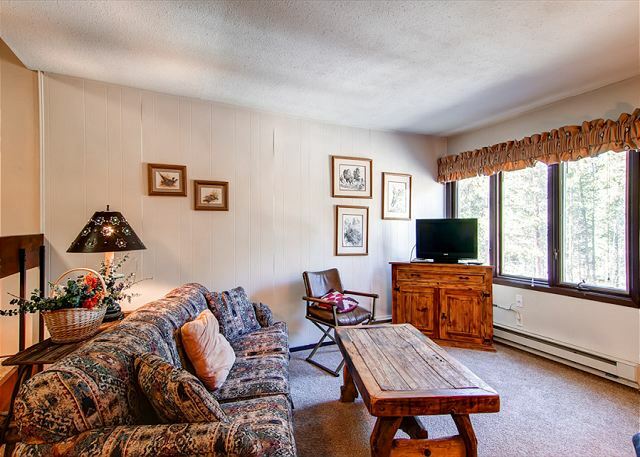 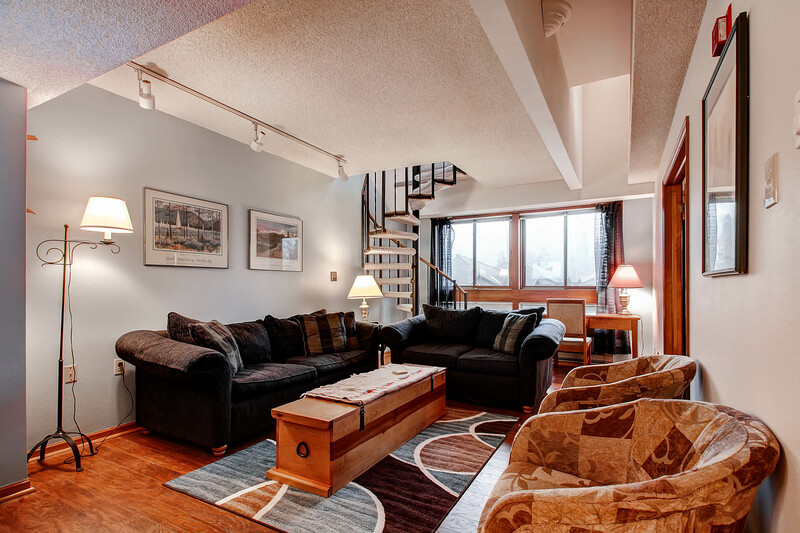 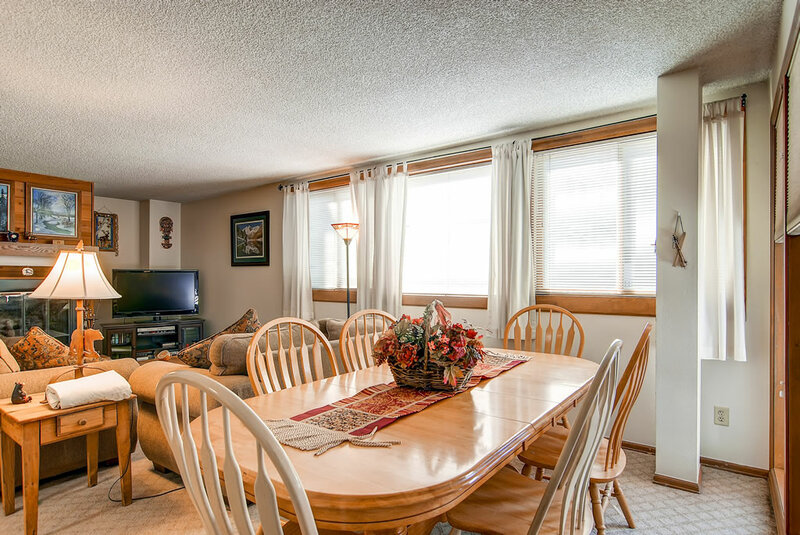 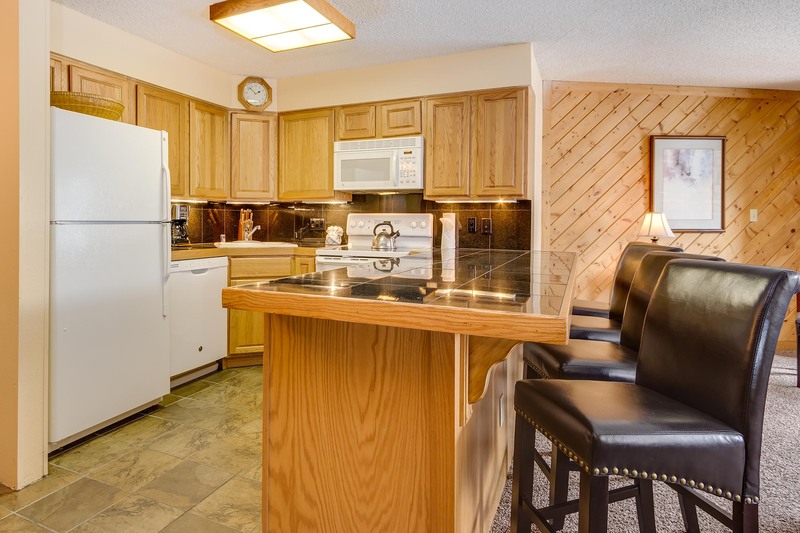 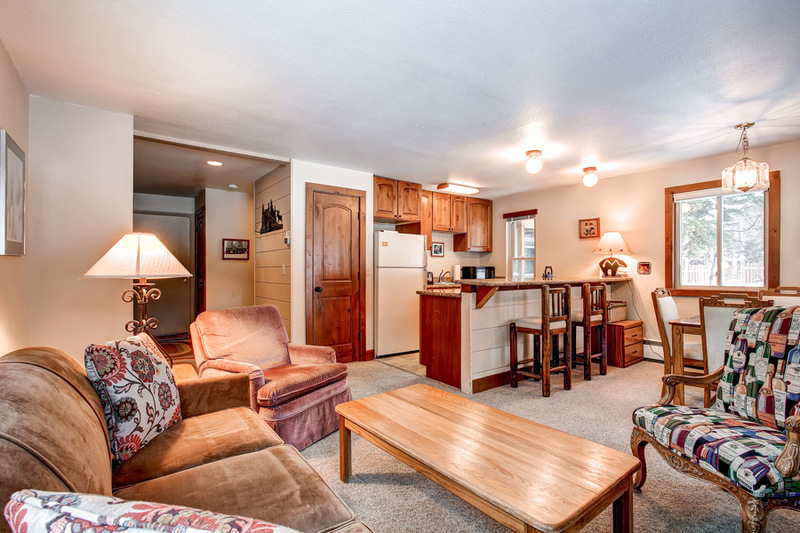 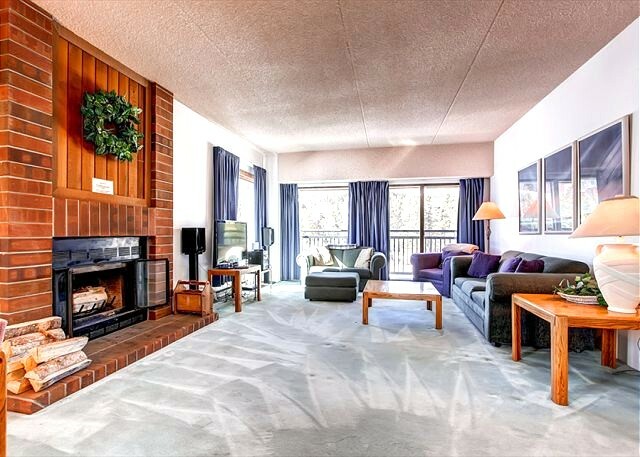 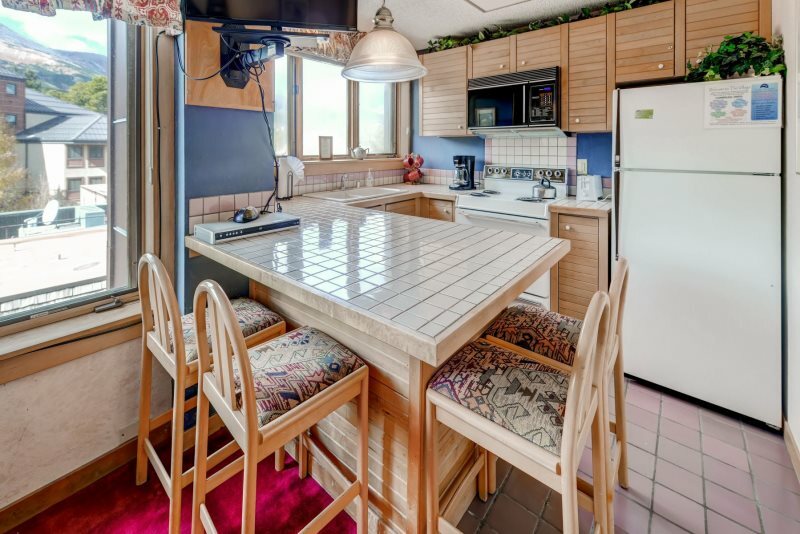 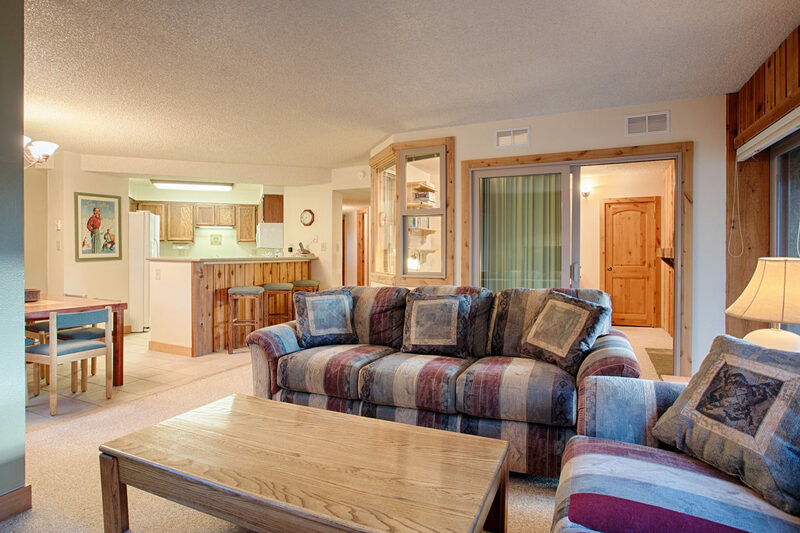 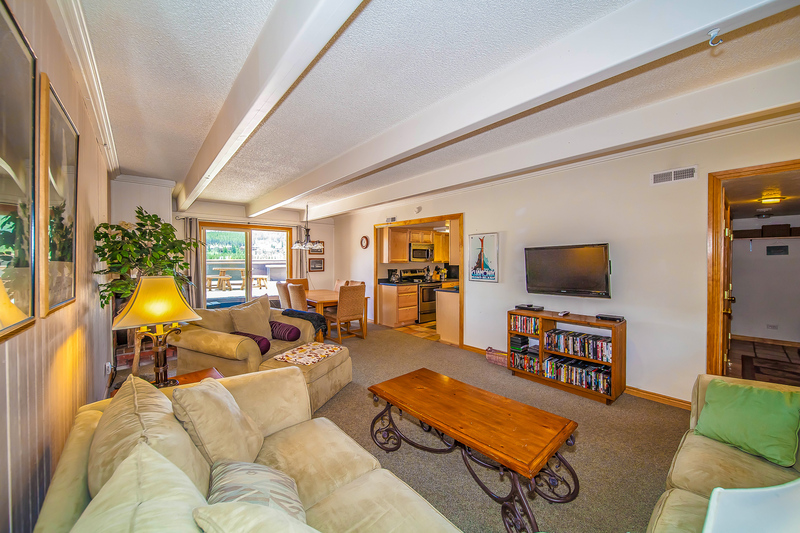 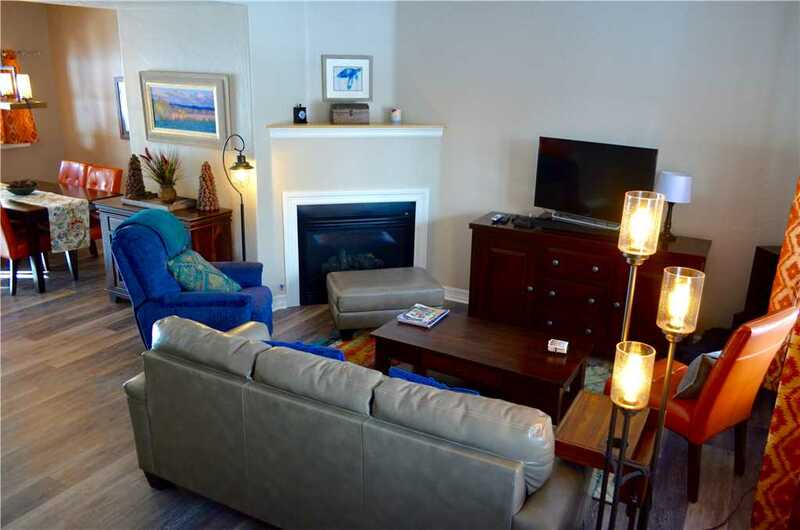 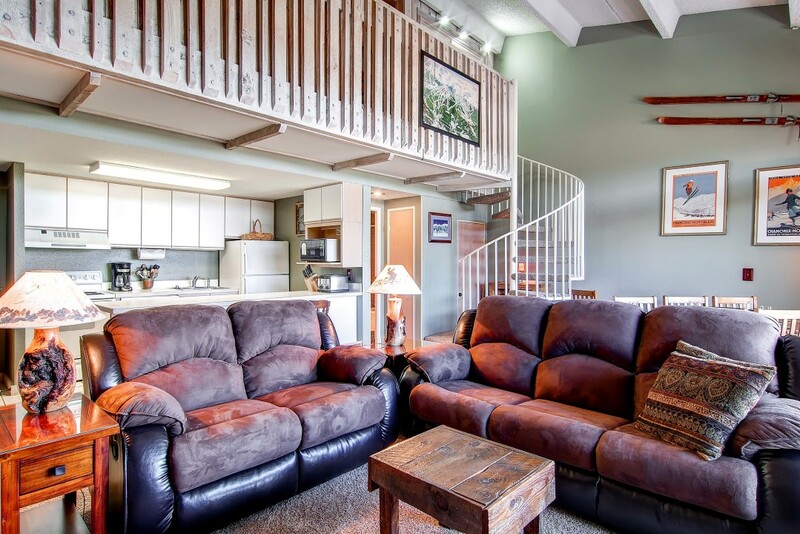 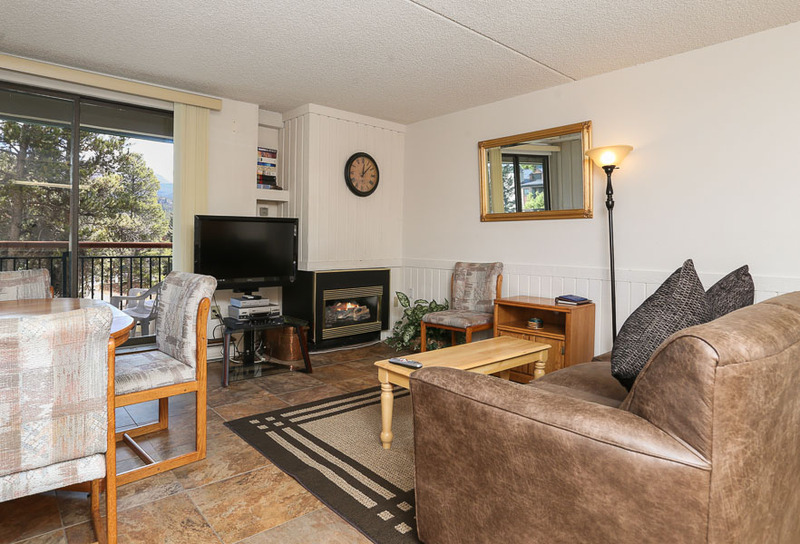 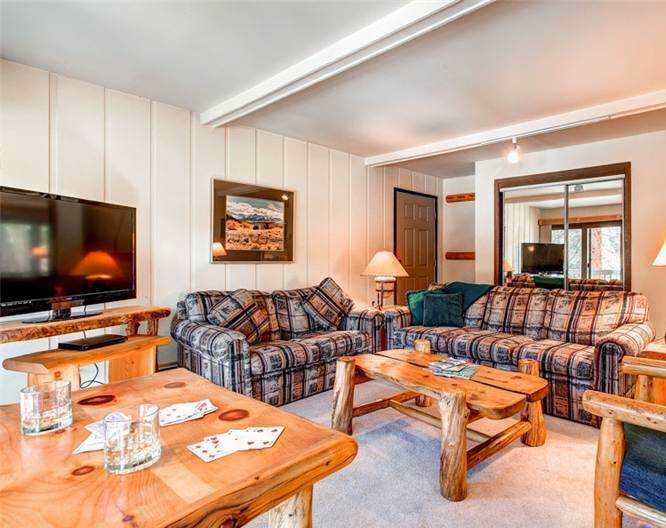 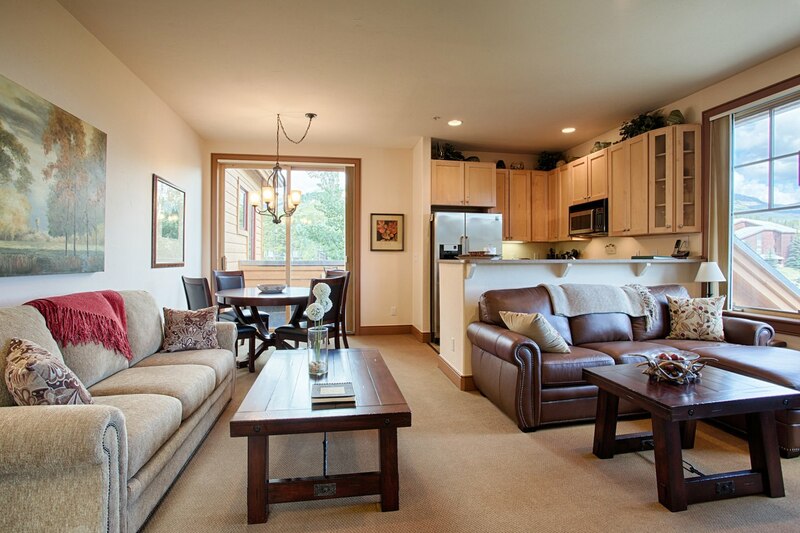 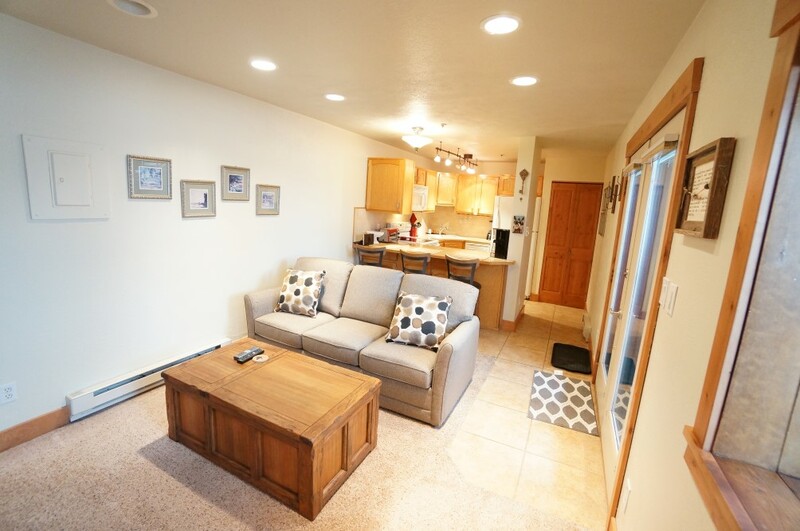 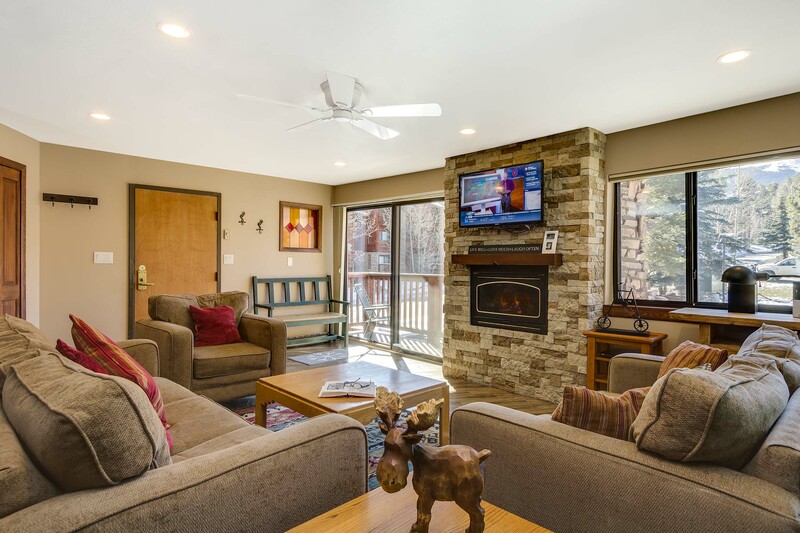 Aptly named, this 3-bedroom, 2.5-bathroom deluxe triplex is an affordable, pet-friendly choice for families and groups up to nine. 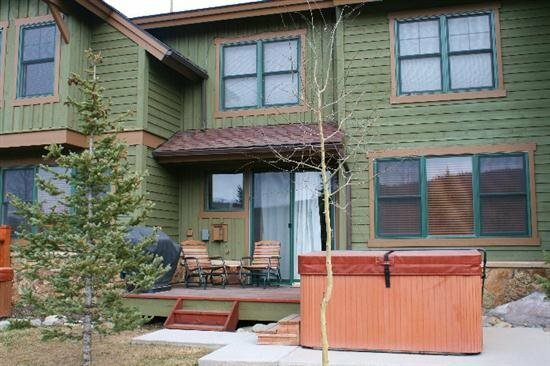 Don’t be surprised if a local family of foxes frolic while you enjoy your morning coffee or an evening soak. 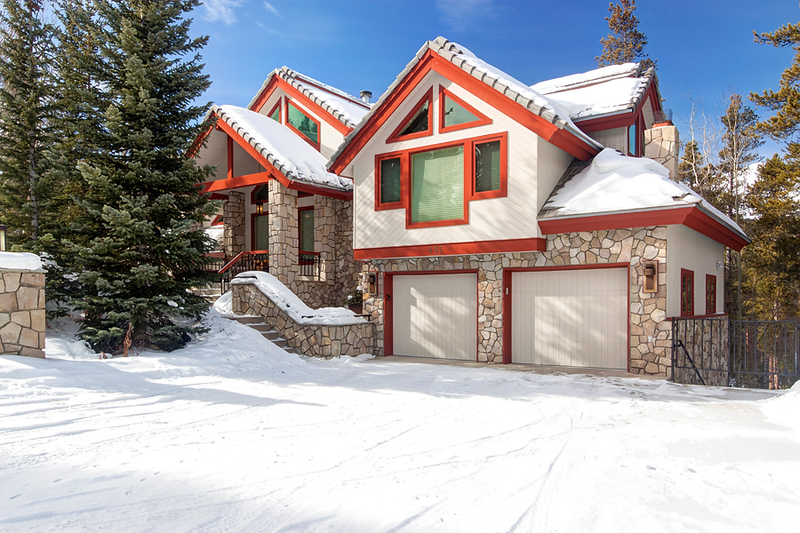 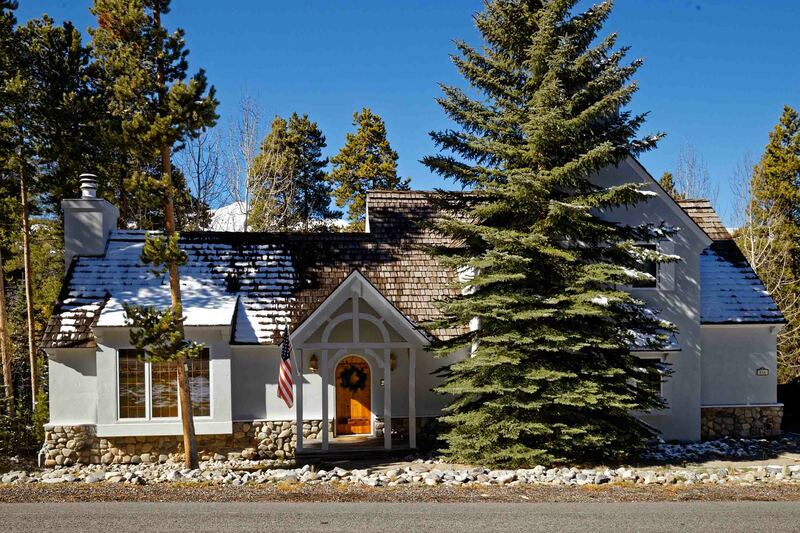 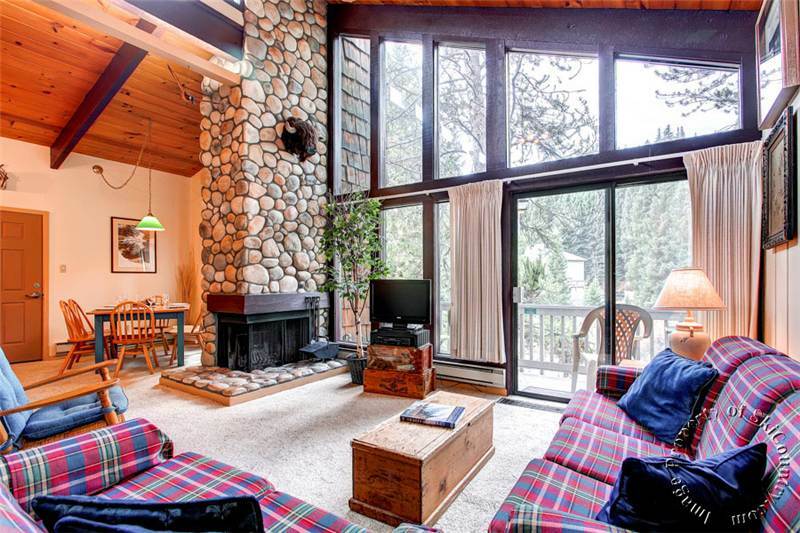 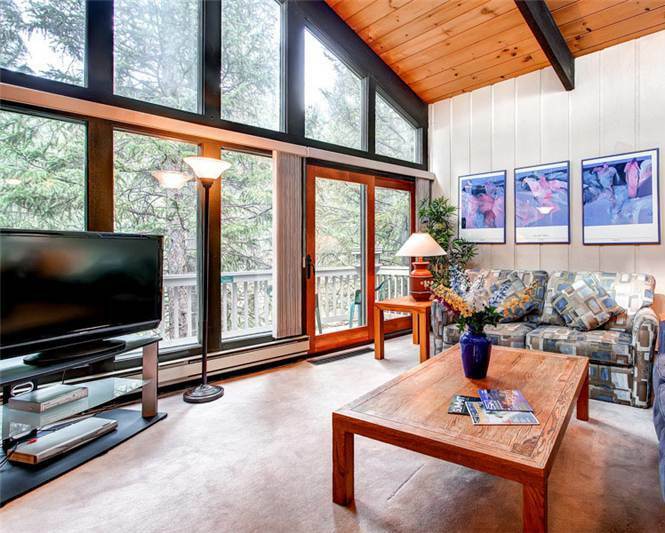 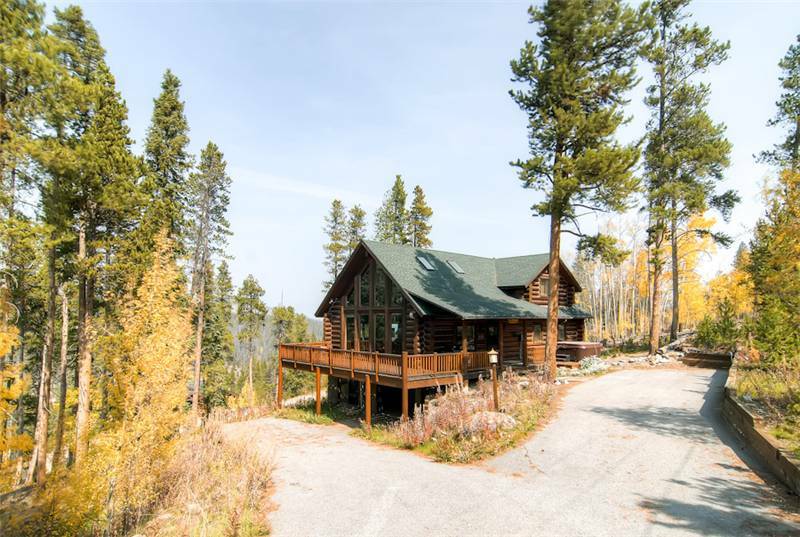 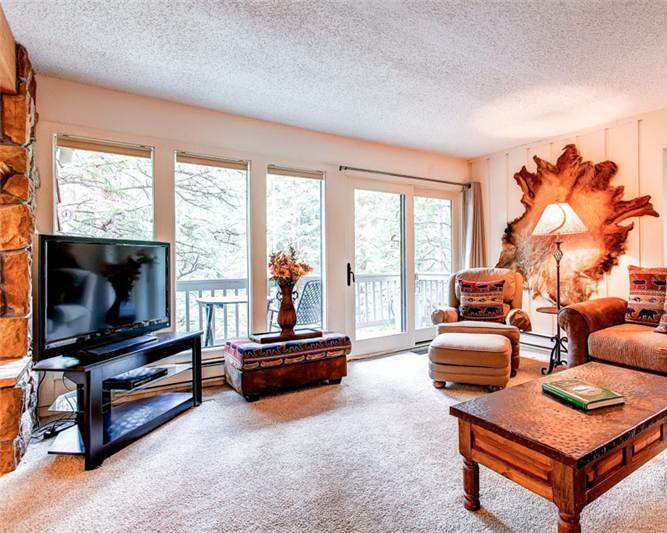 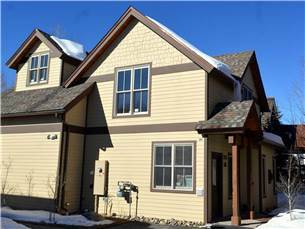 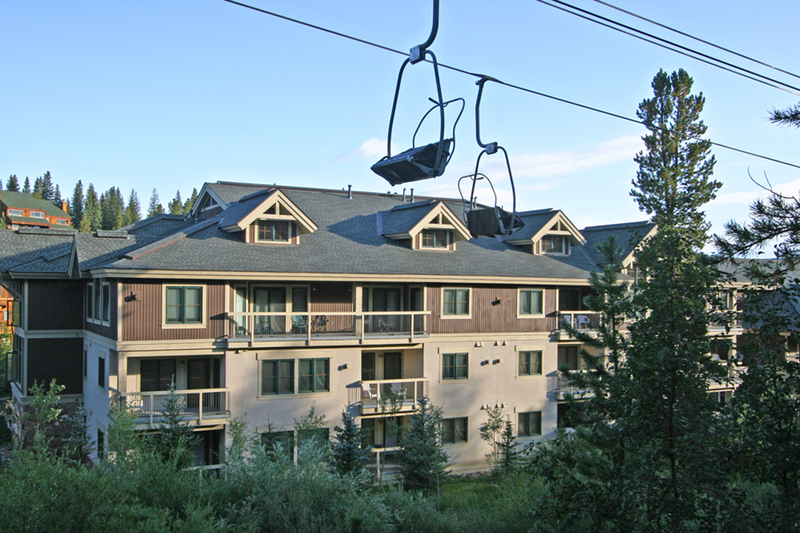 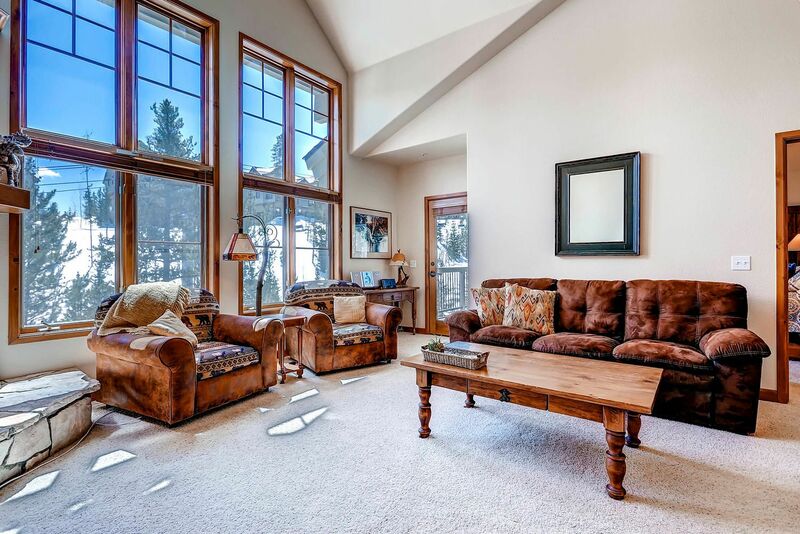 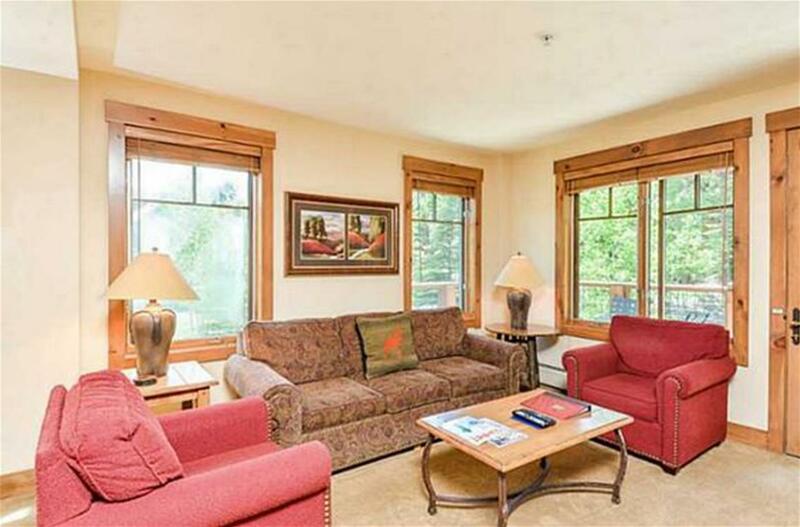 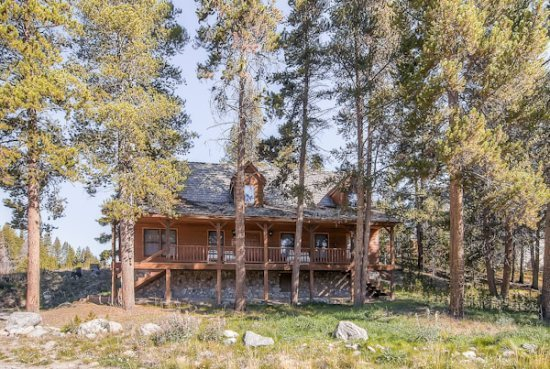 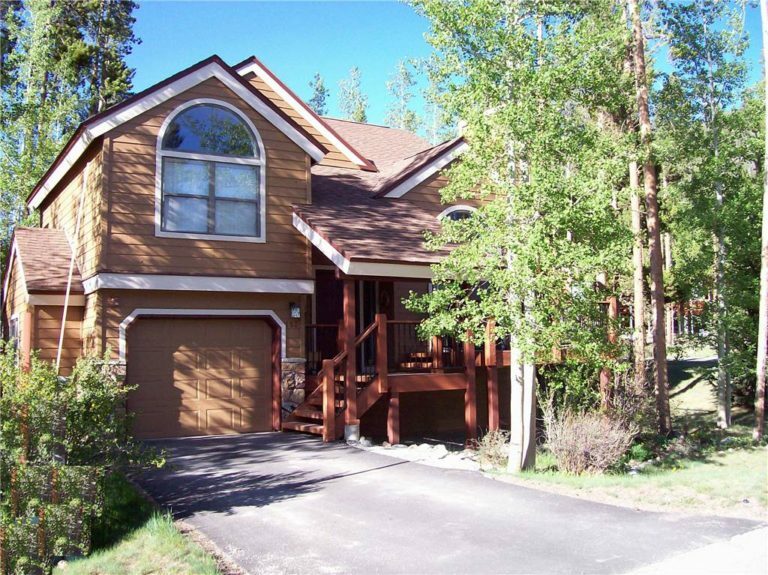 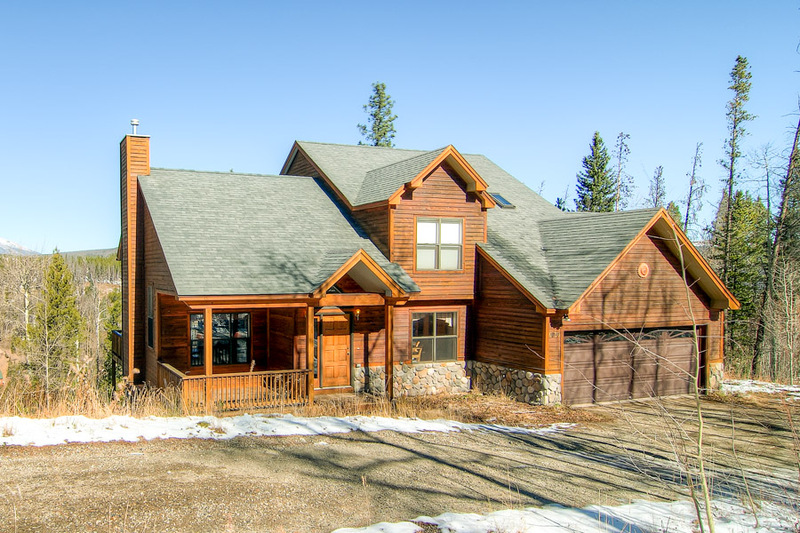 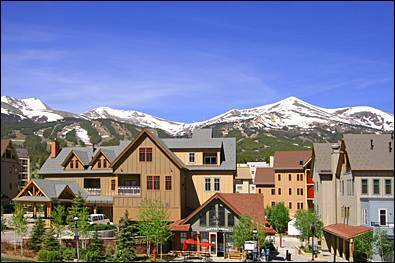 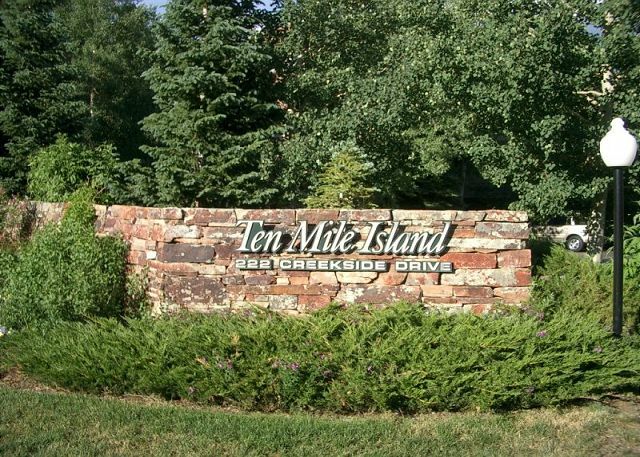 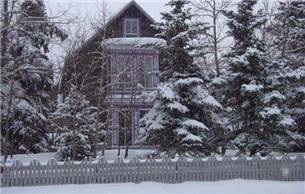 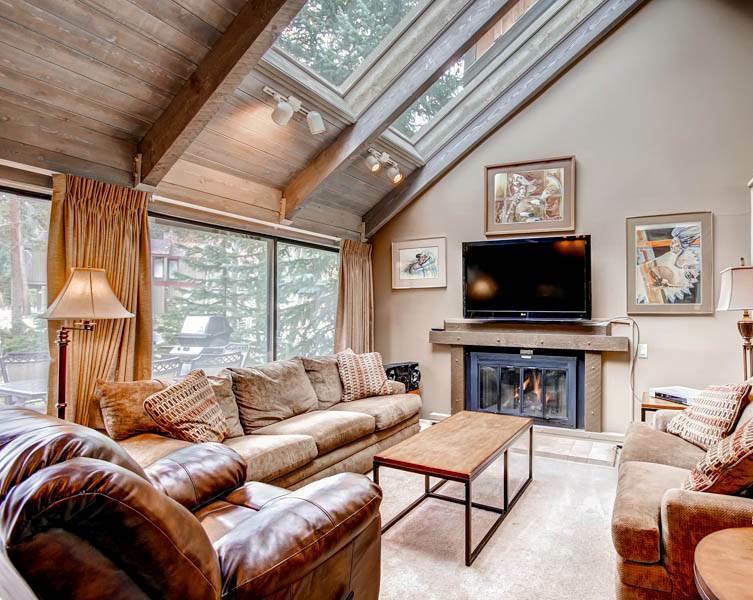 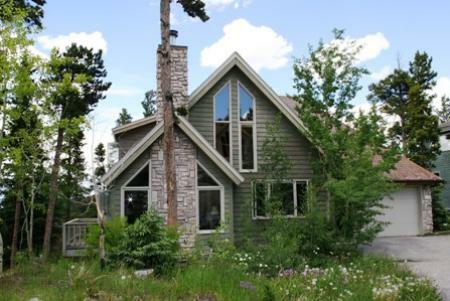 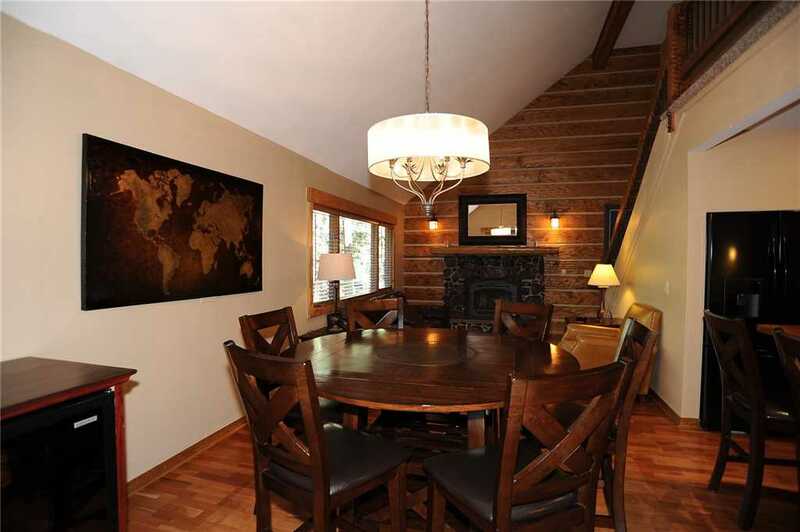 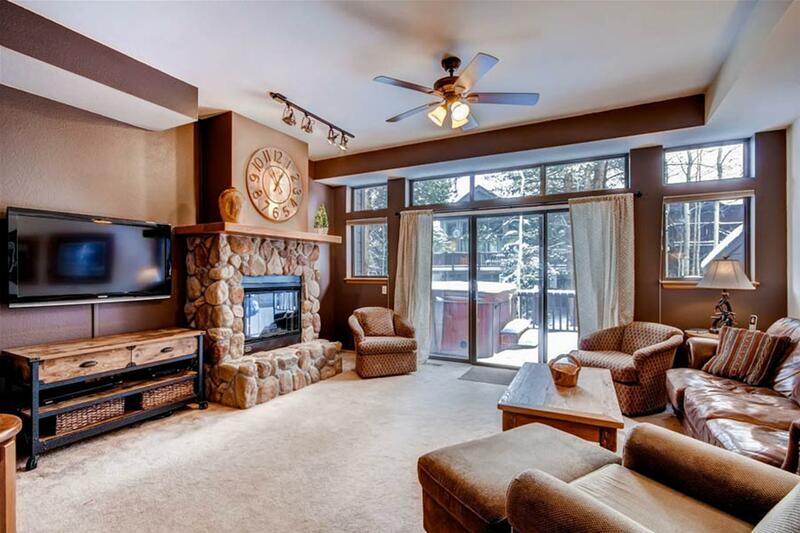 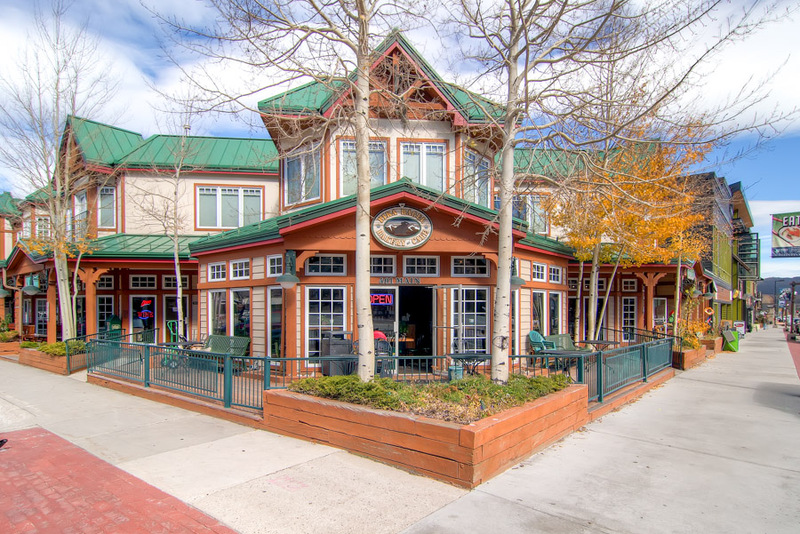 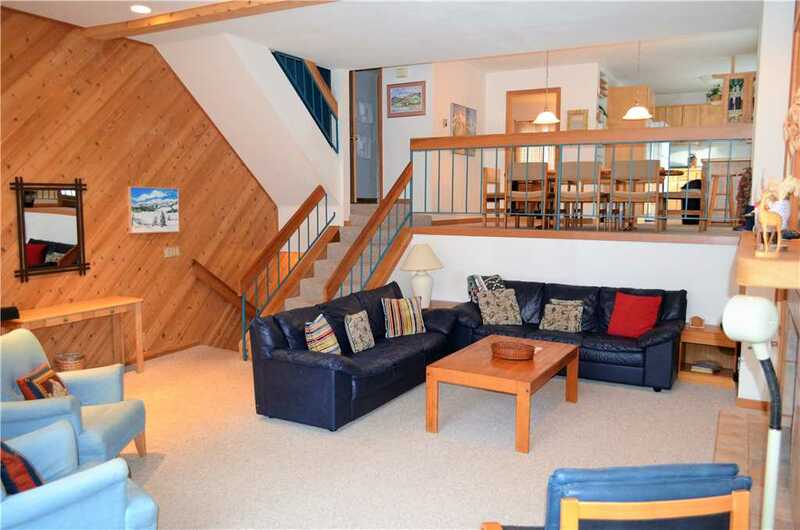 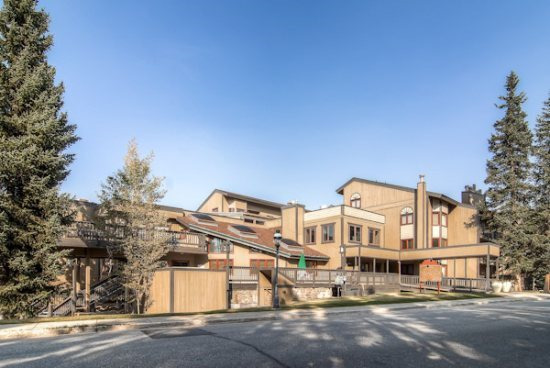 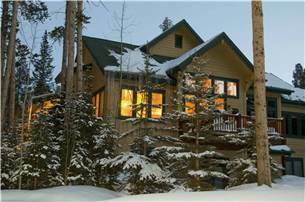 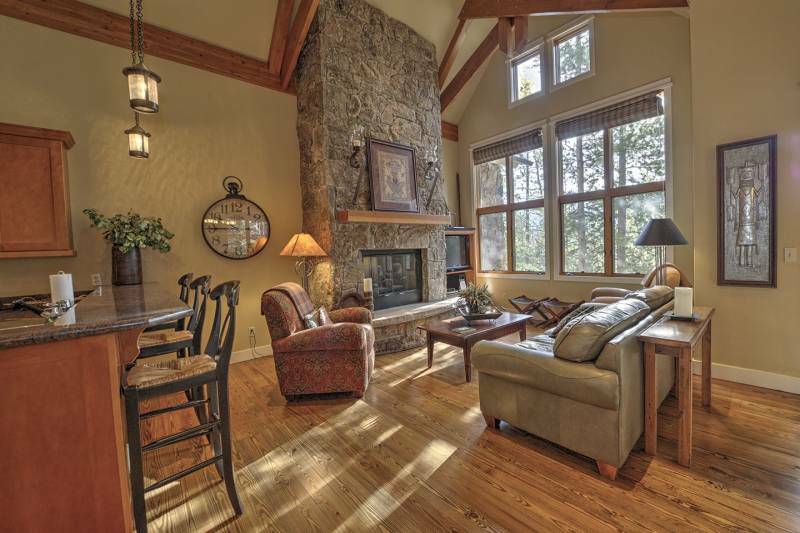 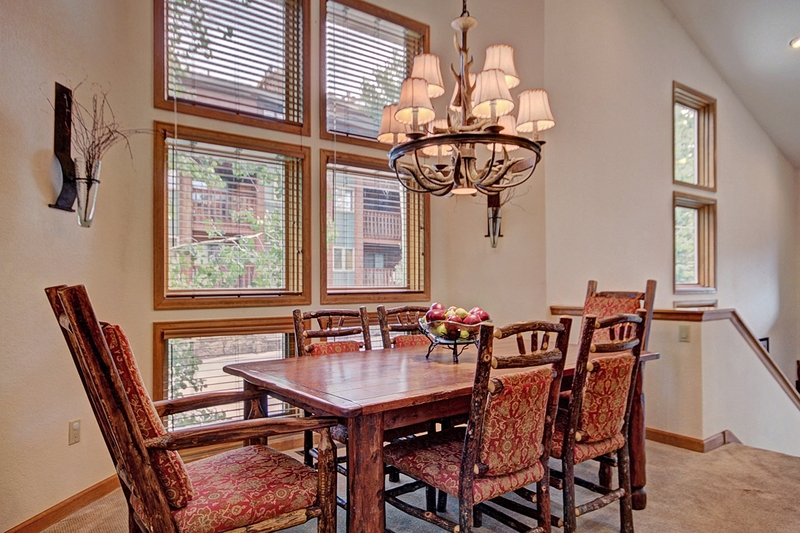 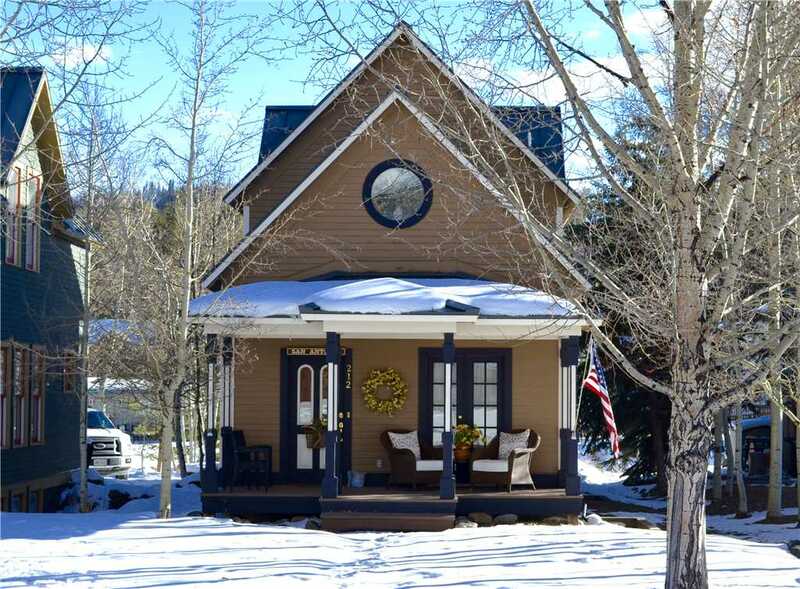 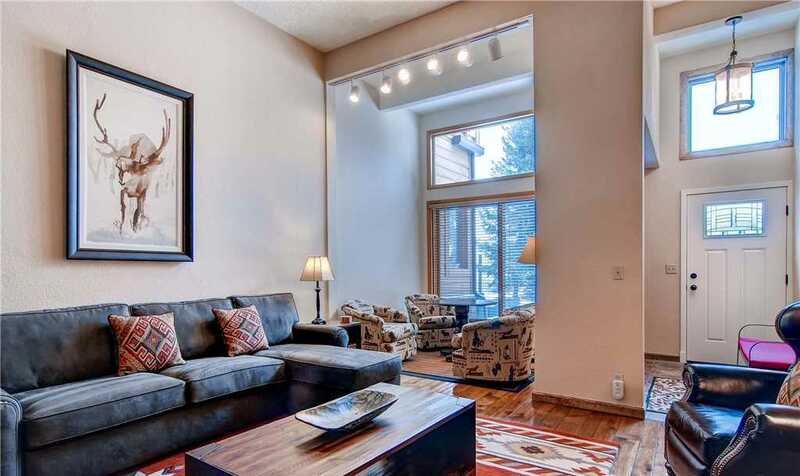 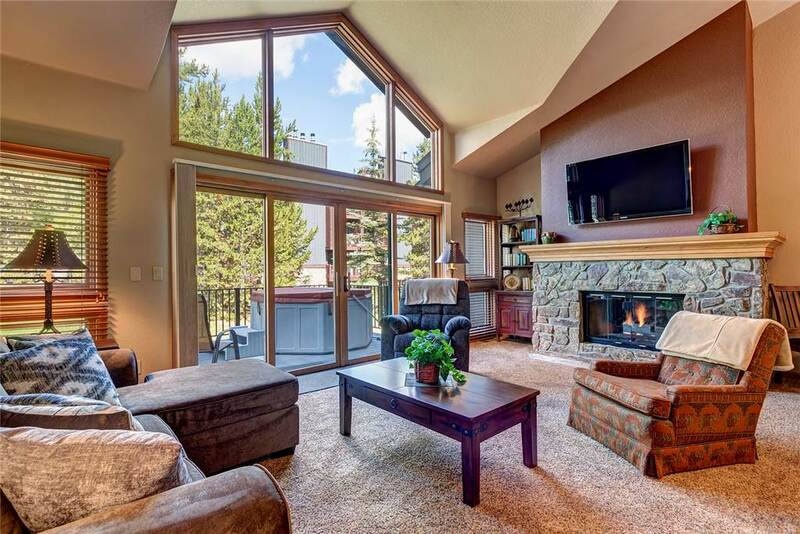 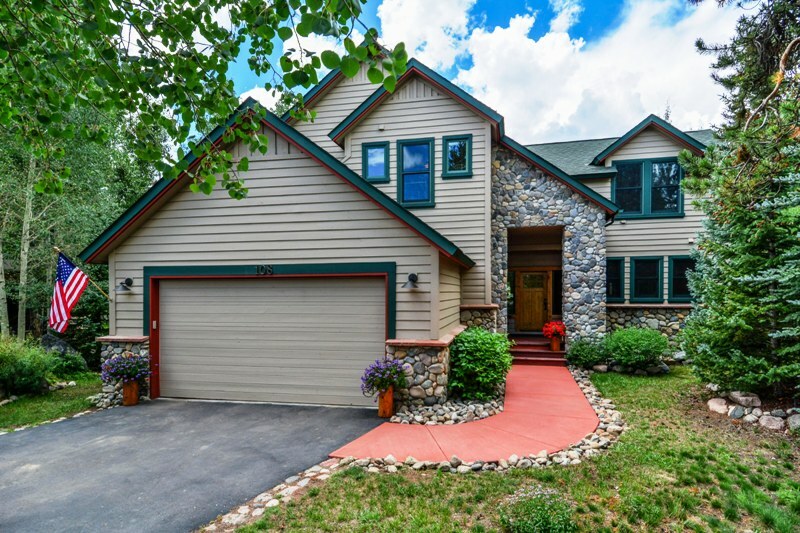 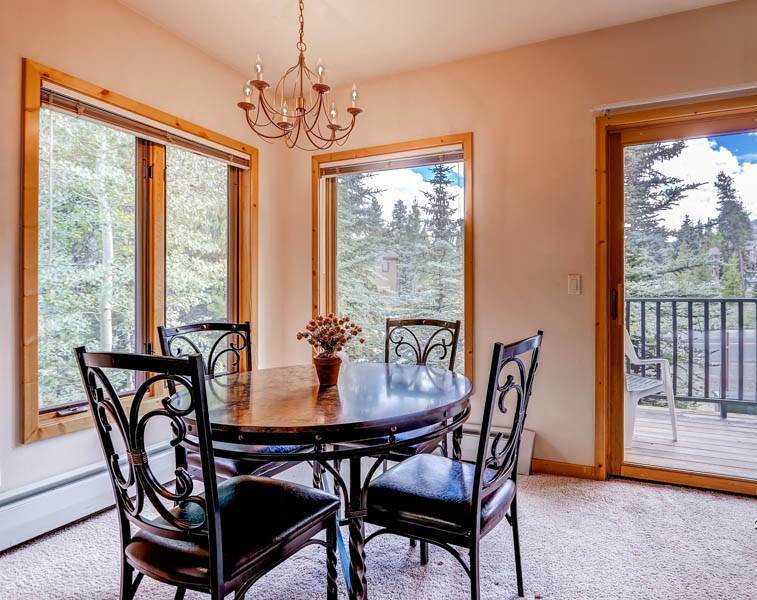 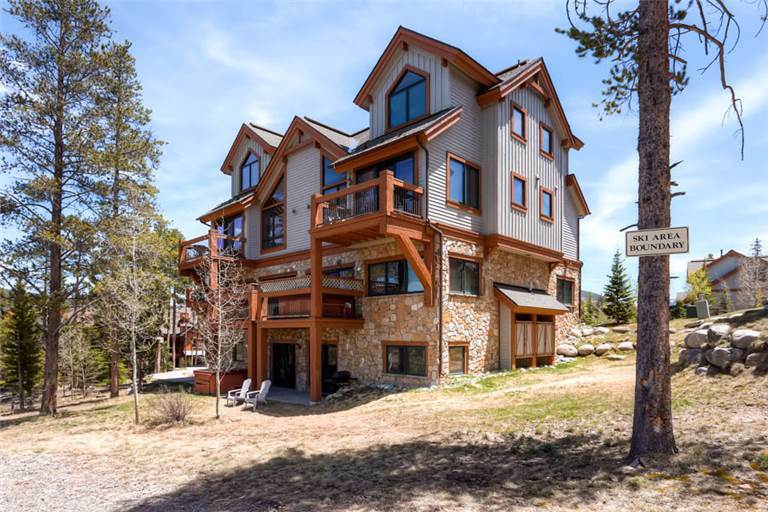 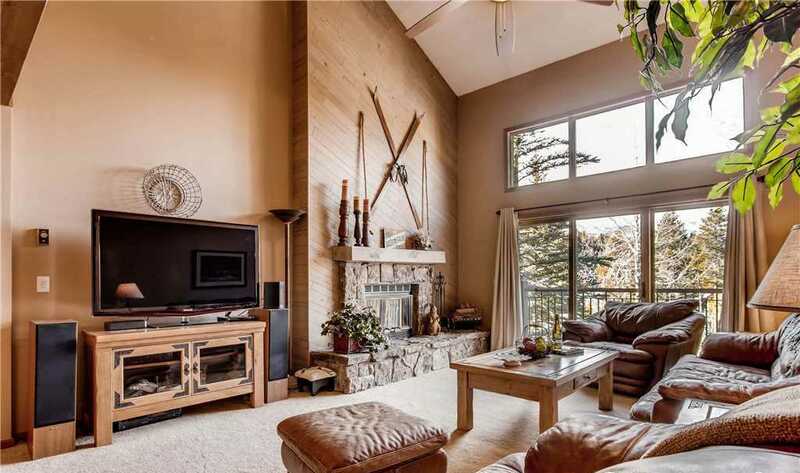 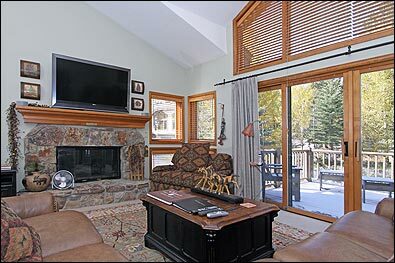 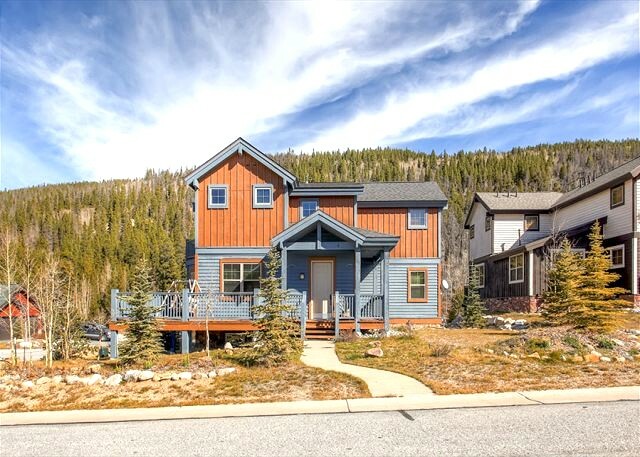 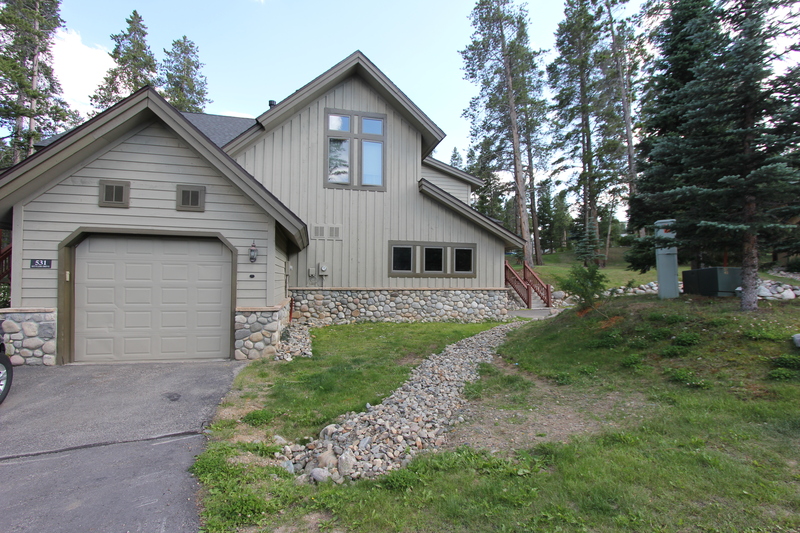 Set in the trees in Breckenridge’s Wellington neighborhood with views of the slopes, it’s about a half-mile walk/drive to Main St. Breckenridge. 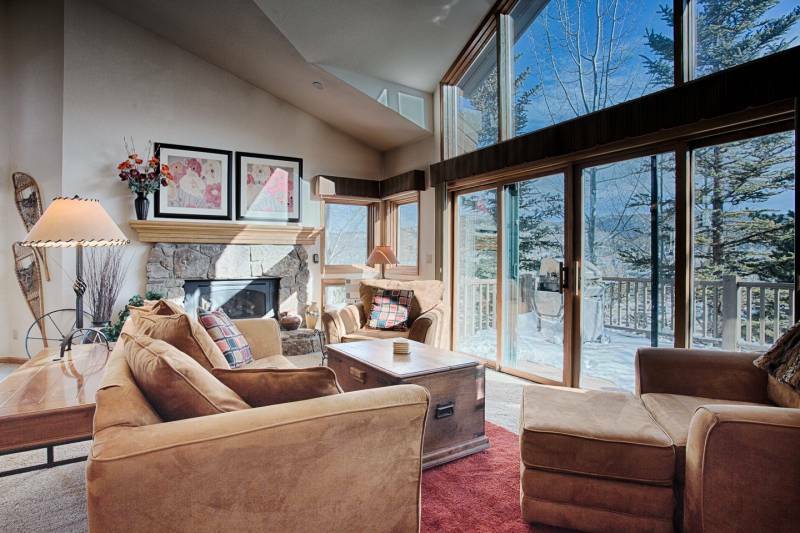 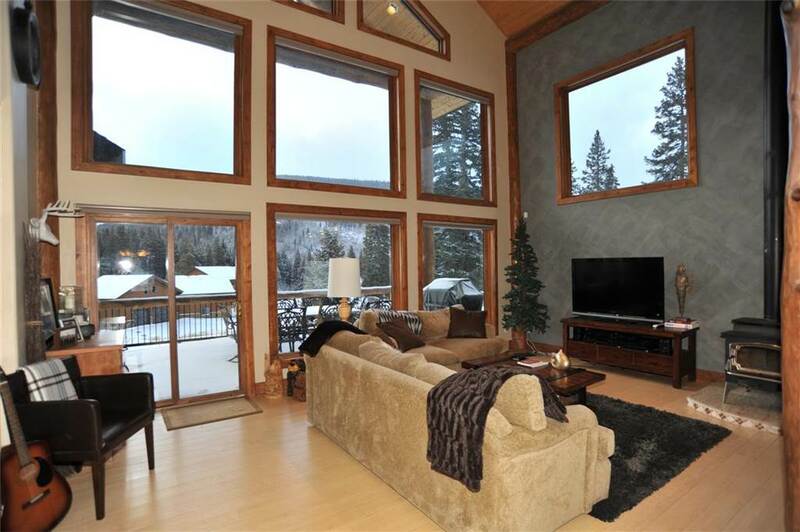 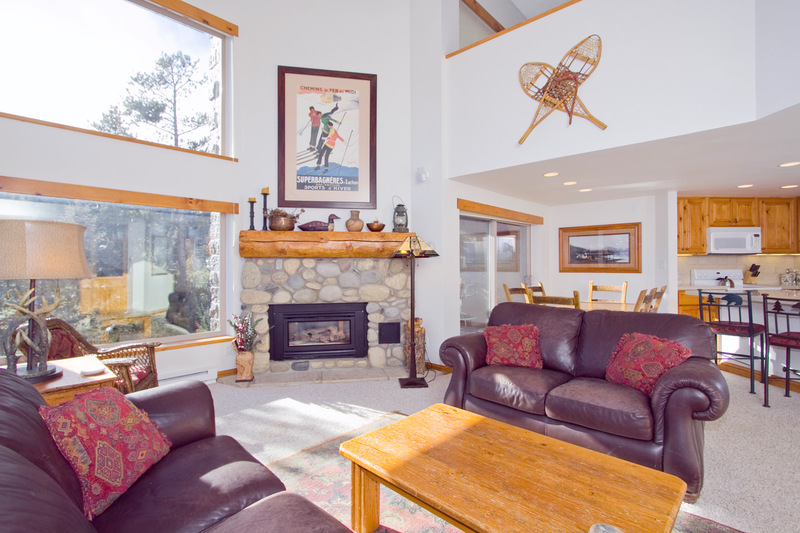 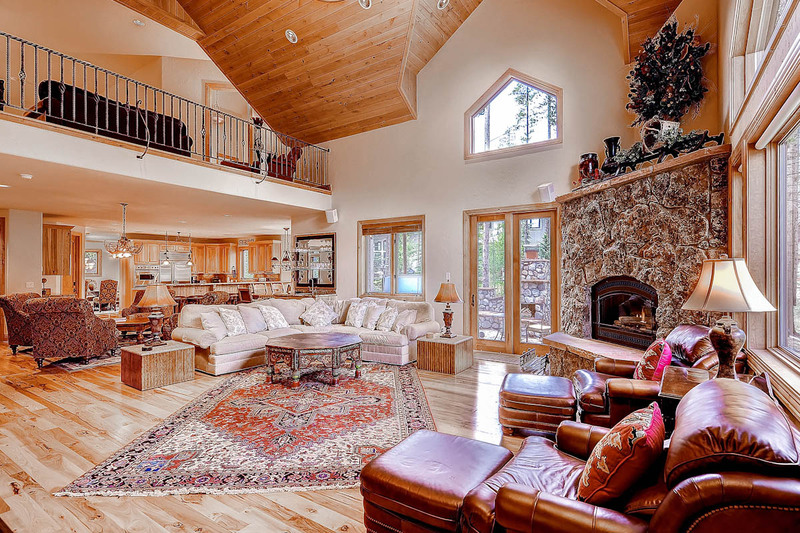 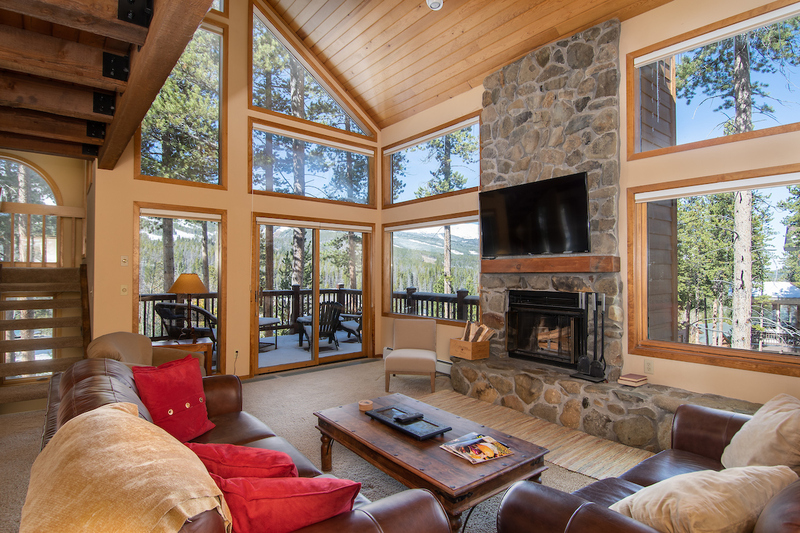 Inside, the living area is bright, open and roomy with floor-to-ceiling windows, allowing for relaxed mornings as the mountain unveils in the near distance. 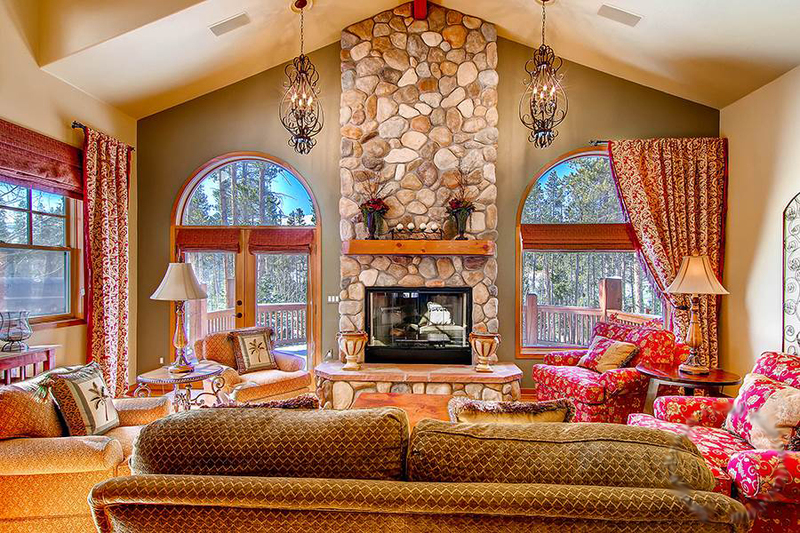 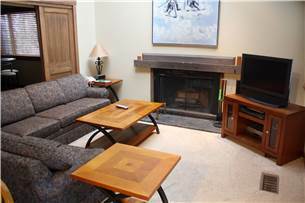 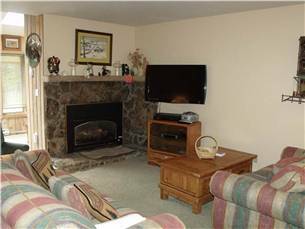 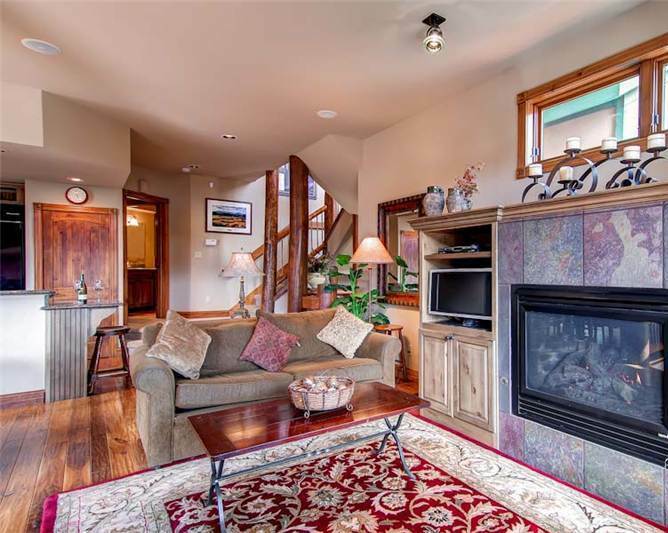 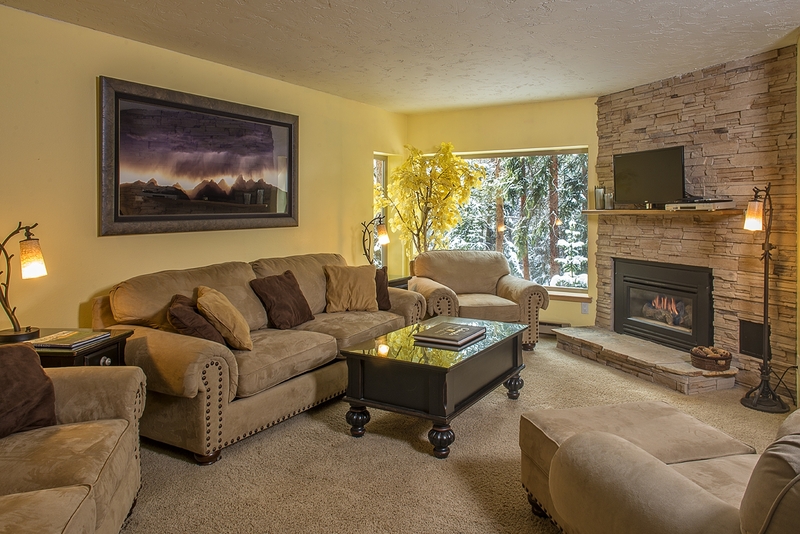 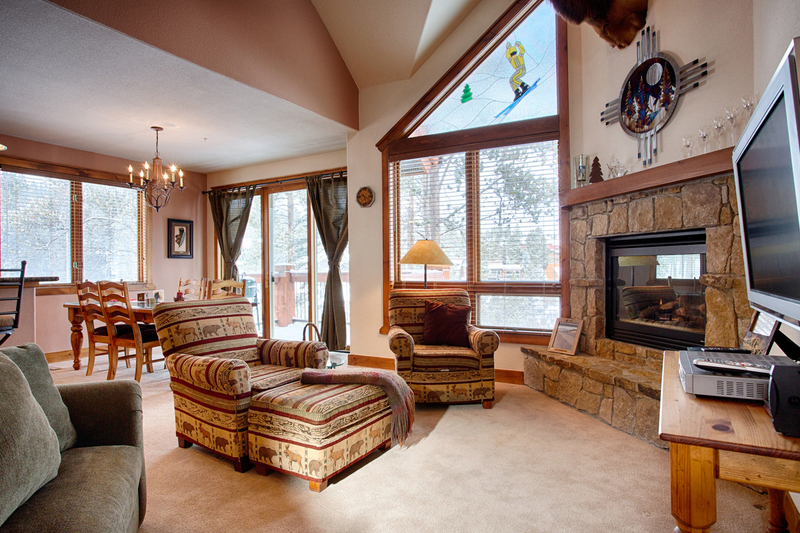 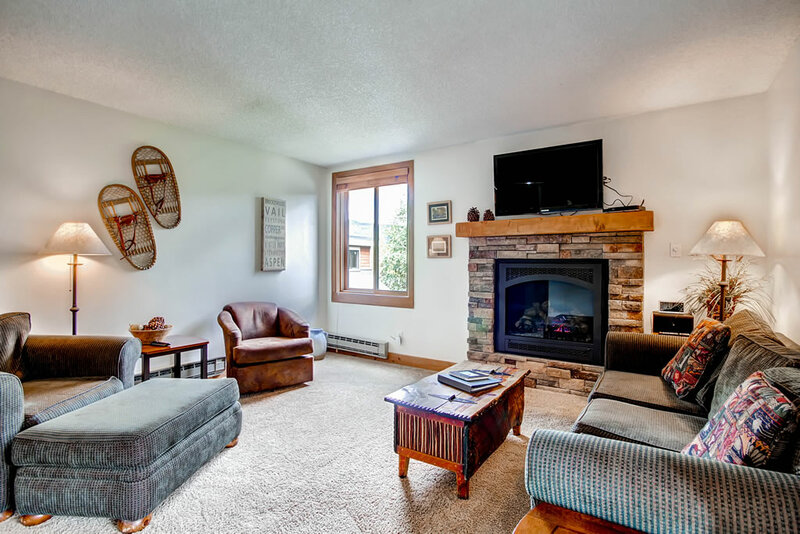 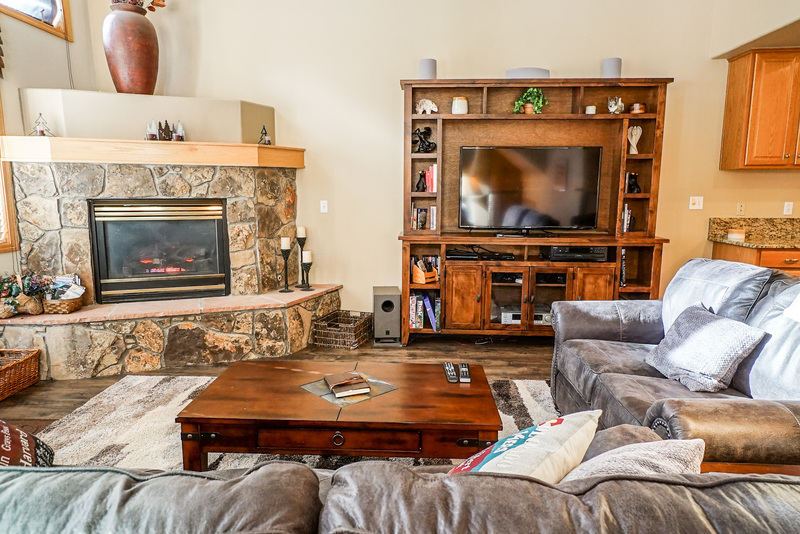 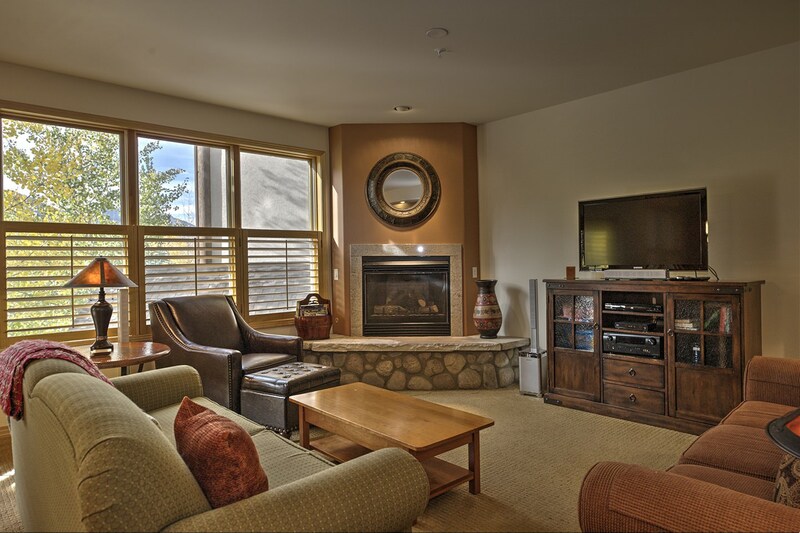 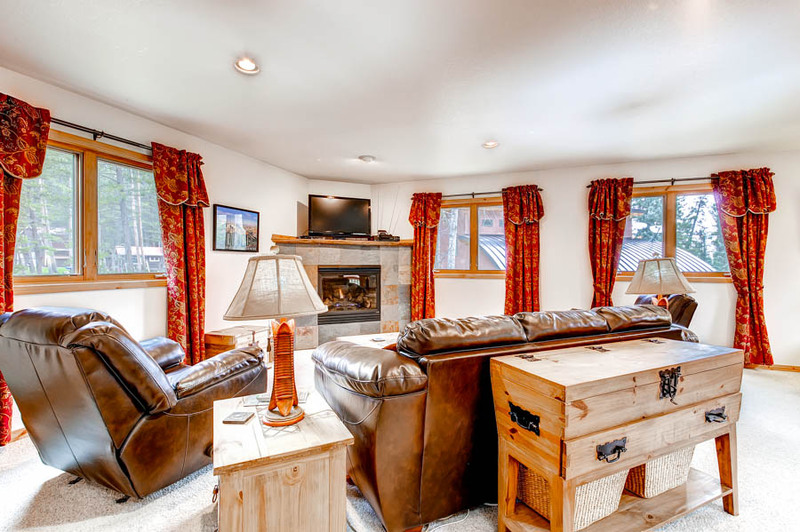 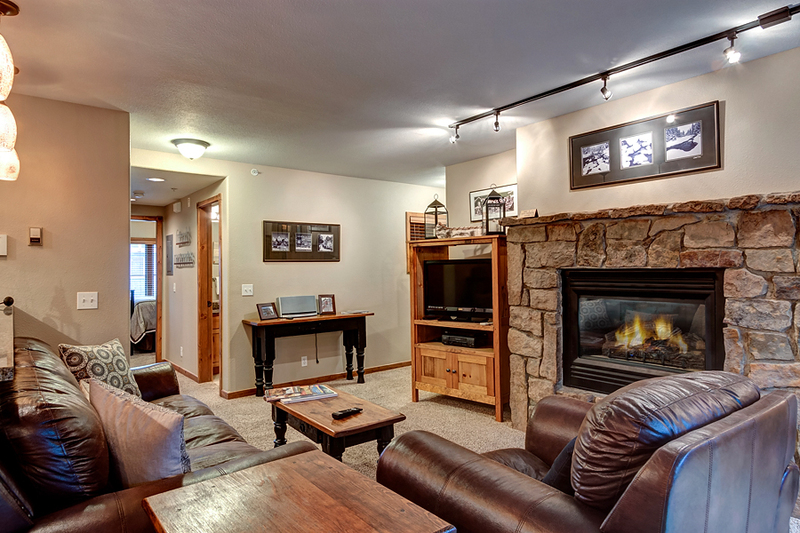 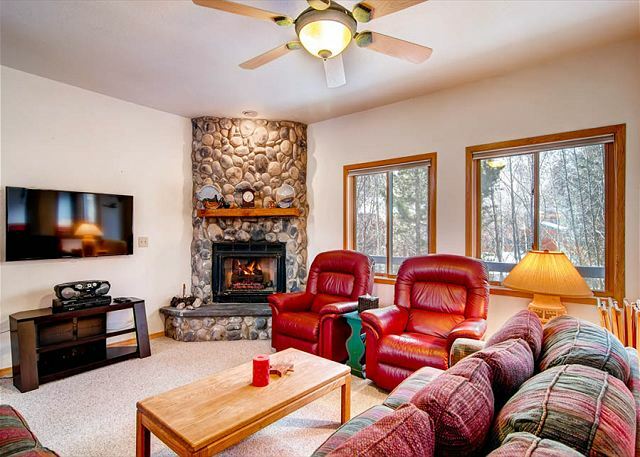 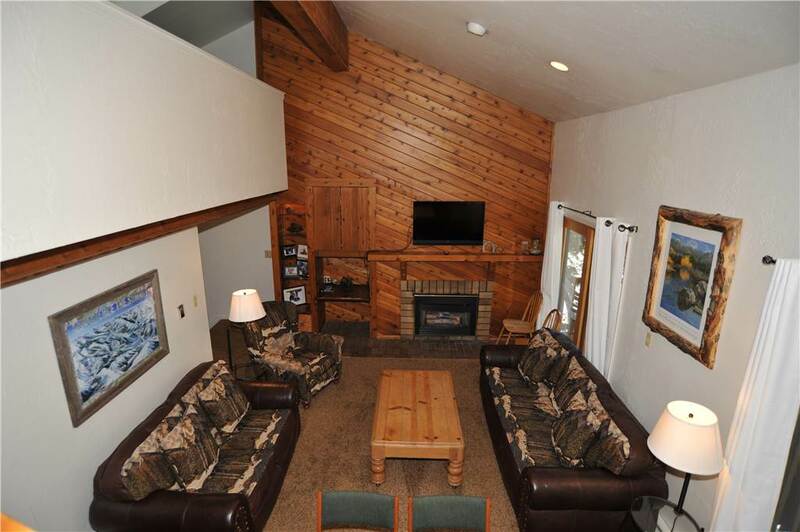 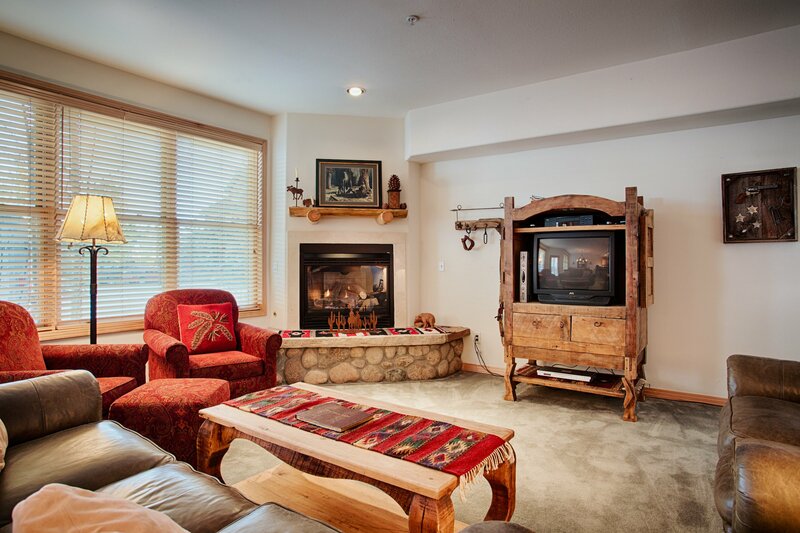 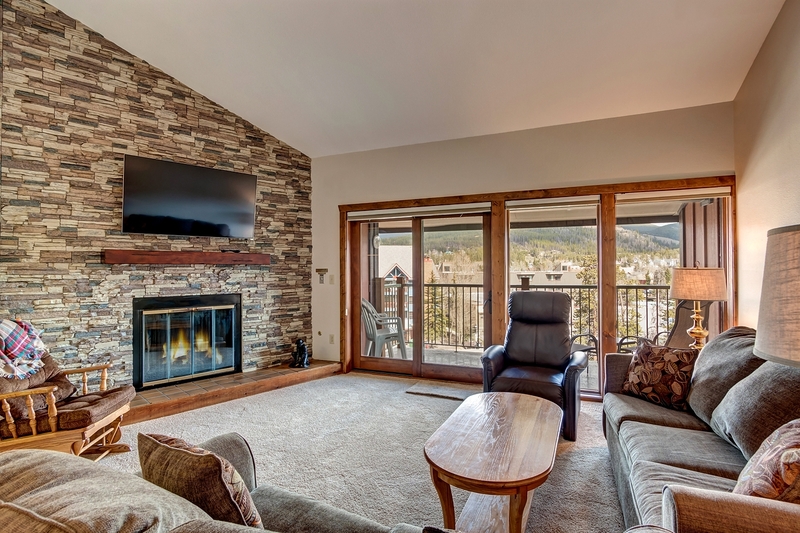 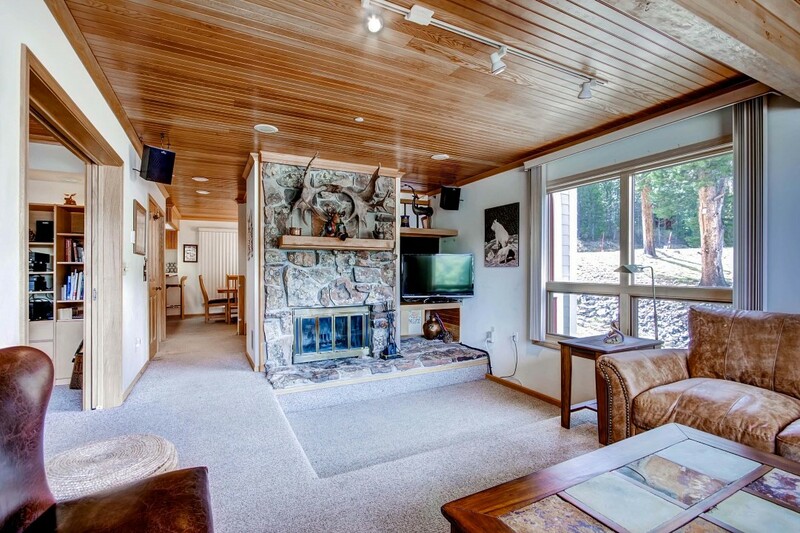 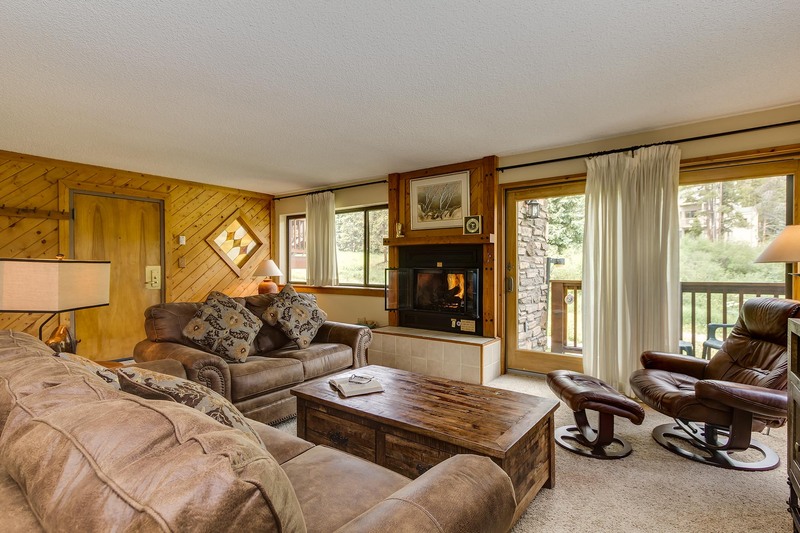 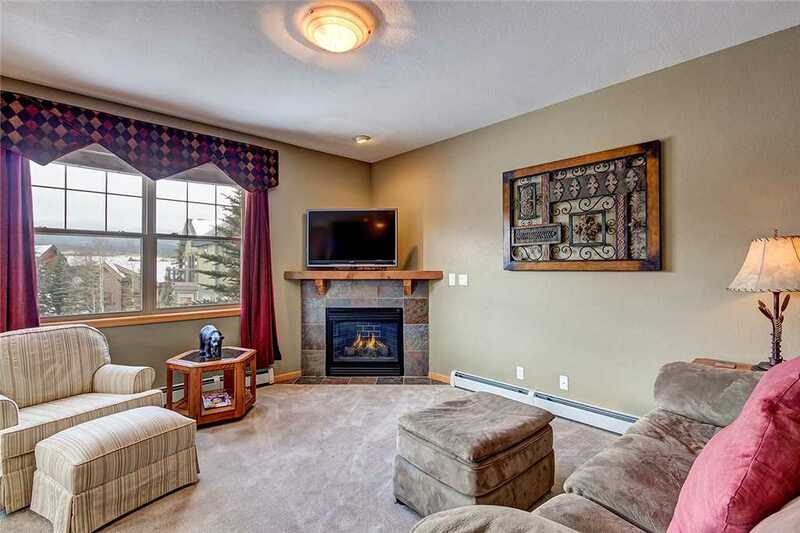 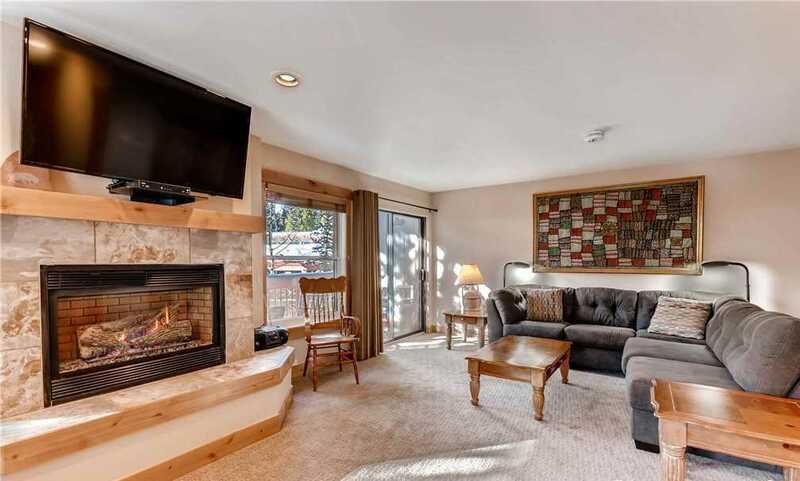 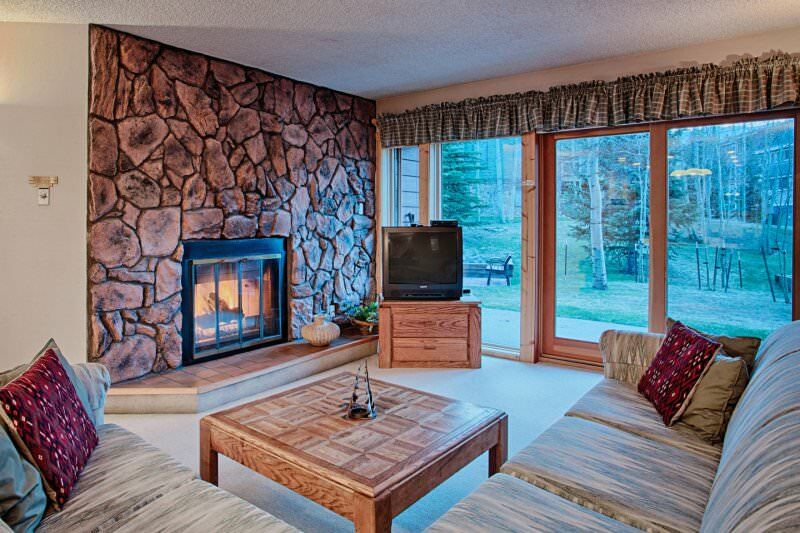 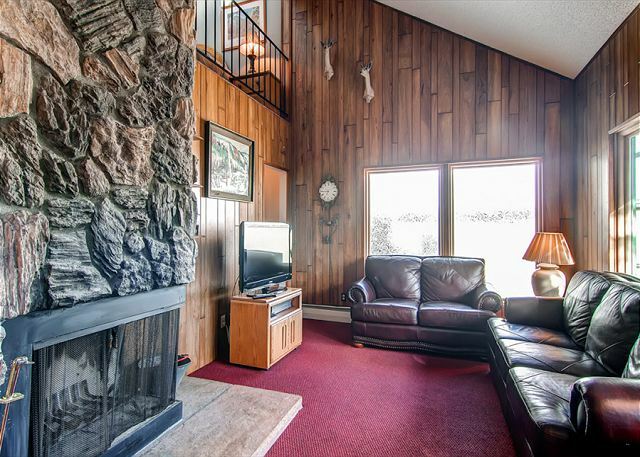 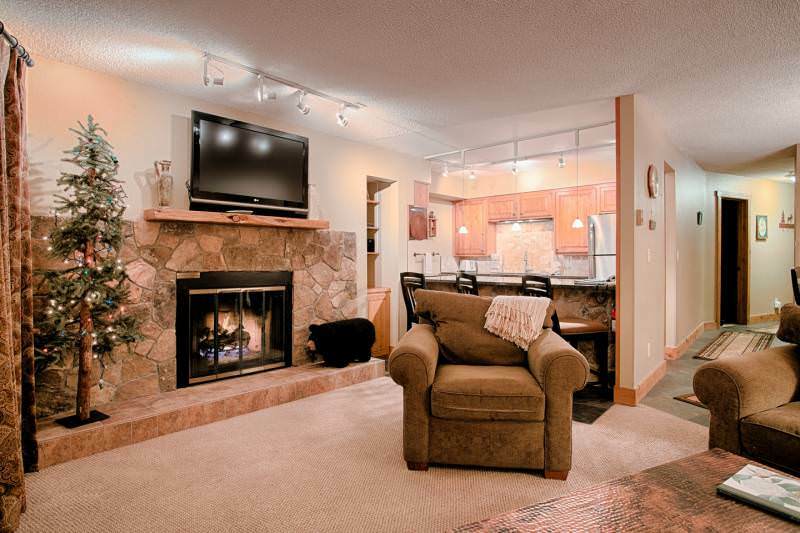 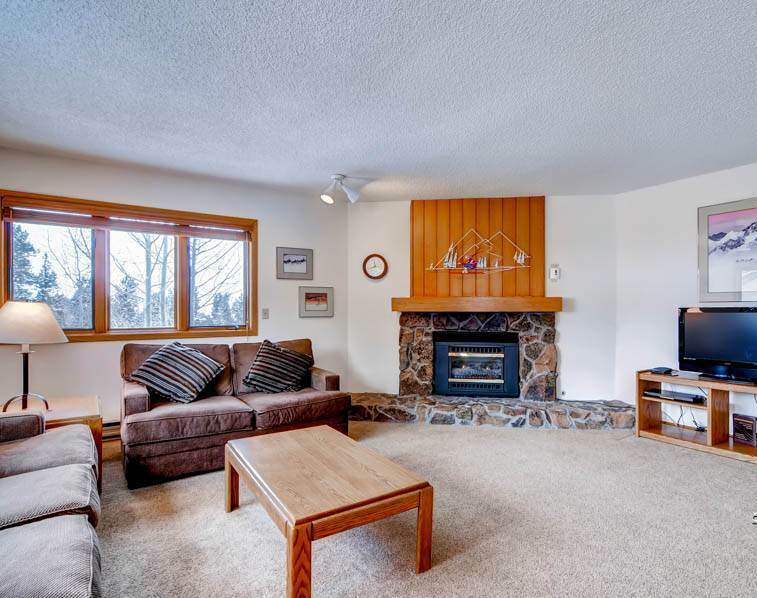 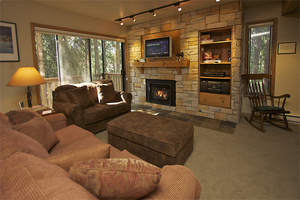 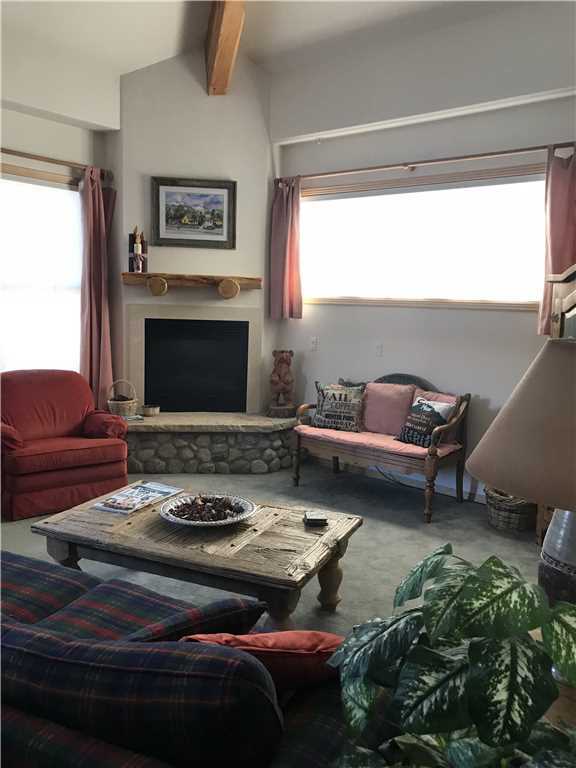 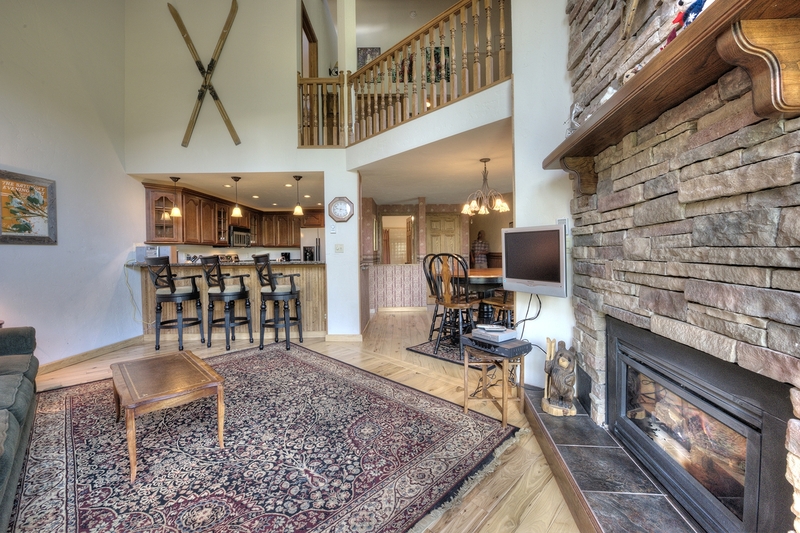 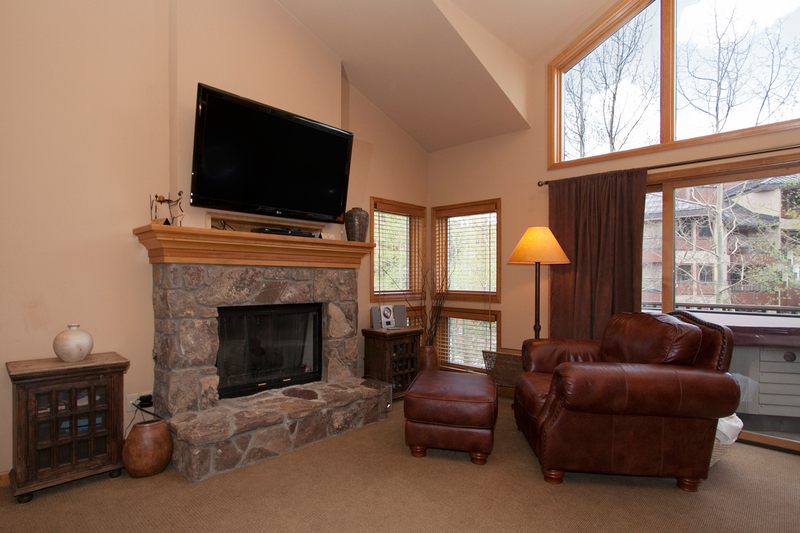 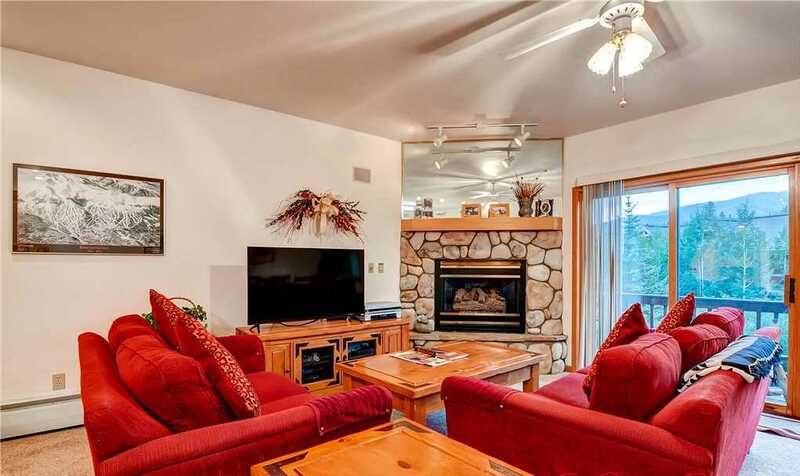 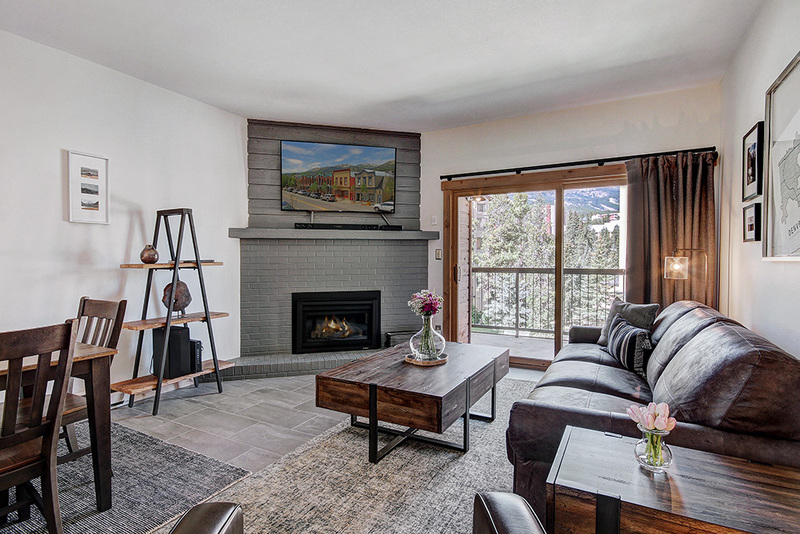 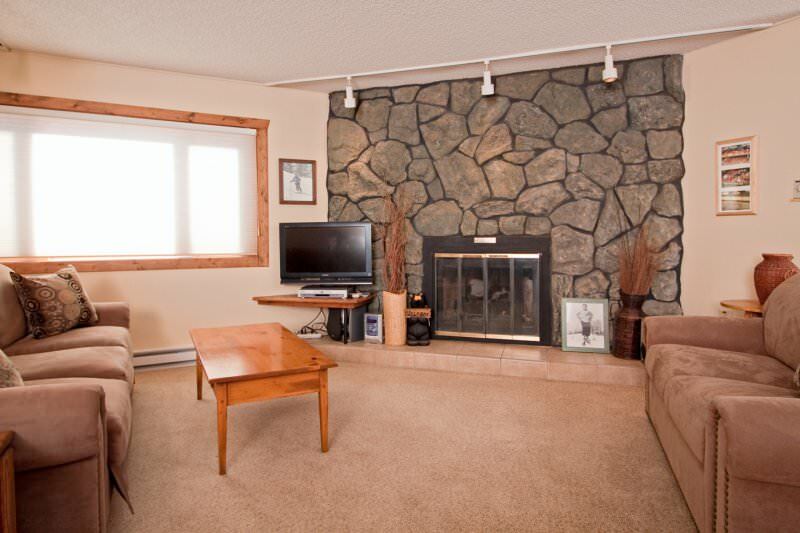 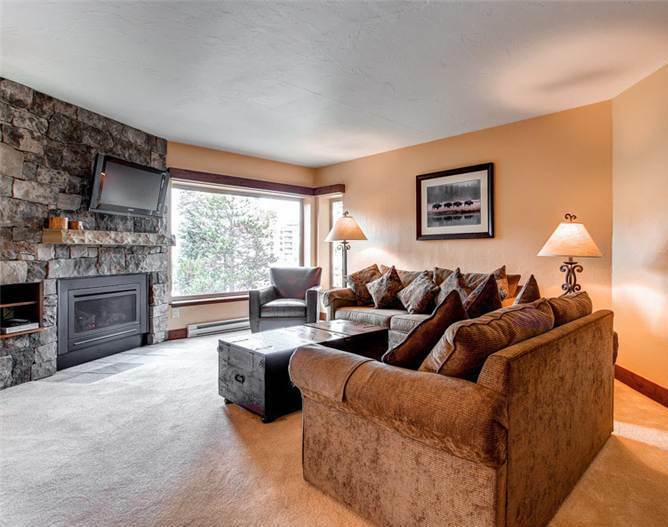 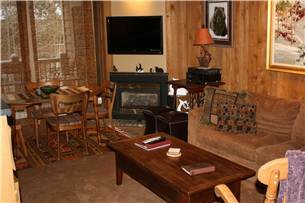 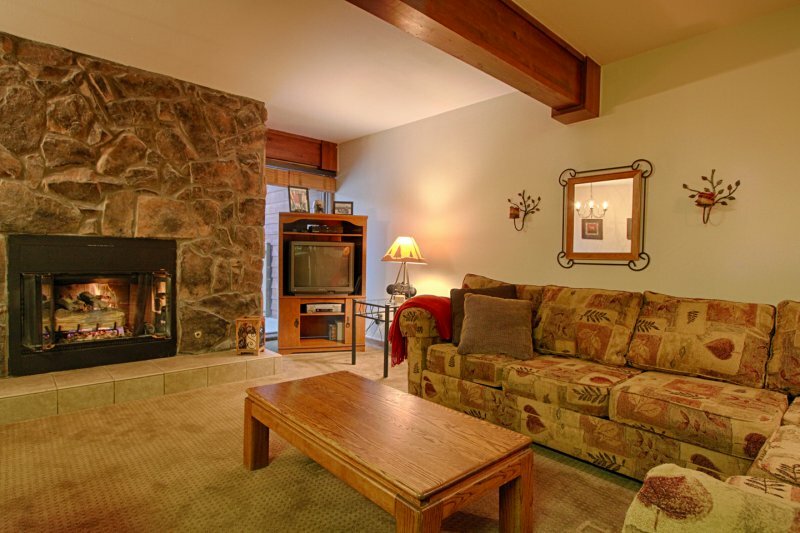 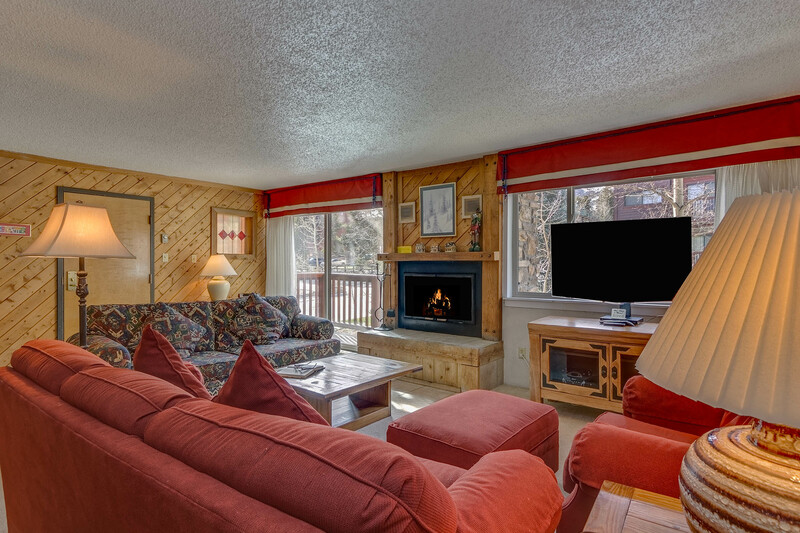 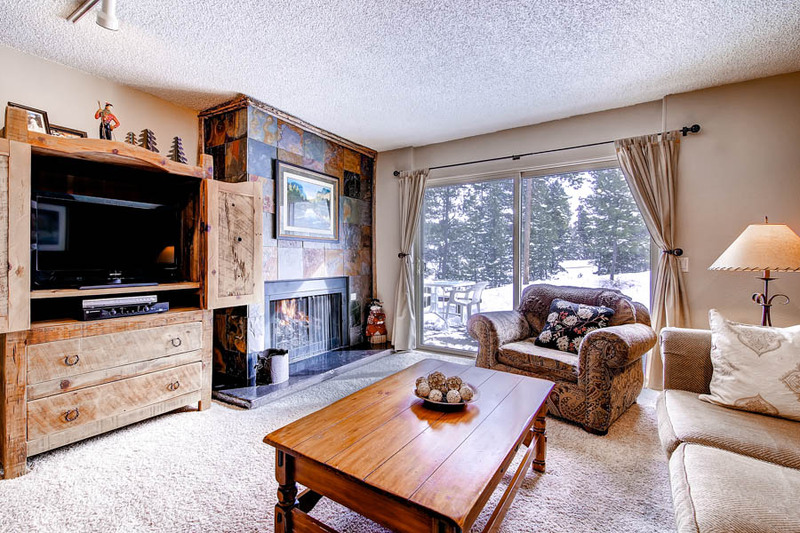 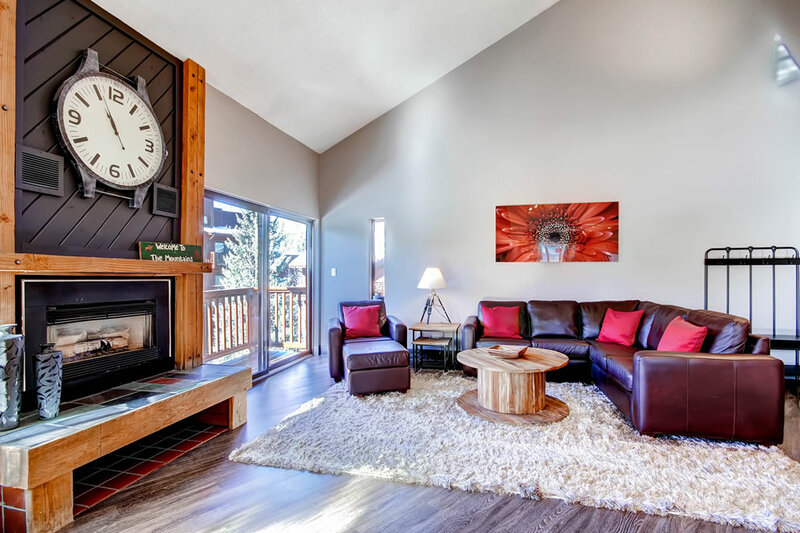 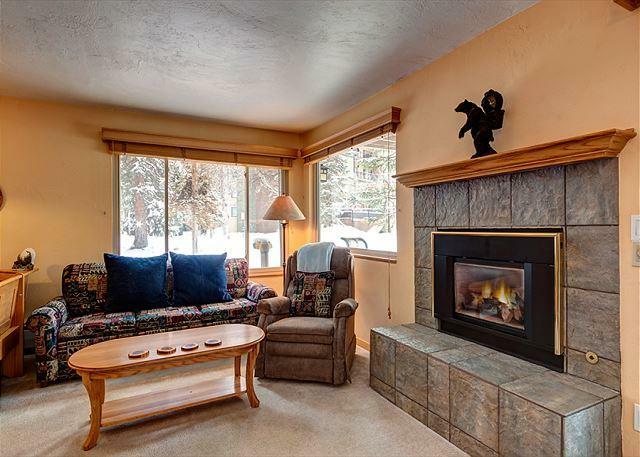 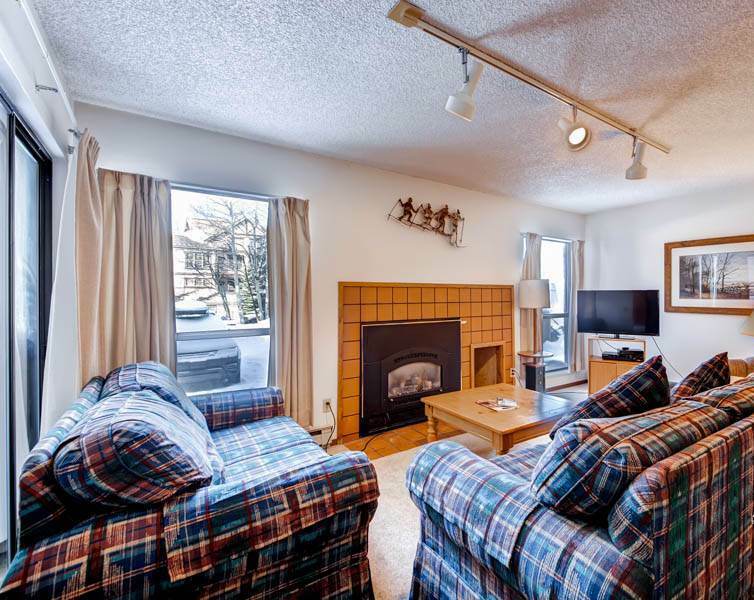 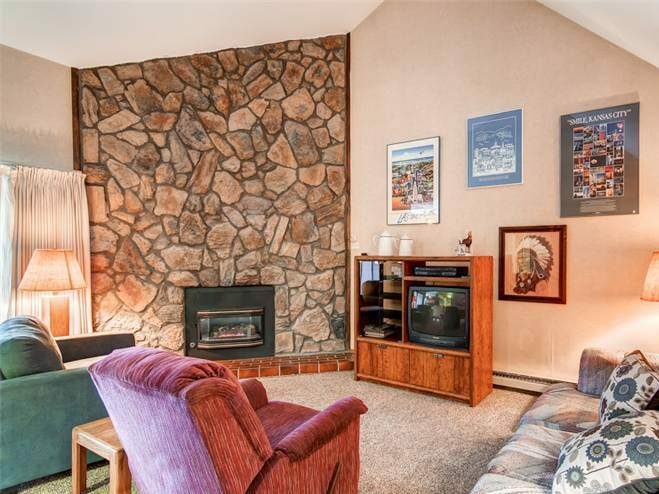 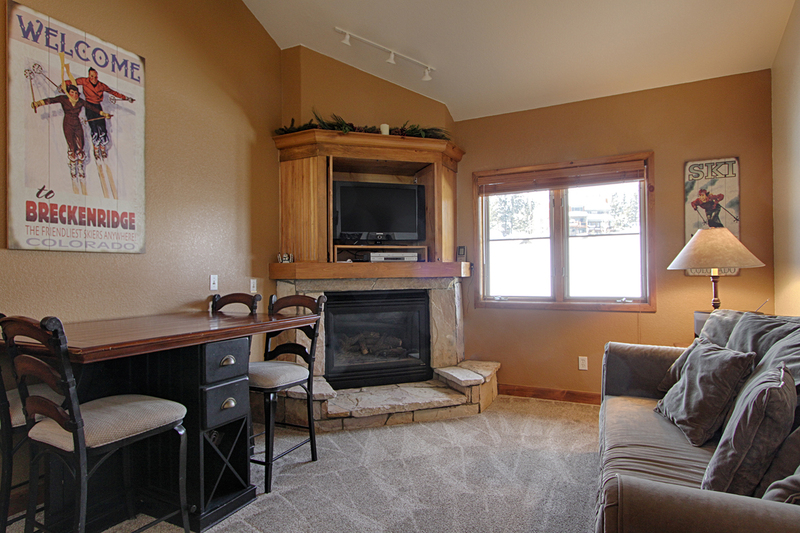 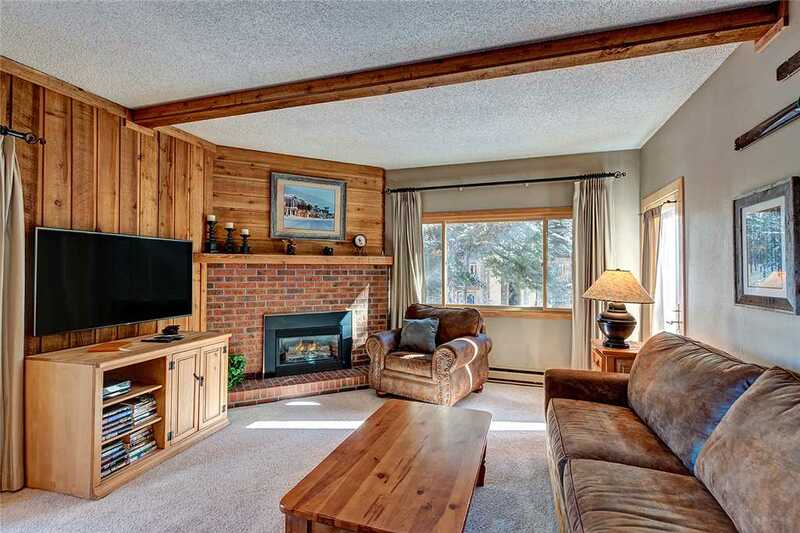 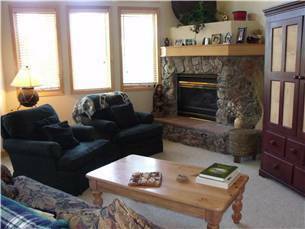 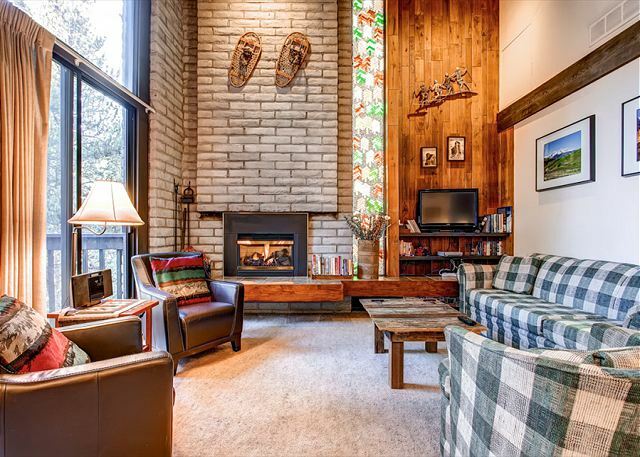 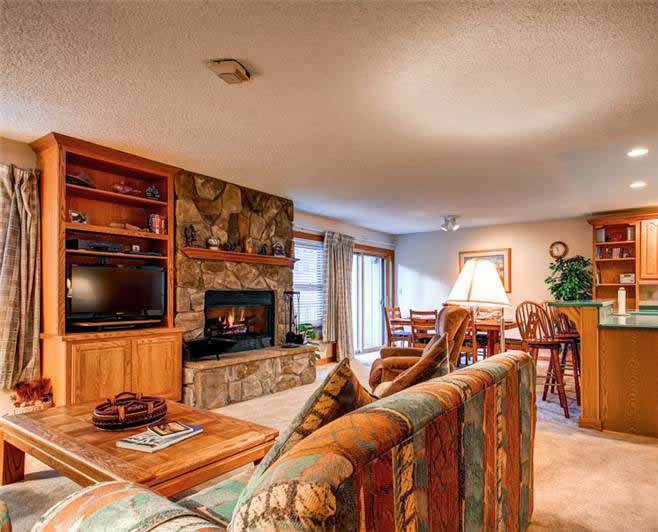 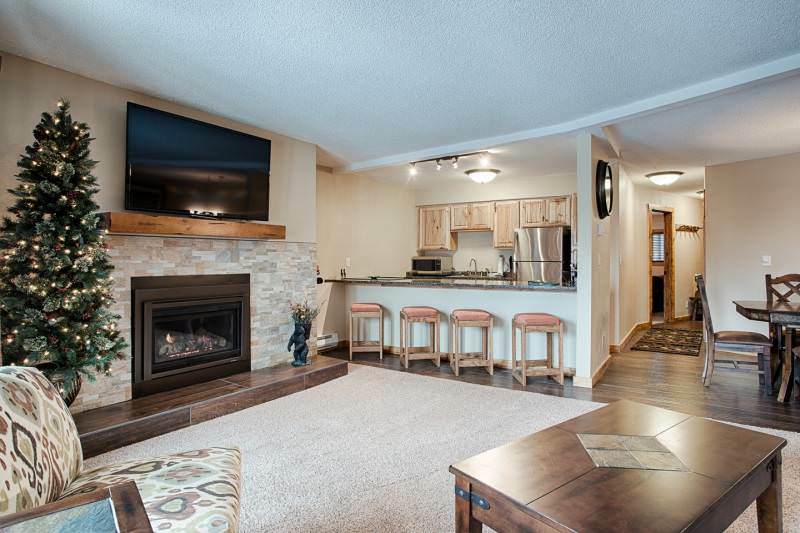 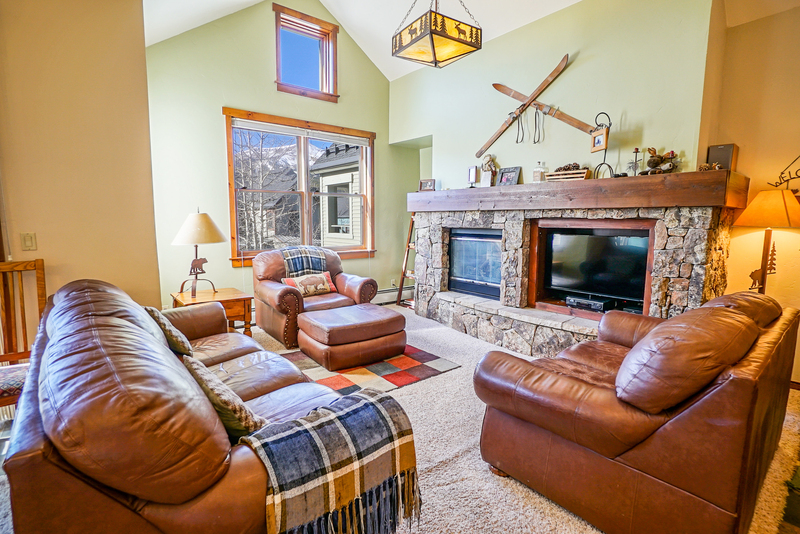 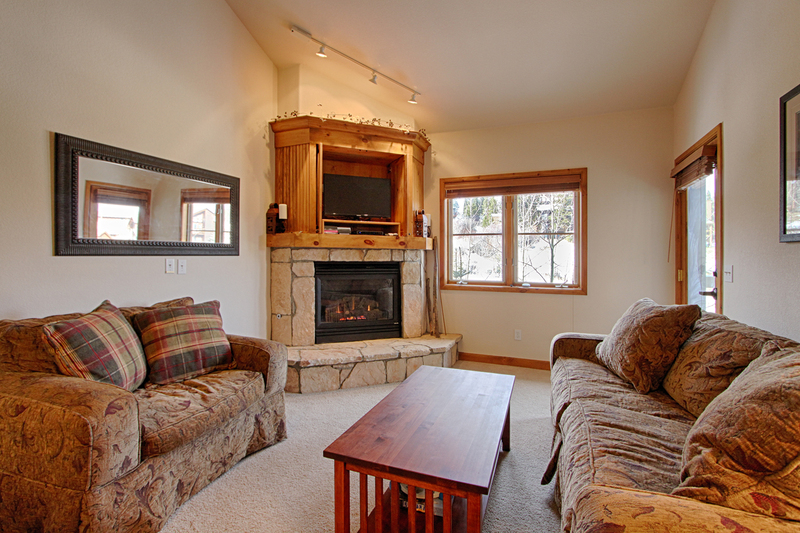 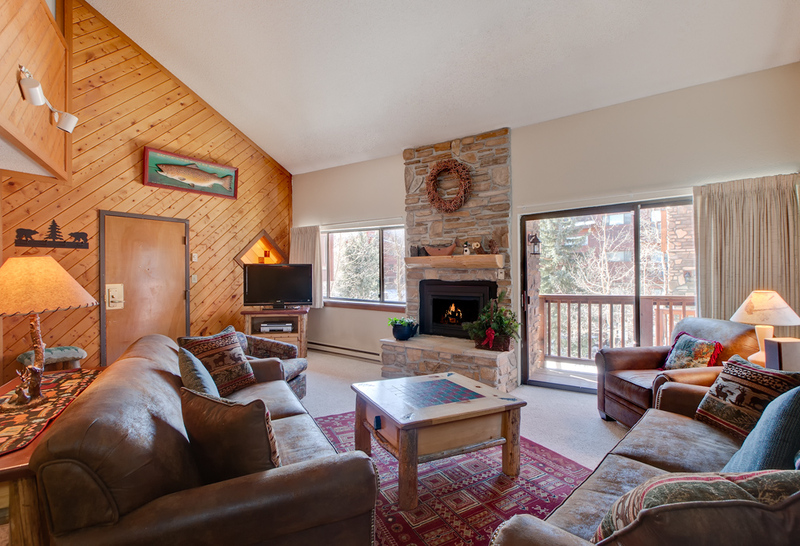 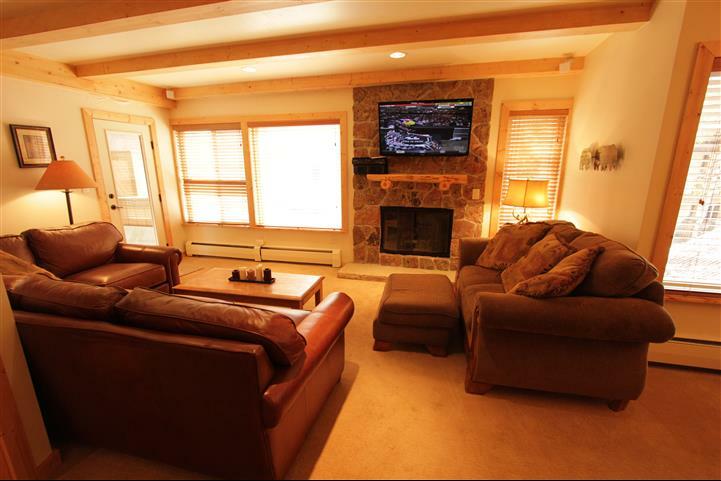 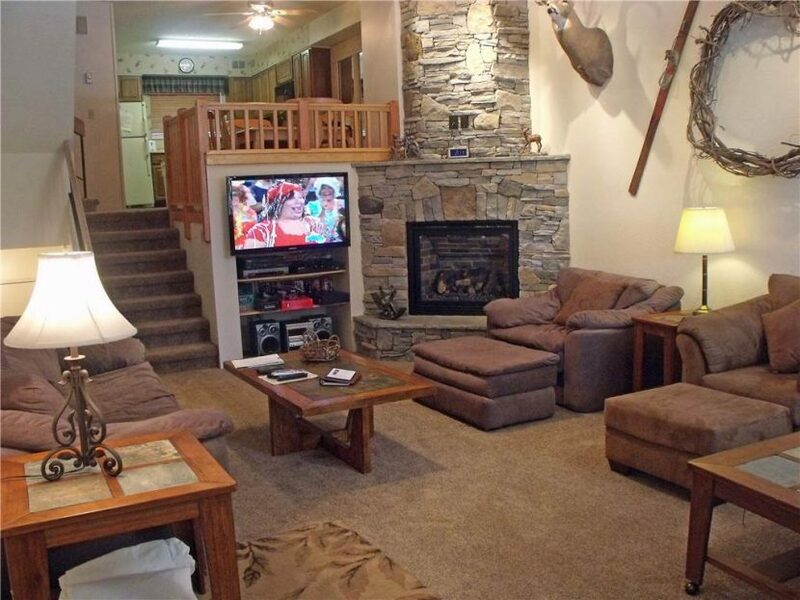 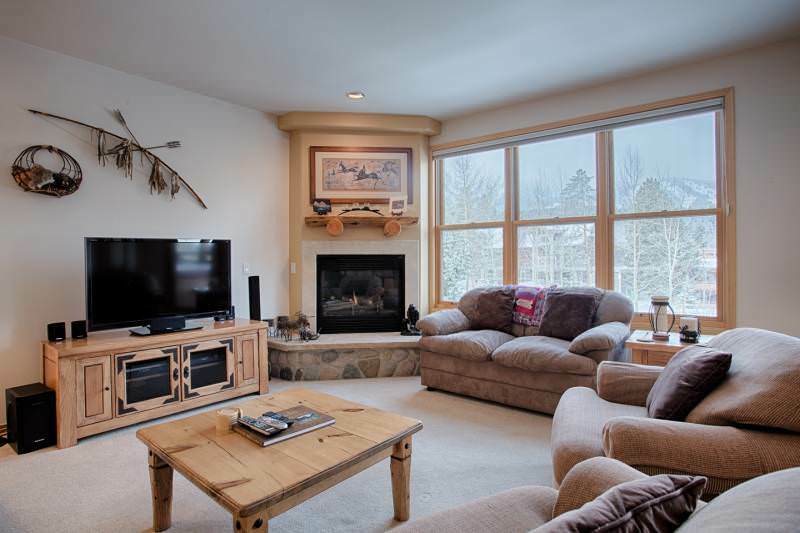 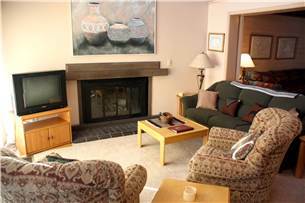 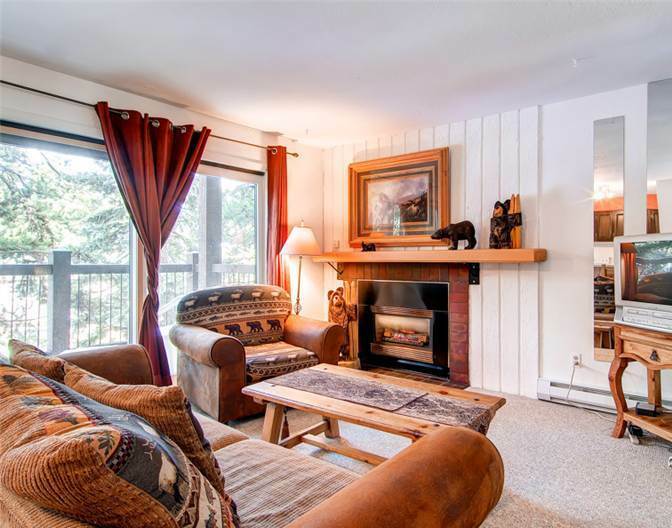 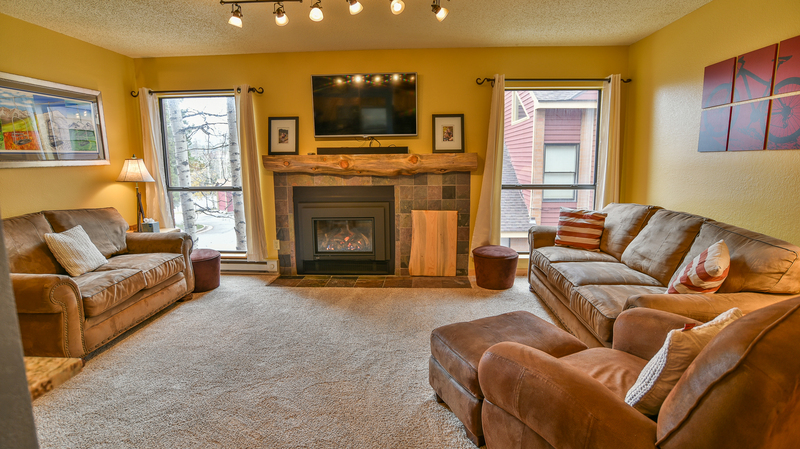 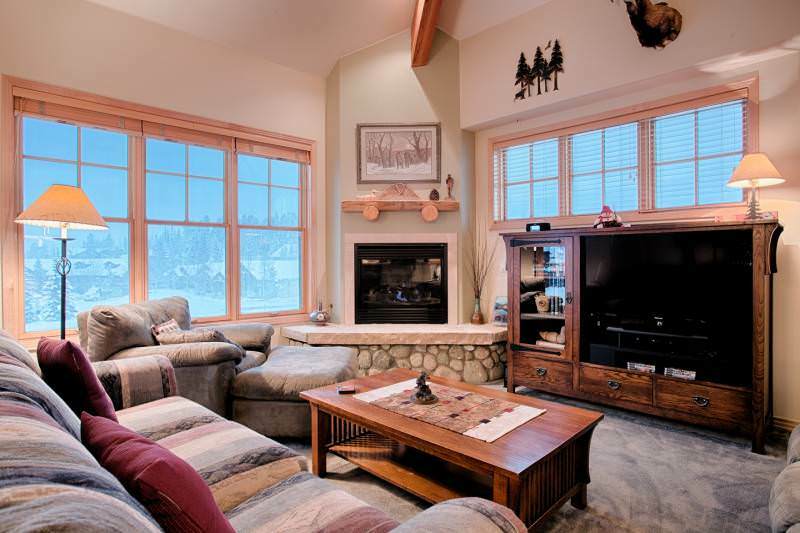 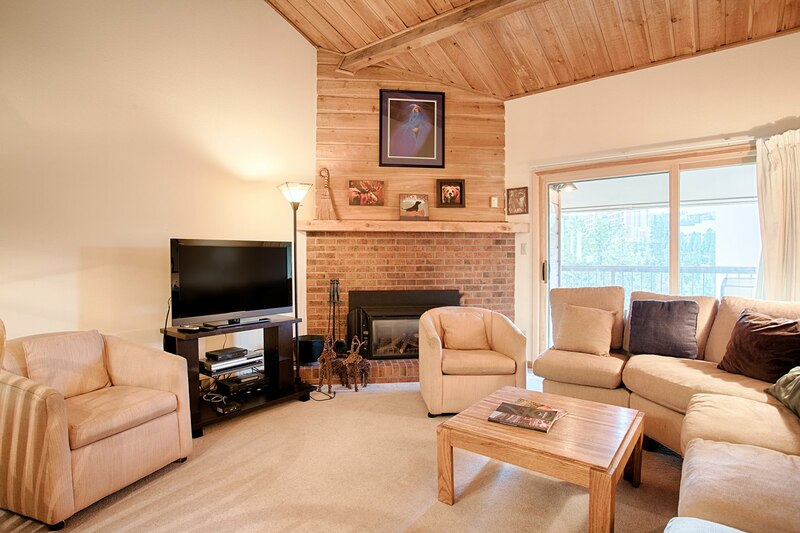 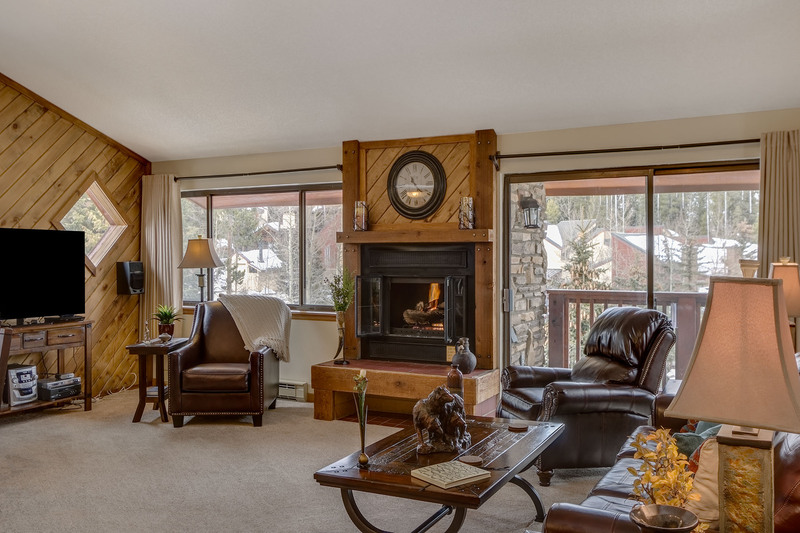 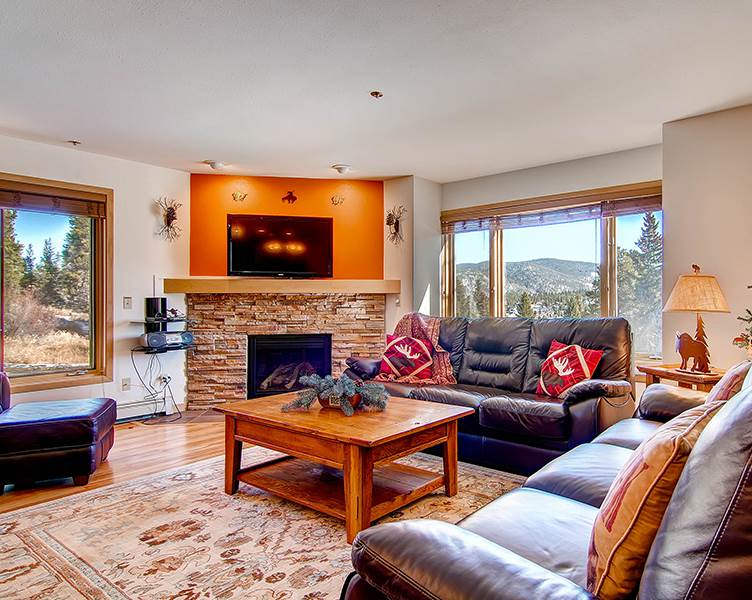 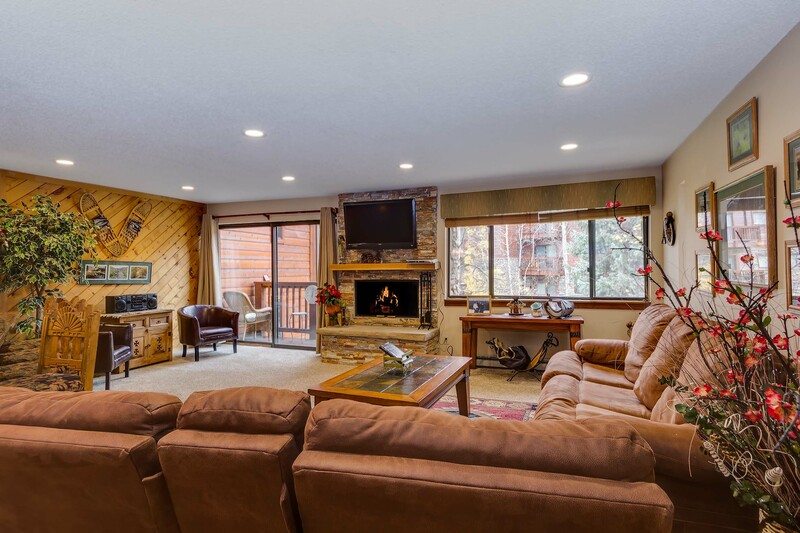 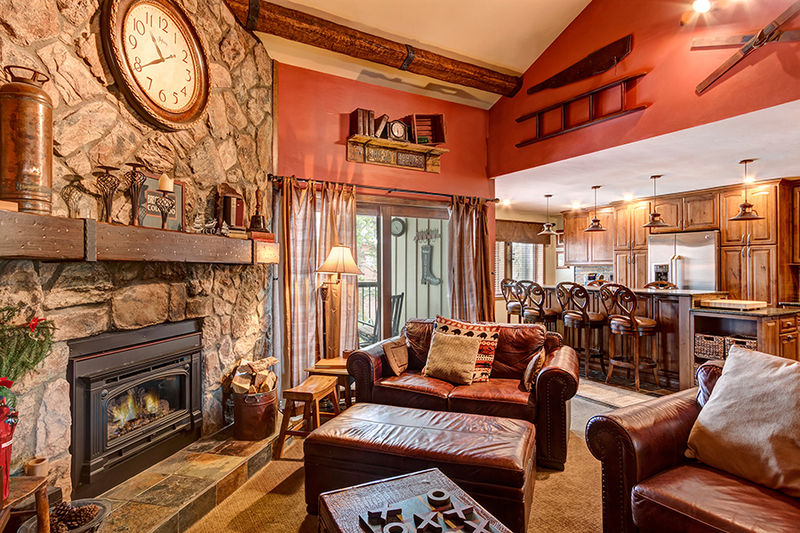 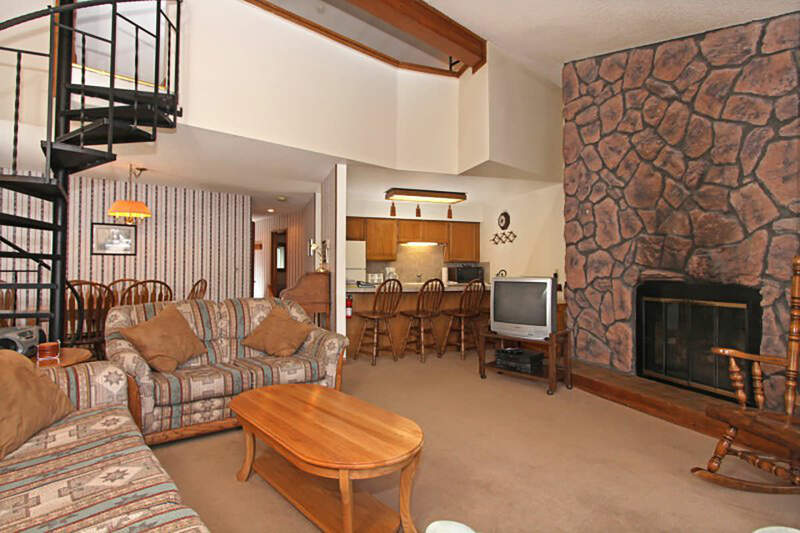 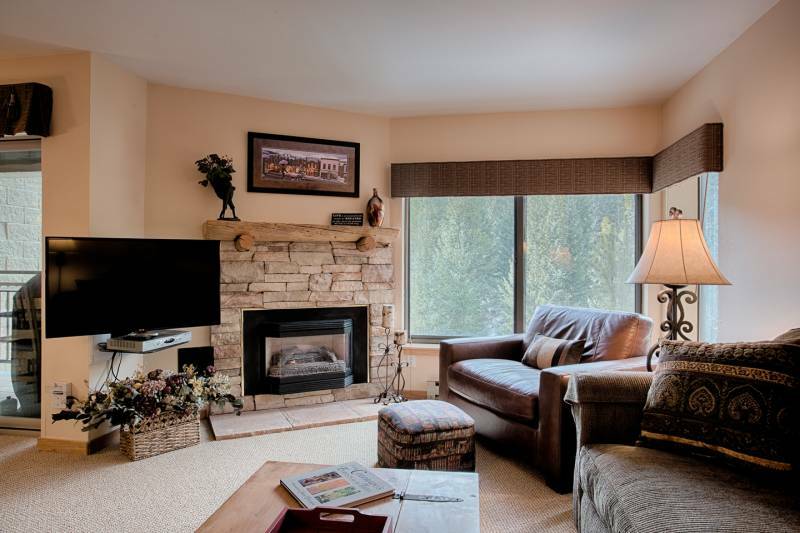 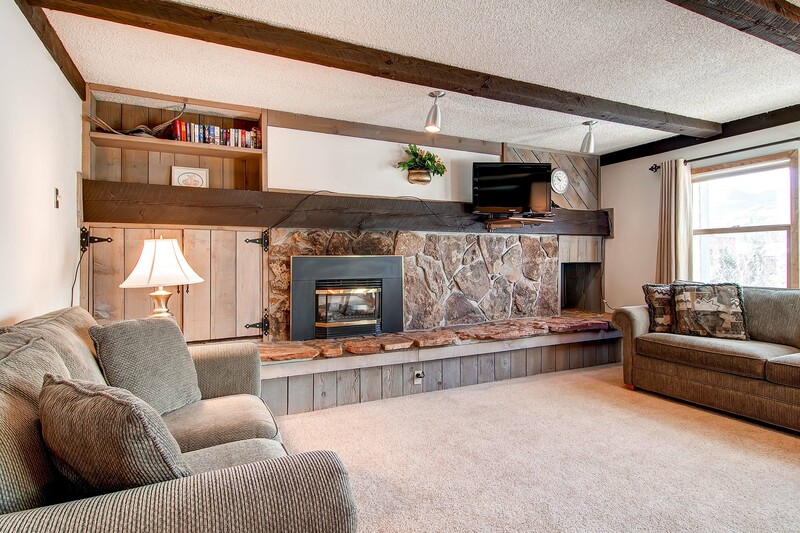 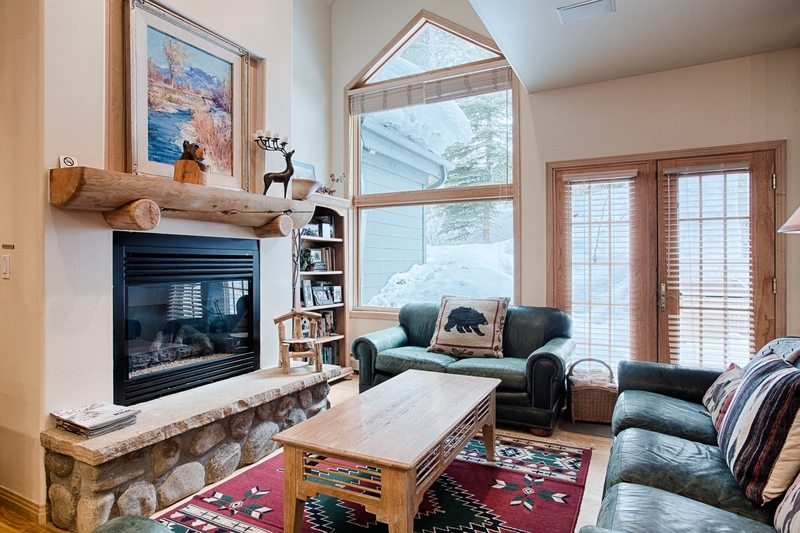 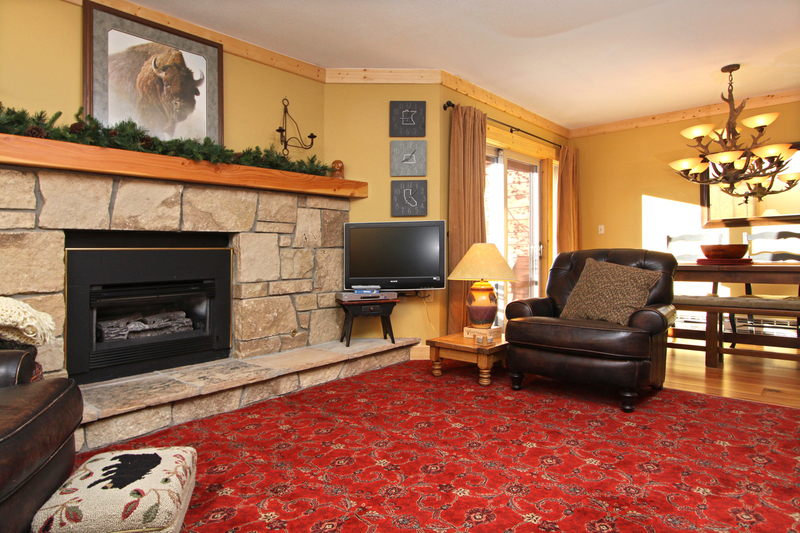 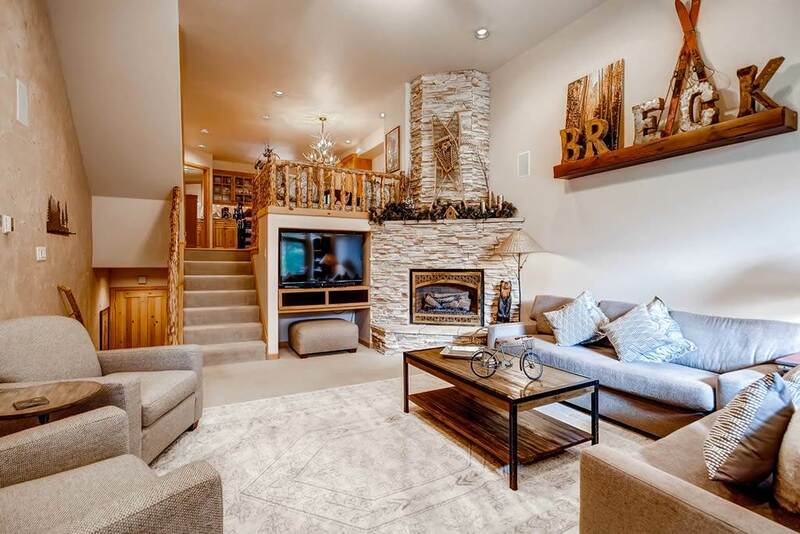 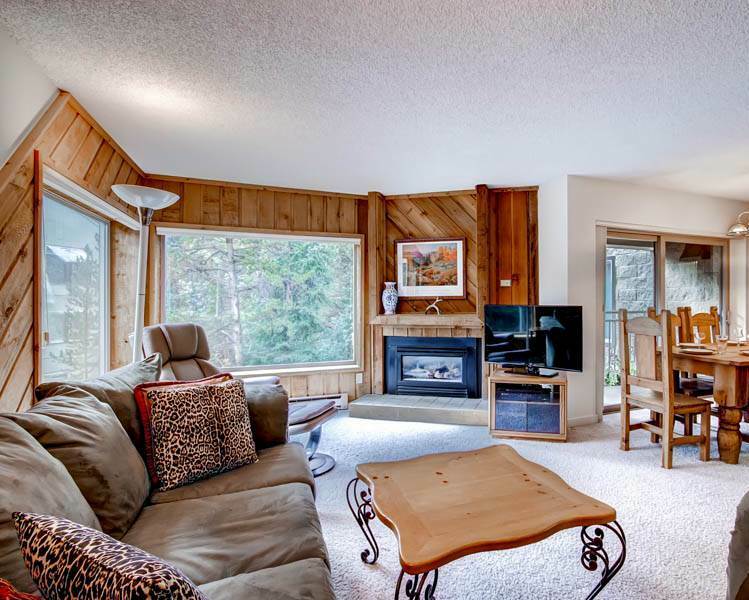 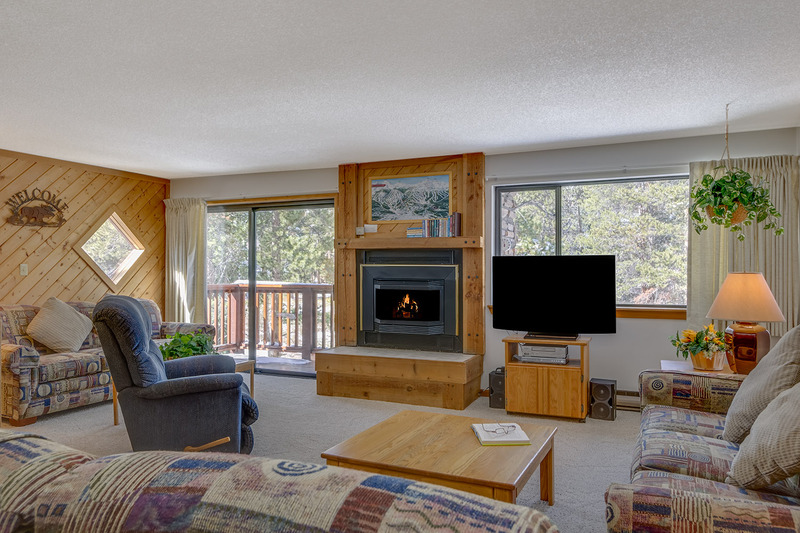 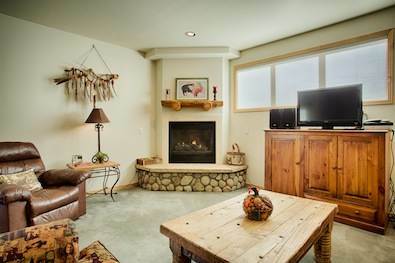 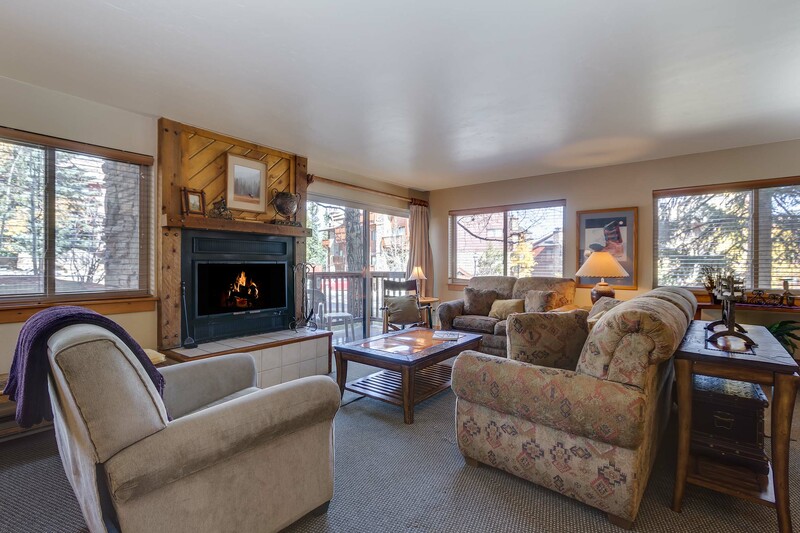 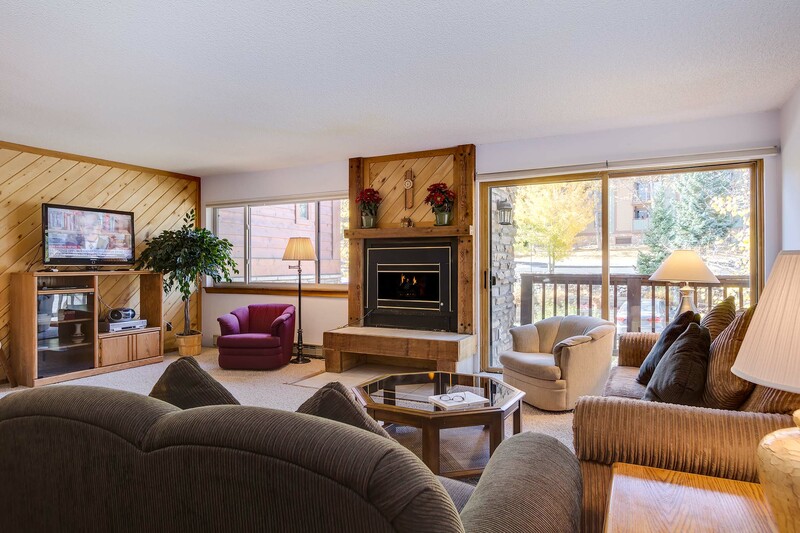 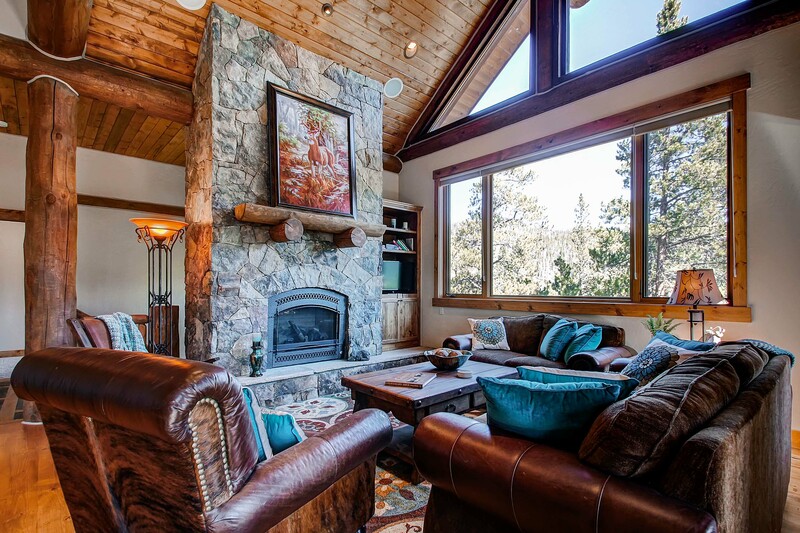 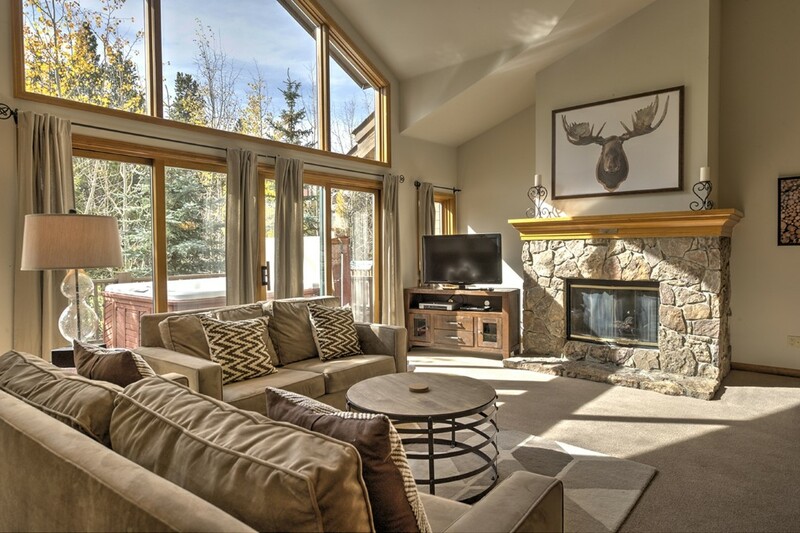 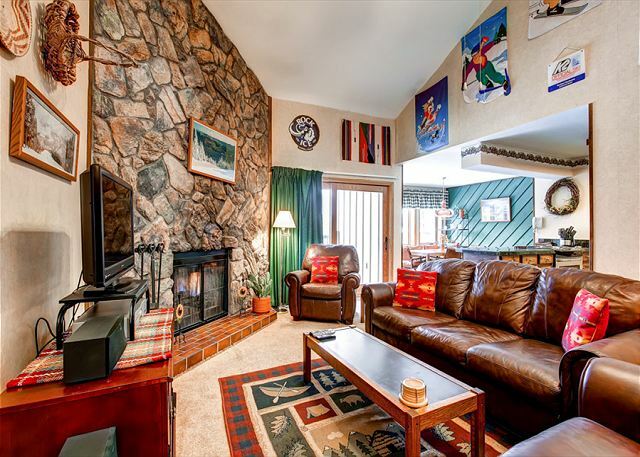 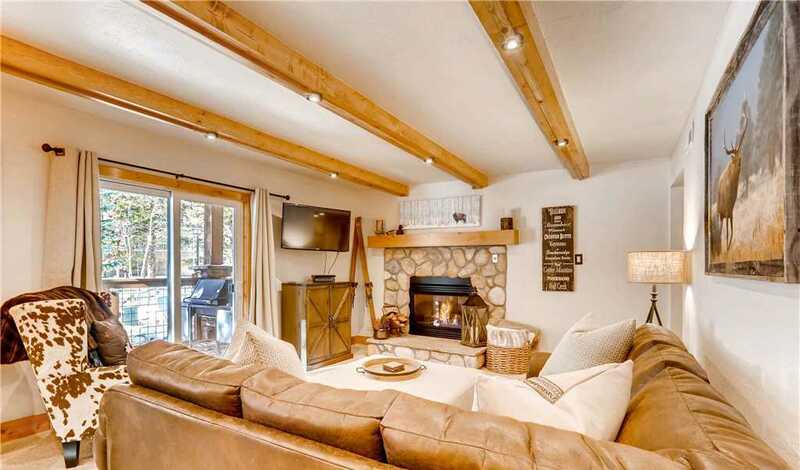 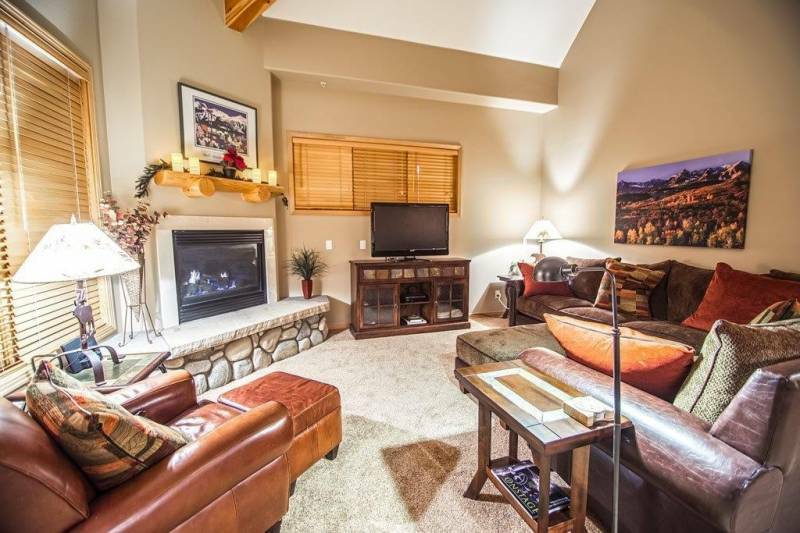 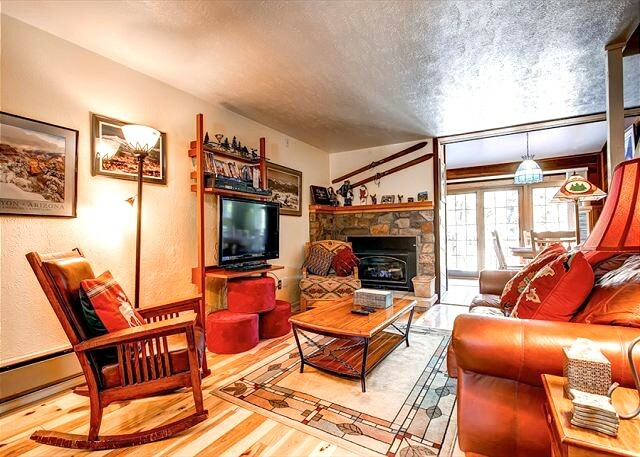 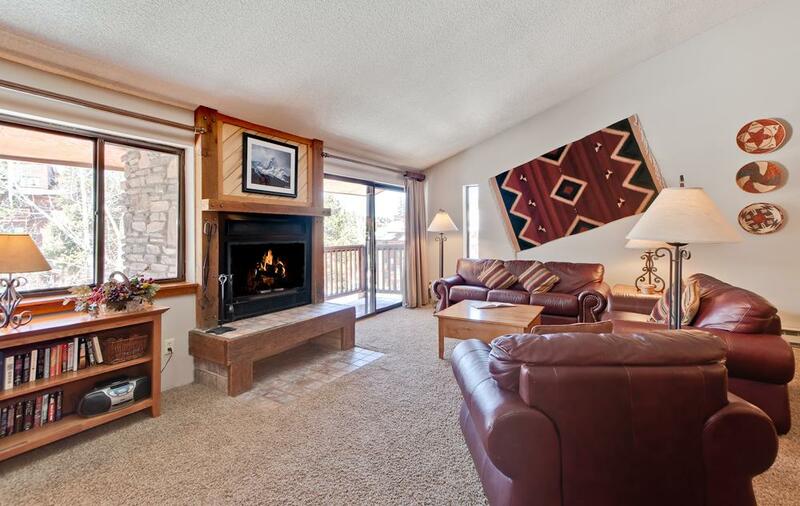 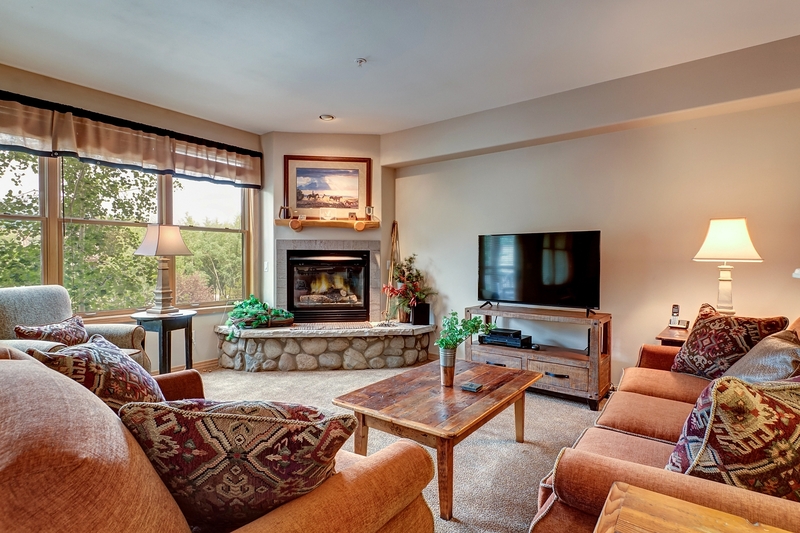 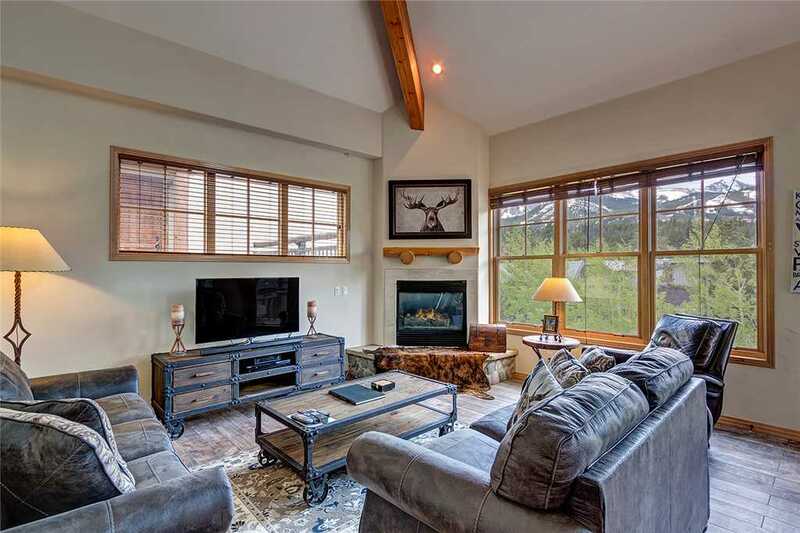 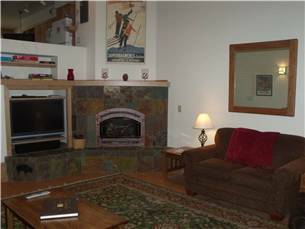 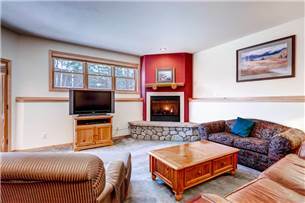 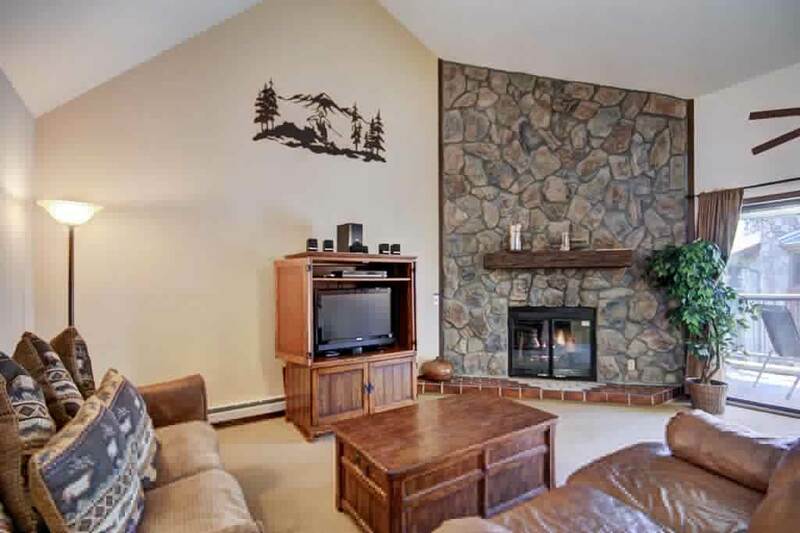 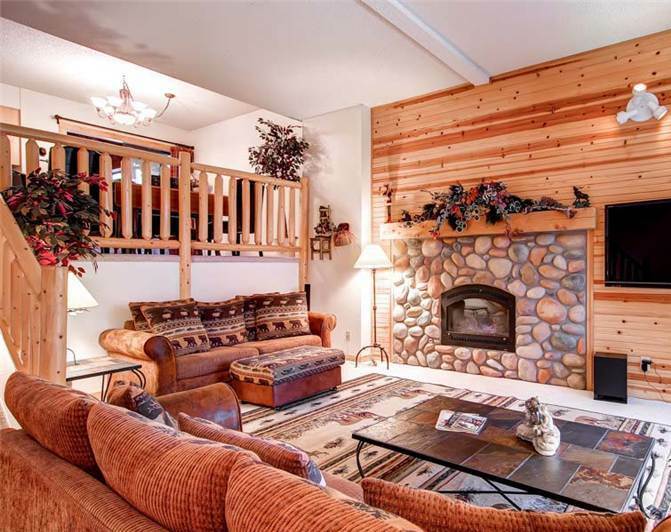 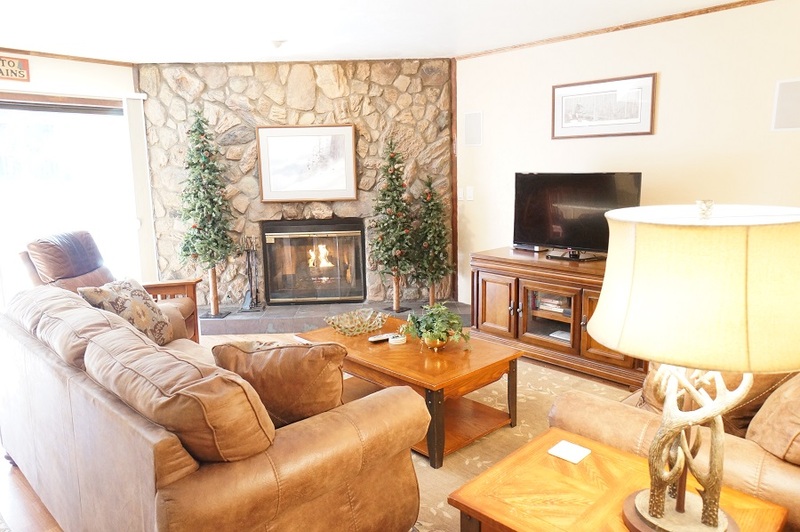 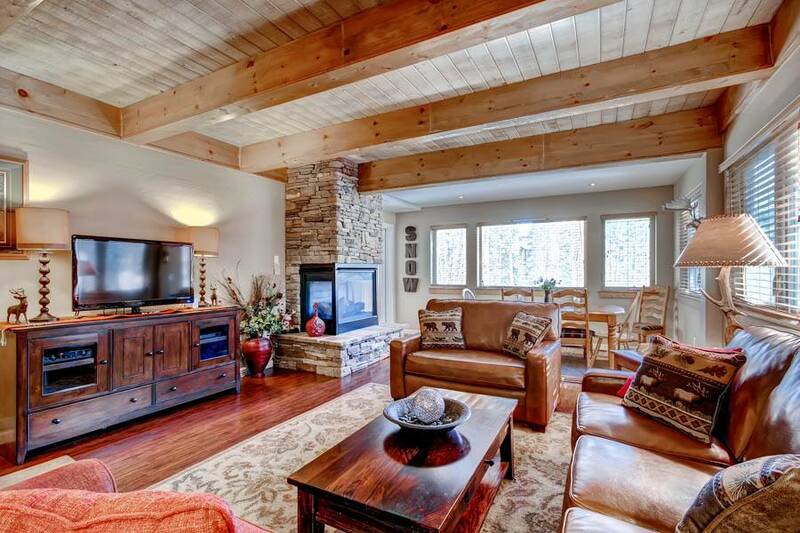 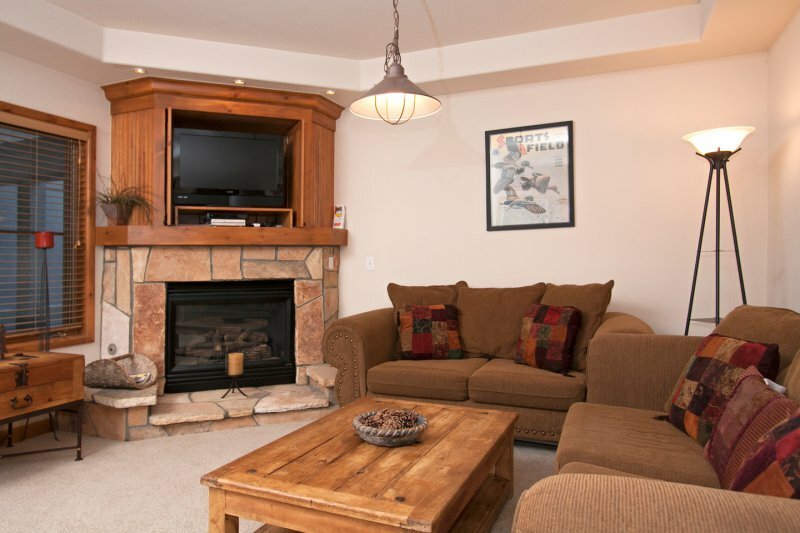 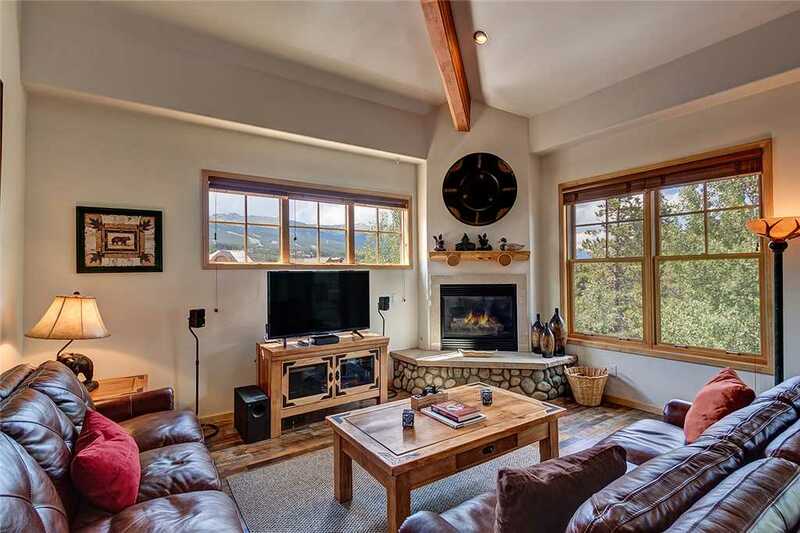 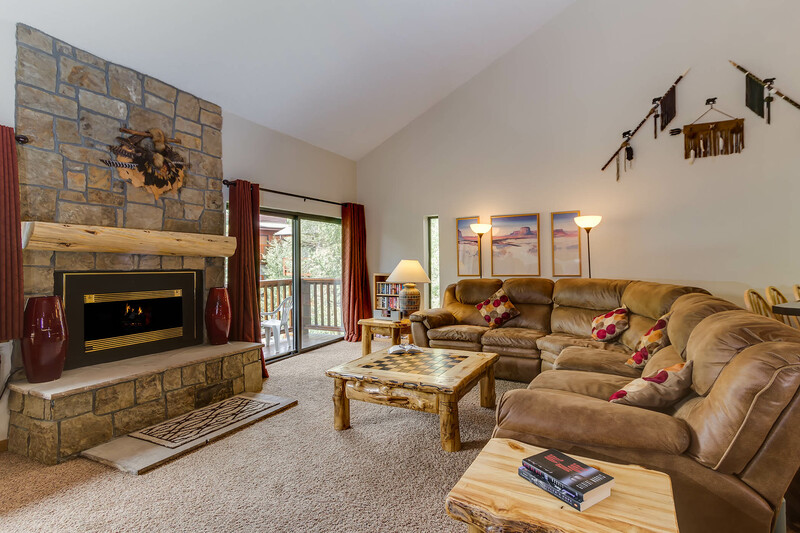 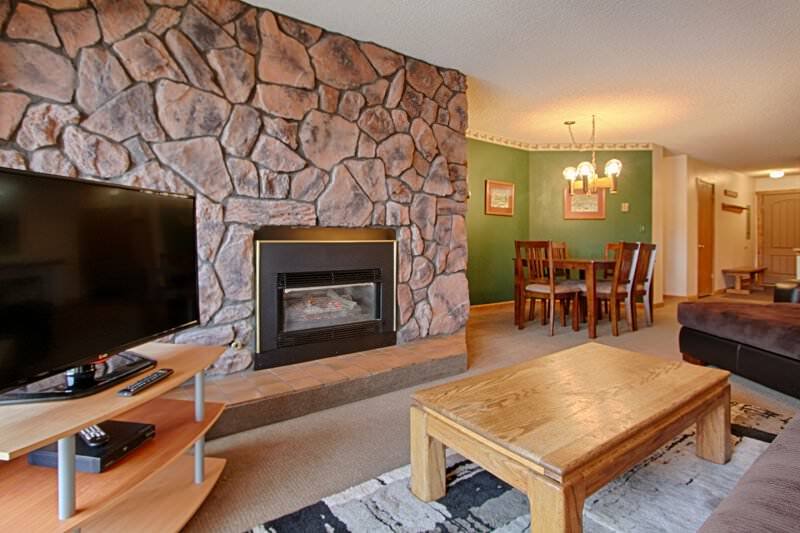 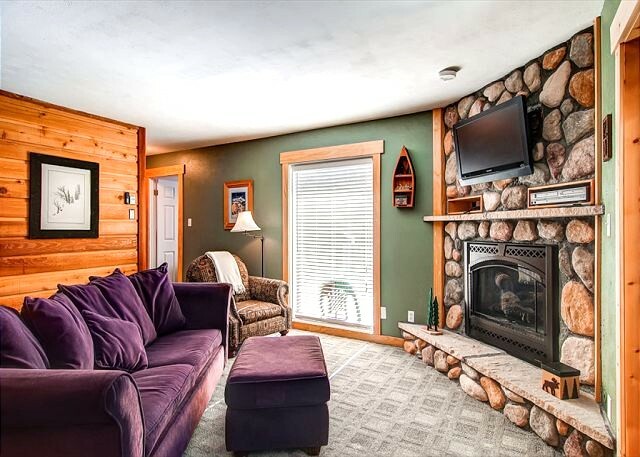 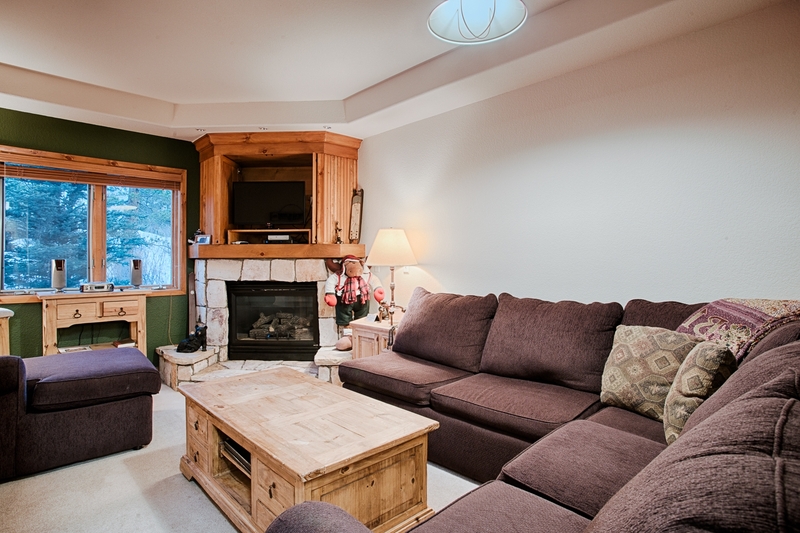 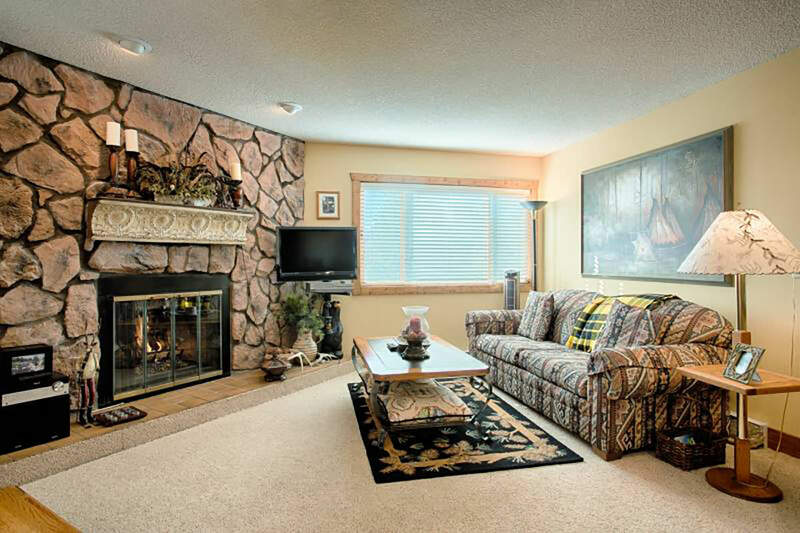 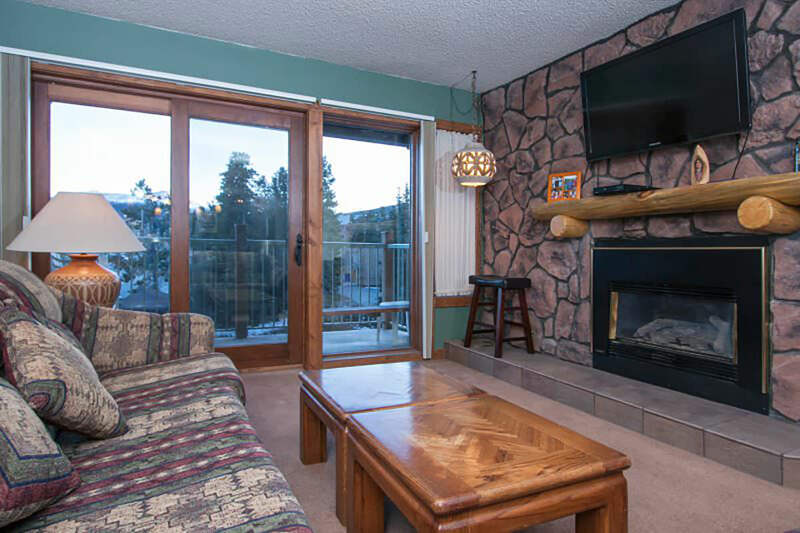 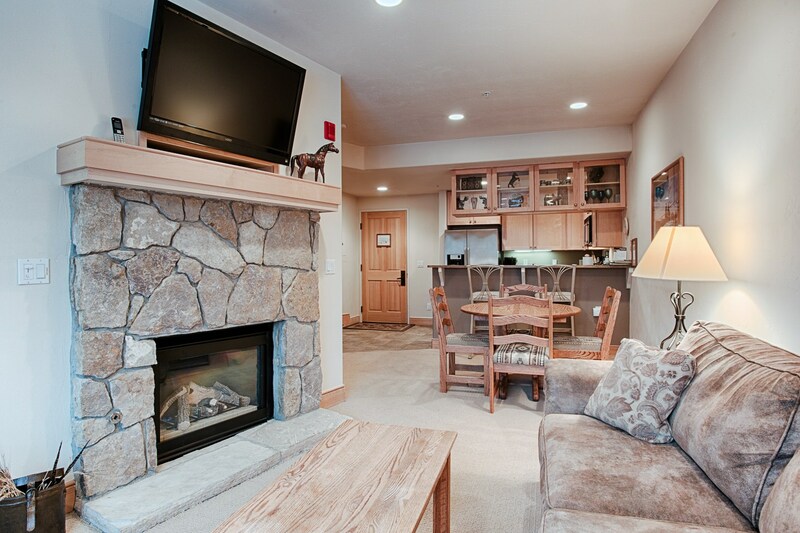 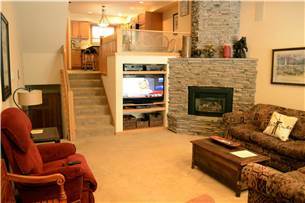 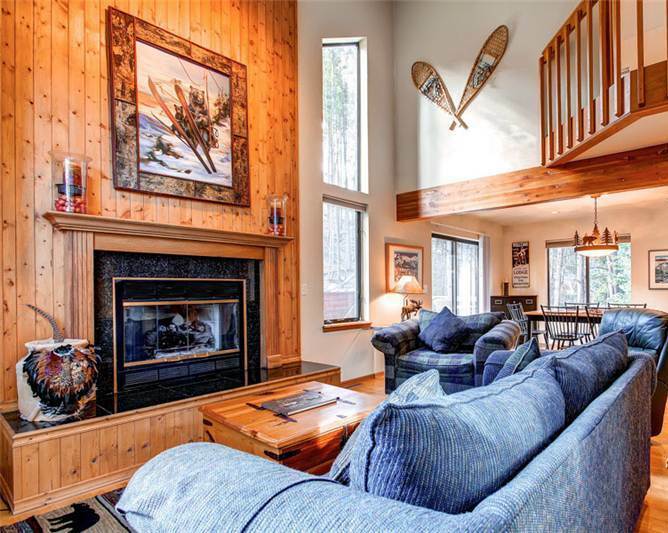 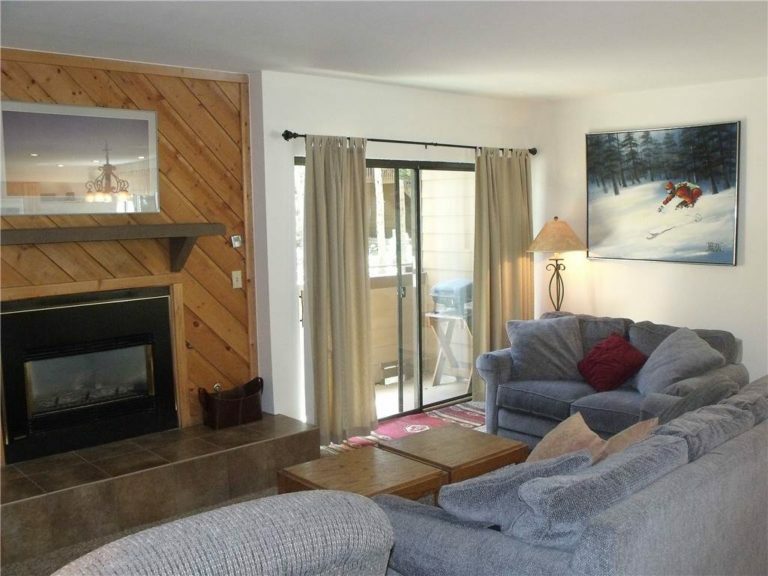 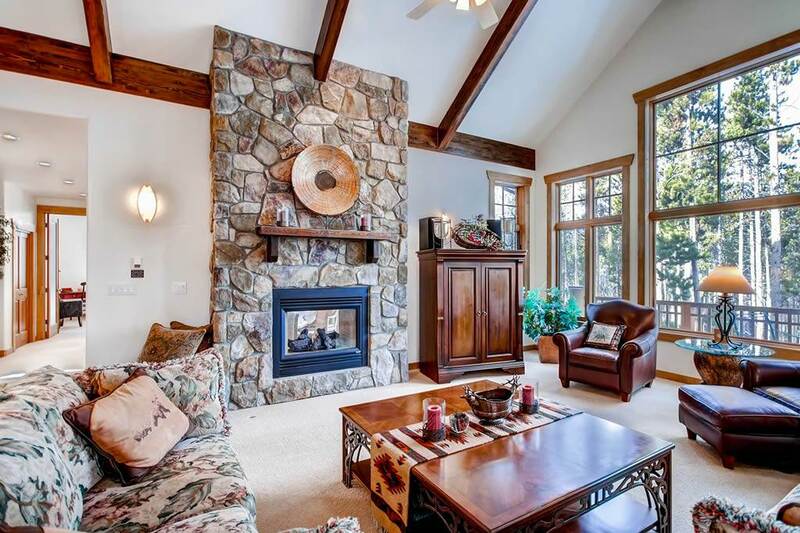 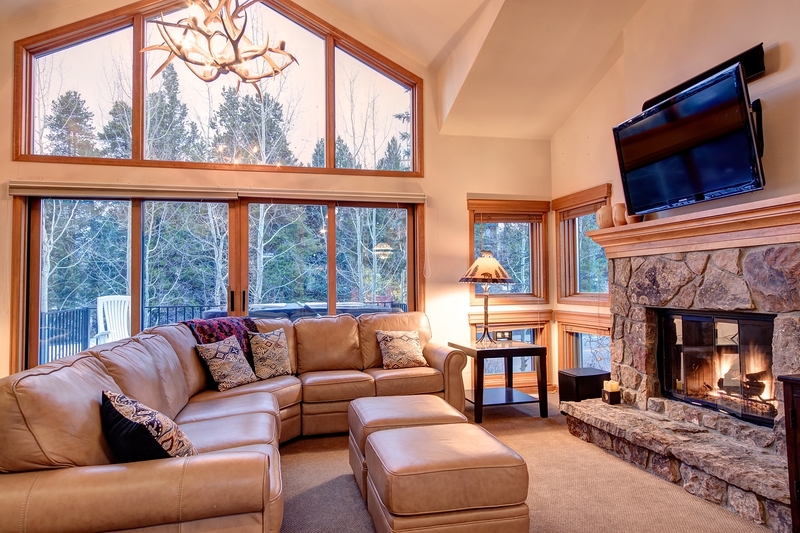 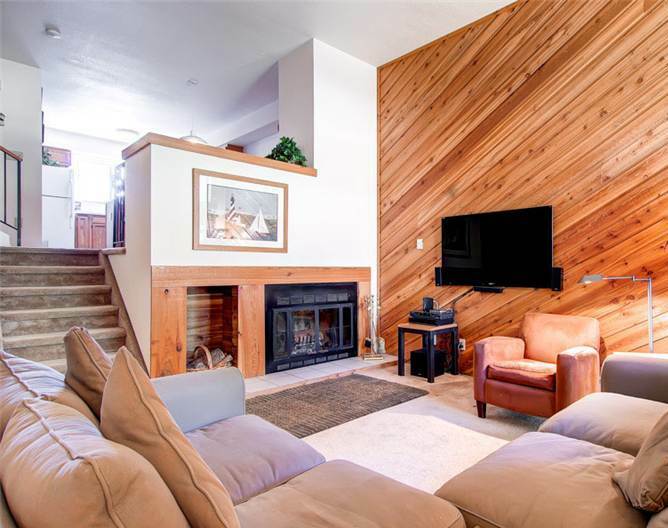 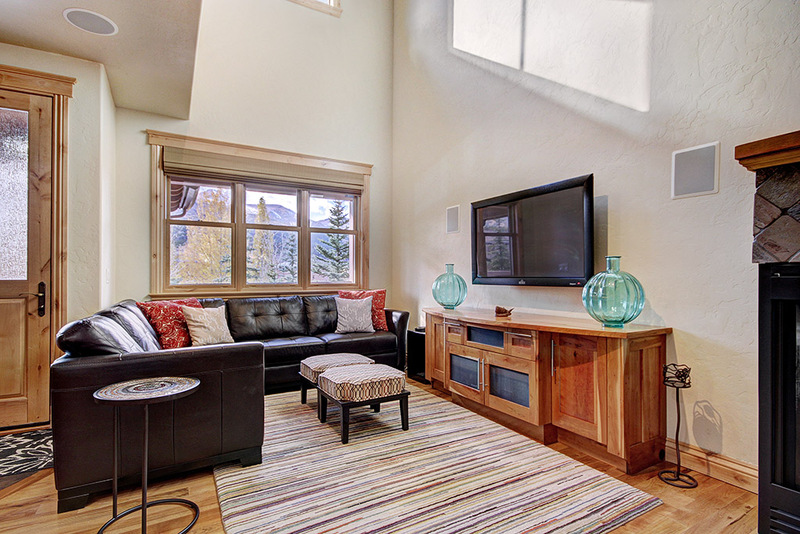 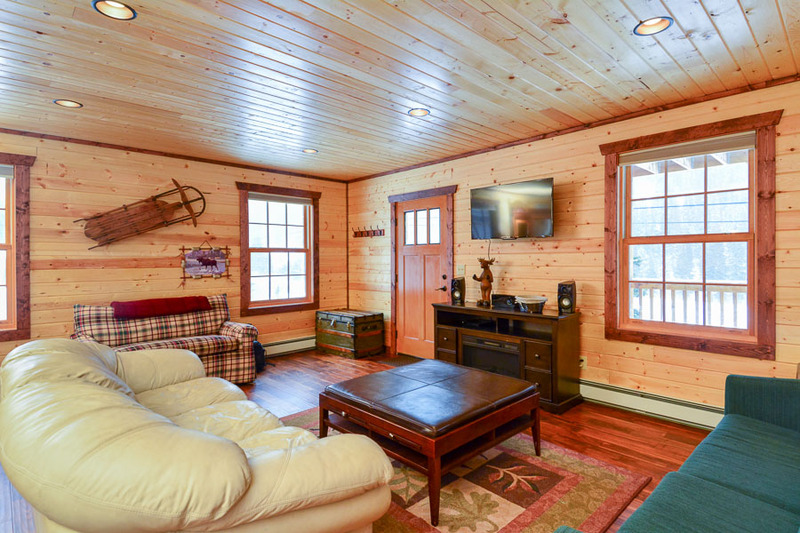 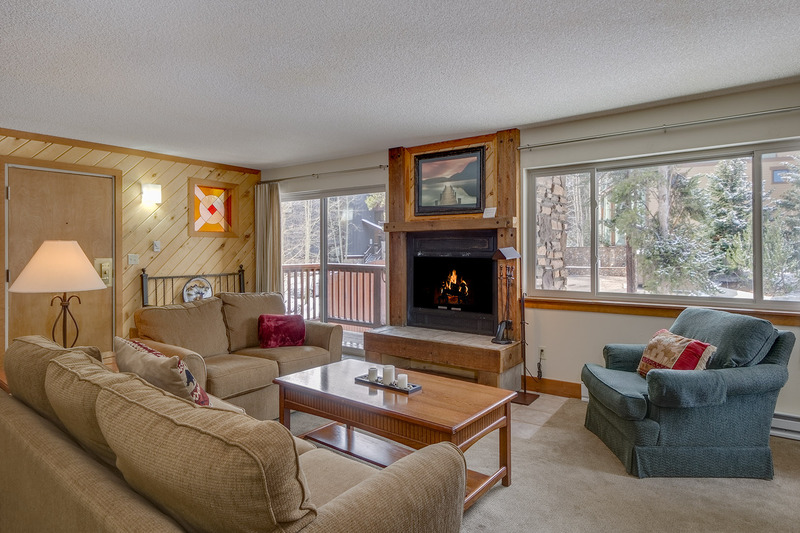 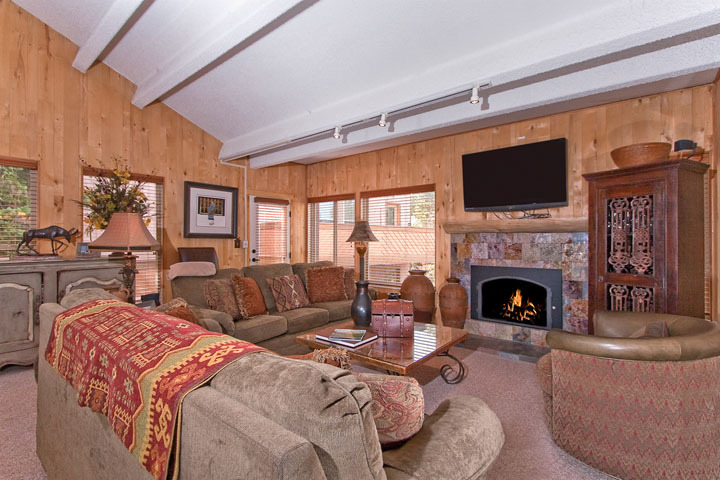 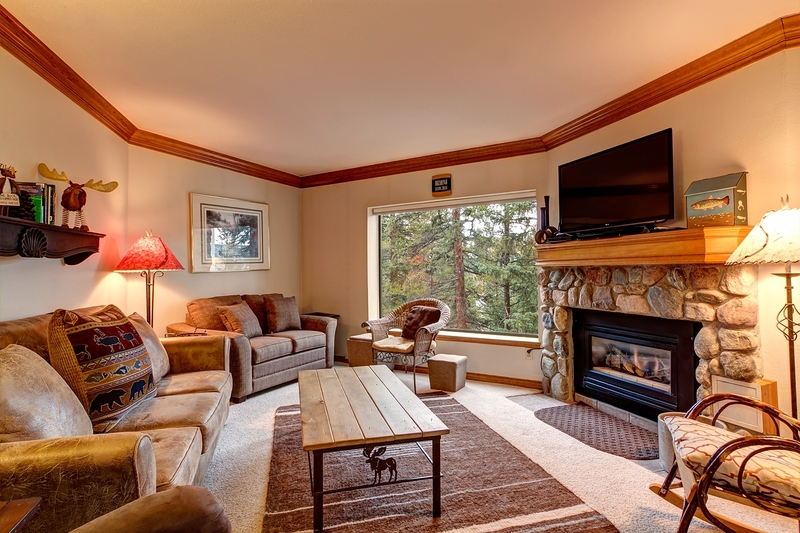 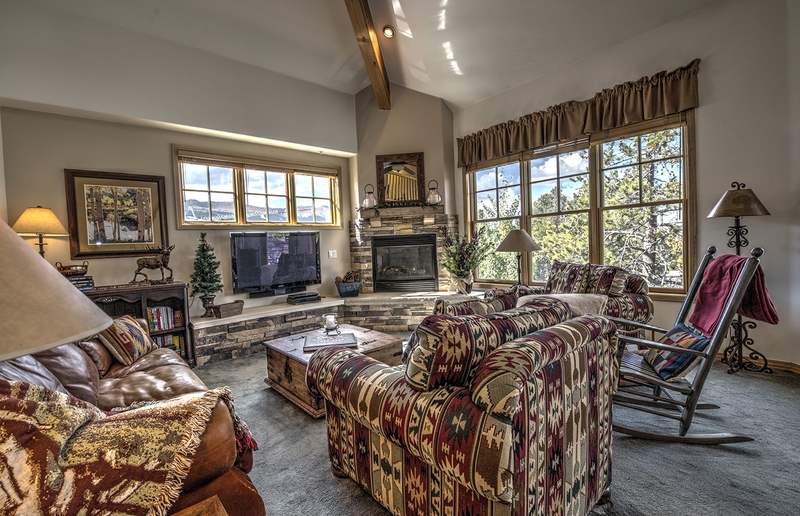 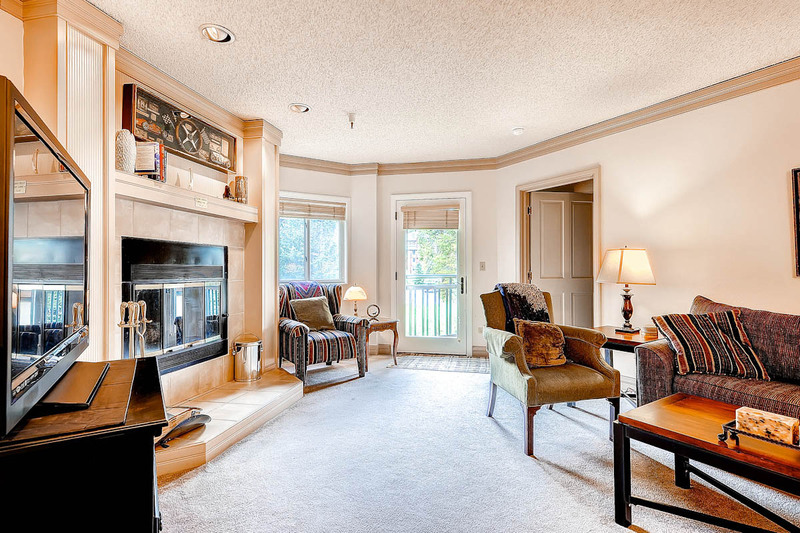 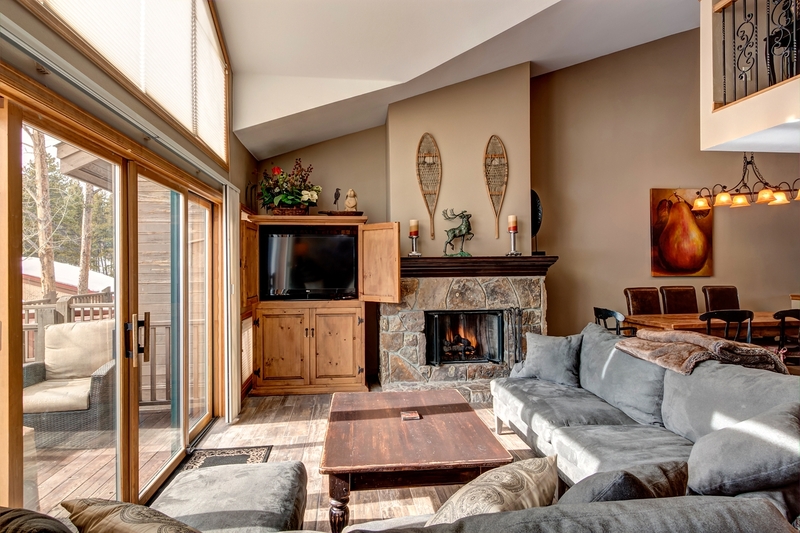 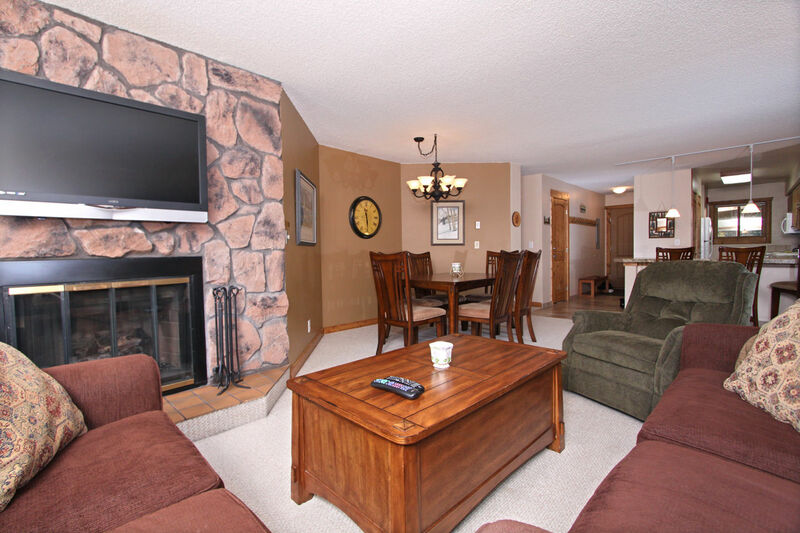 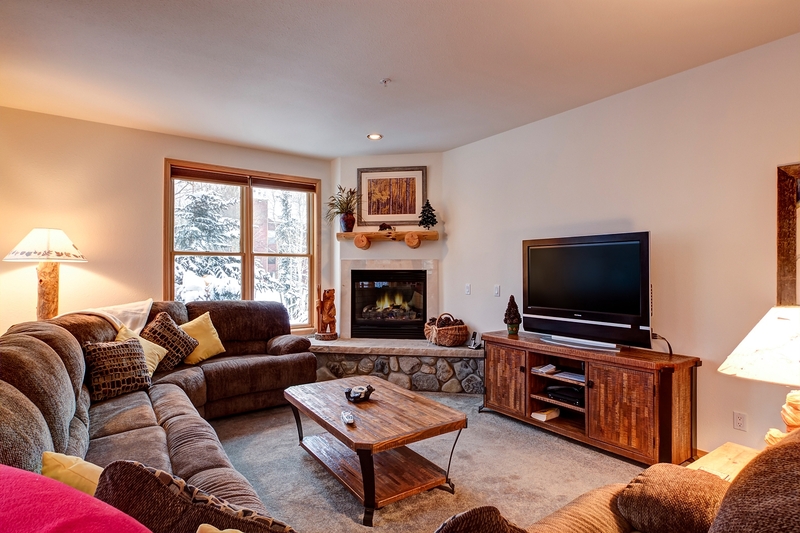 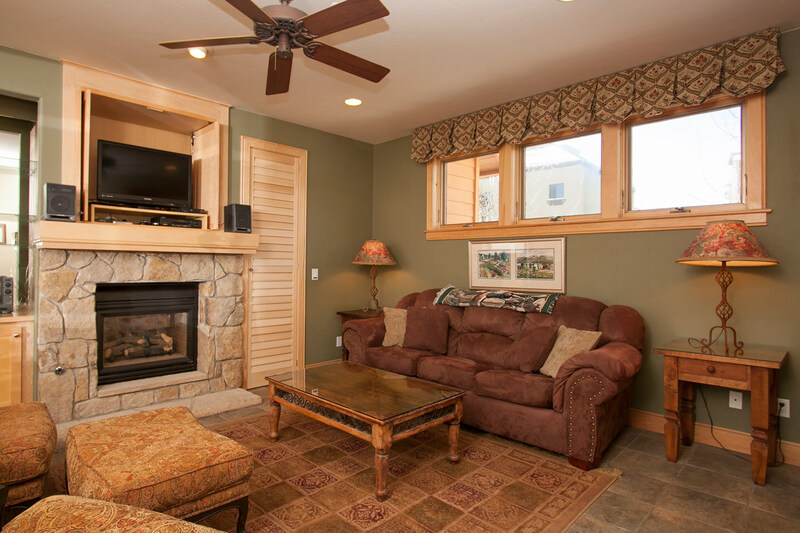 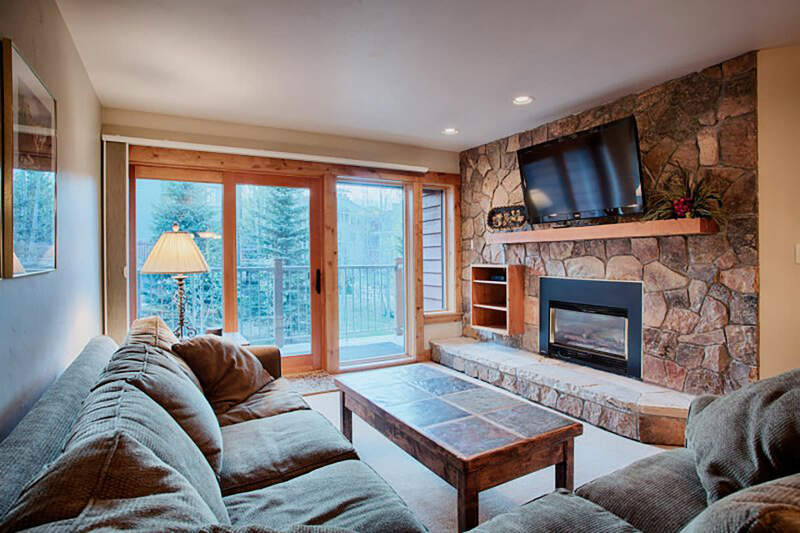 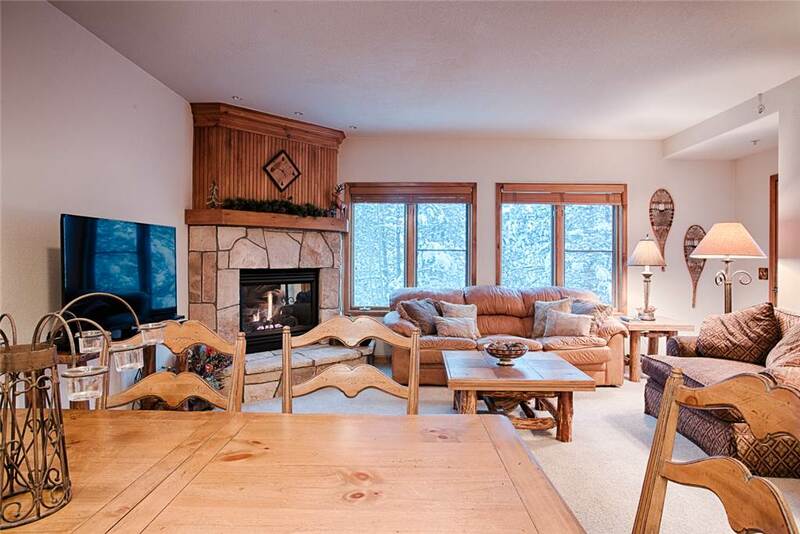 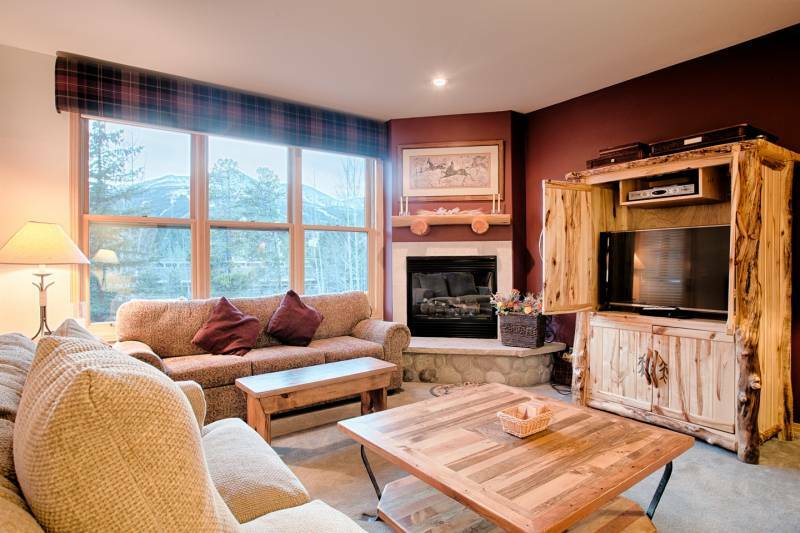 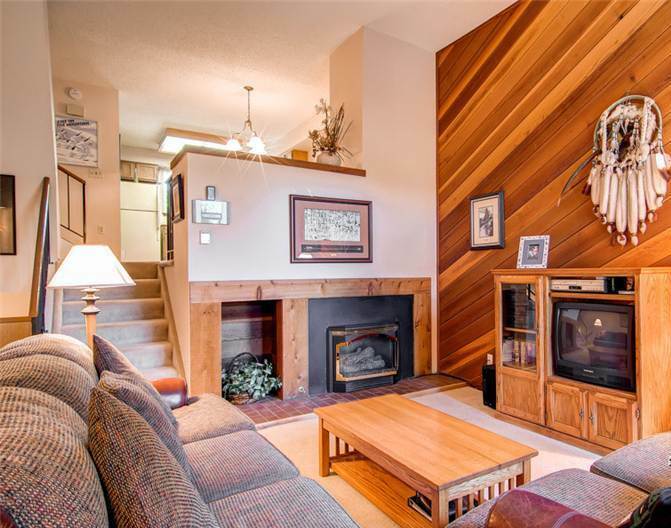 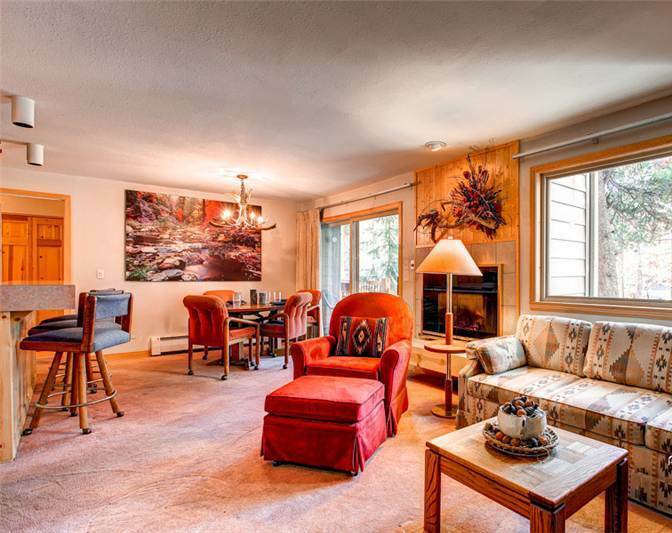 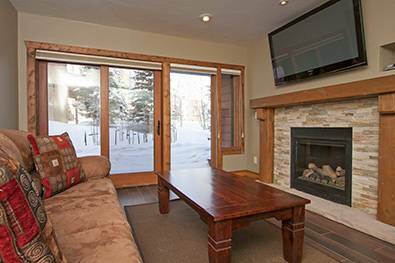 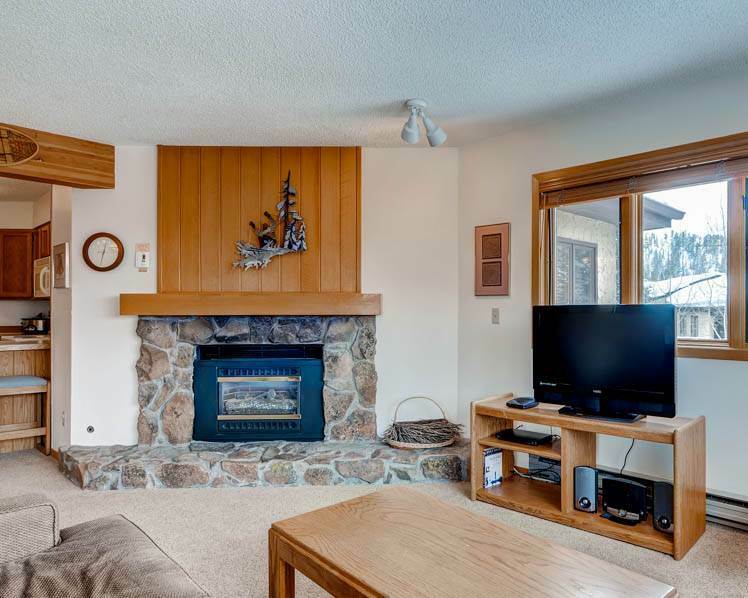 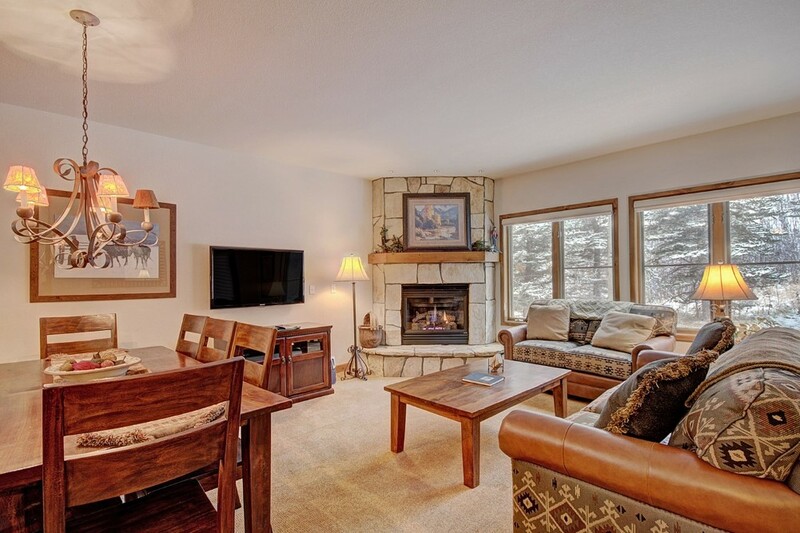 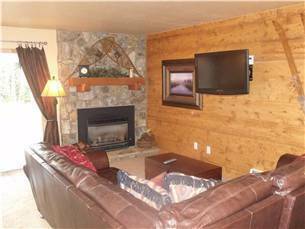 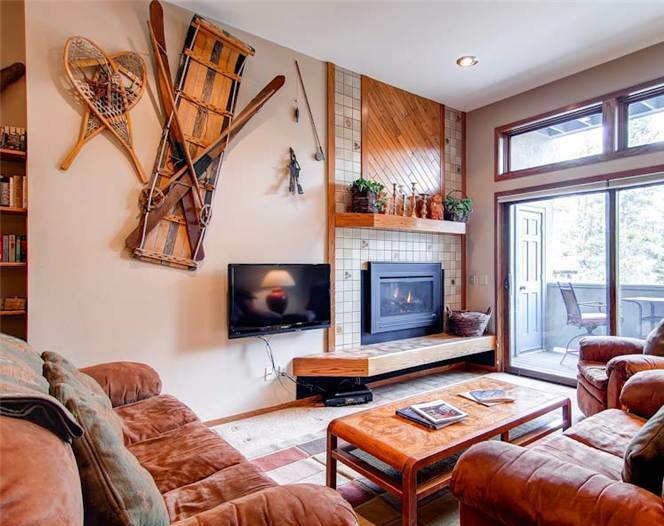 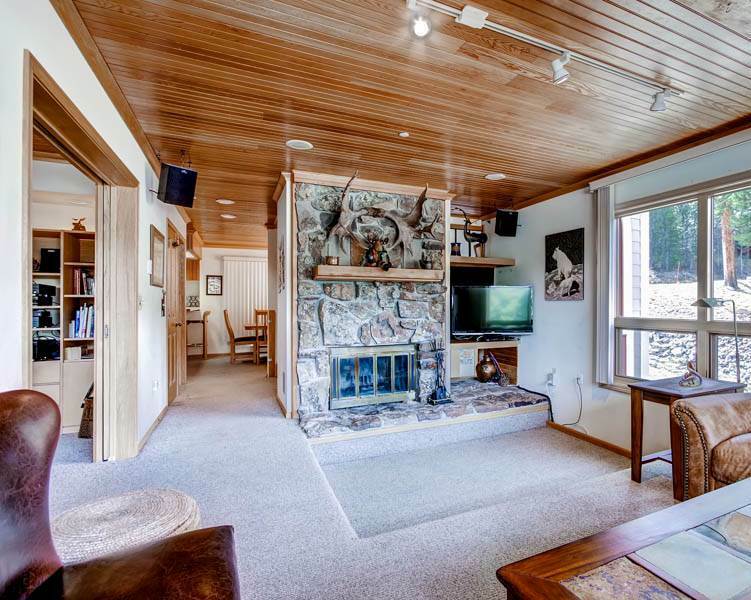 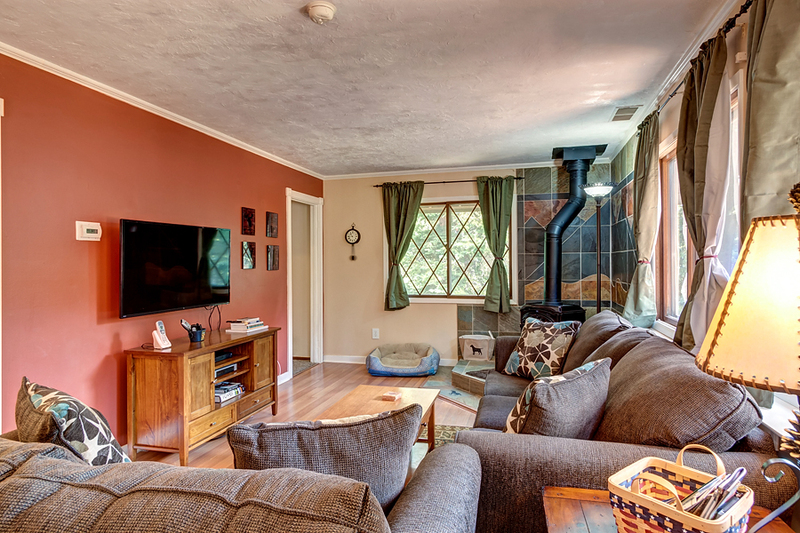 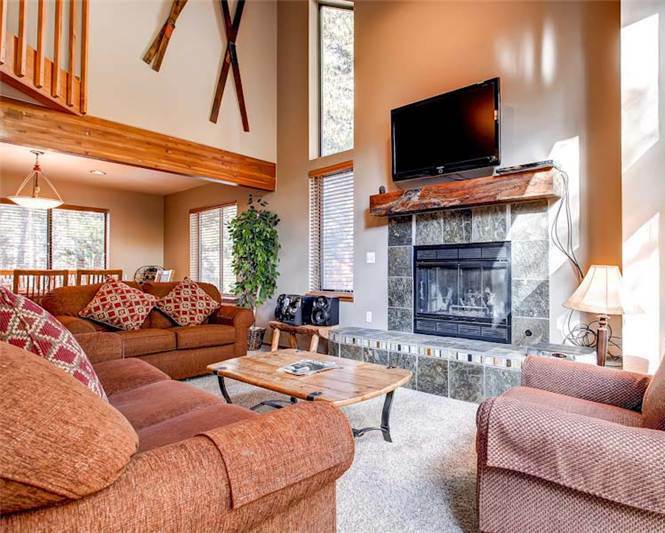 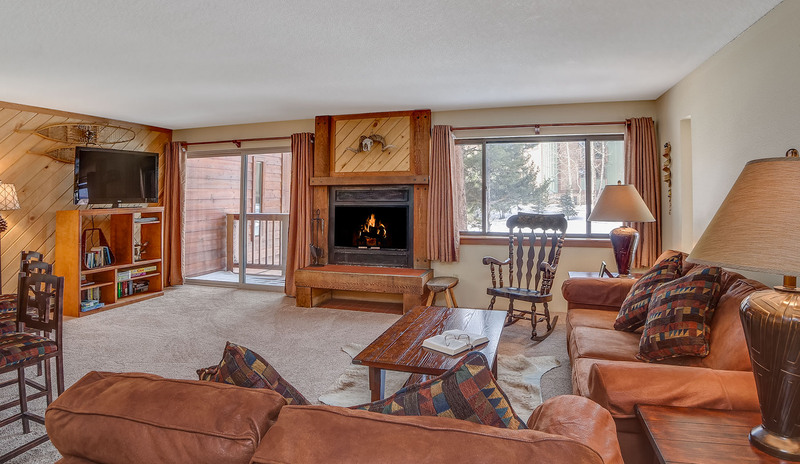 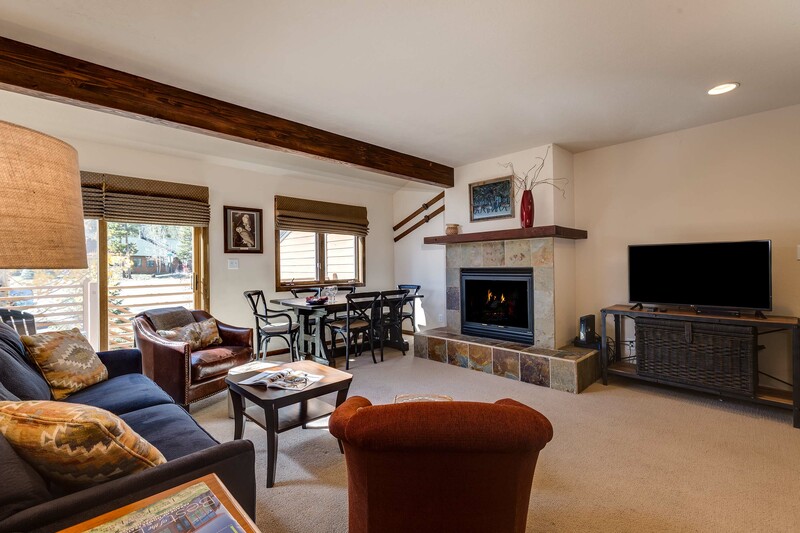 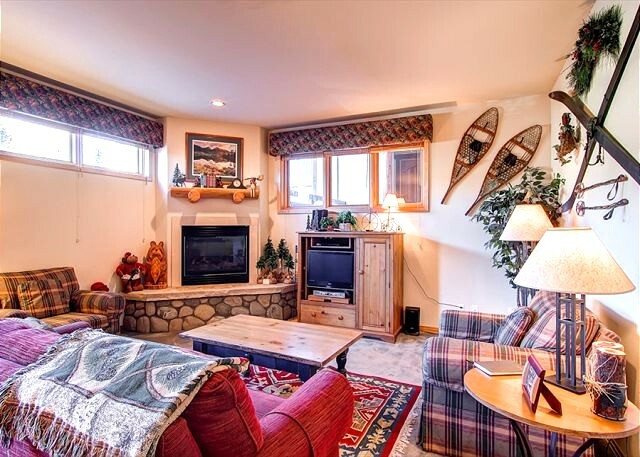 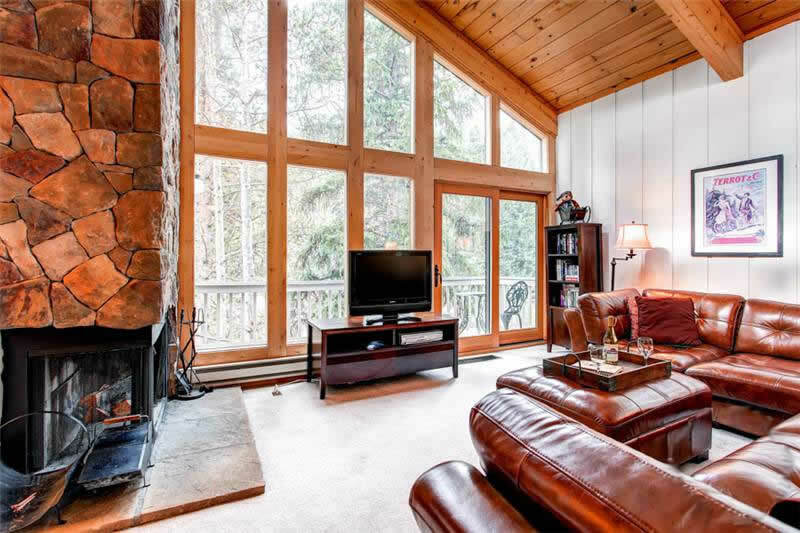 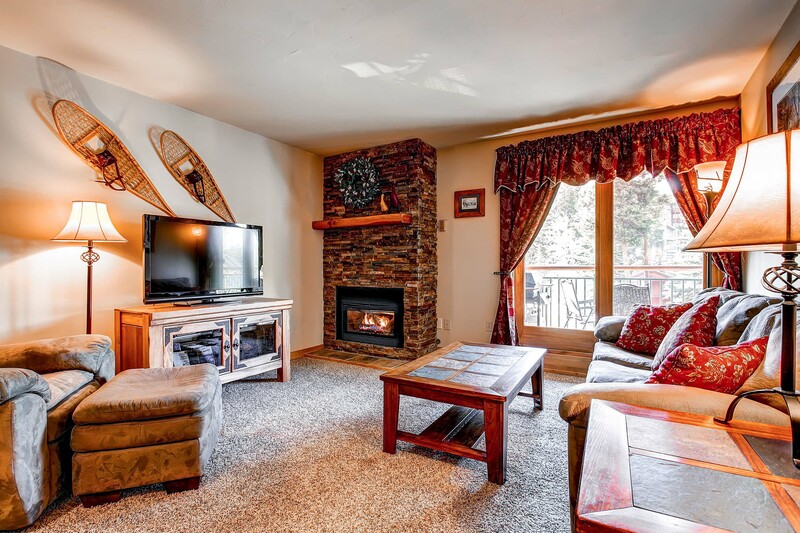 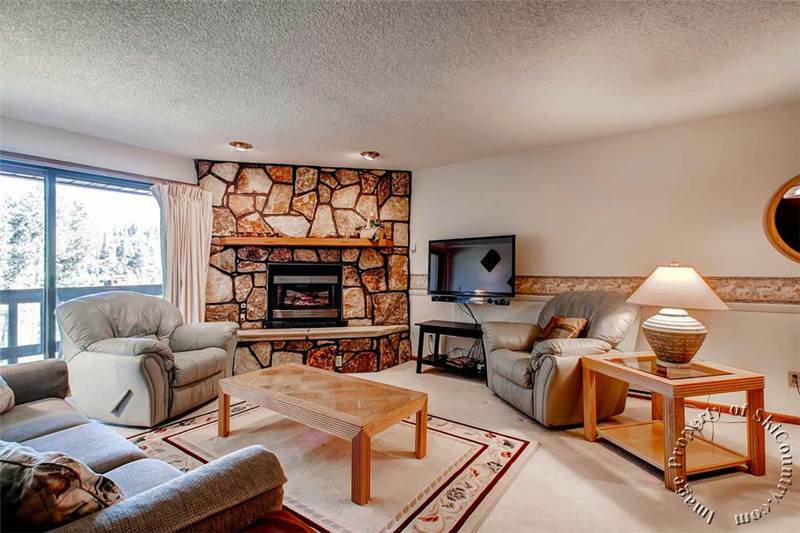 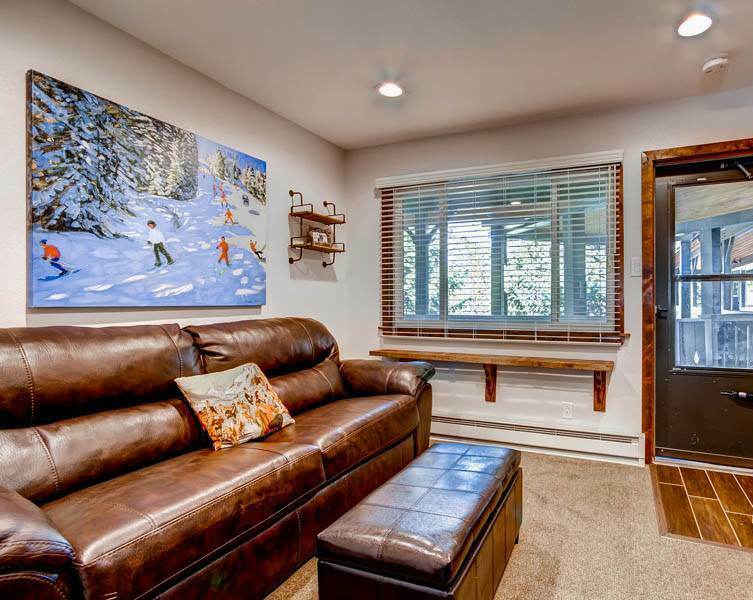 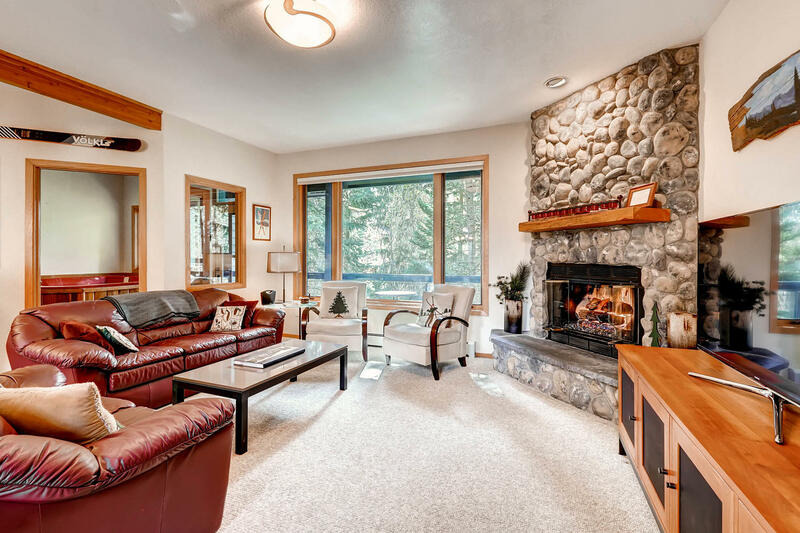 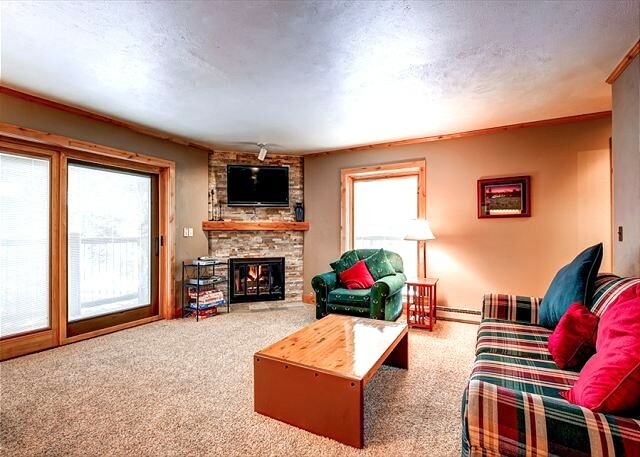 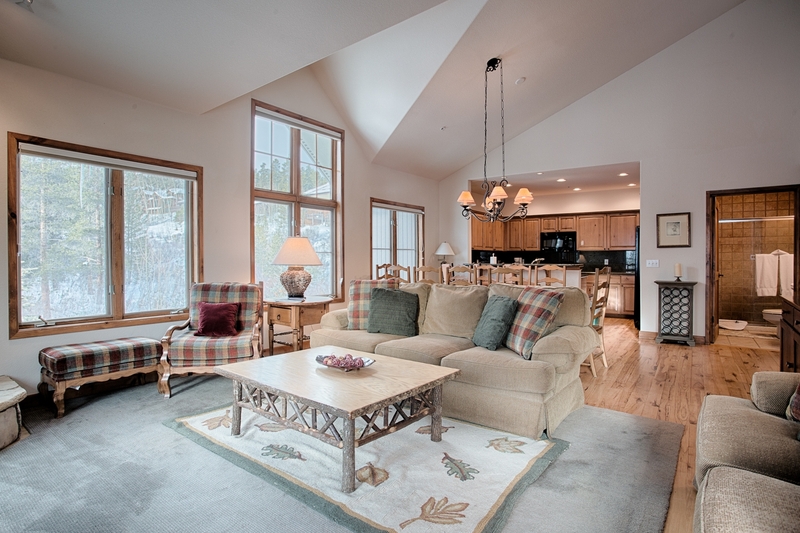 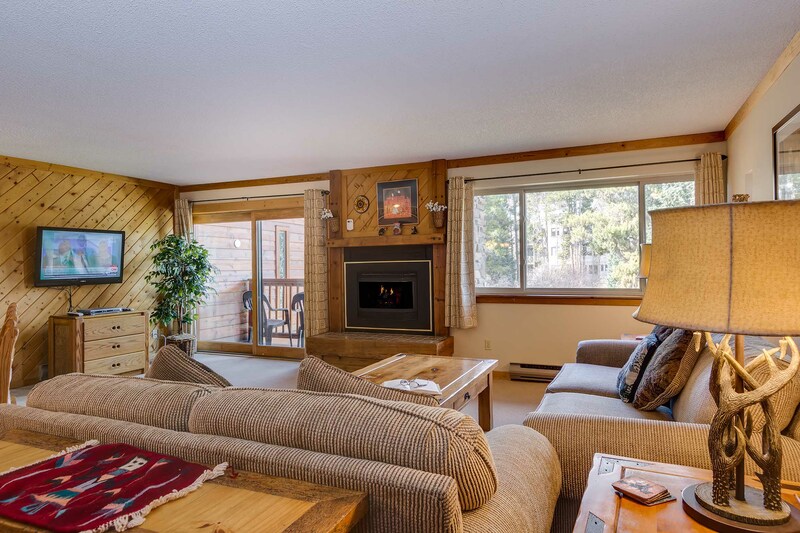 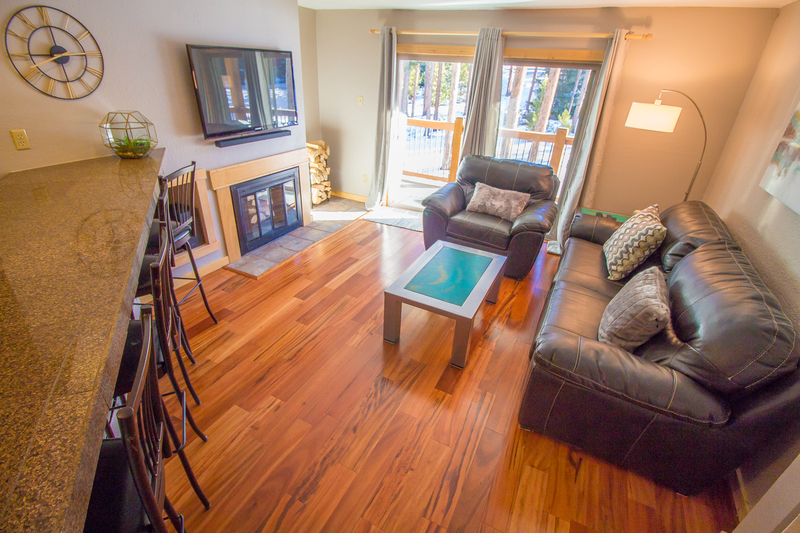 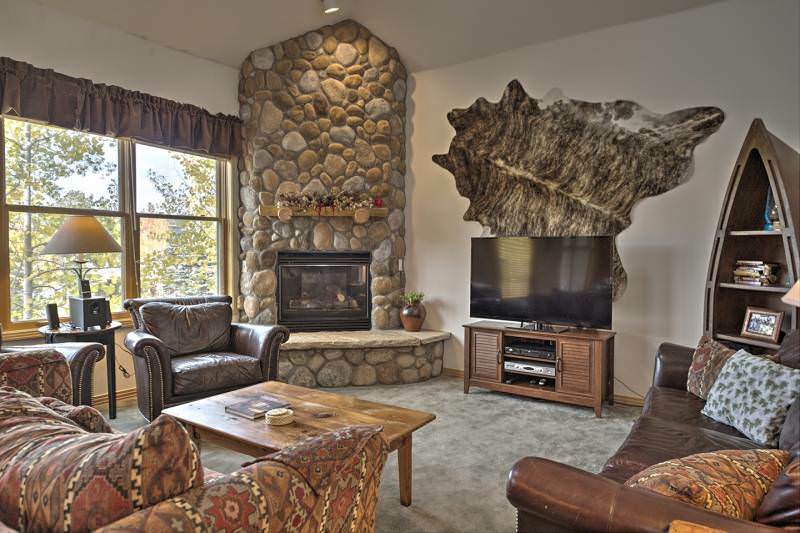 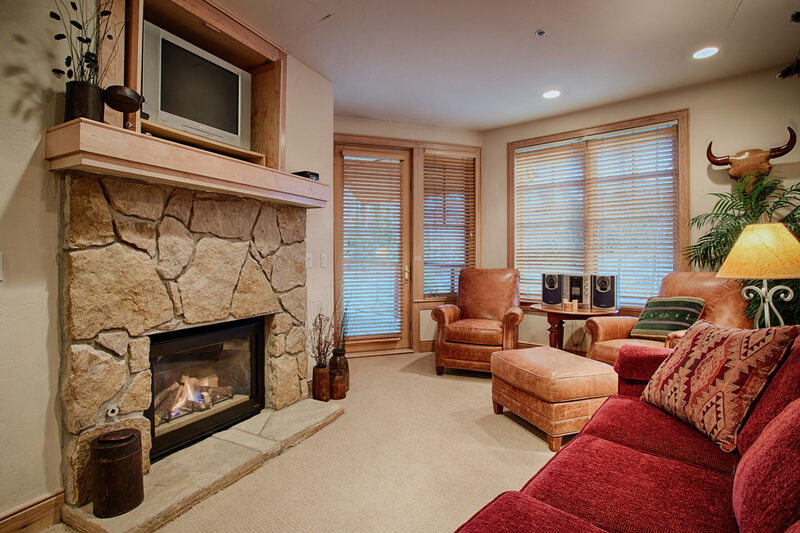 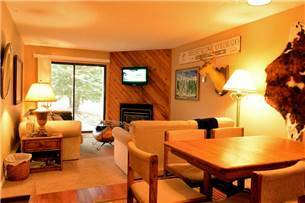 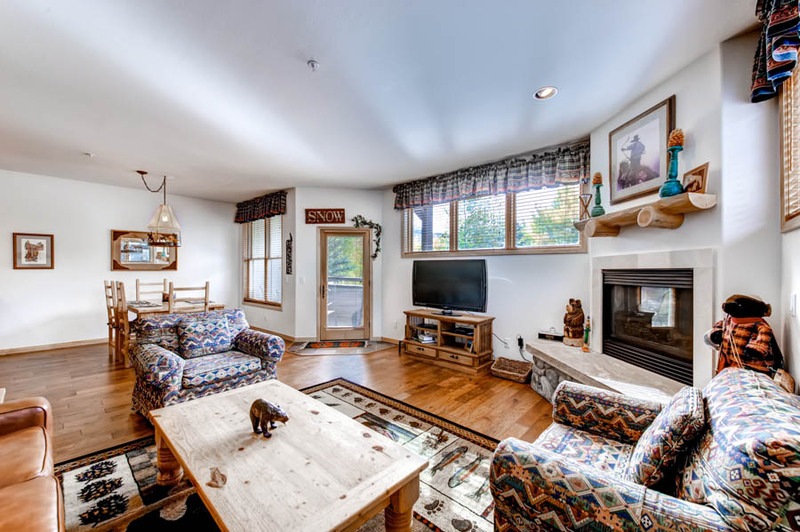 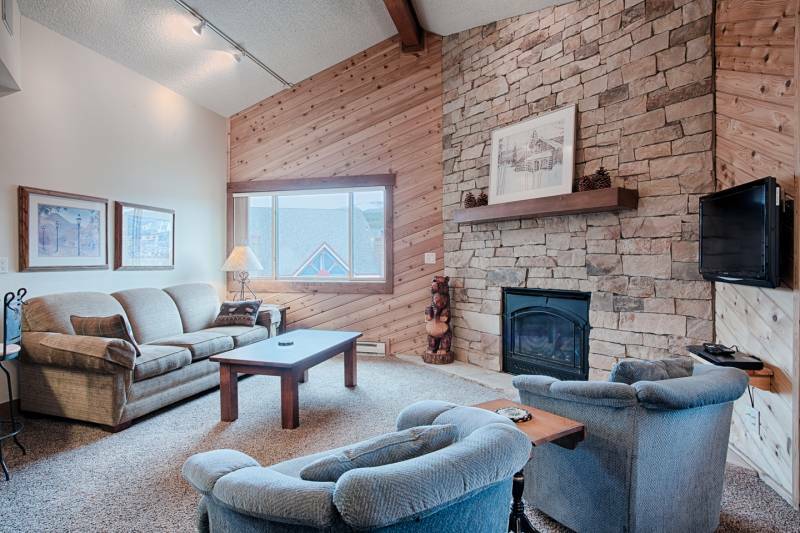 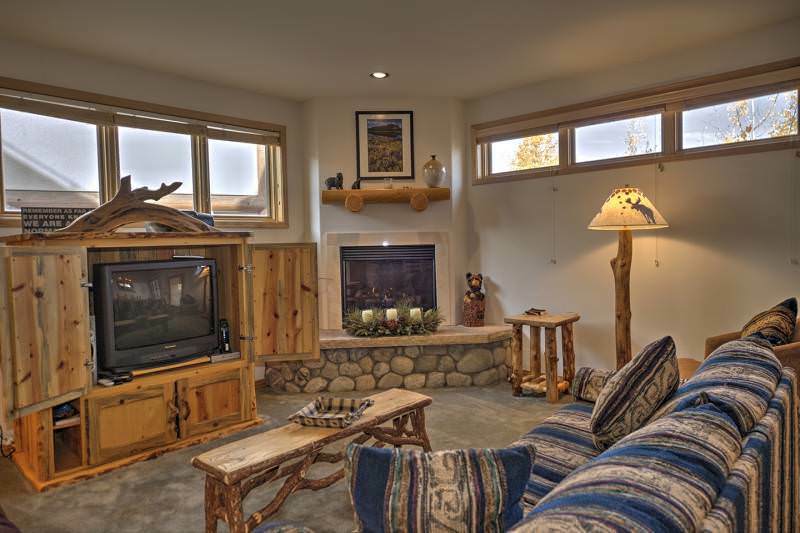 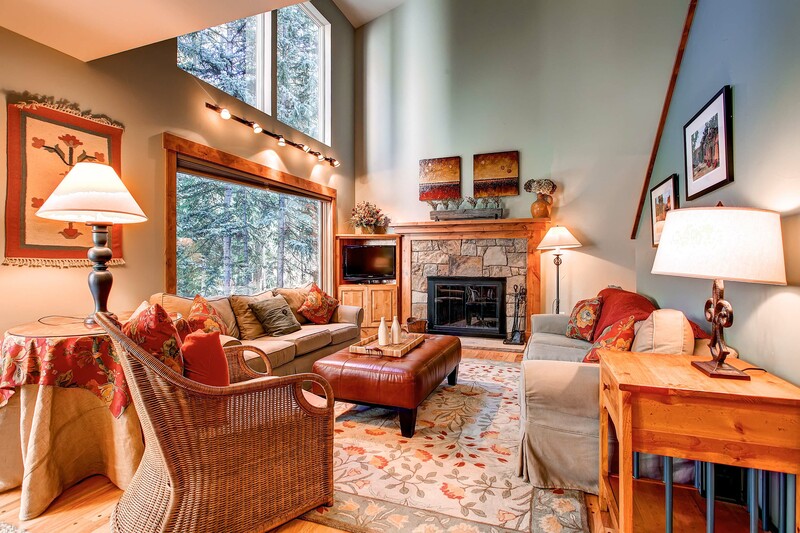 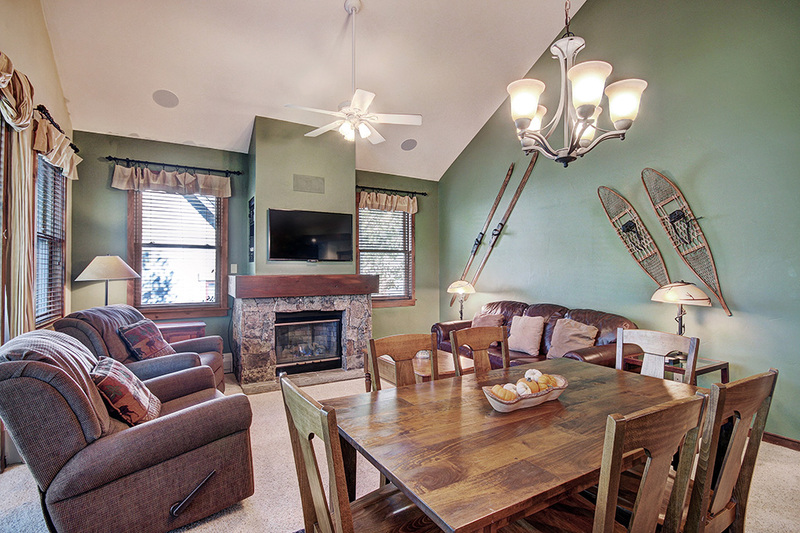 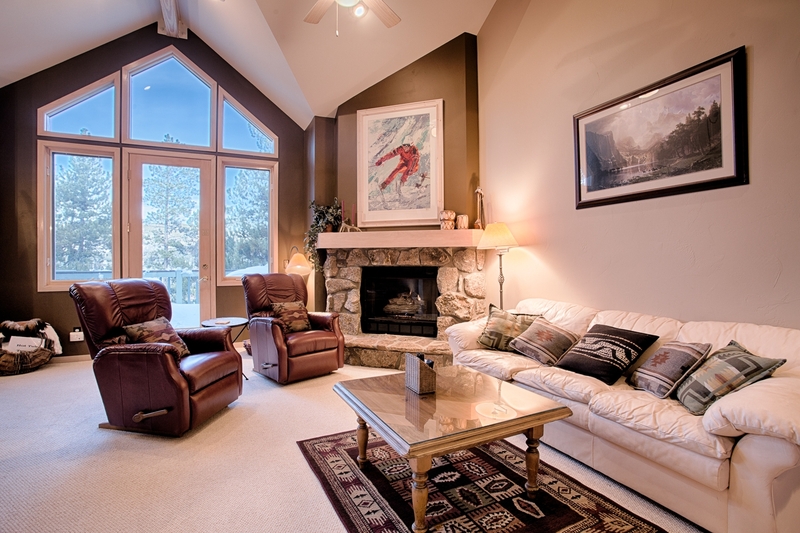 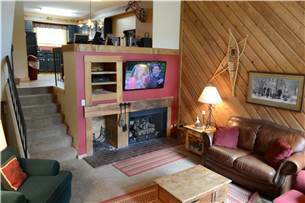 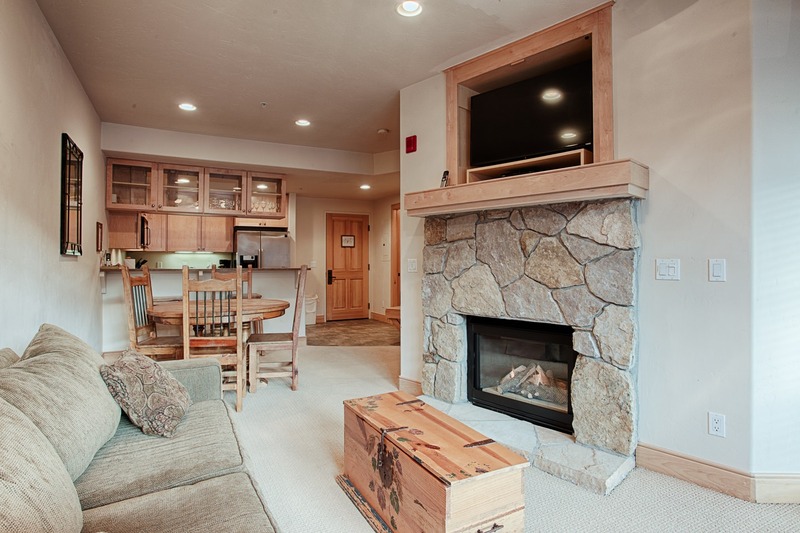 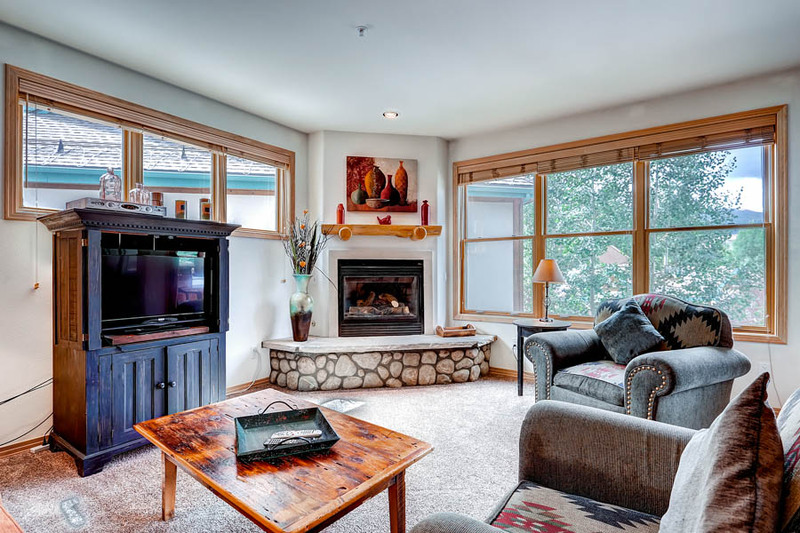 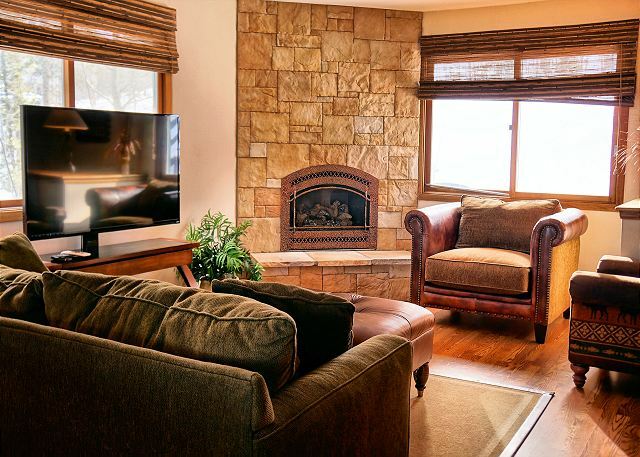 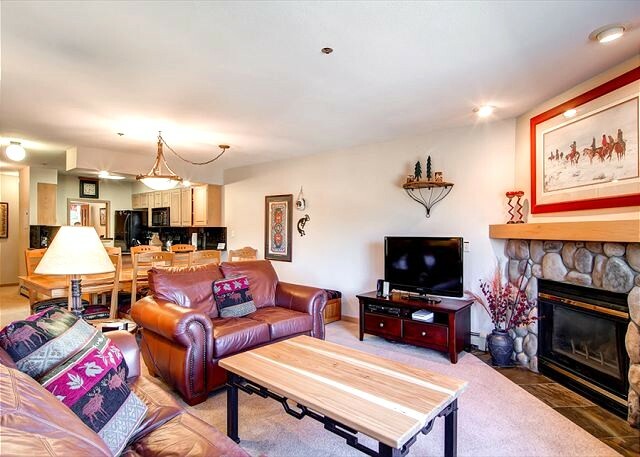 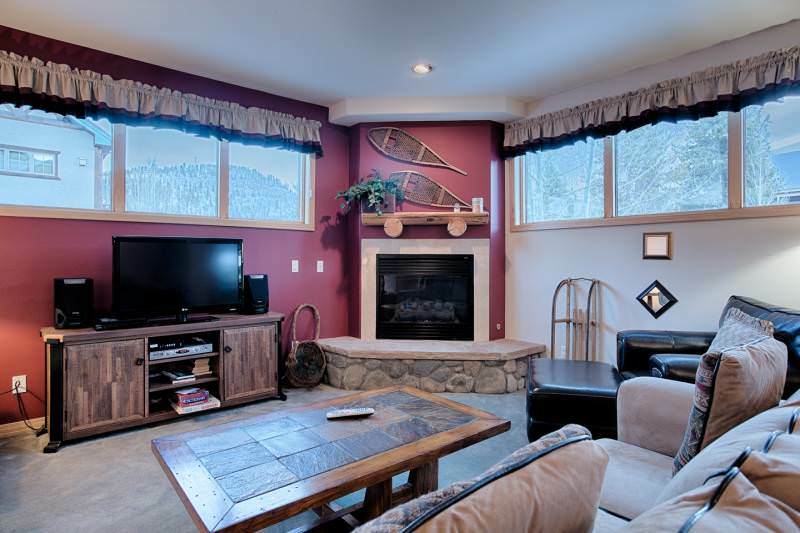 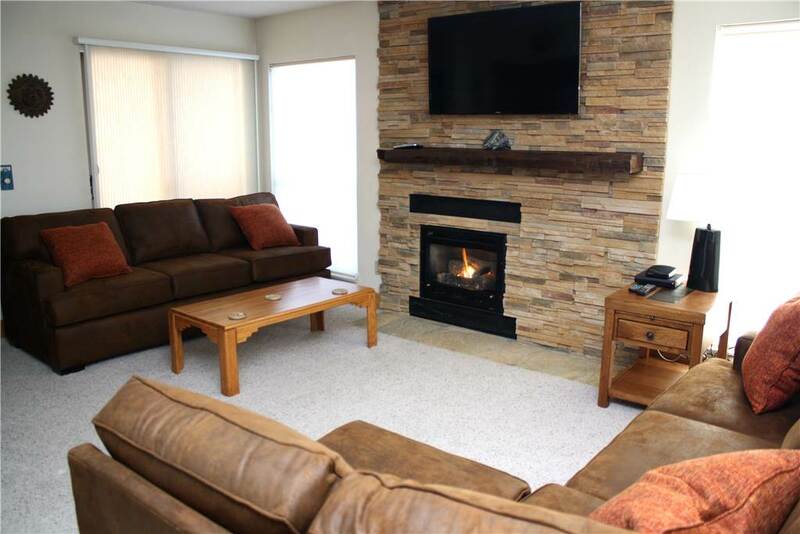 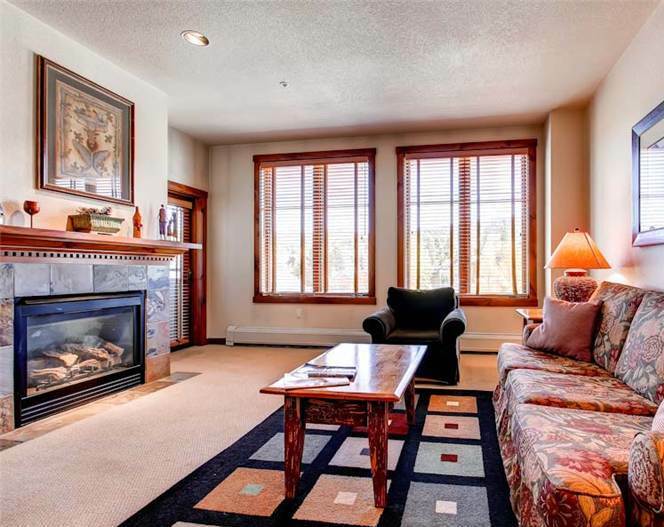 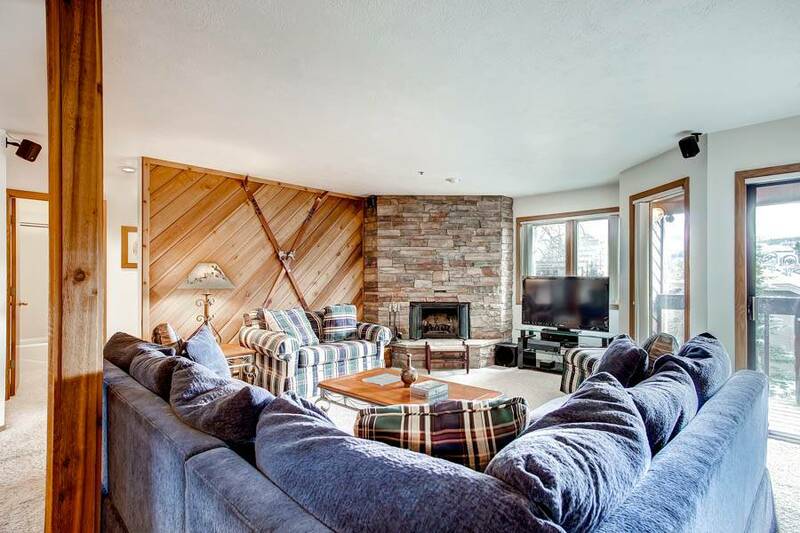 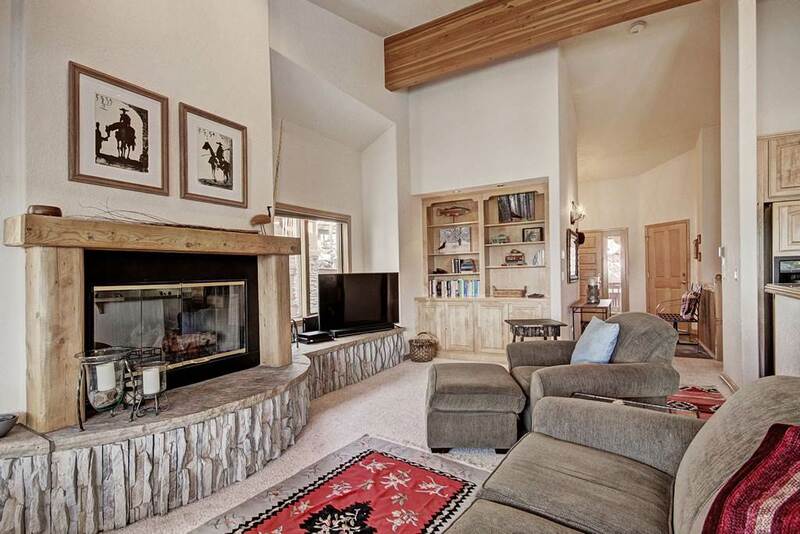 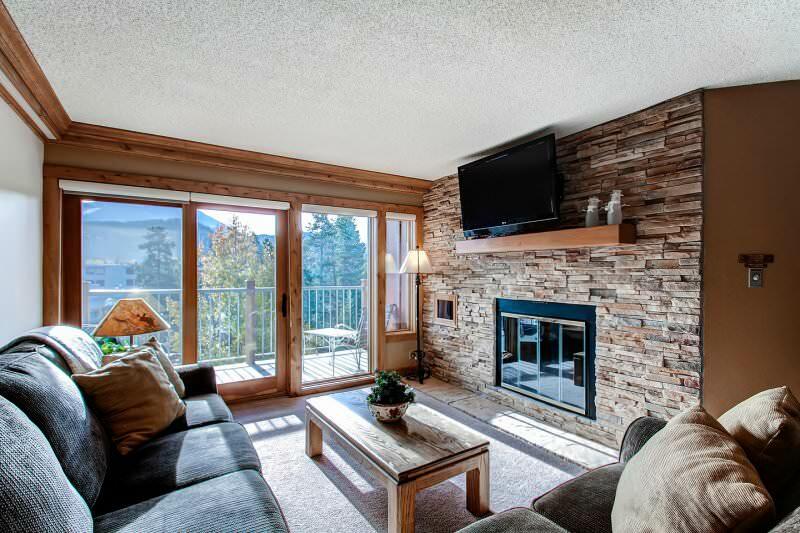 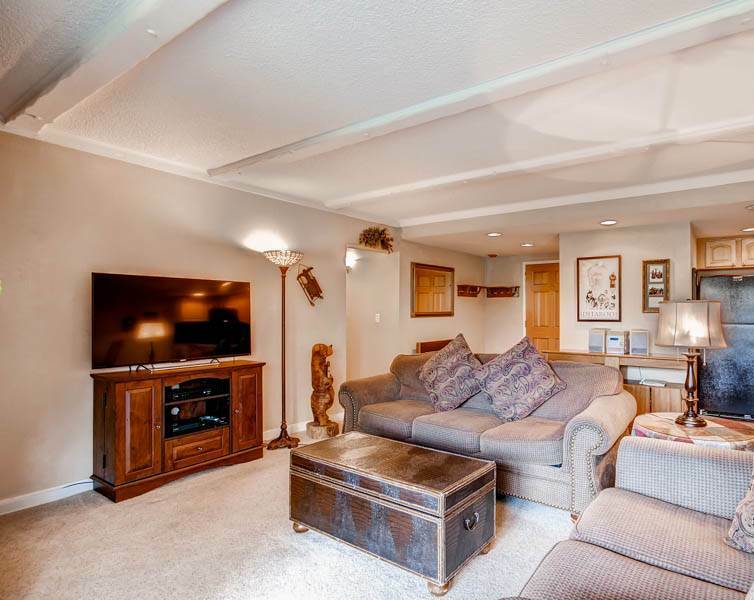 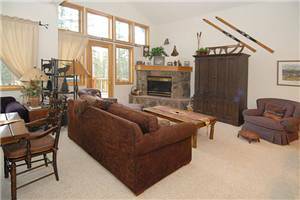 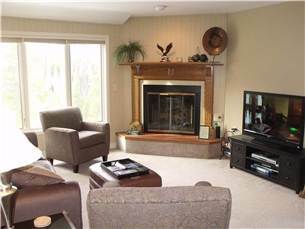 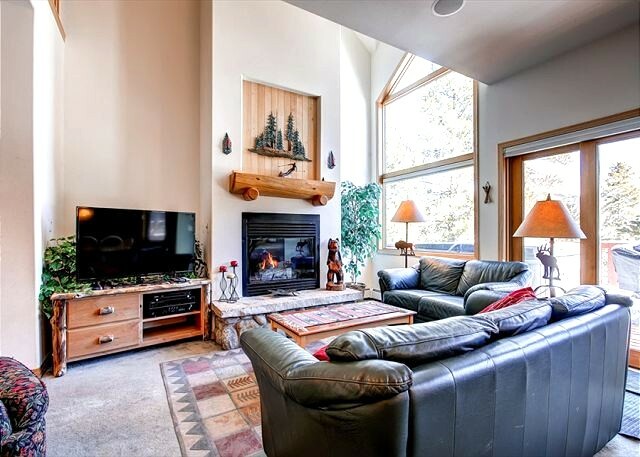 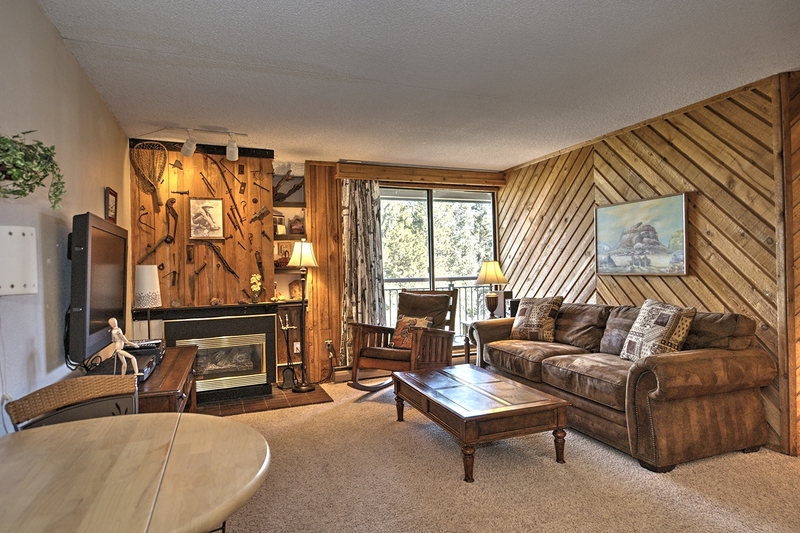 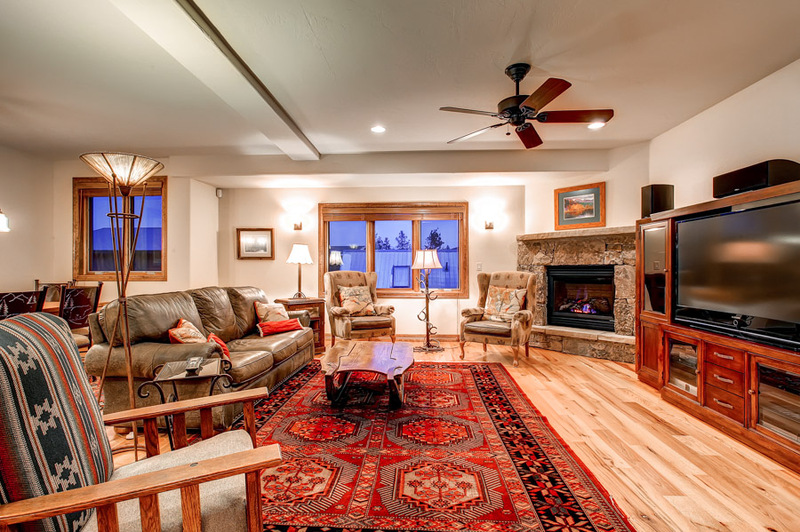 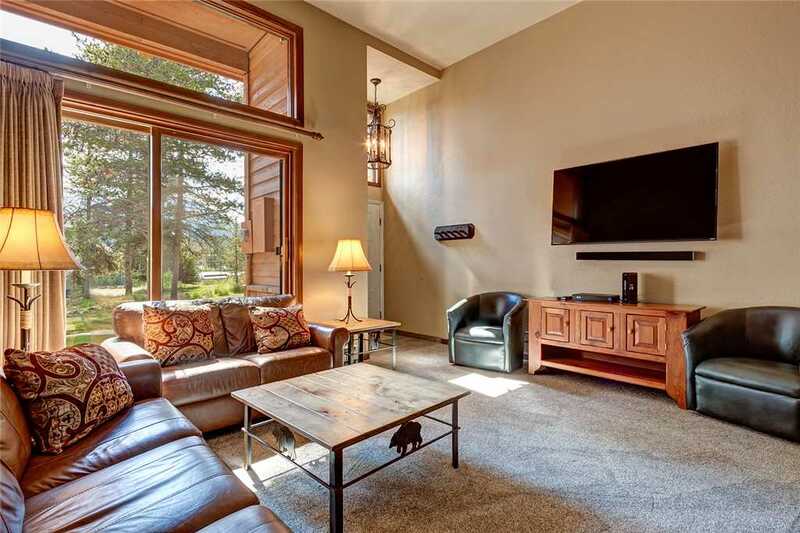 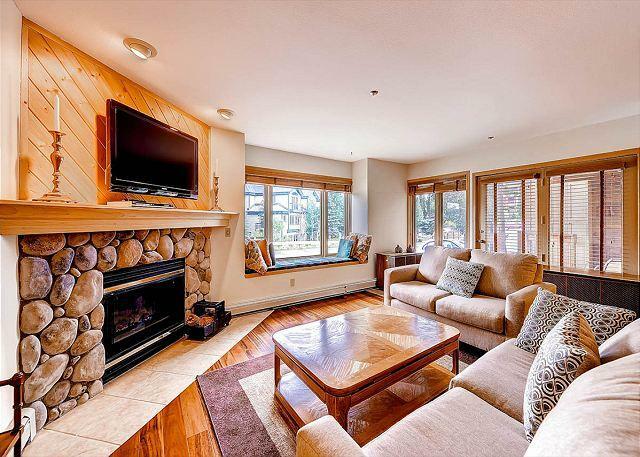 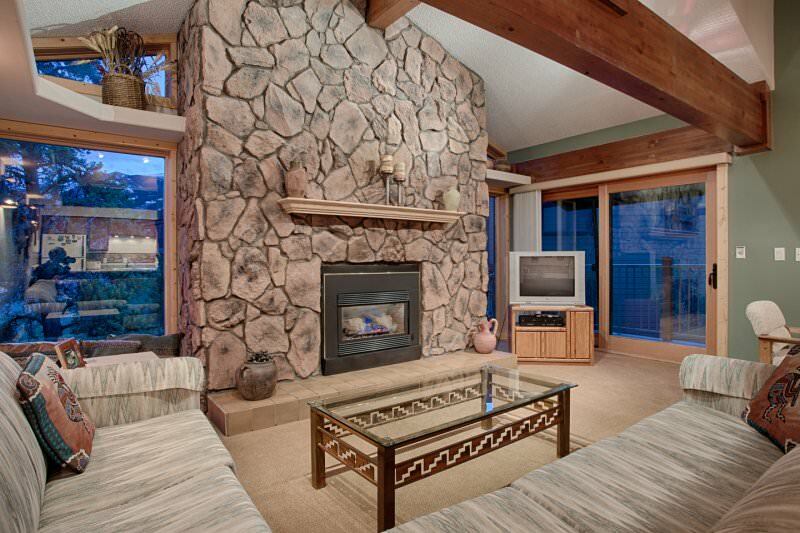 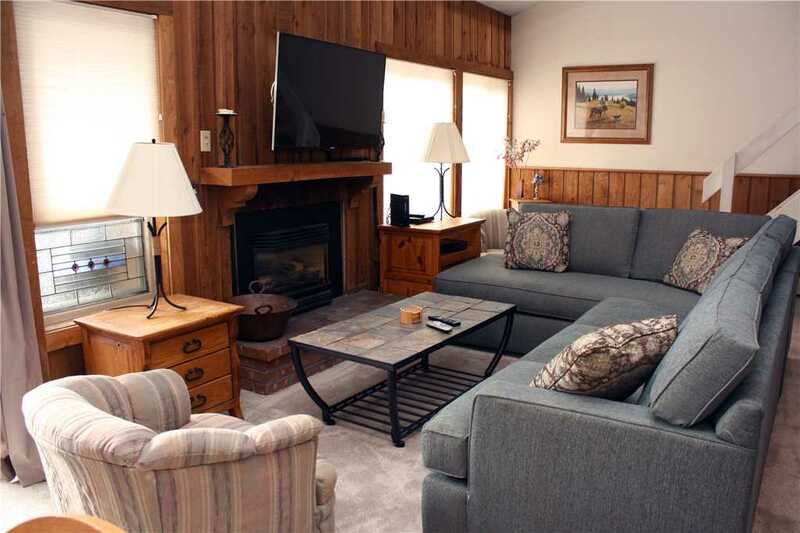 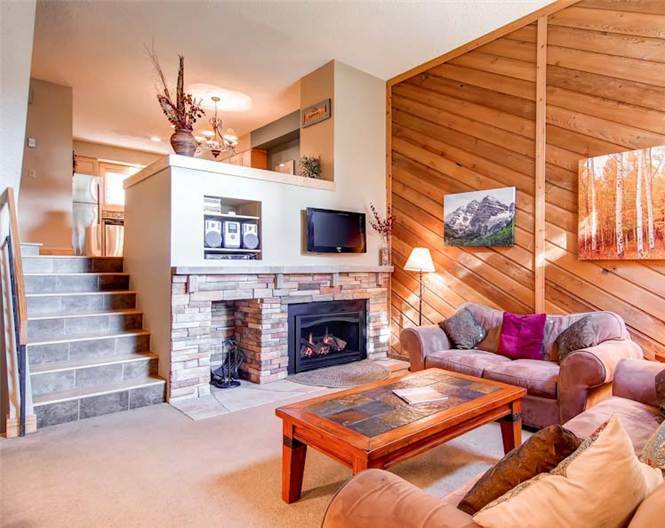 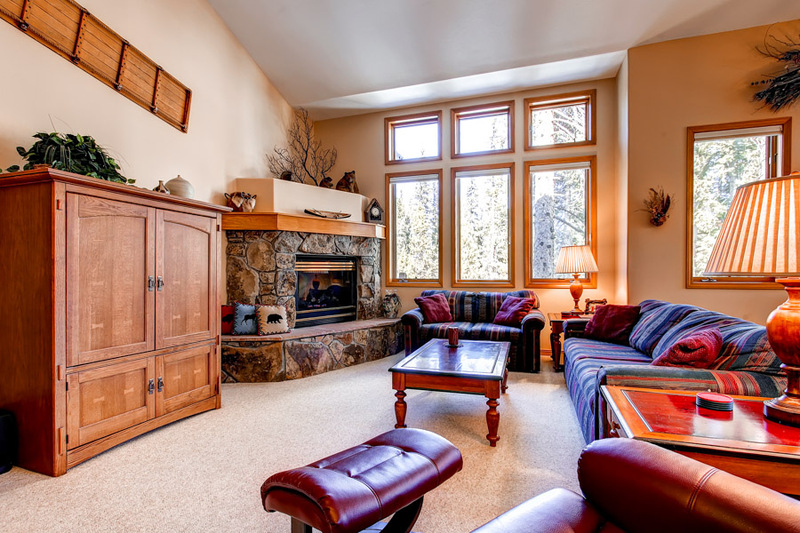 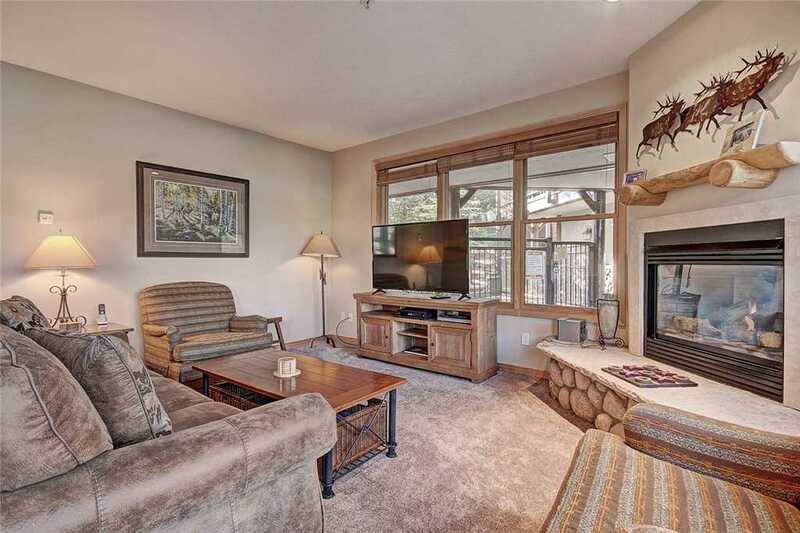 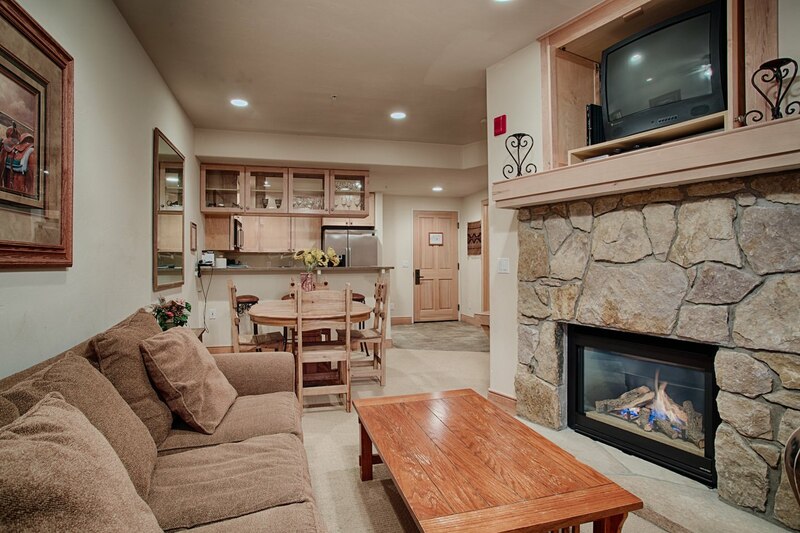 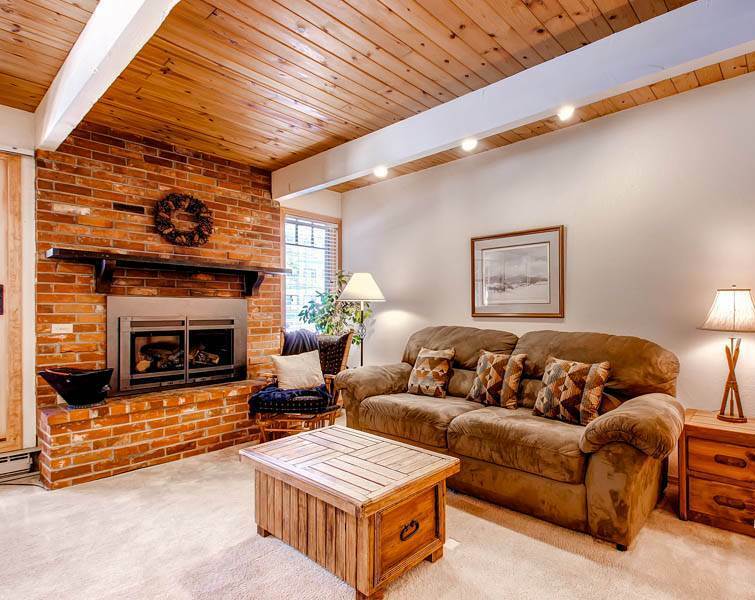 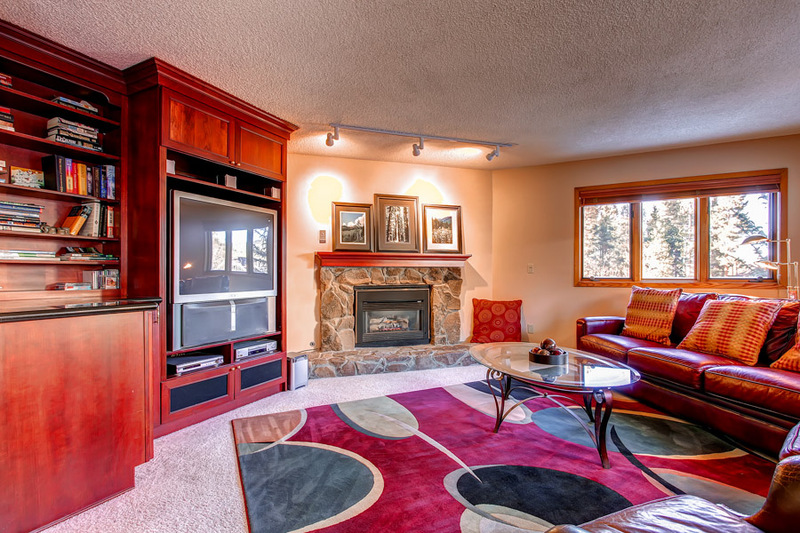 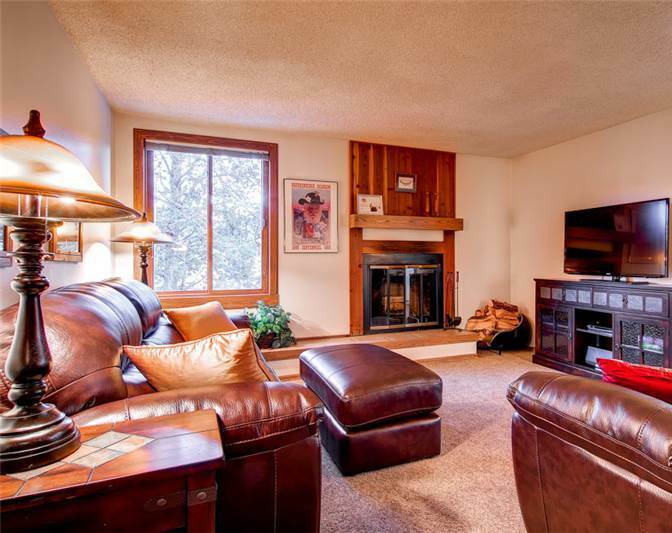 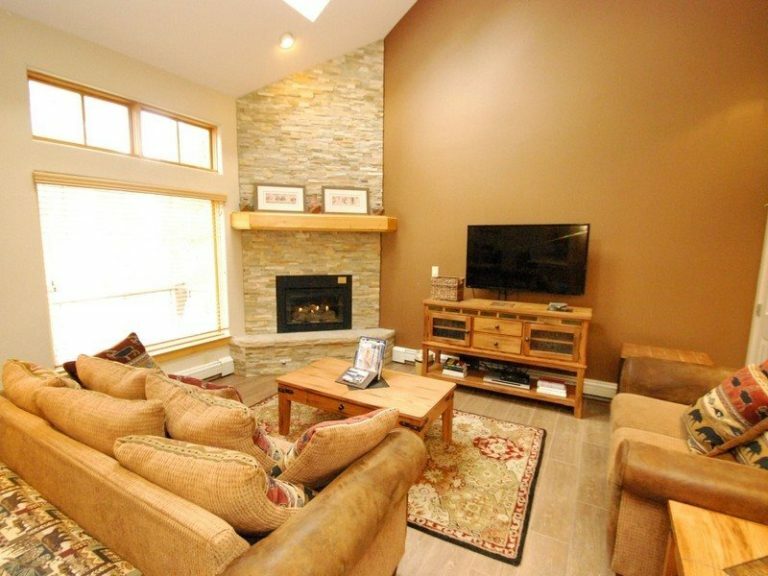 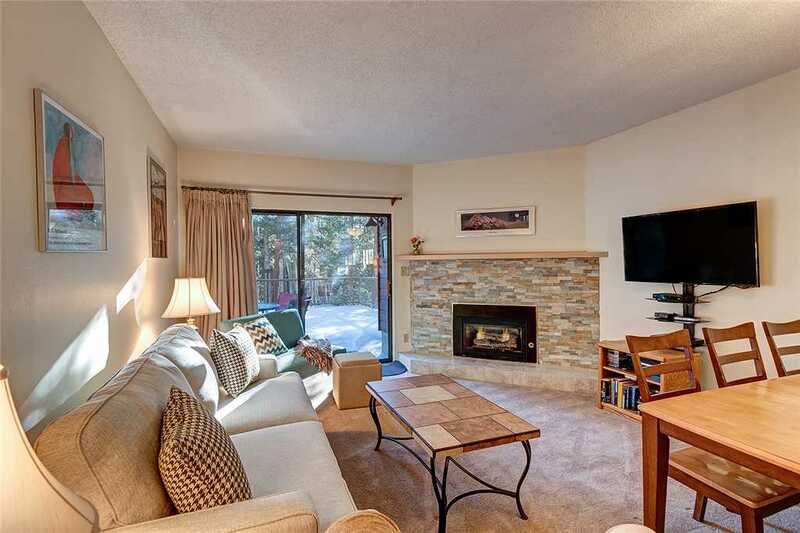 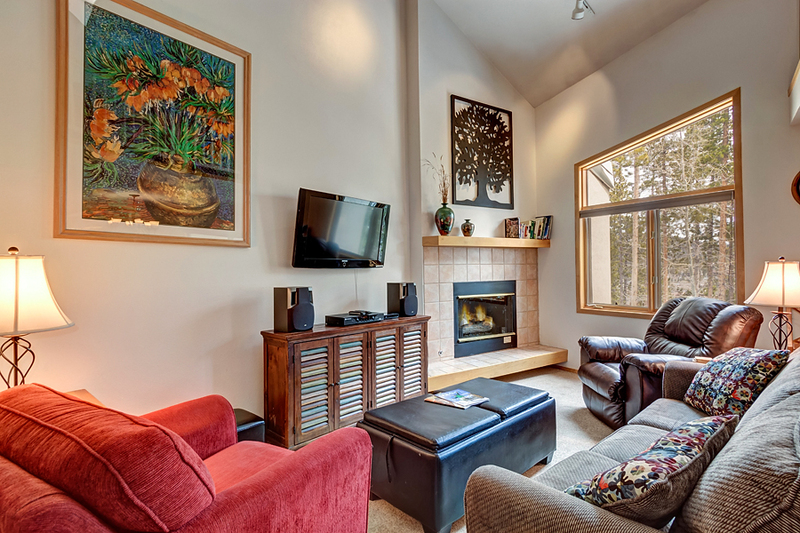 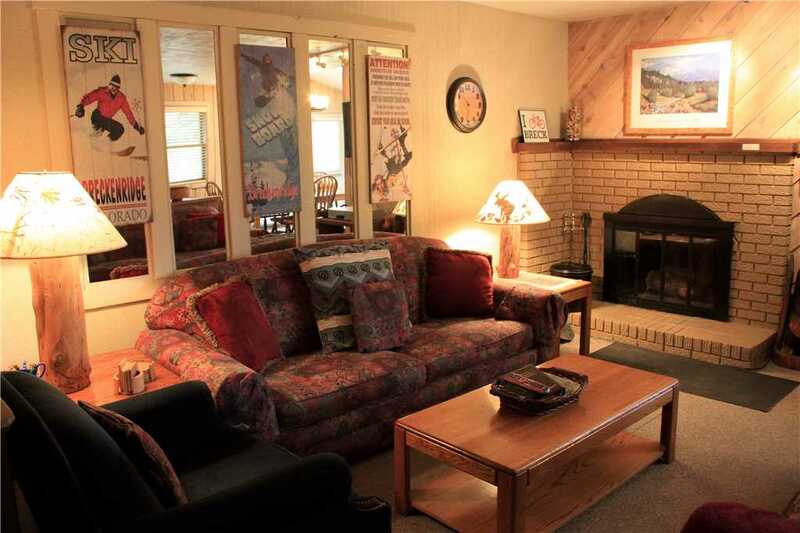 The gas fireplace, LCD TV, Blu-ray player, AM/FM receiver and Bose sound system combine with plenty of seating to enable magical evenings around the hearth trading tales of snow-riding splendor. 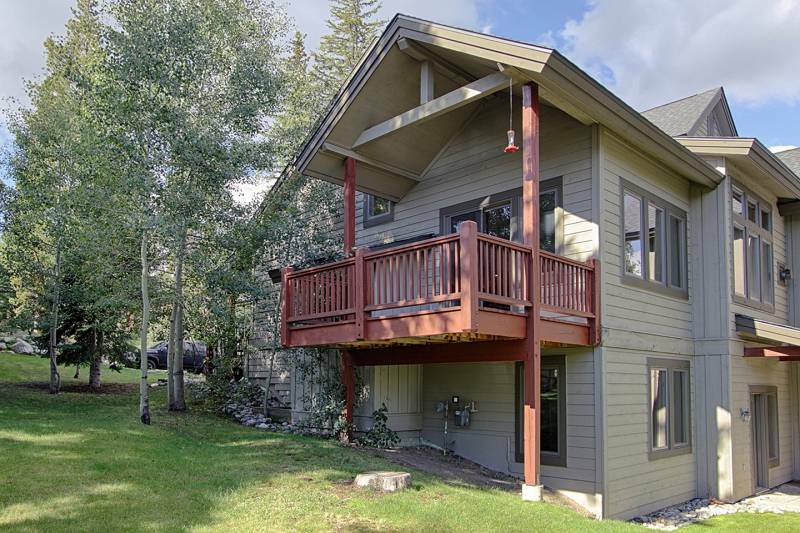 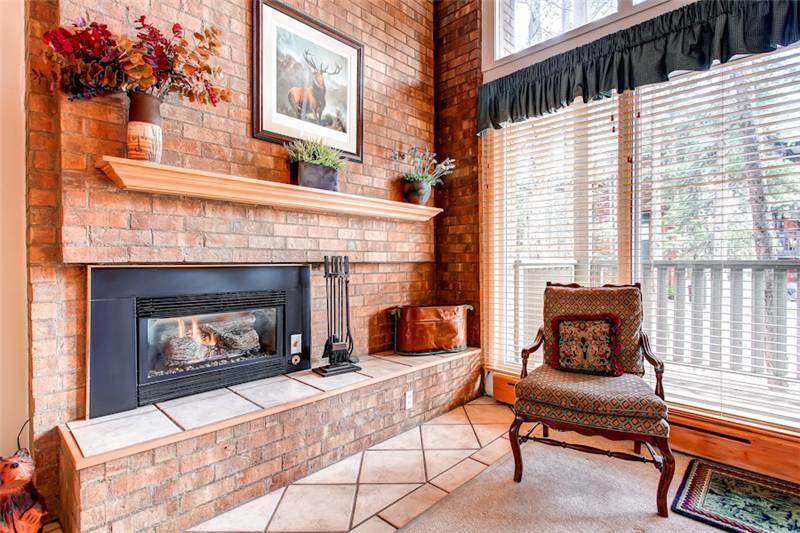 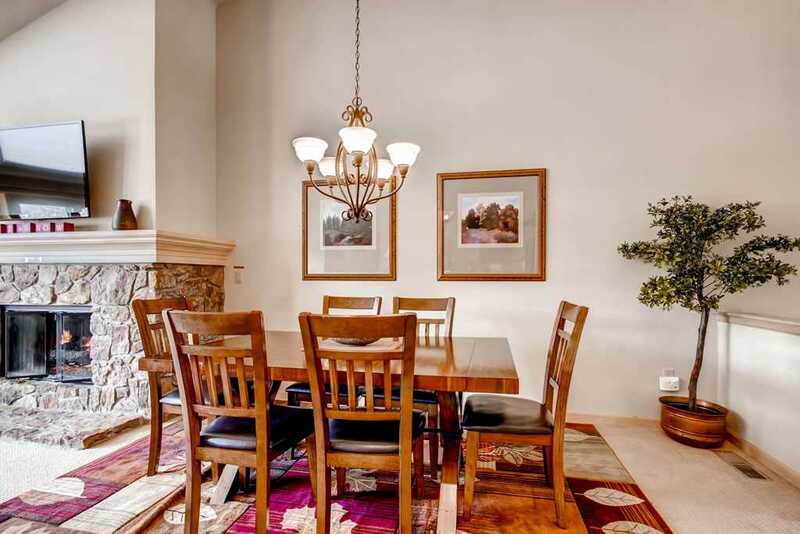 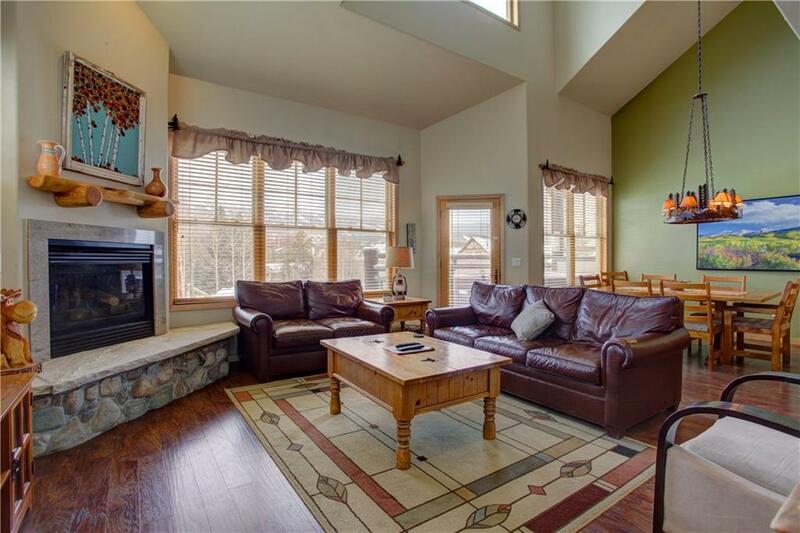 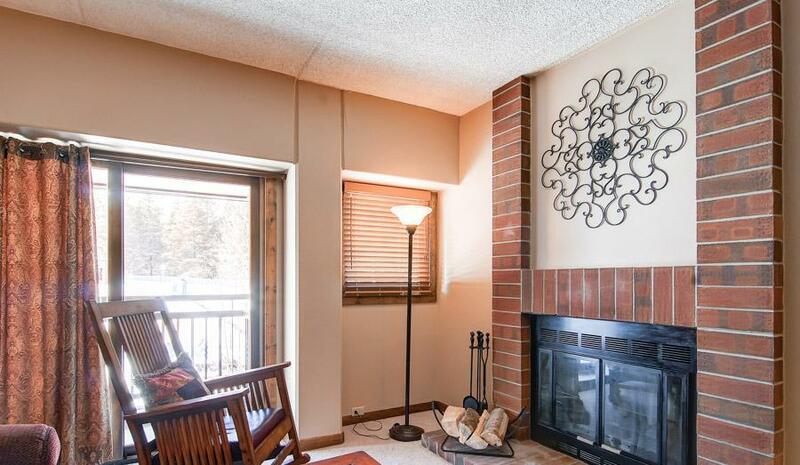 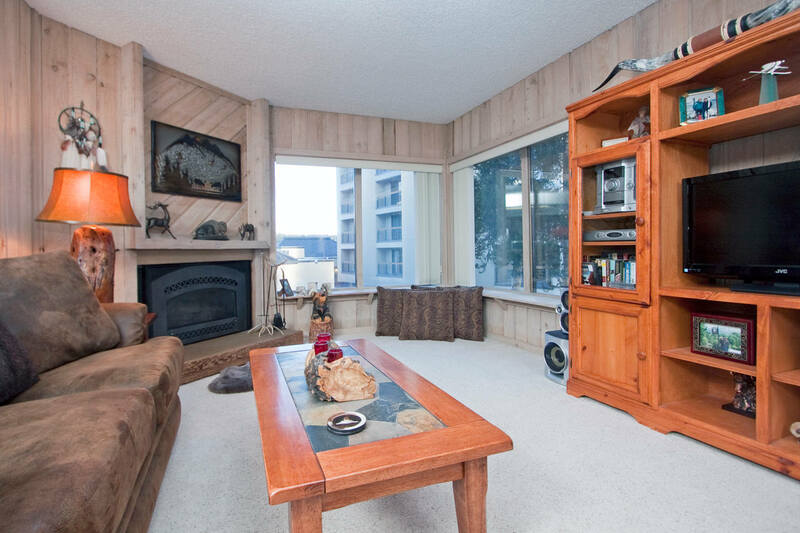 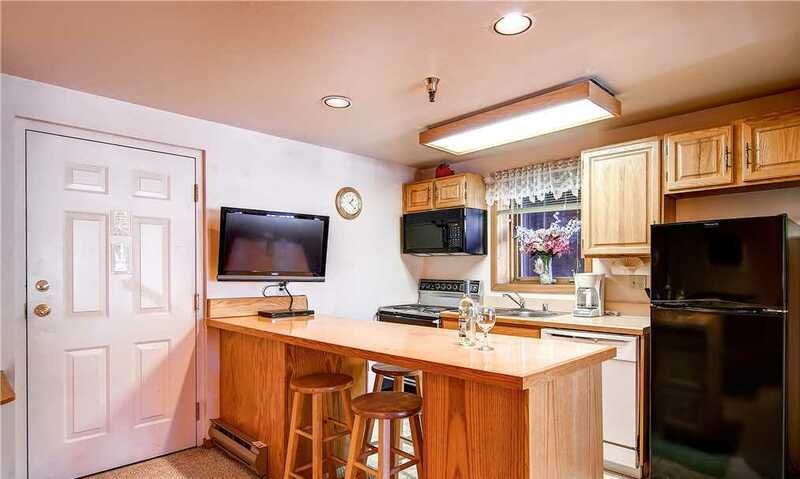 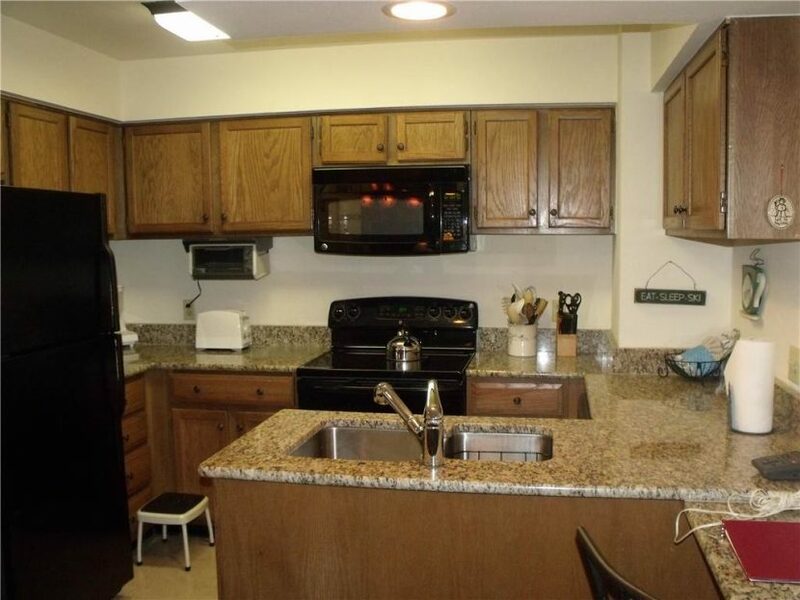 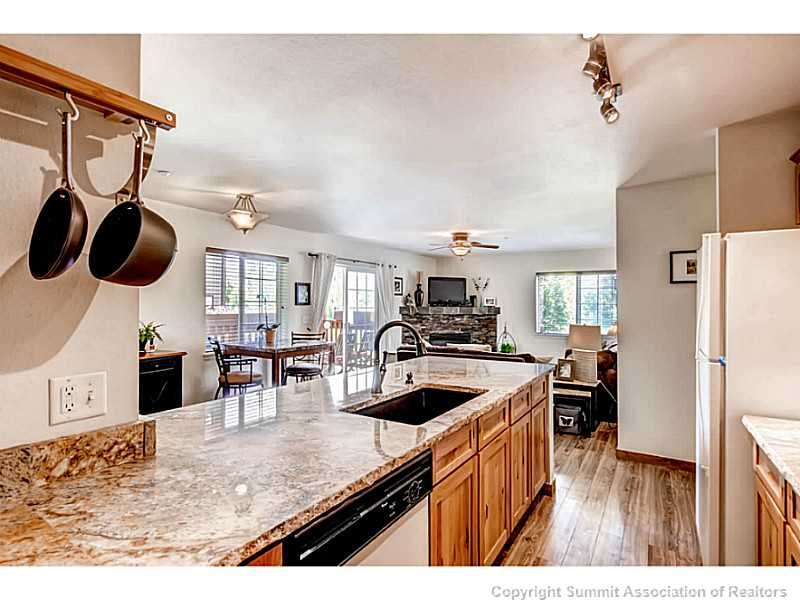 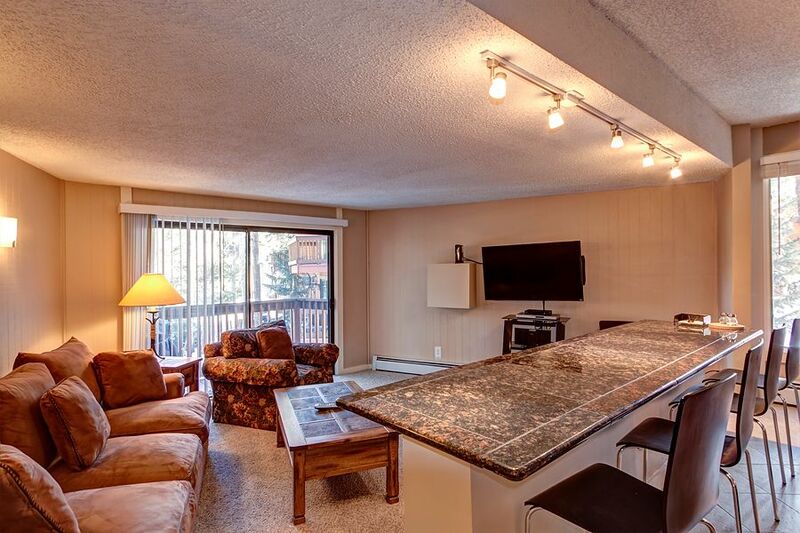 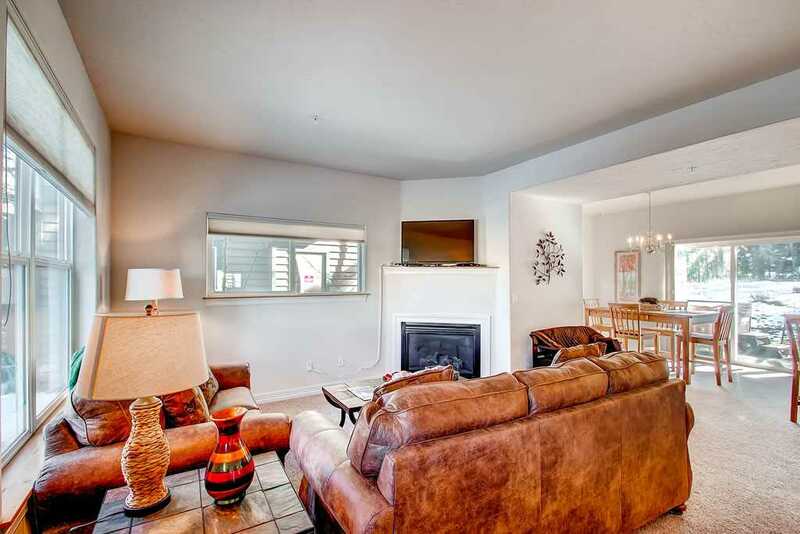 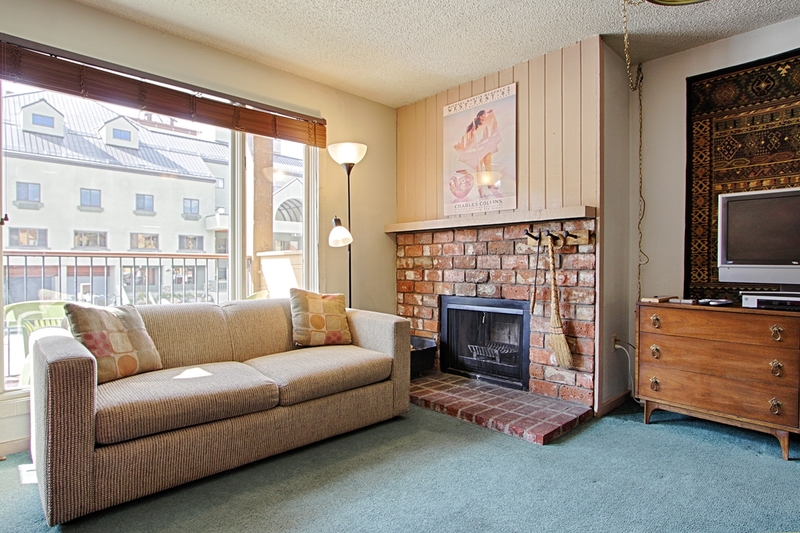 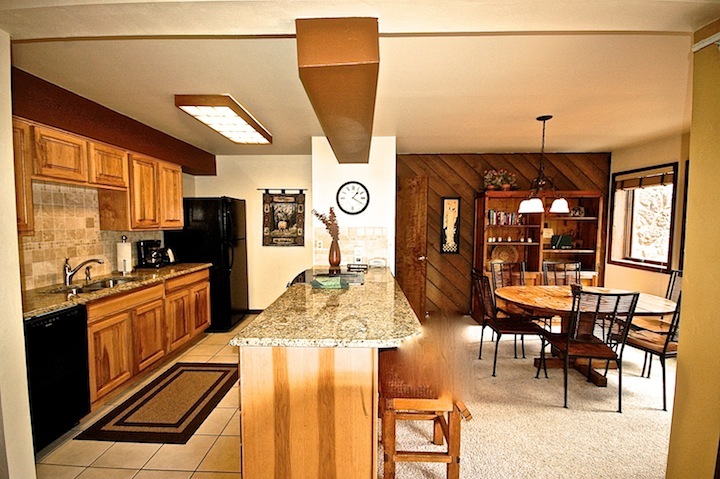 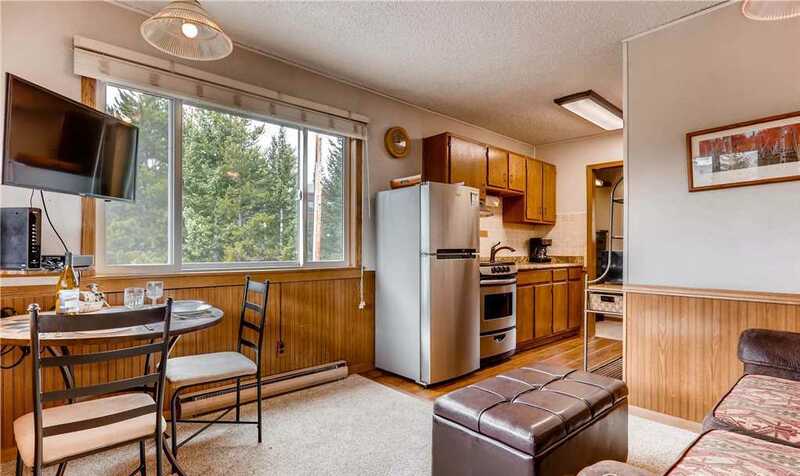 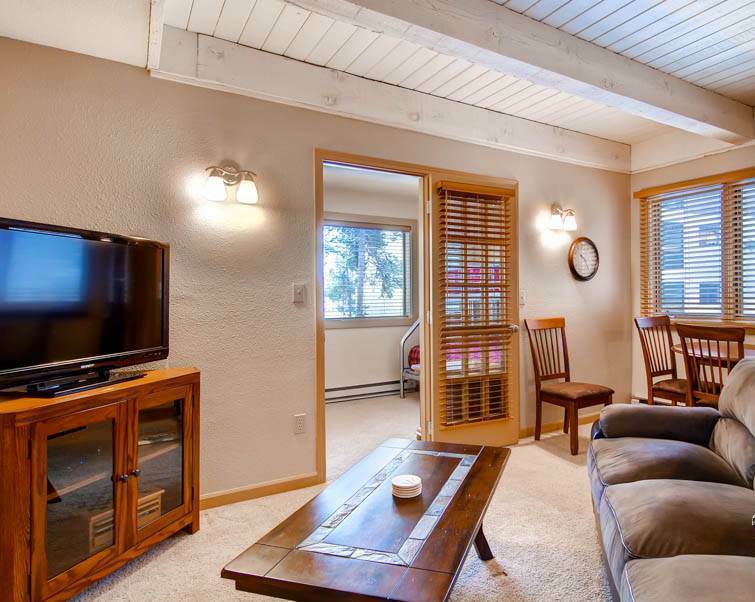 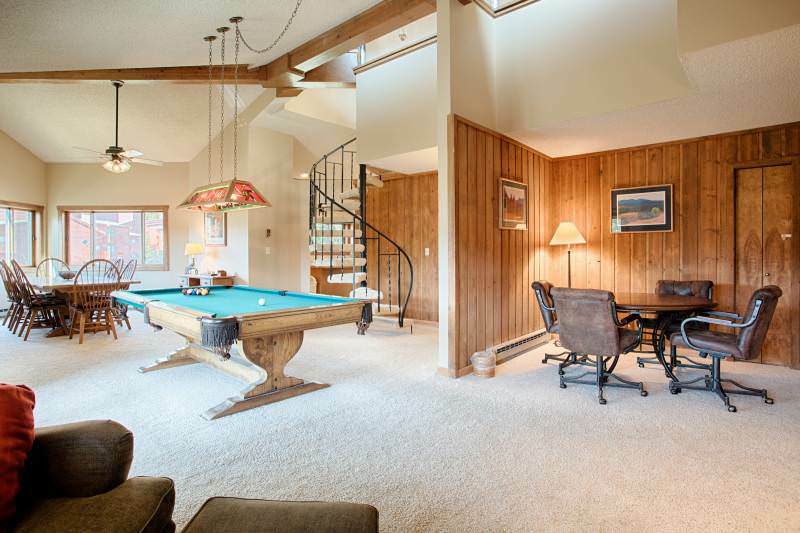 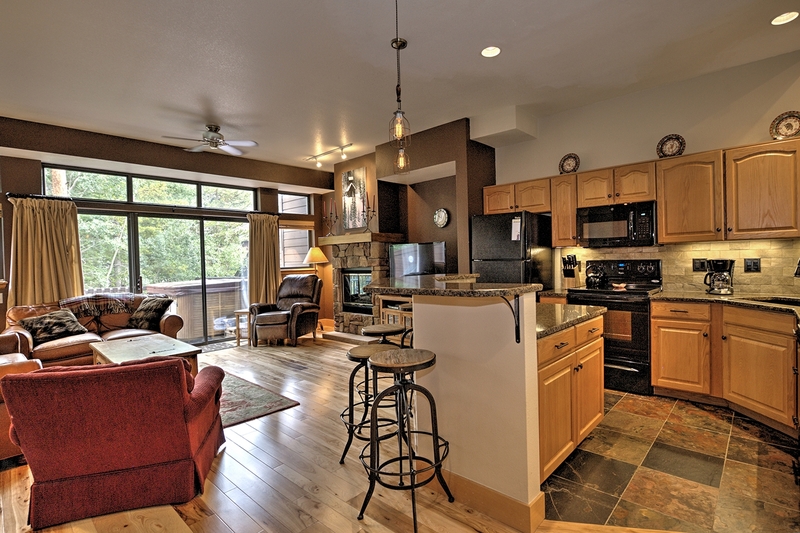 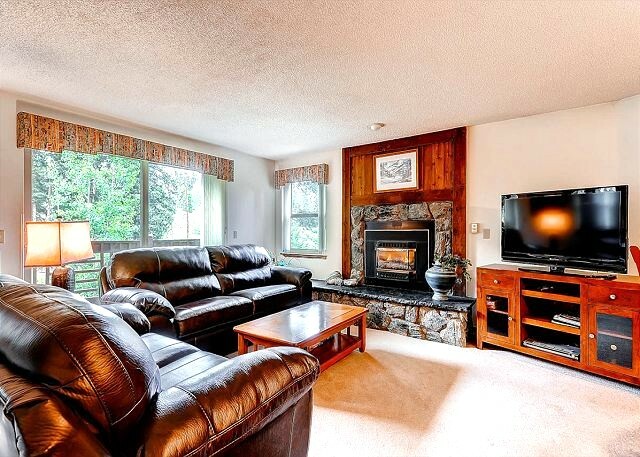 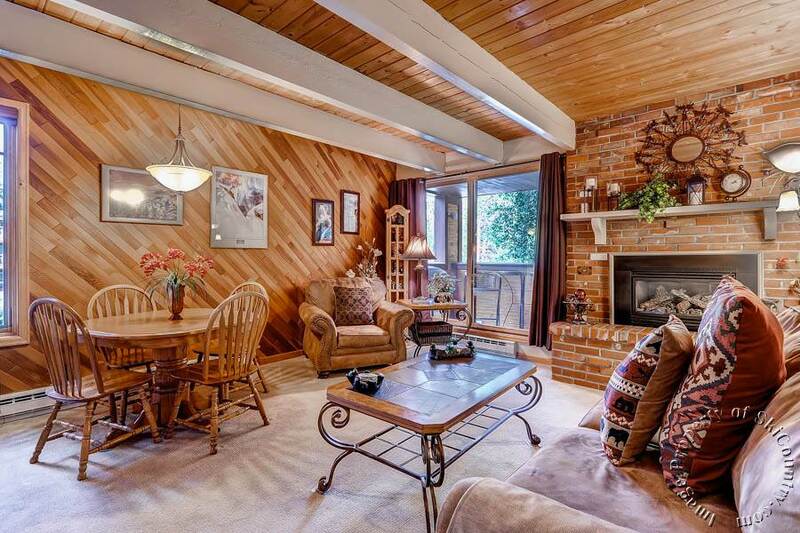 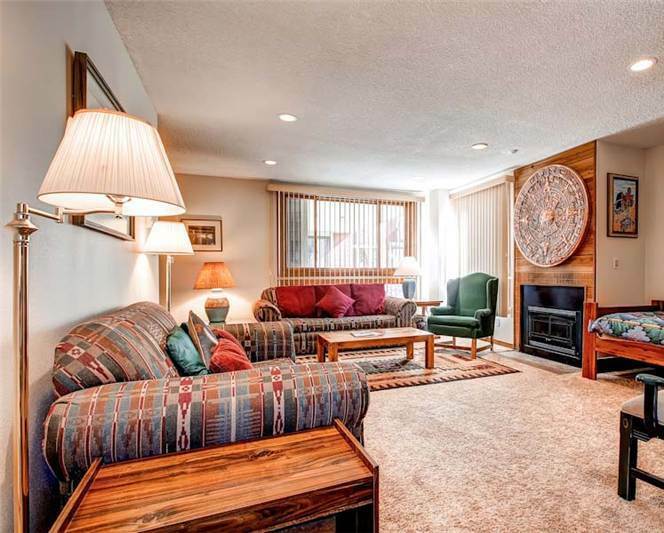 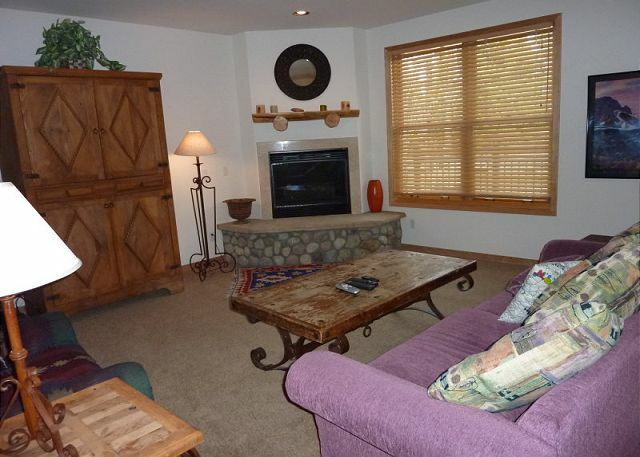 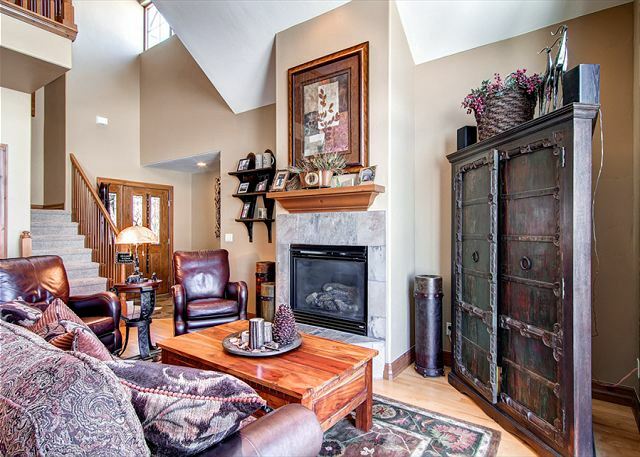 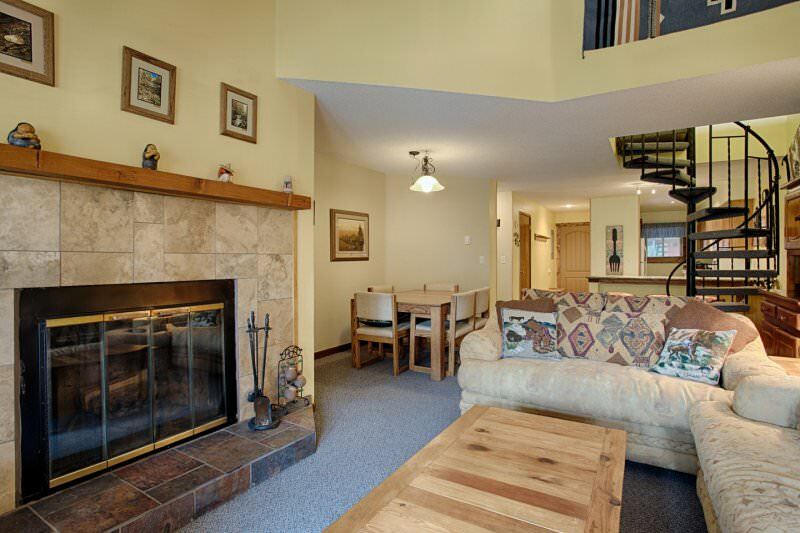 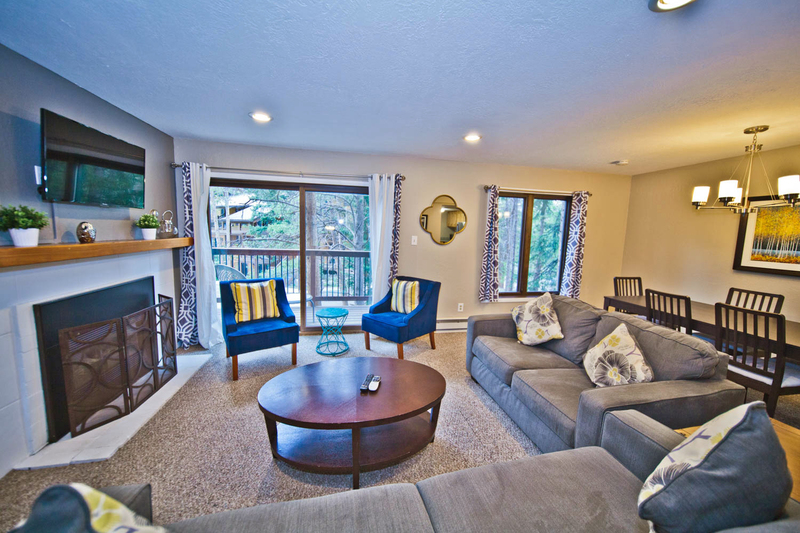 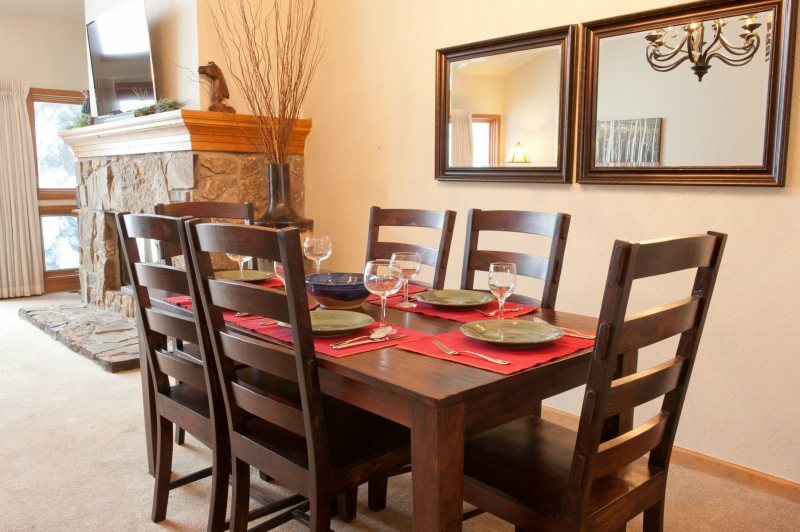 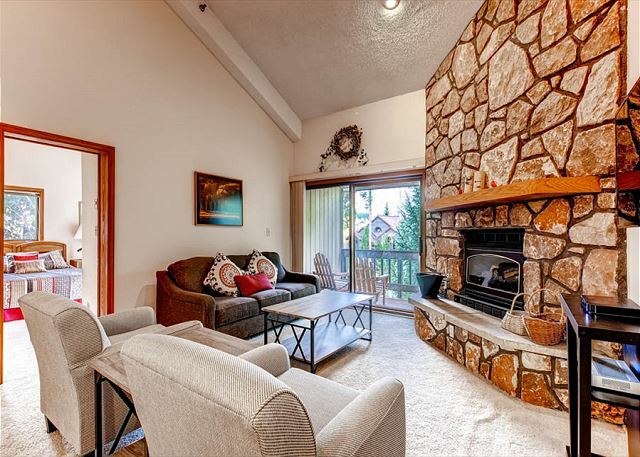 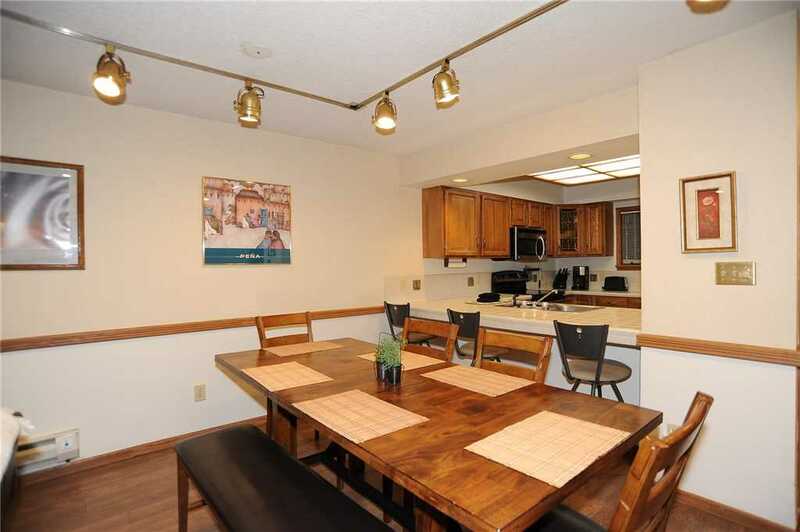 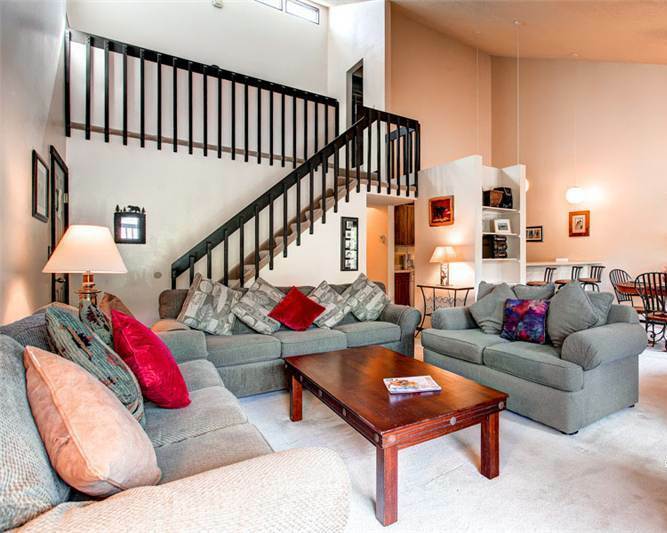 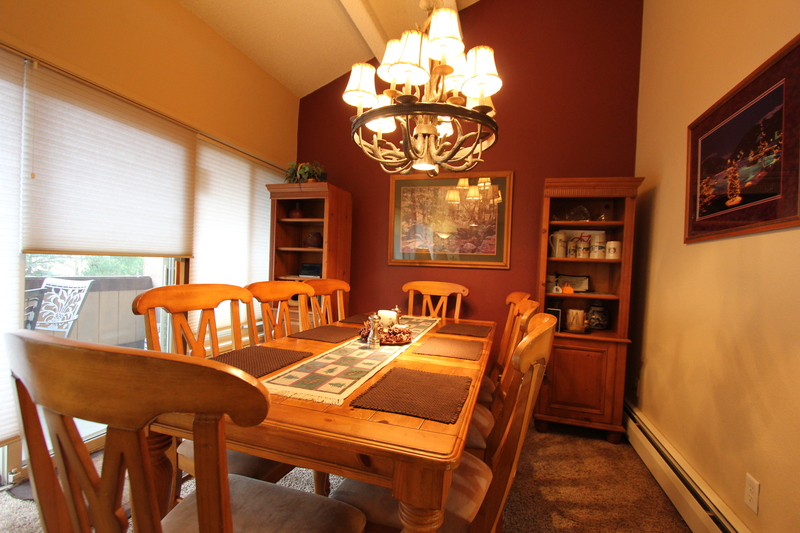 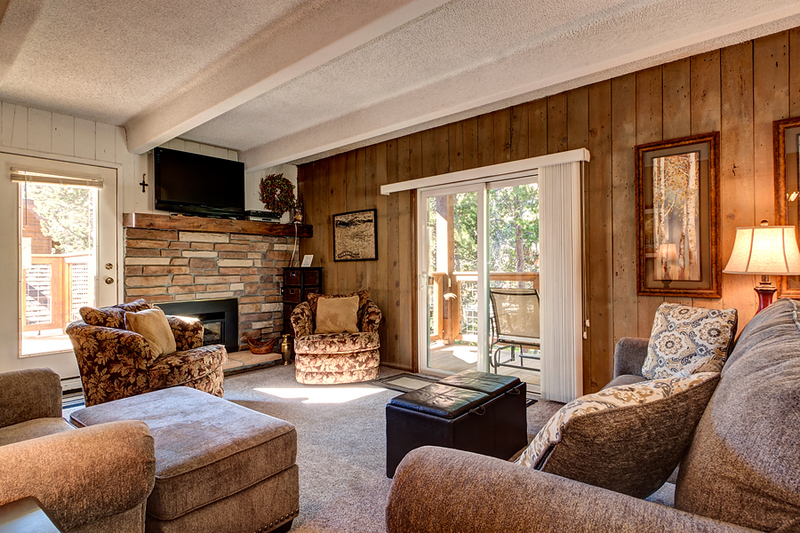 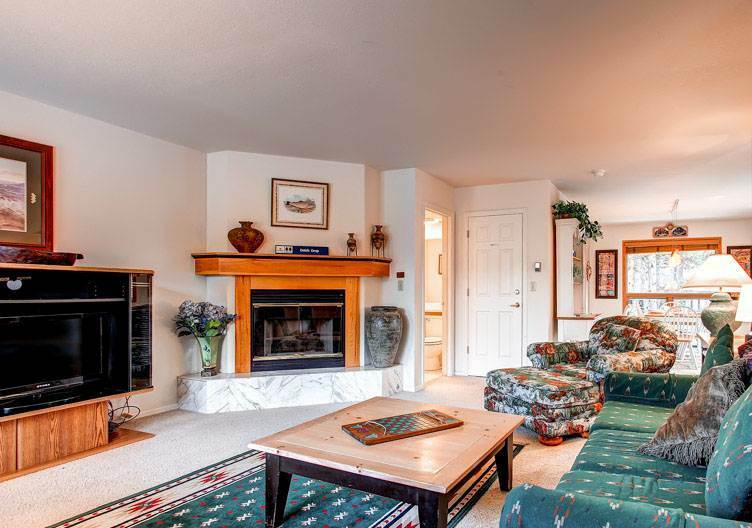 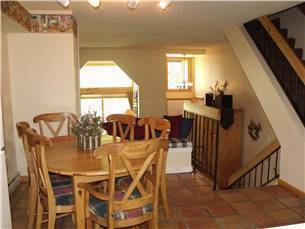 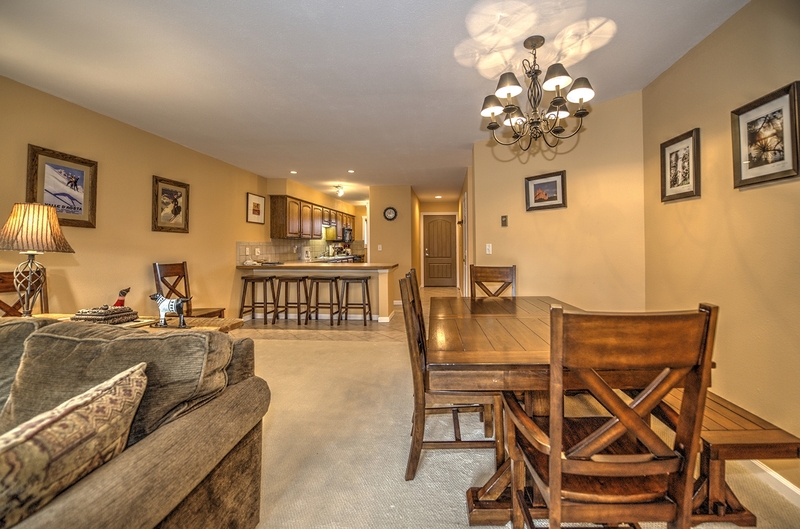 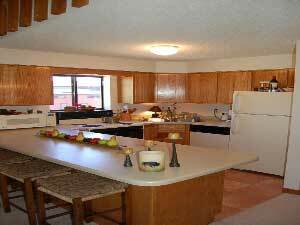 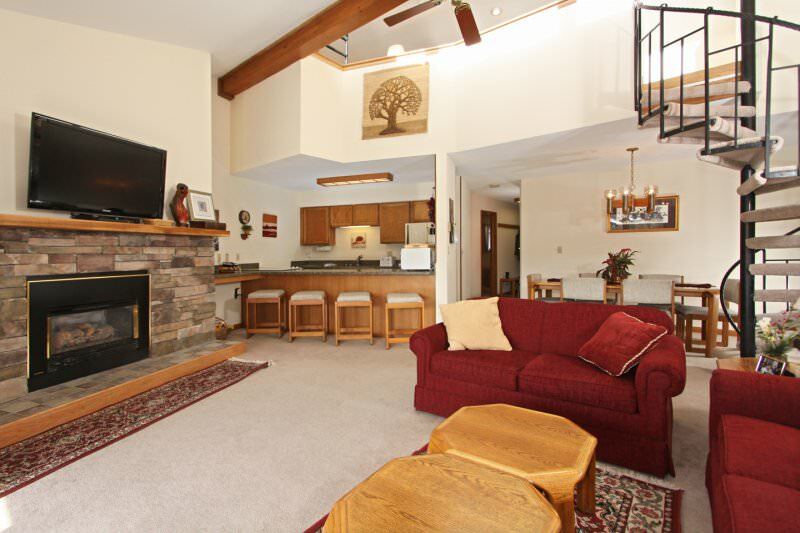 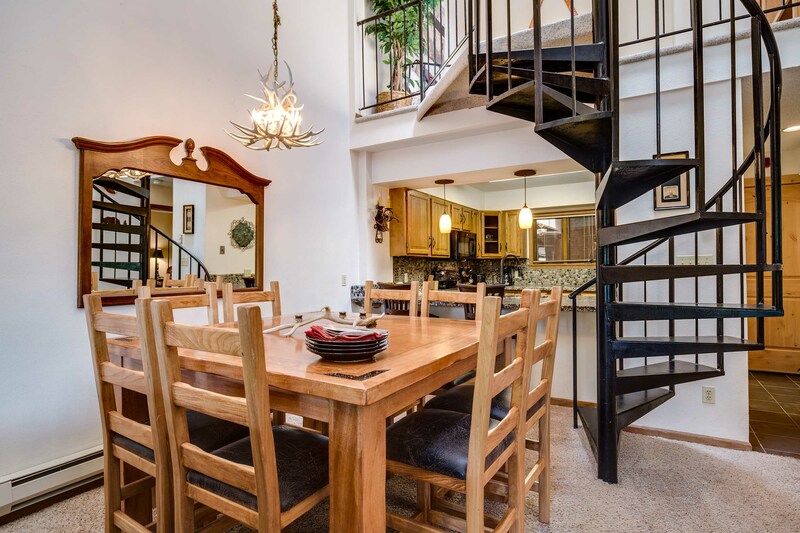 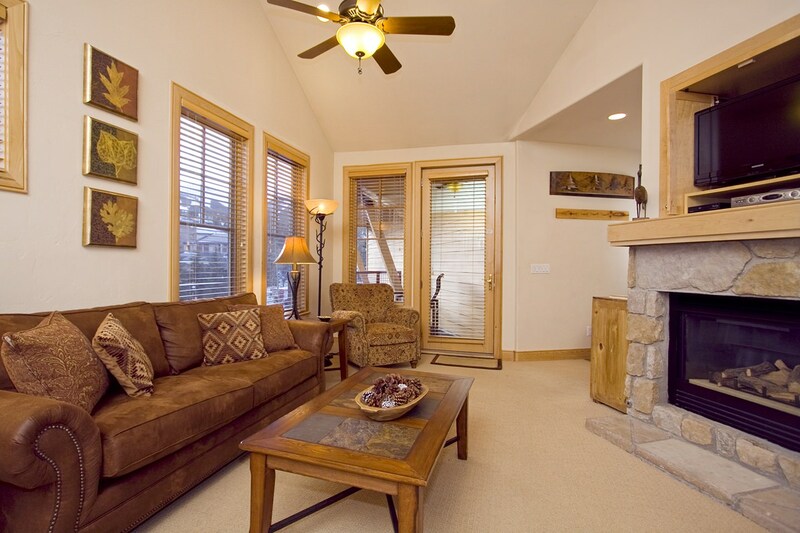 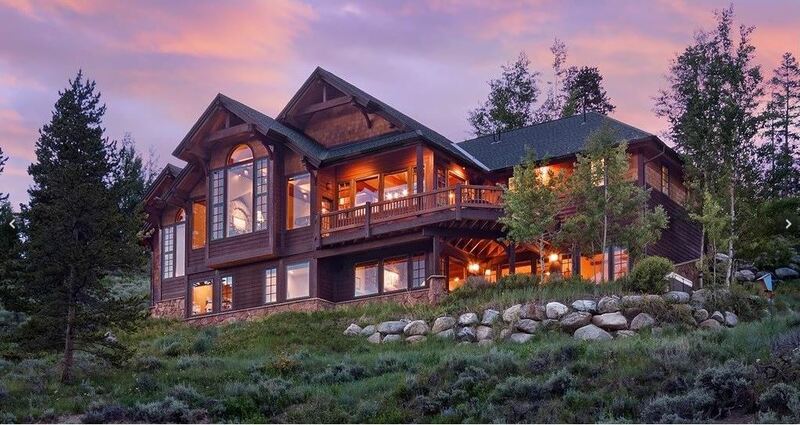 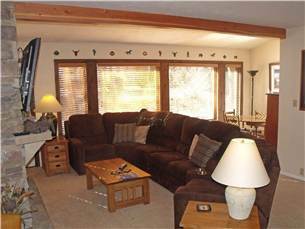 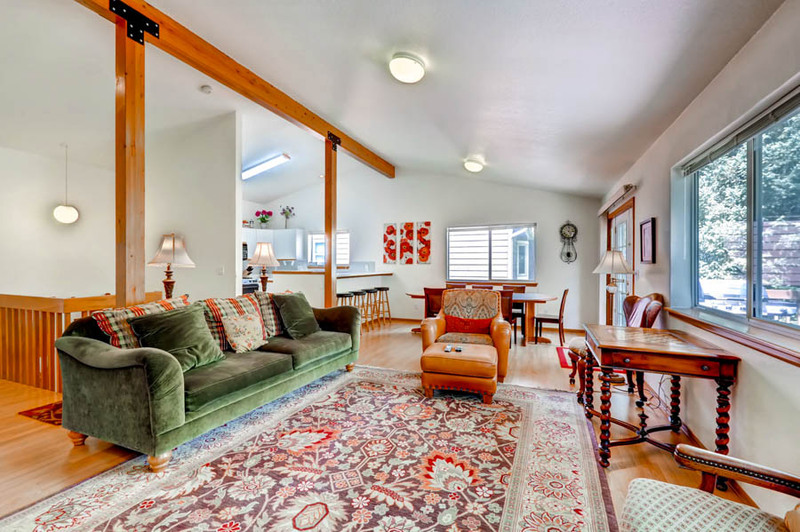 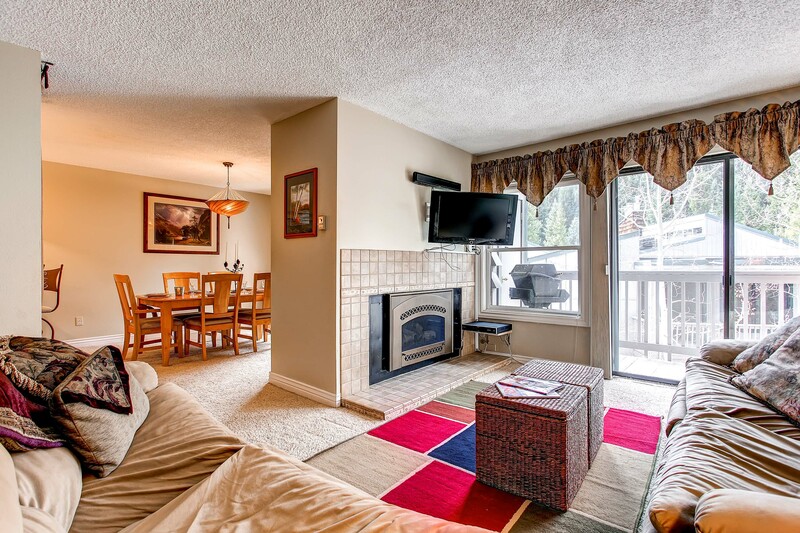 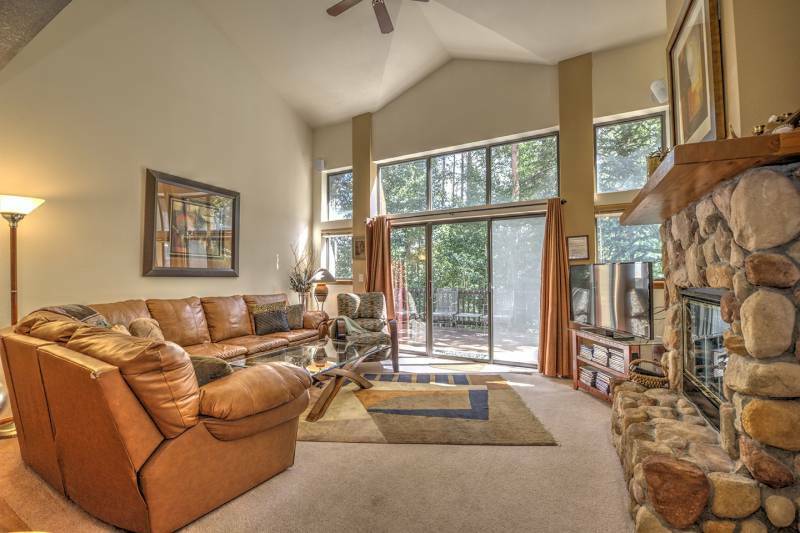 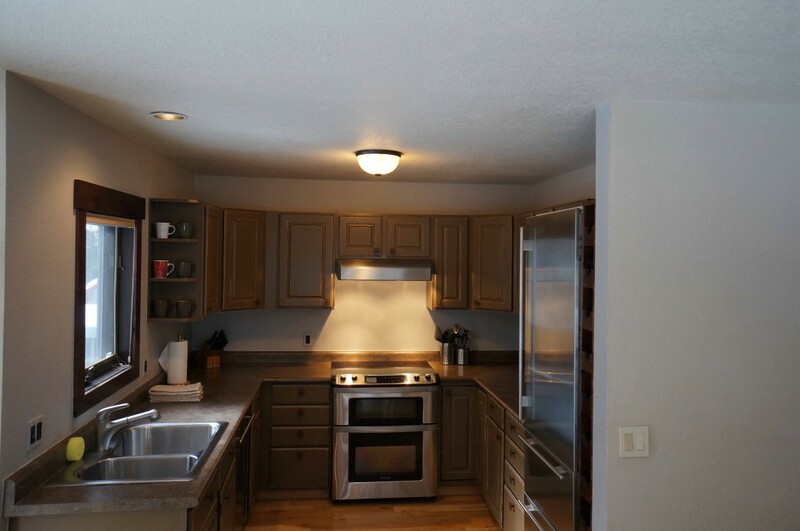 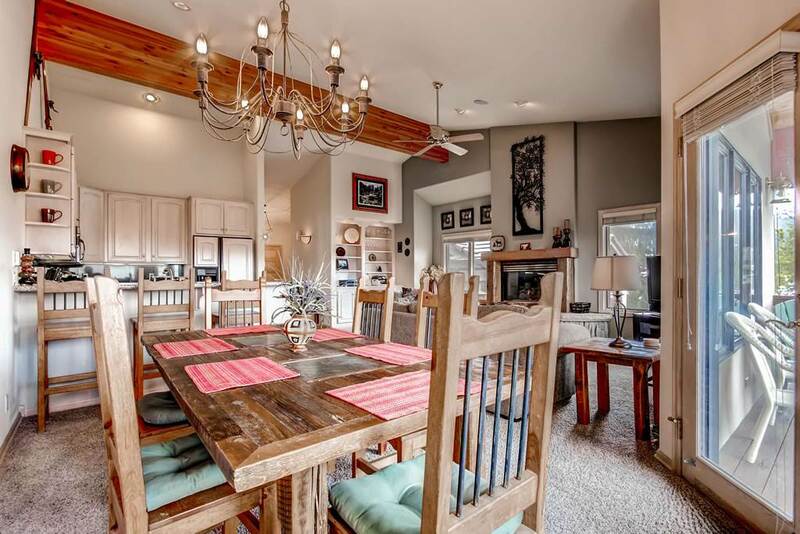 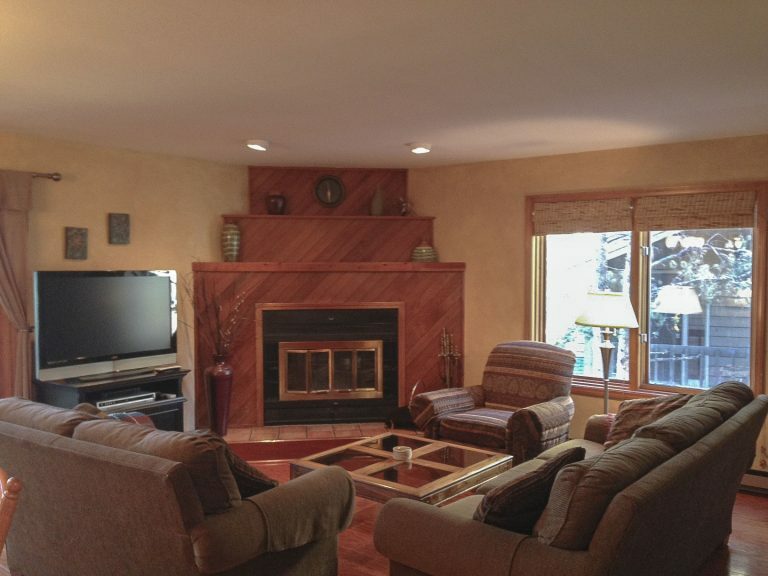 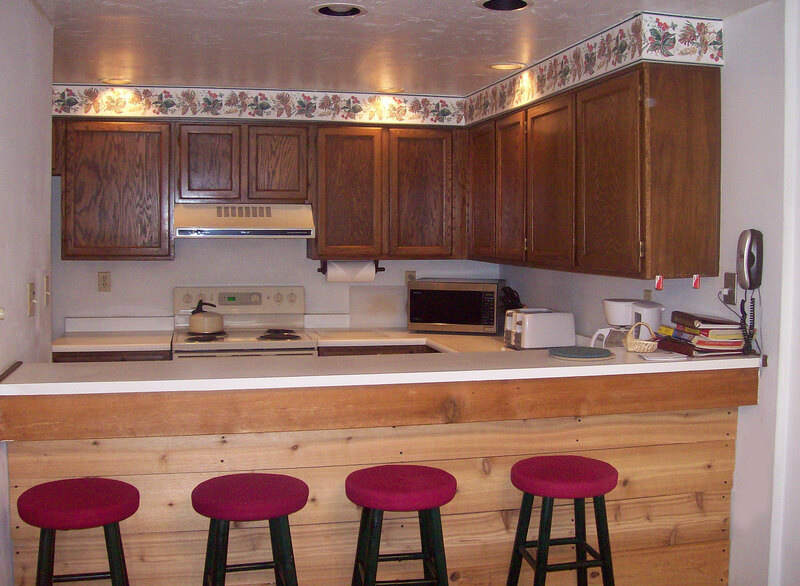 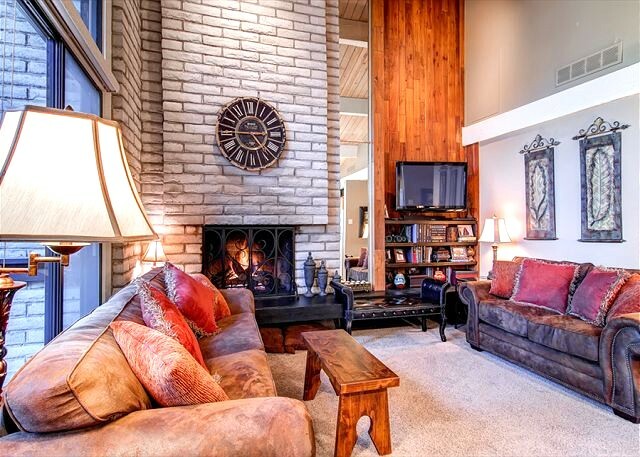 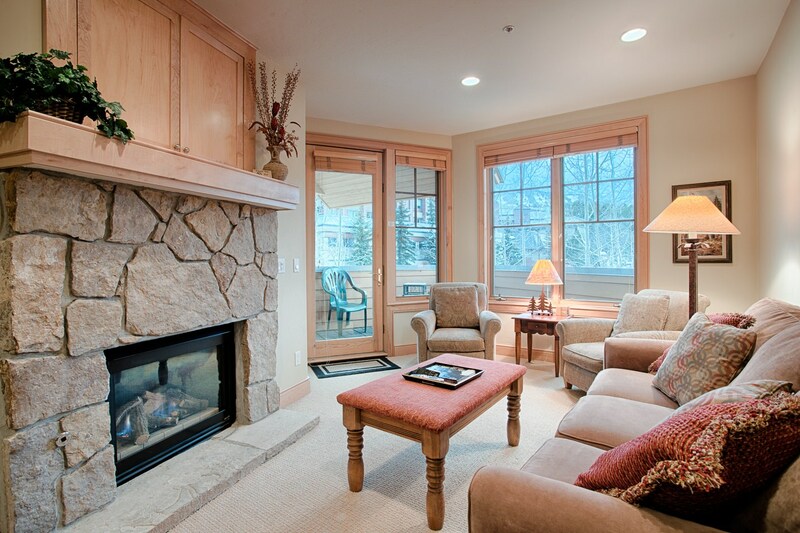 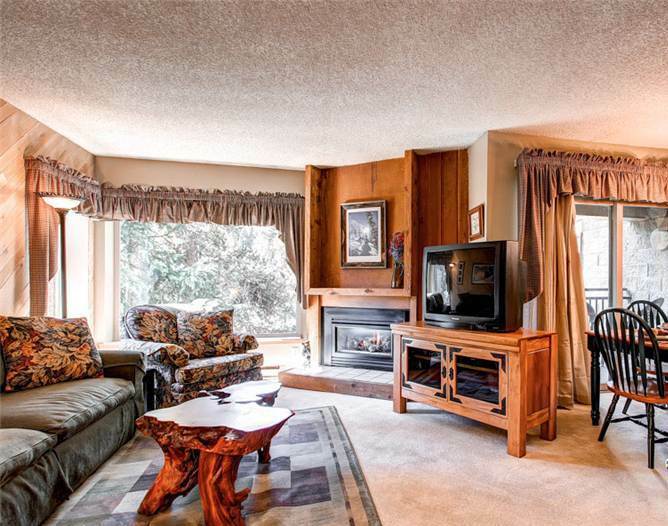 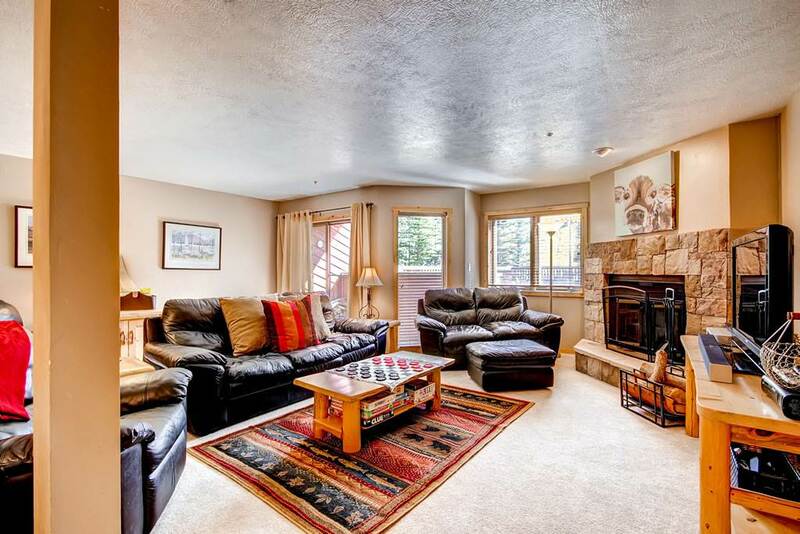 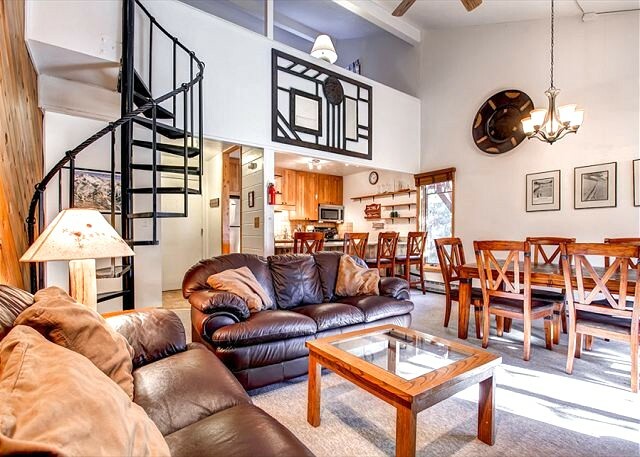 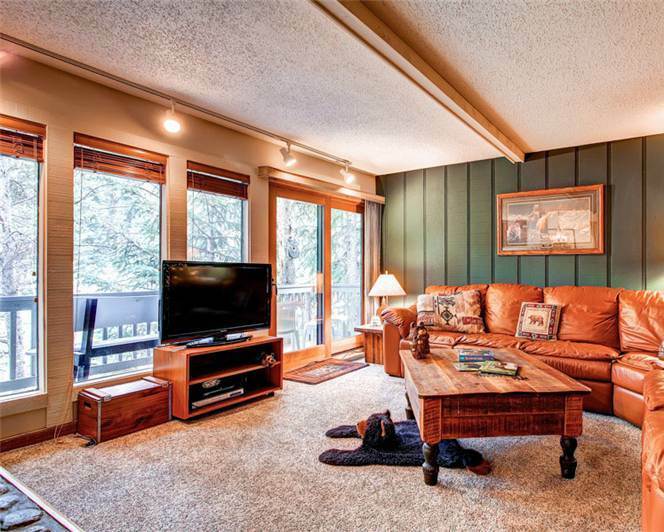 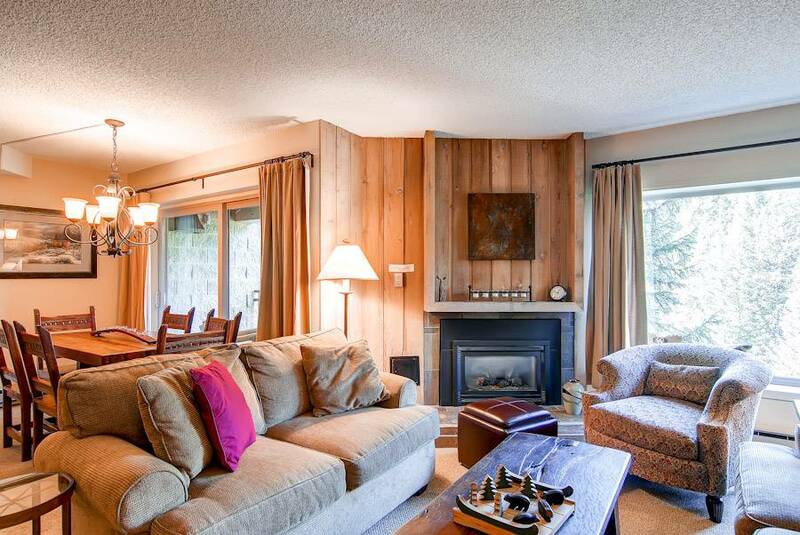 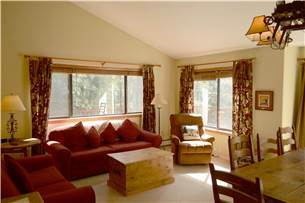 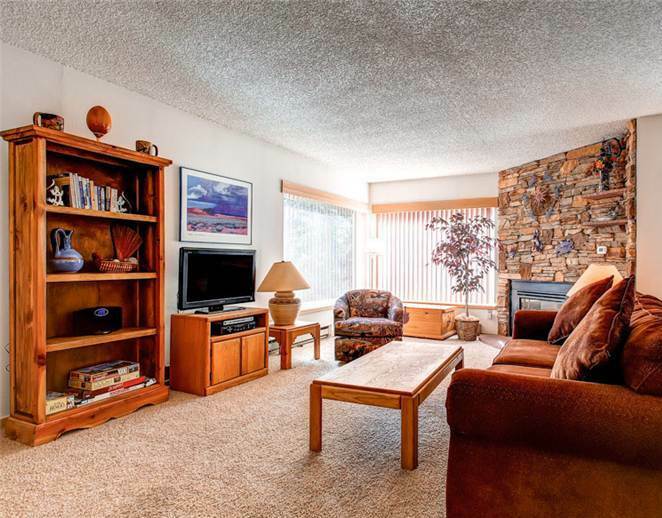 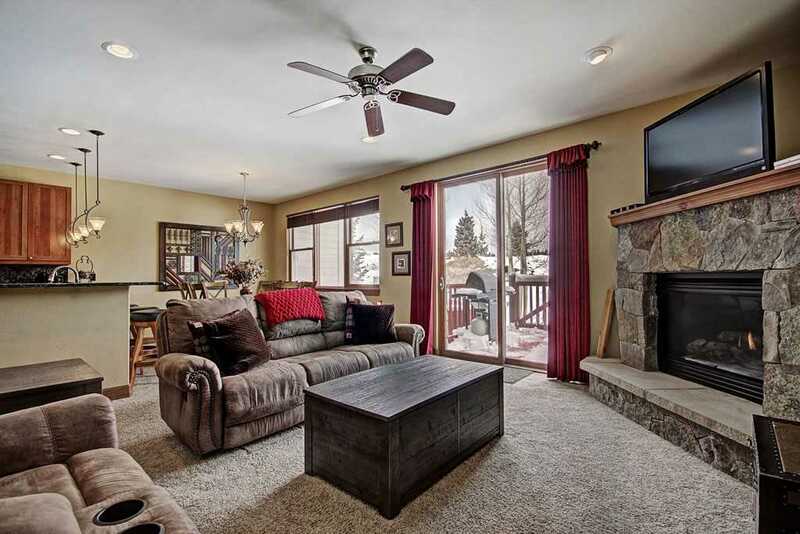 Just outside, you’ll love the large, sunny deck with a gas grill and private hot tub. 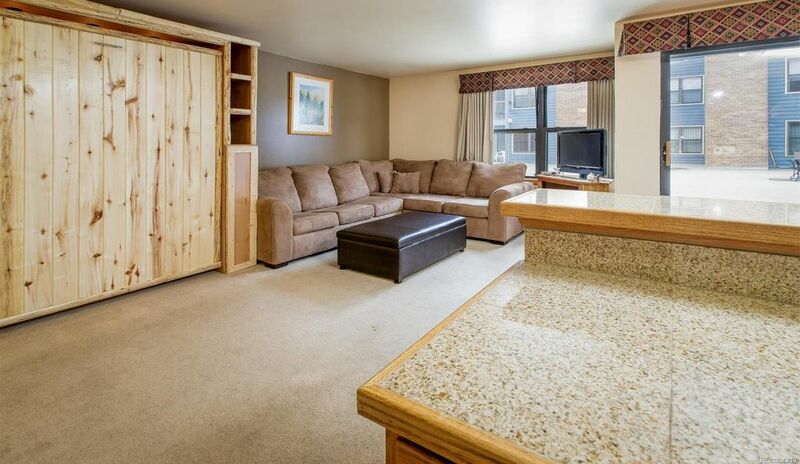 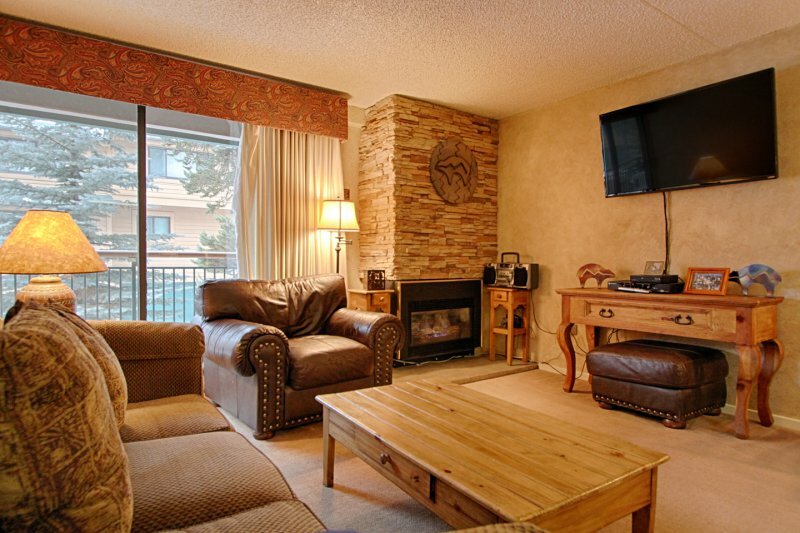 Yes, the TV is visible from the Jacuzzi, so enjoy the game while also recuperating tired and sore bones. 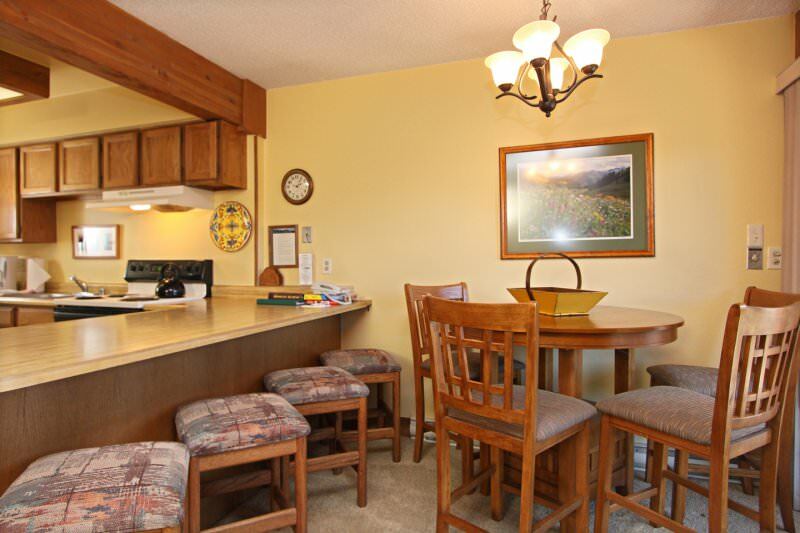 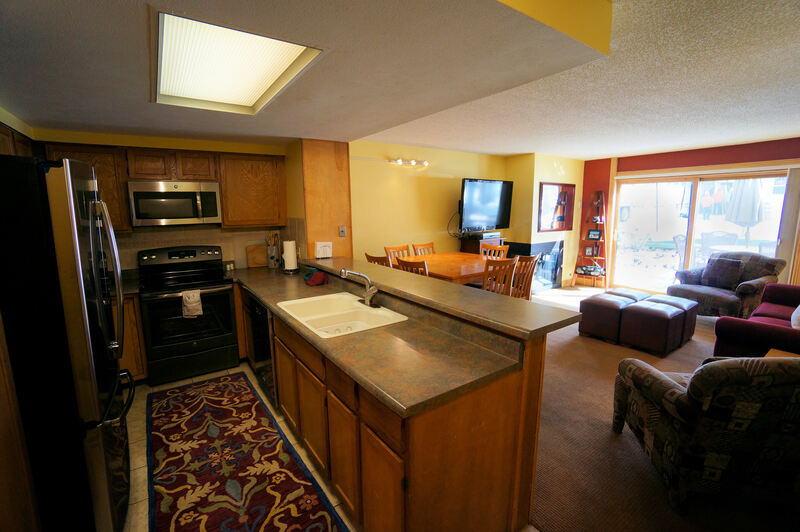 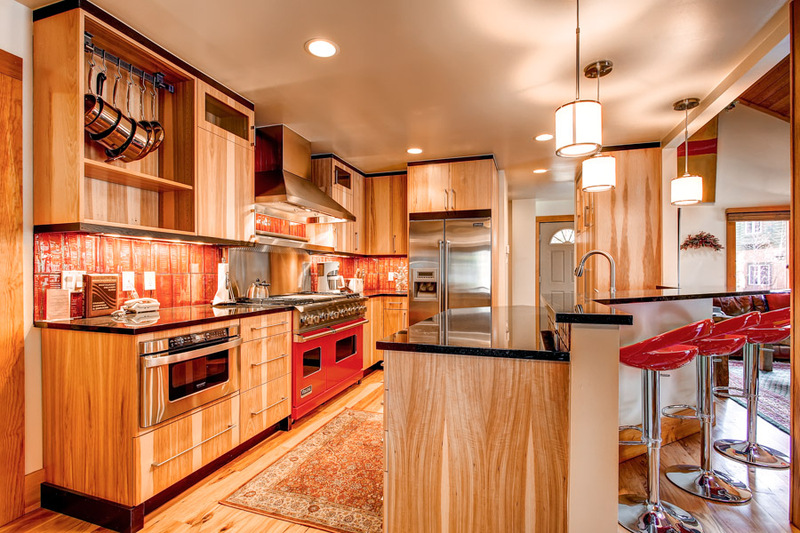 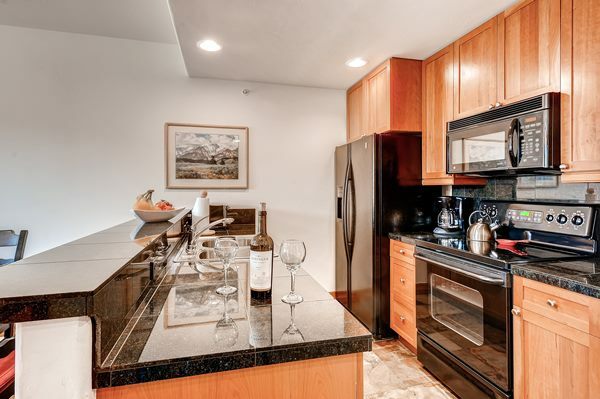 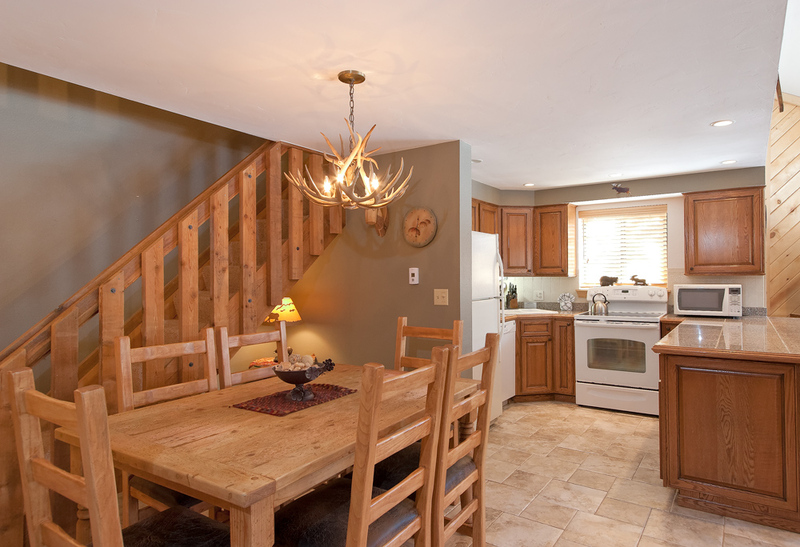 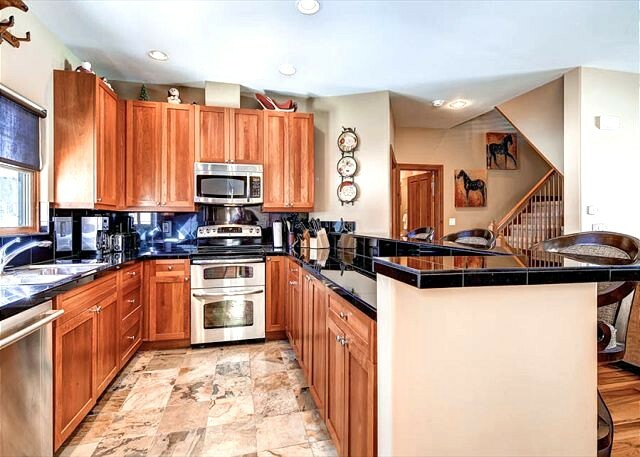 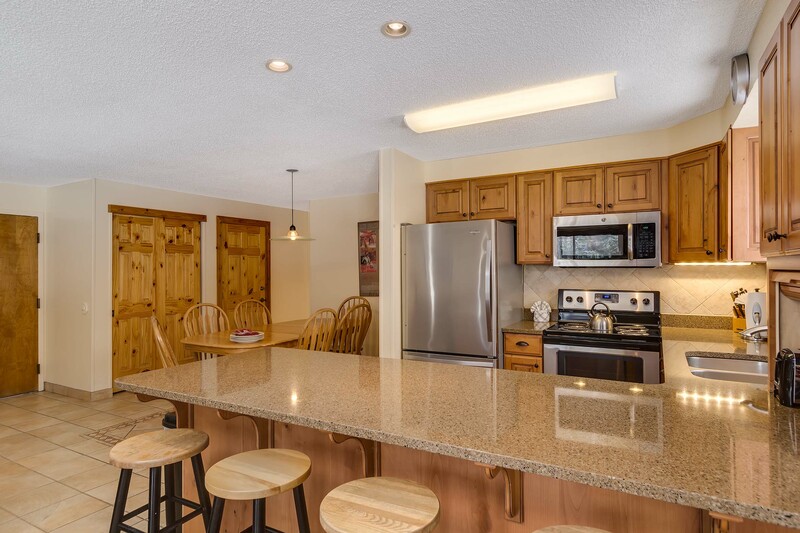 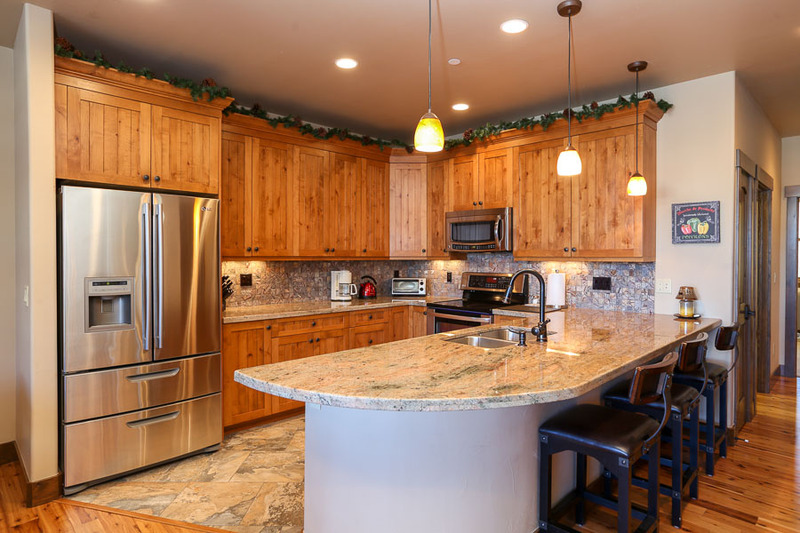 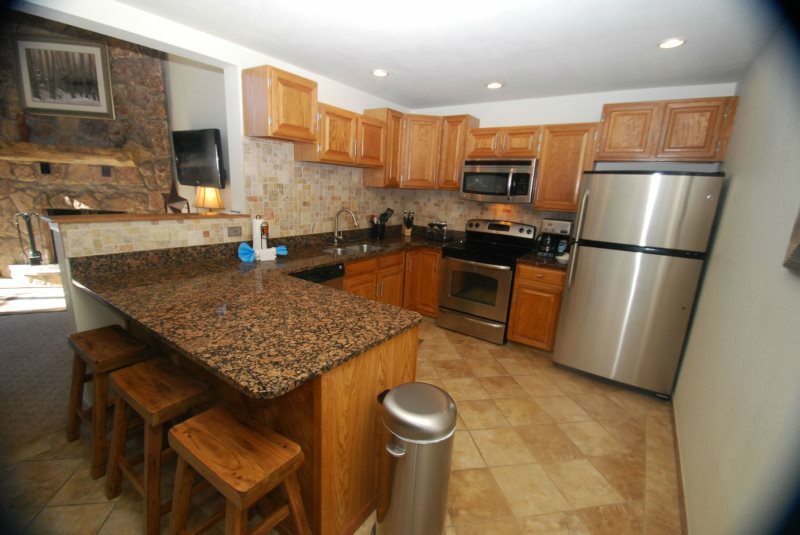 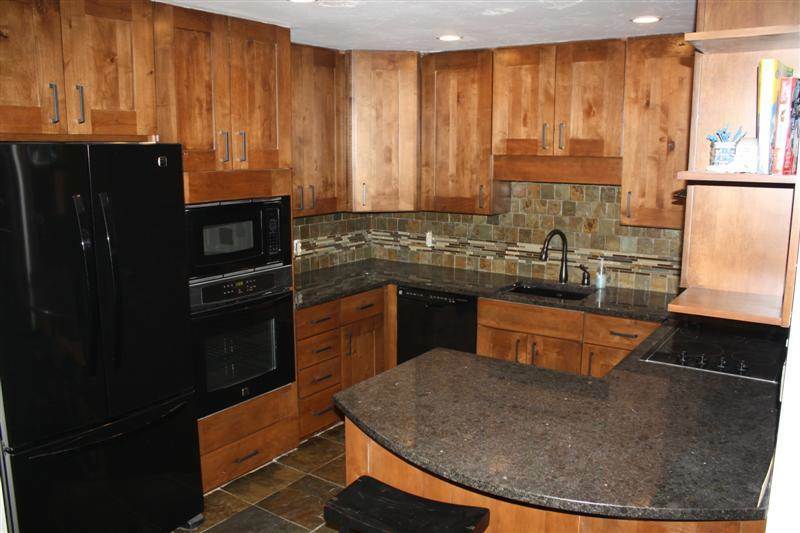 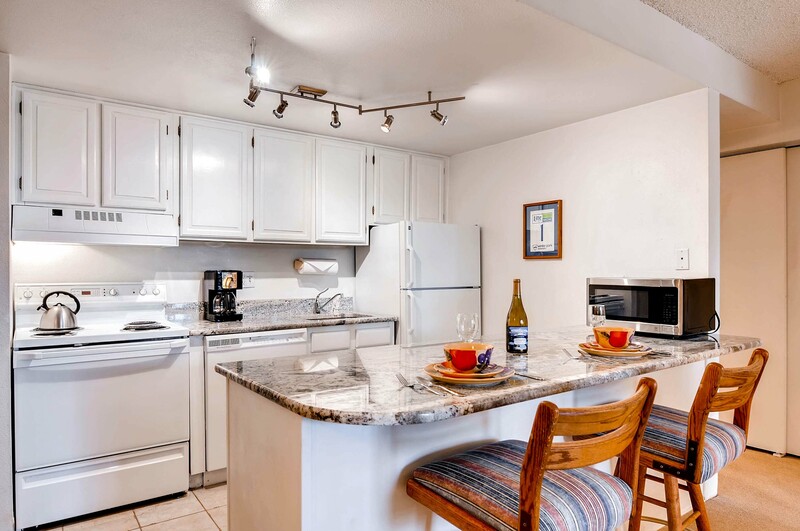 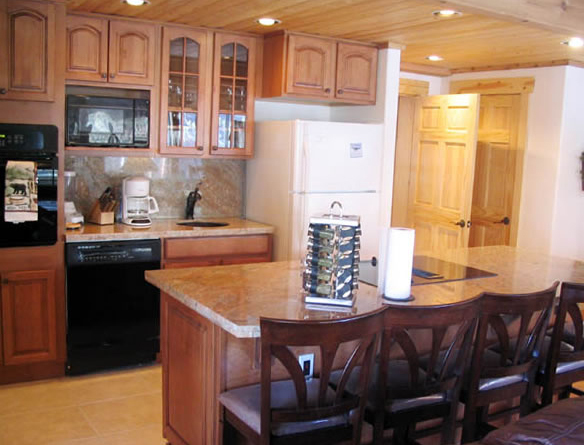 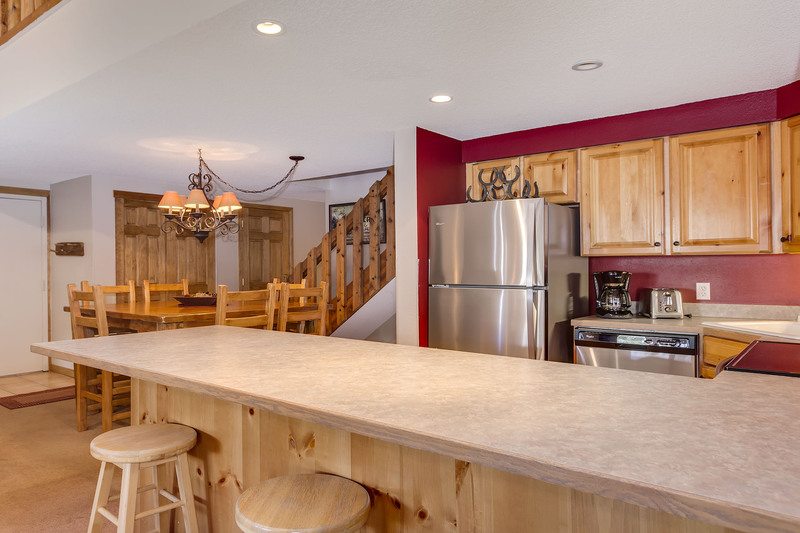 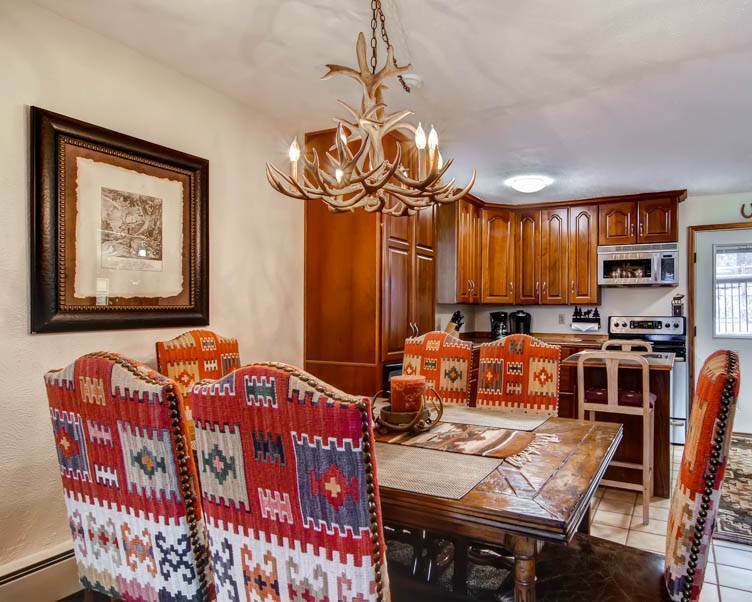 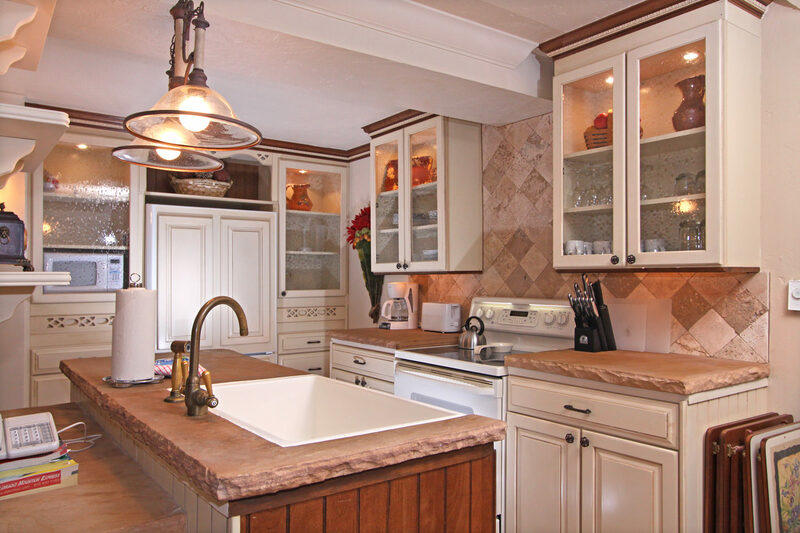 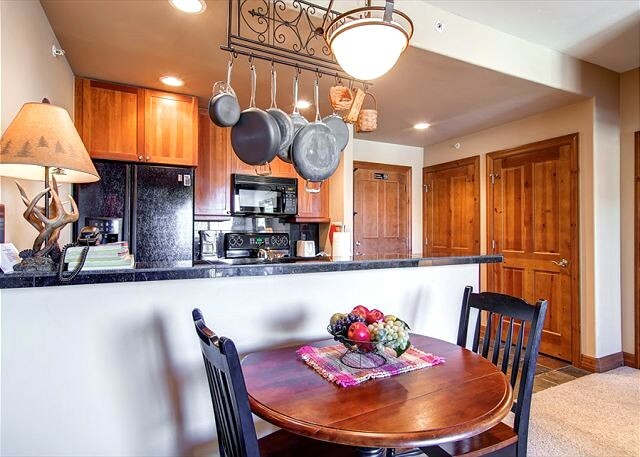 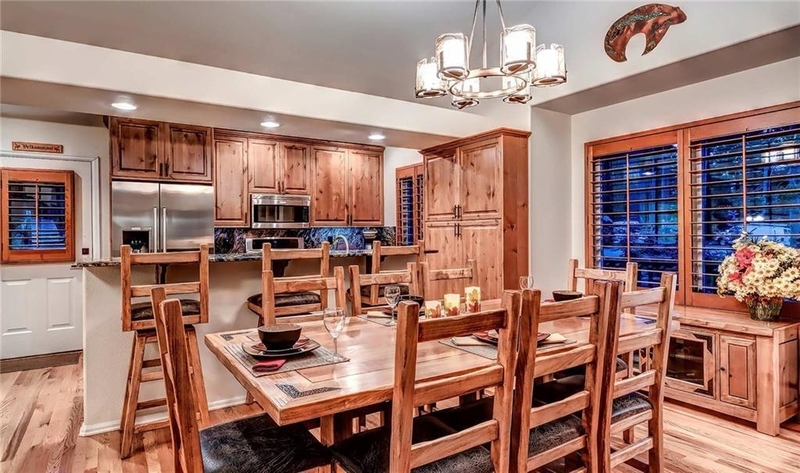 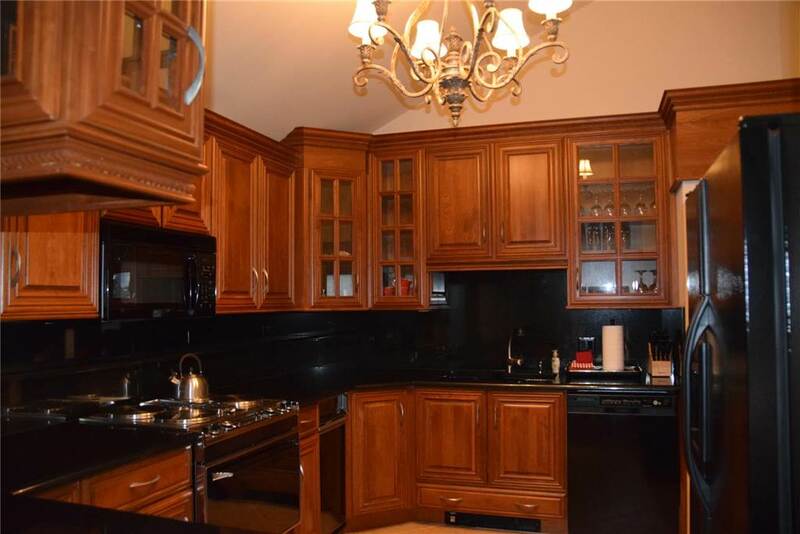 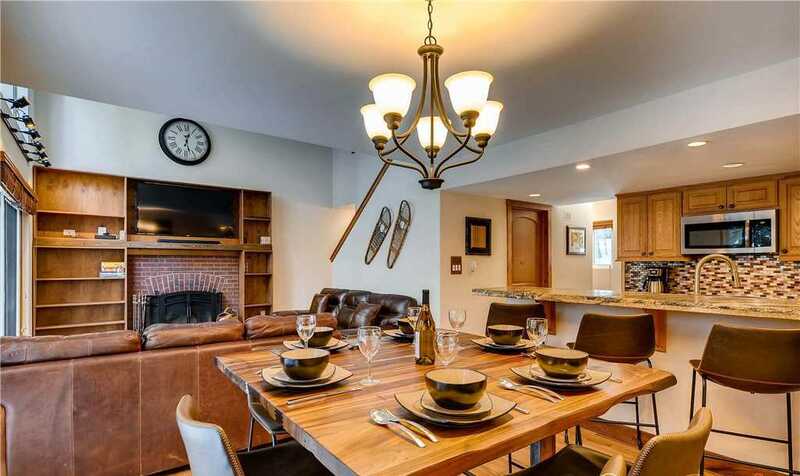 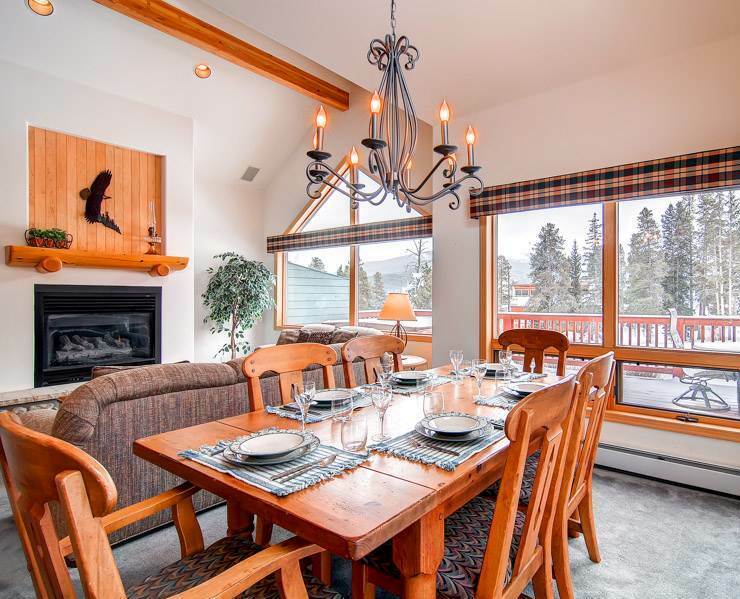 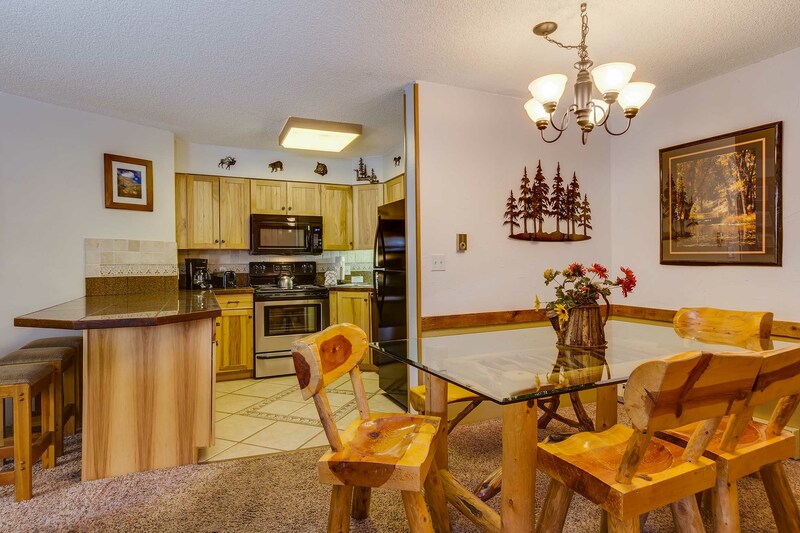 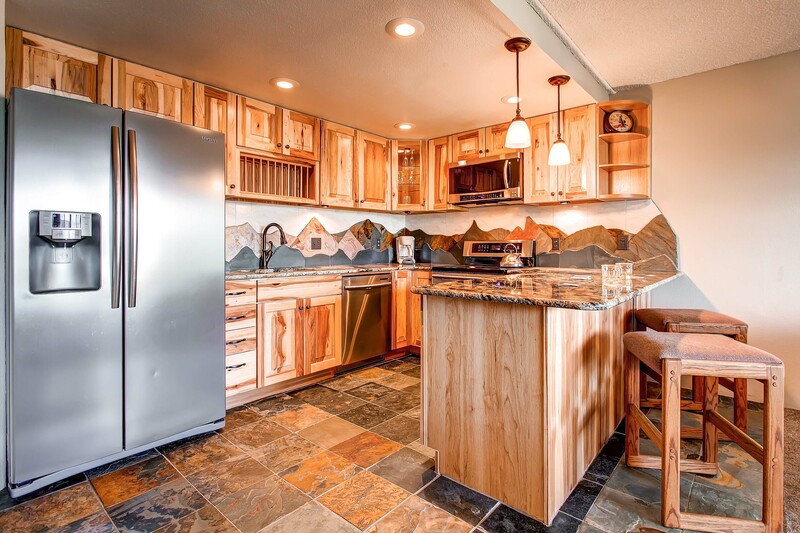 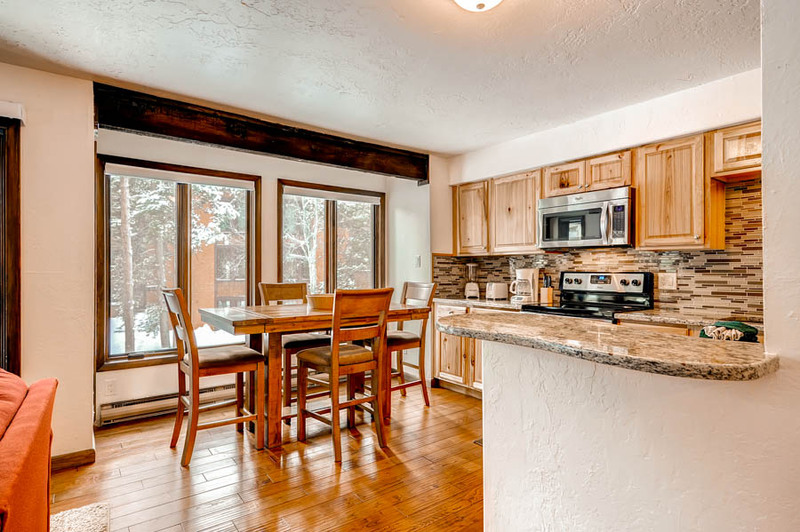 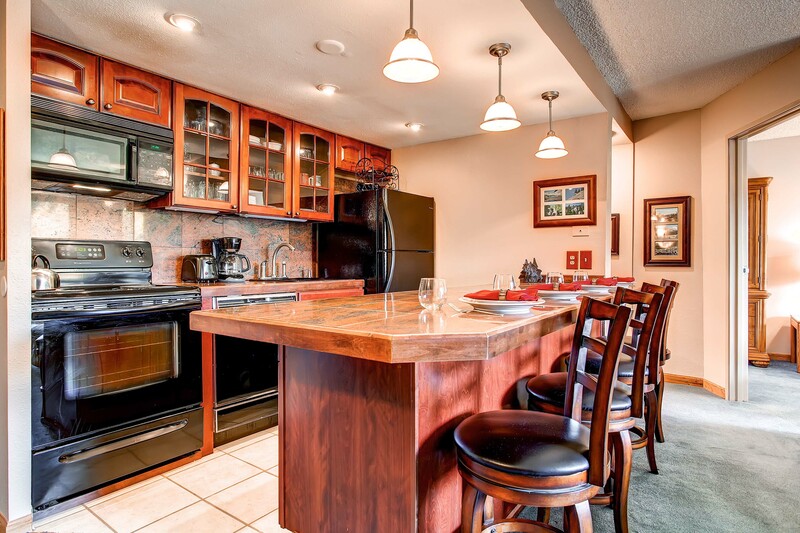 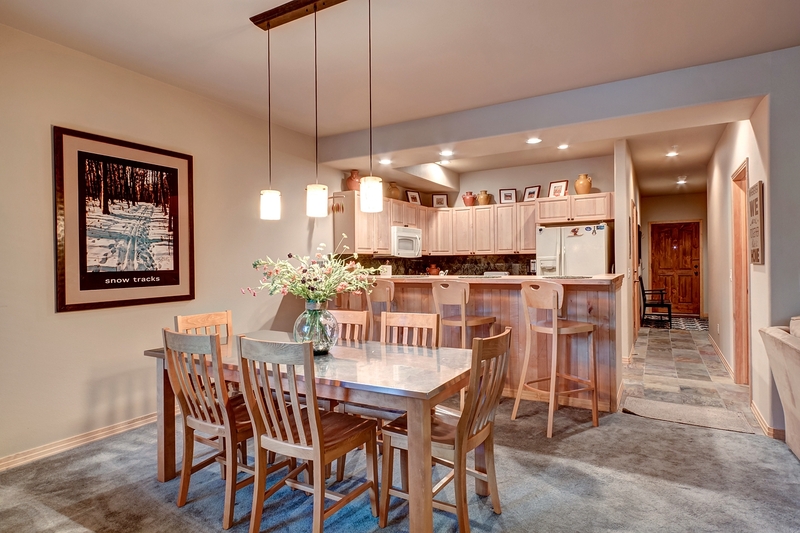 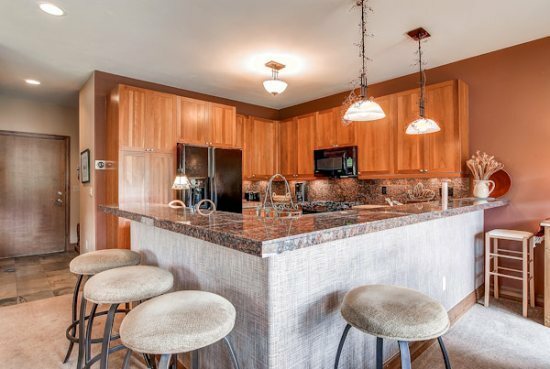 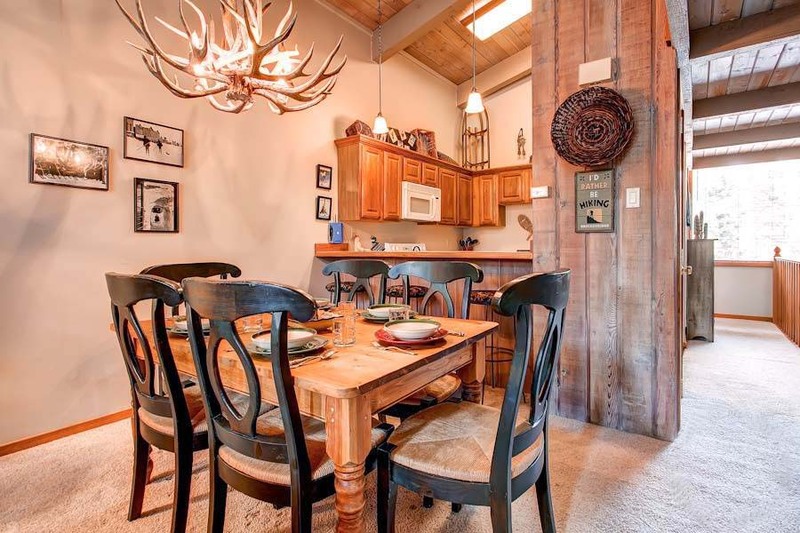 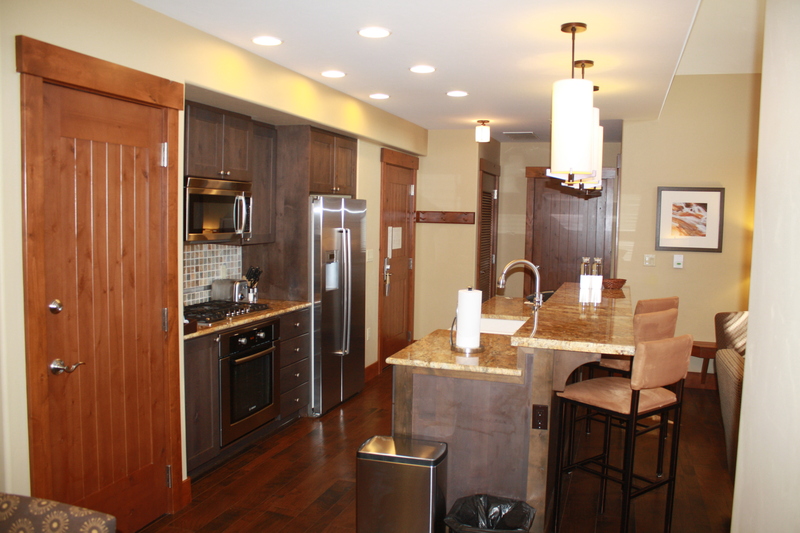 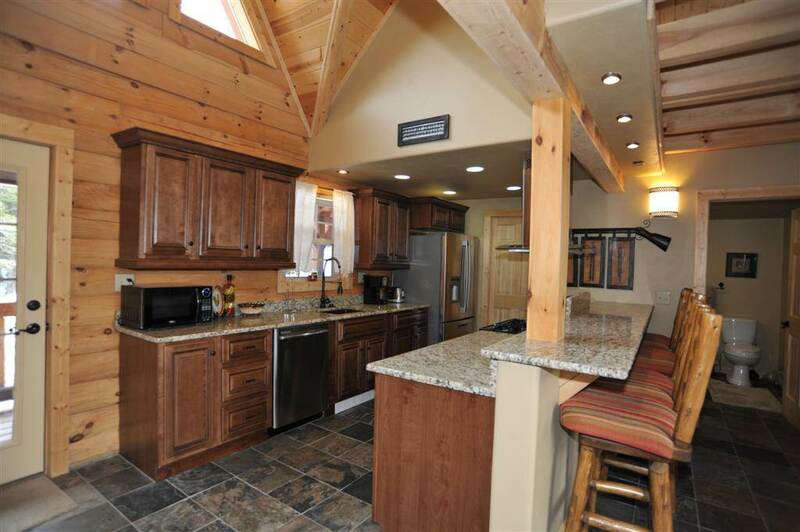 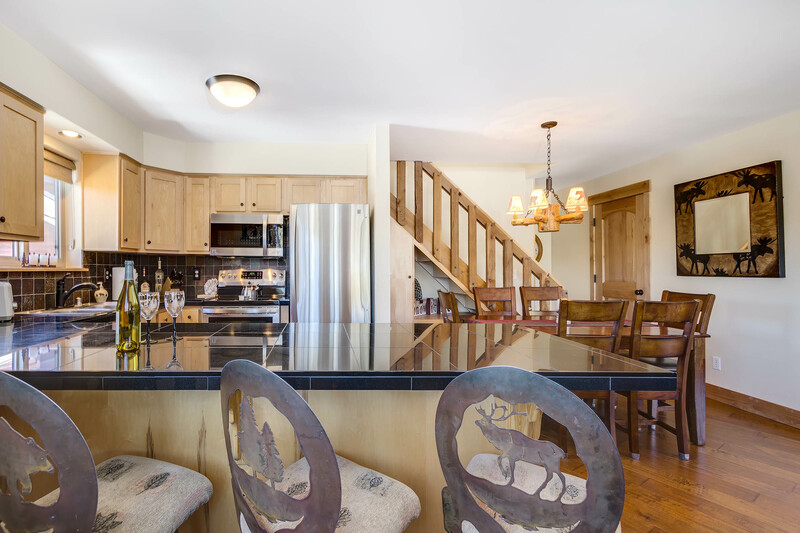 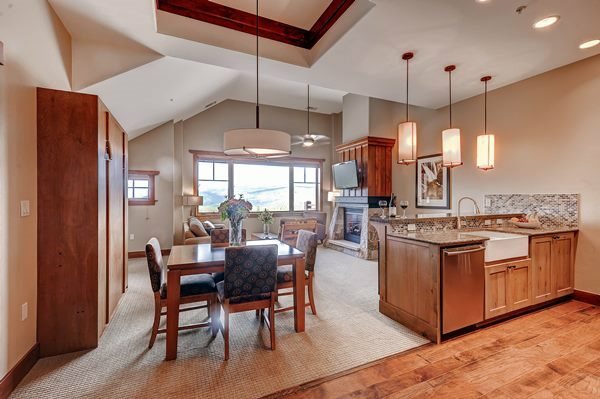 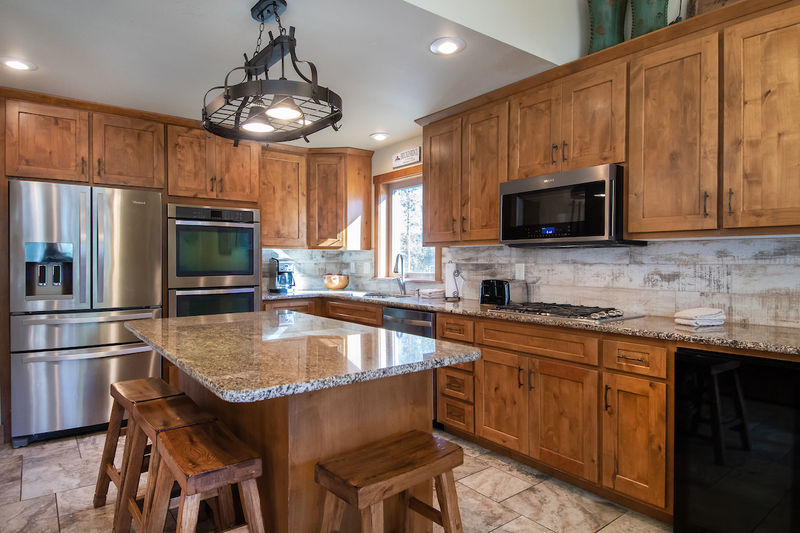 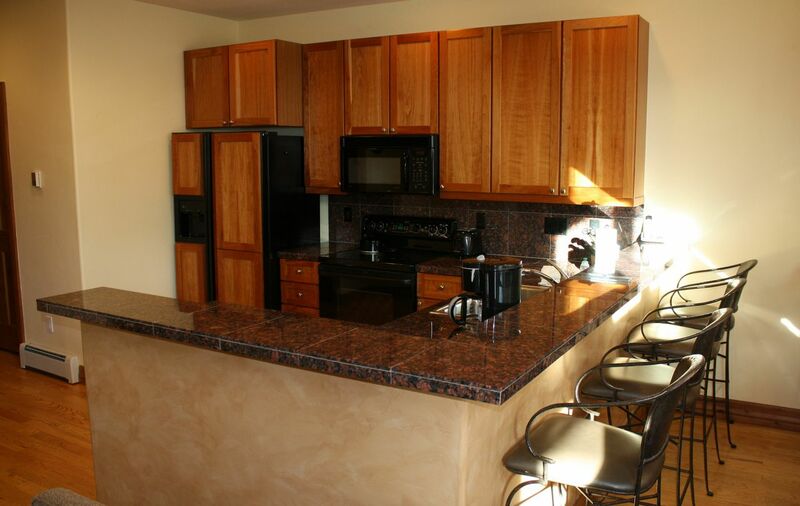 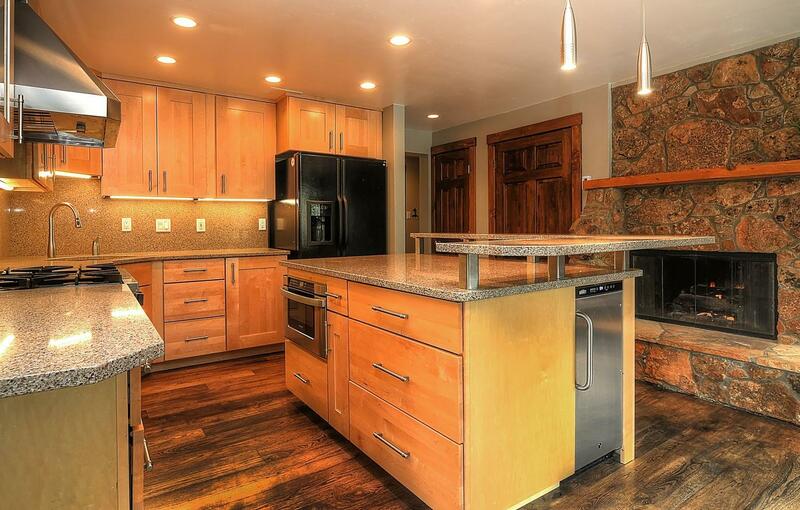 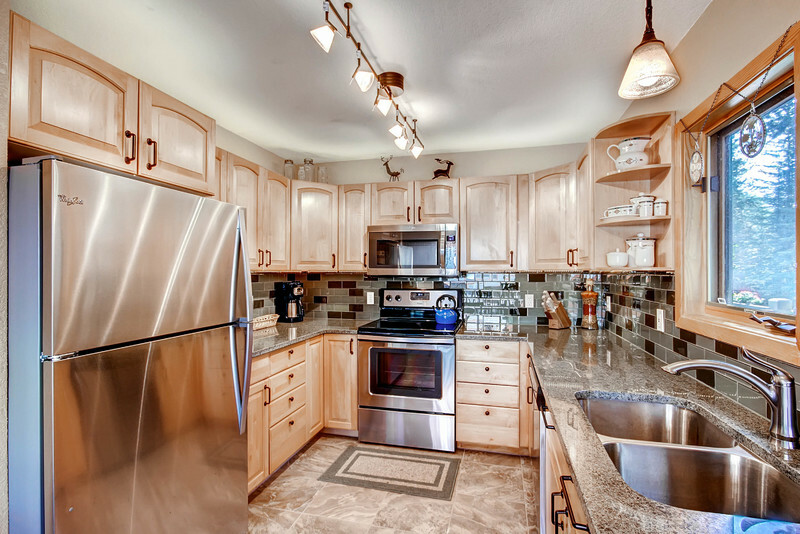 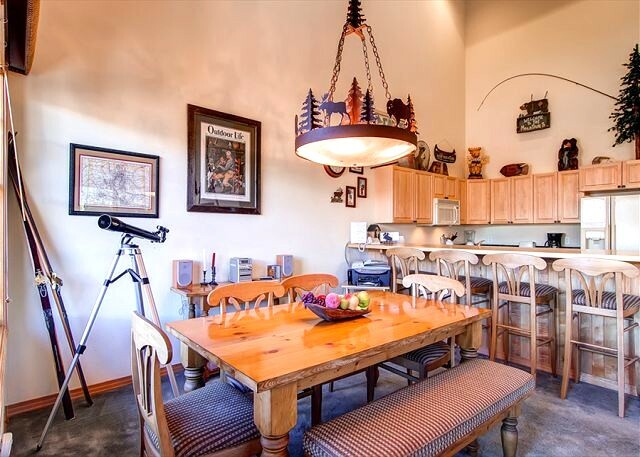 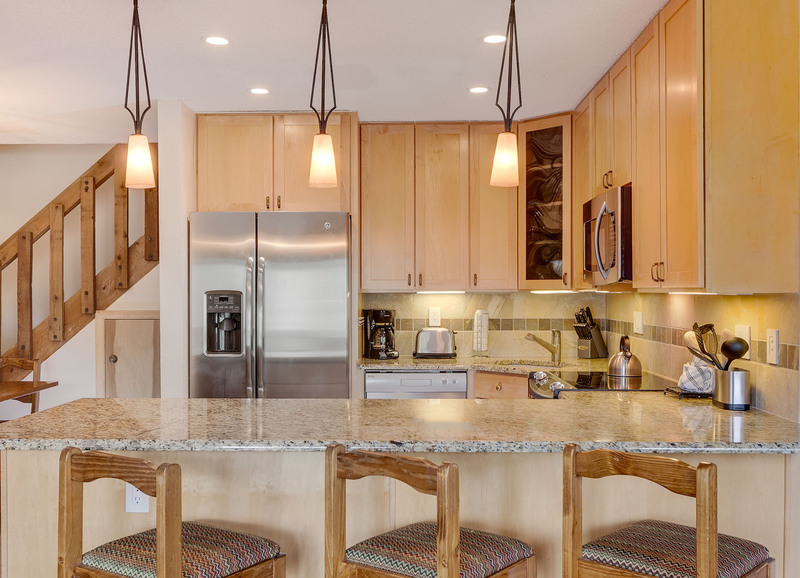 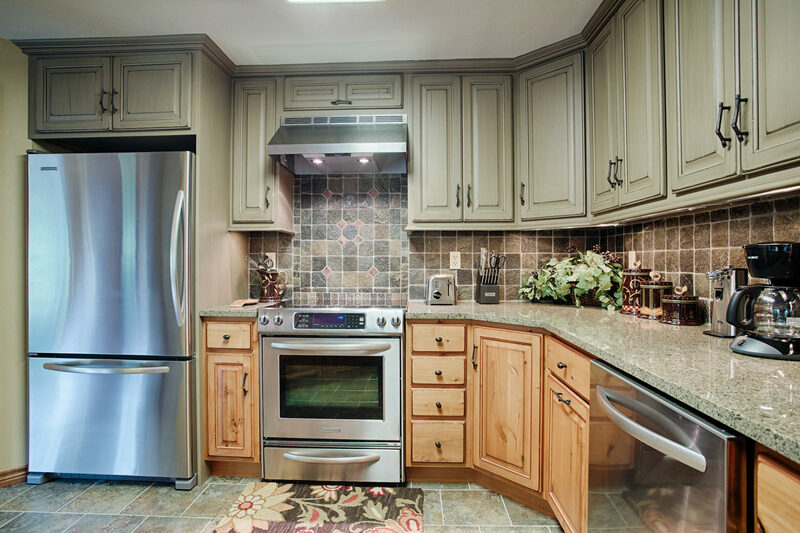 The kitchen is fully equipped for whipping up everything from après-ski snacks to holiday meals your family will remember for years. 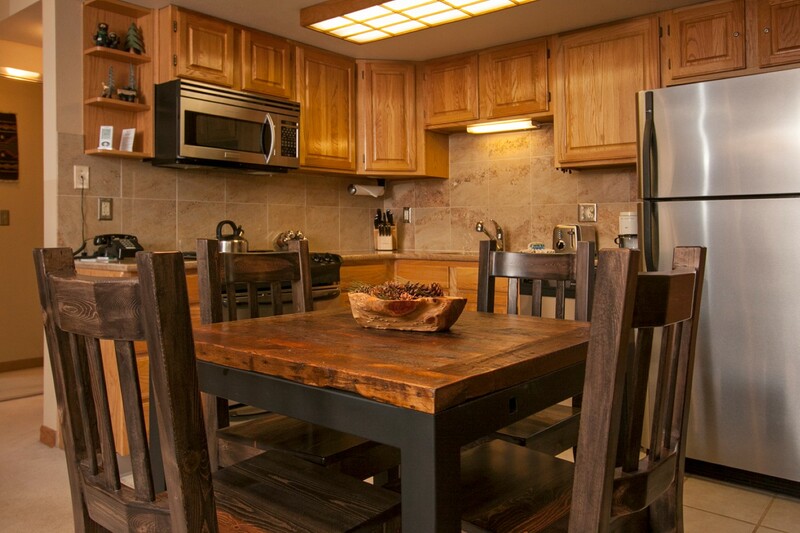 The rustic farm table seats 10, but don’t forget the other four stools at the kitchen bar! 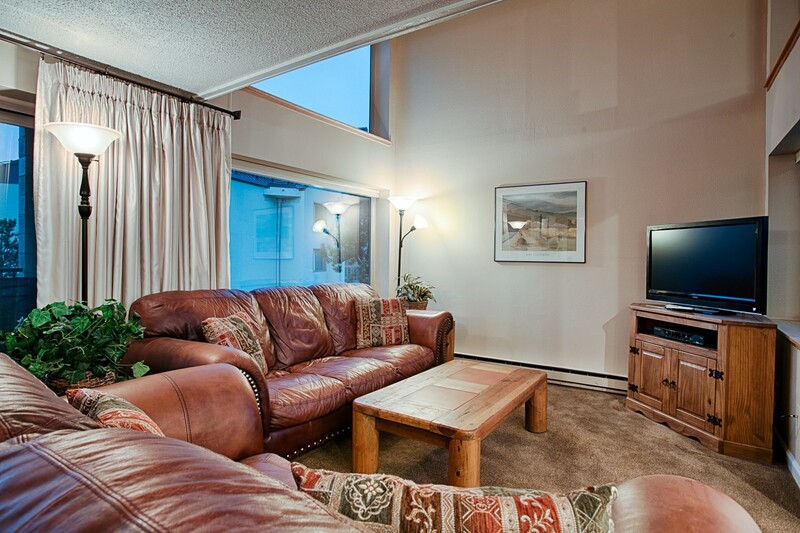 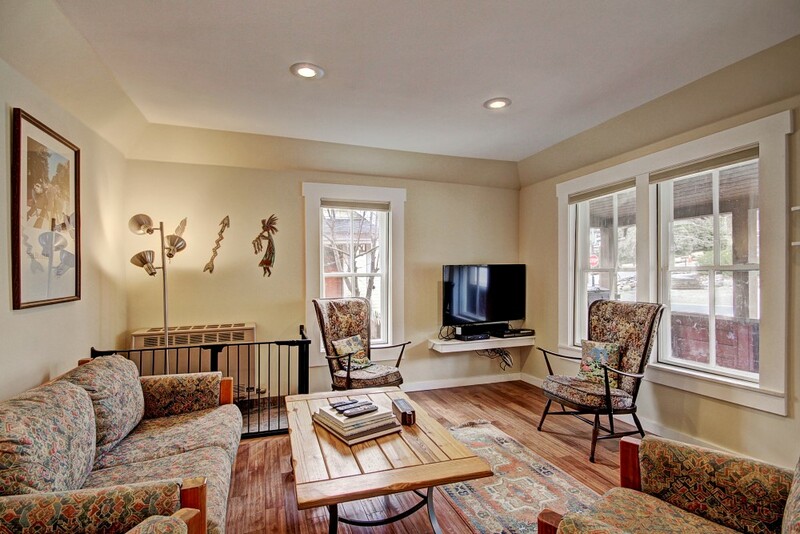 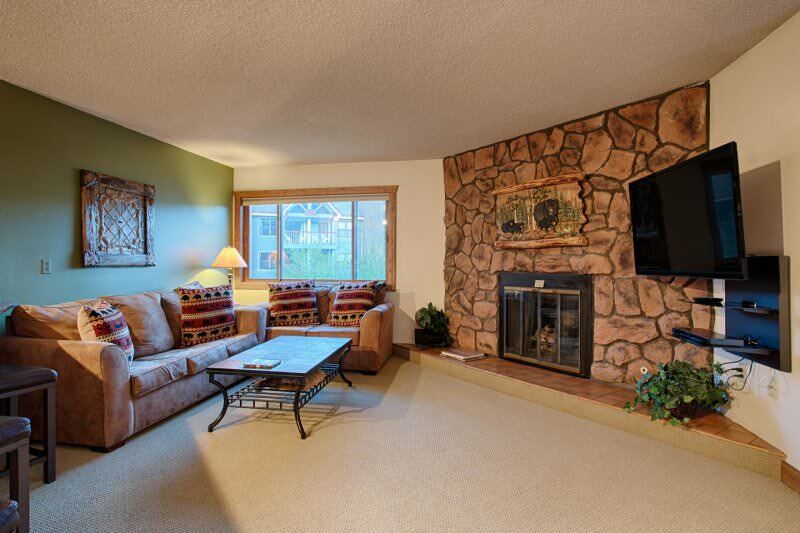 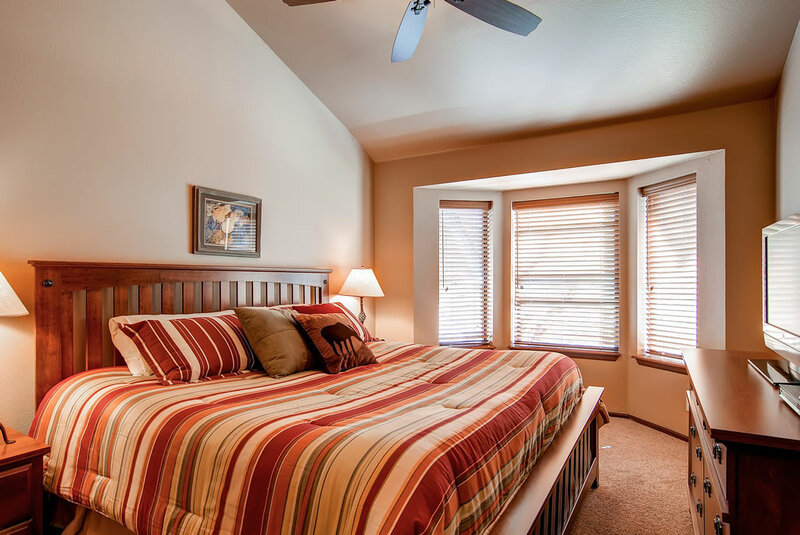 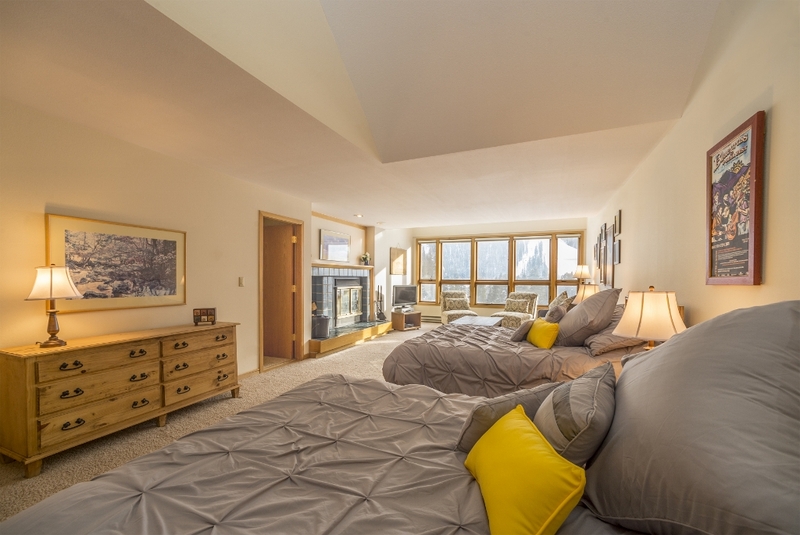 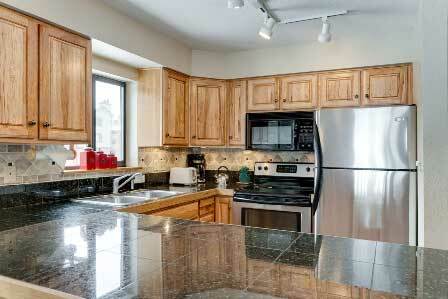 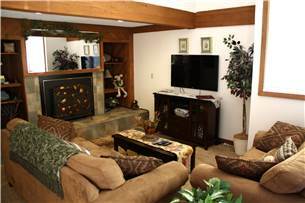 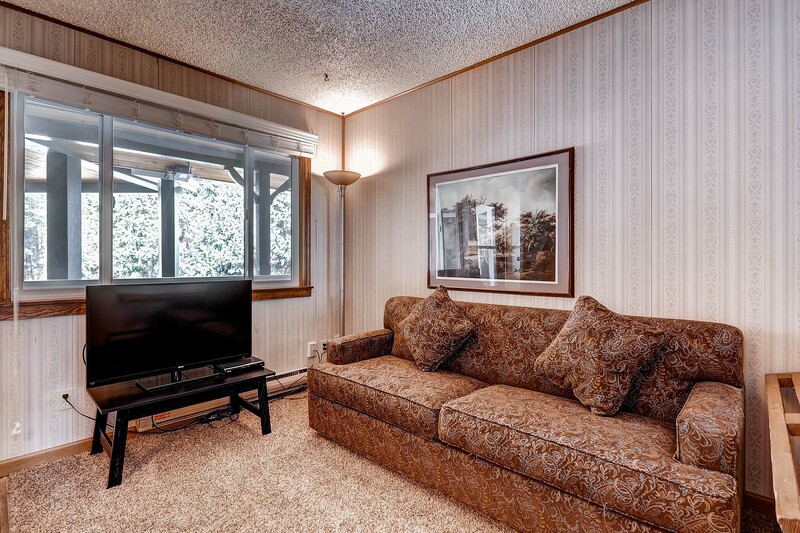 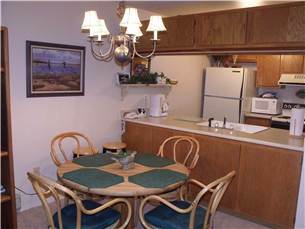 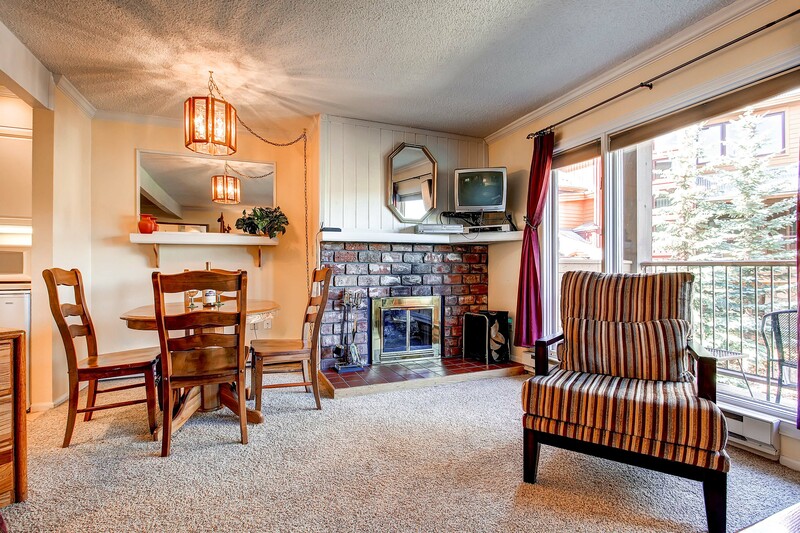 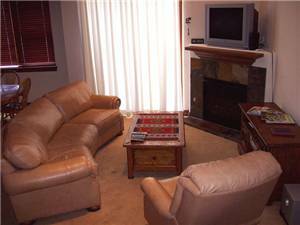 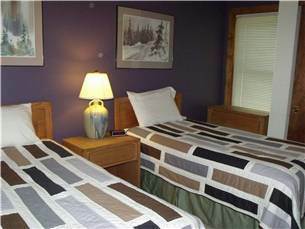 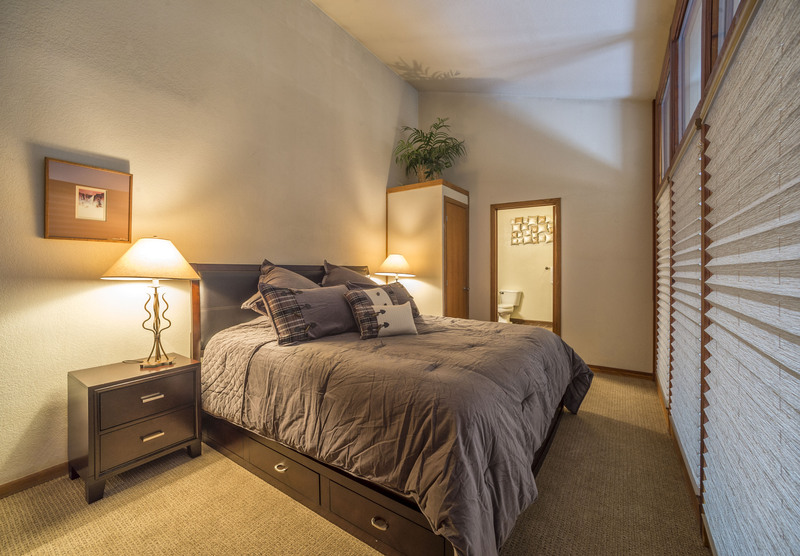 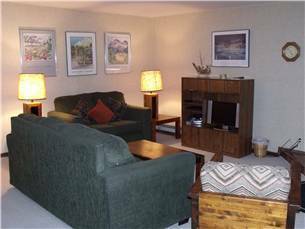 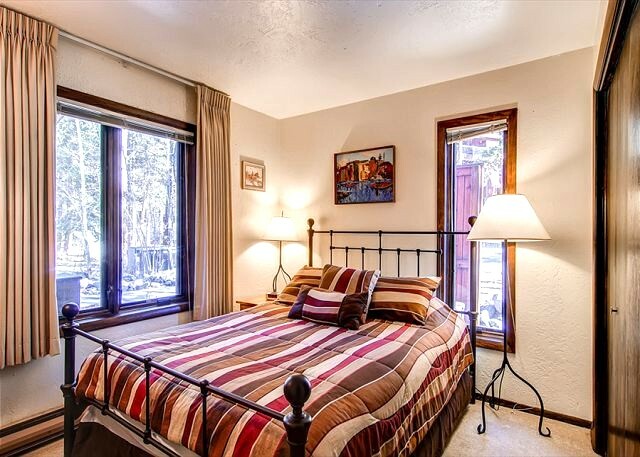 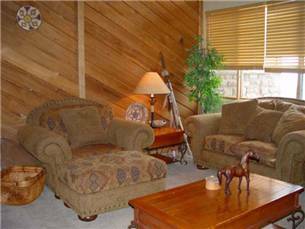 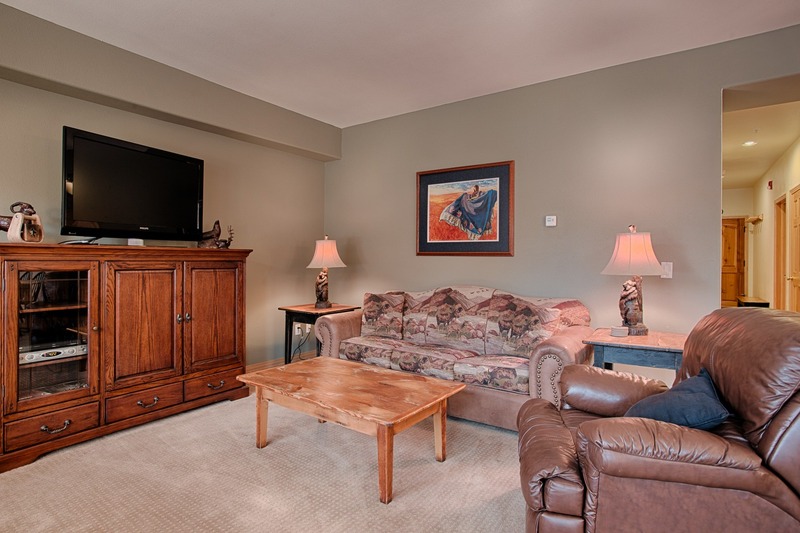 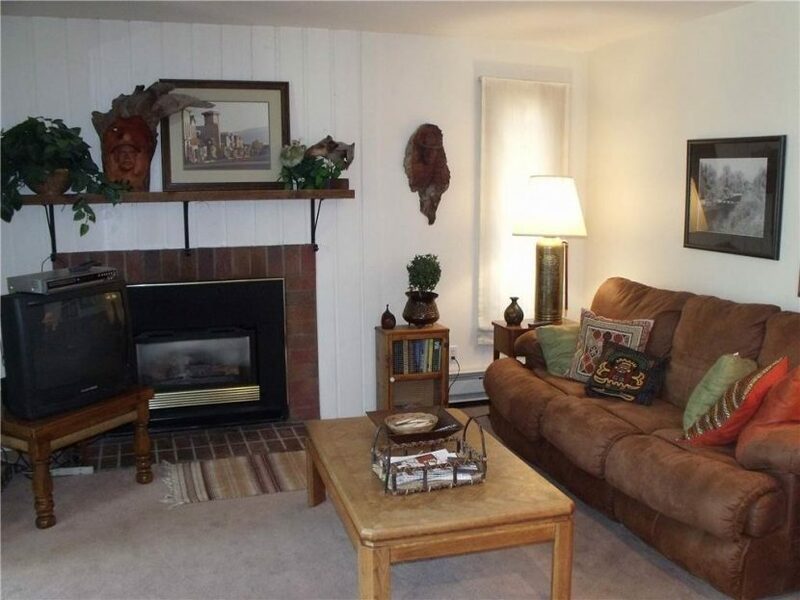 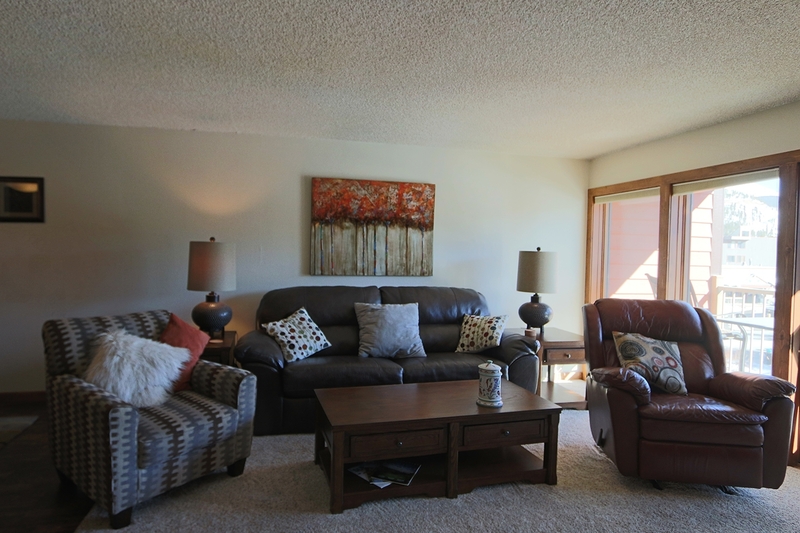 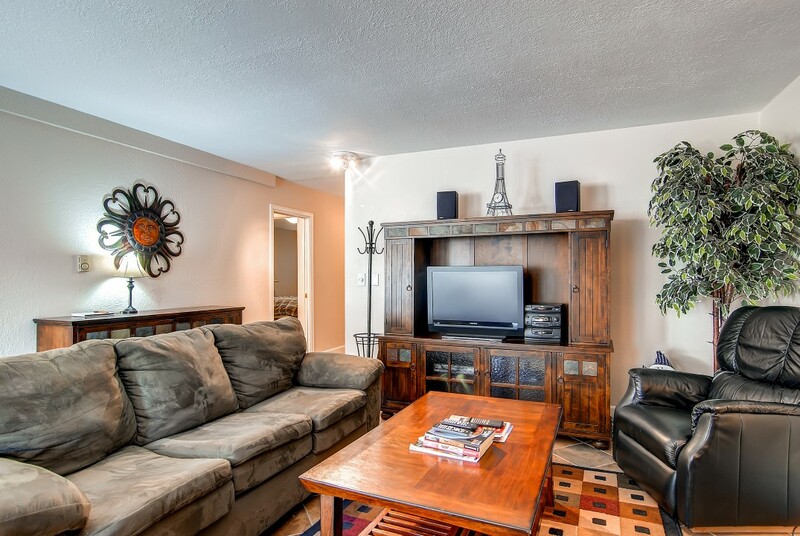 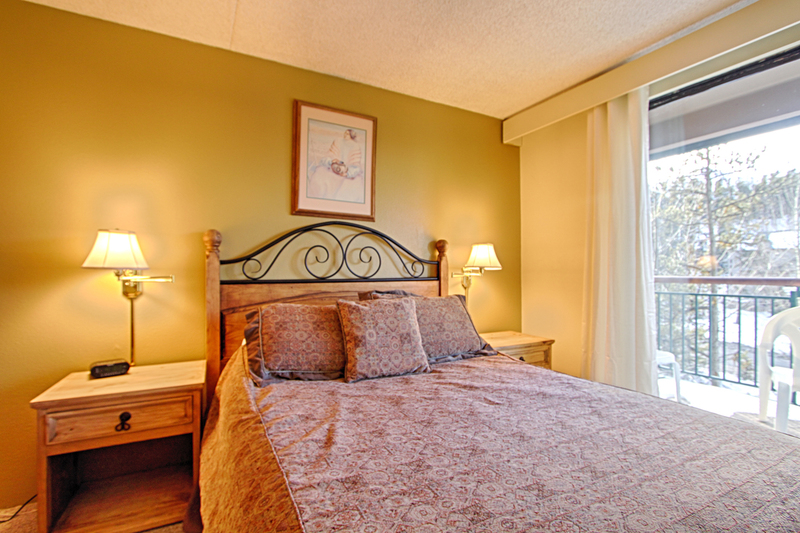 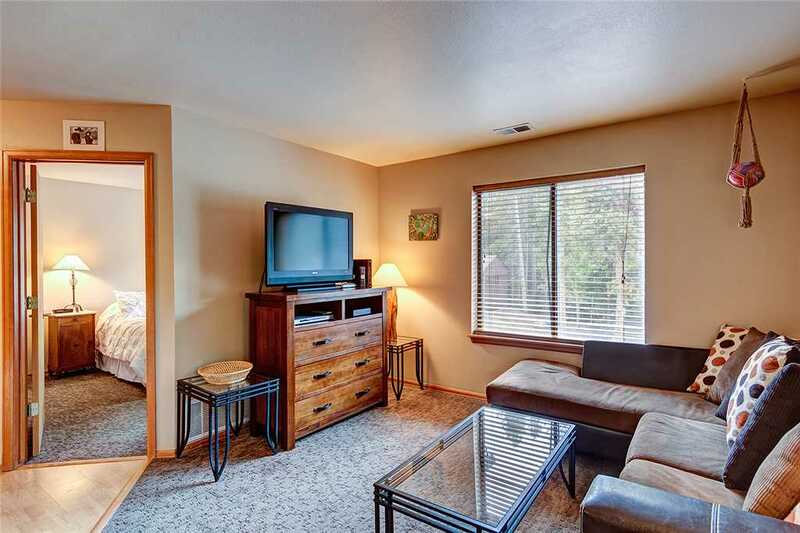 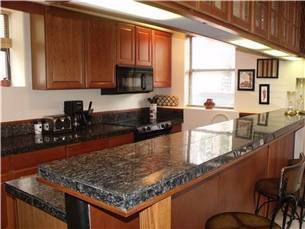 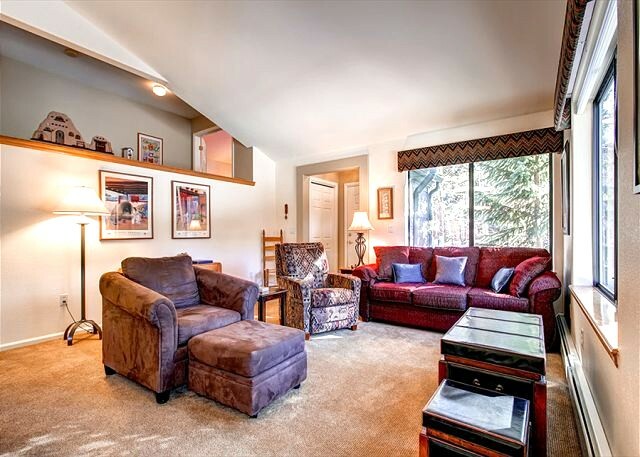 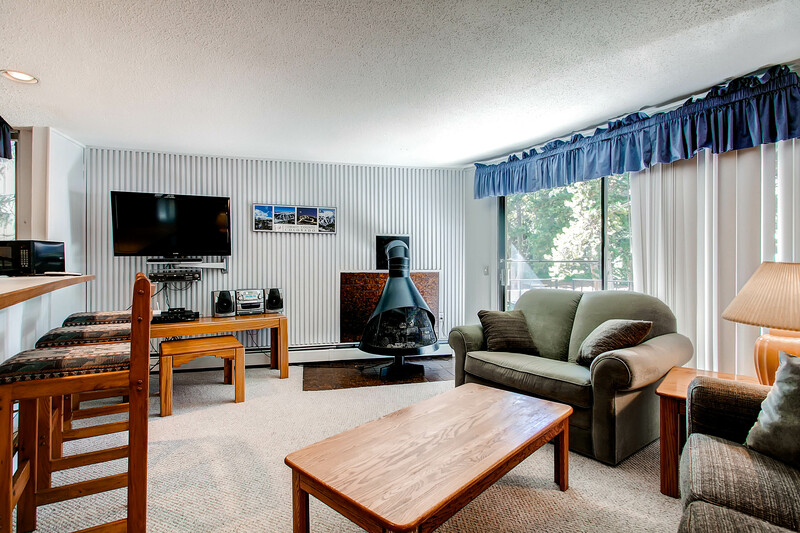 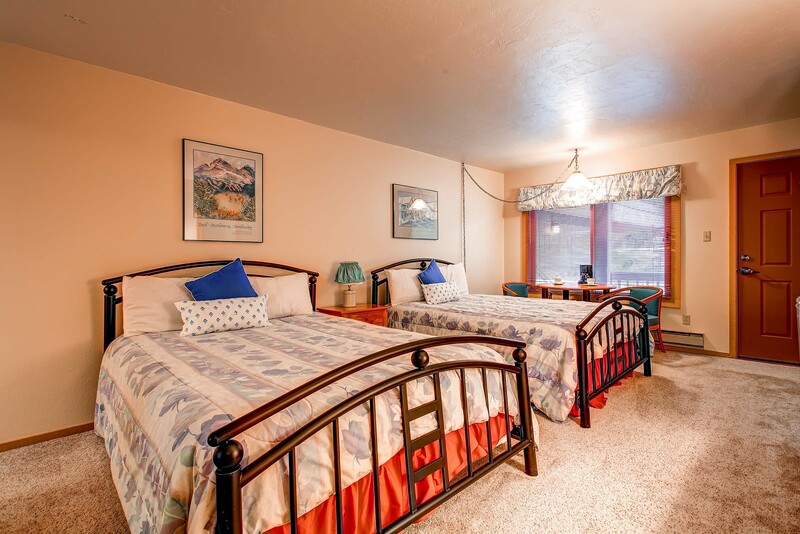 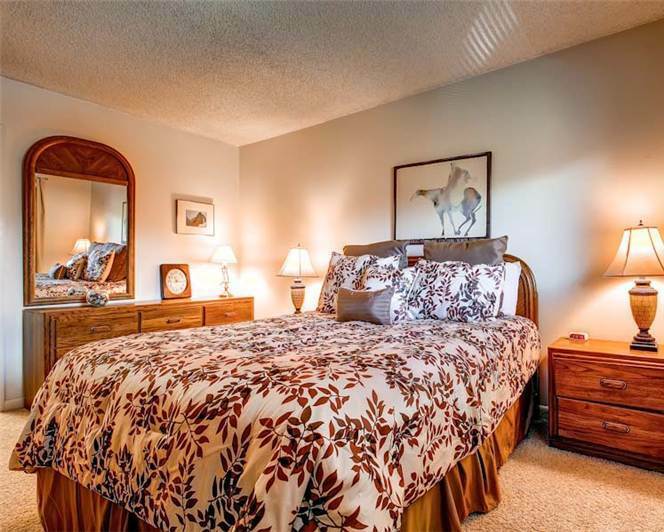 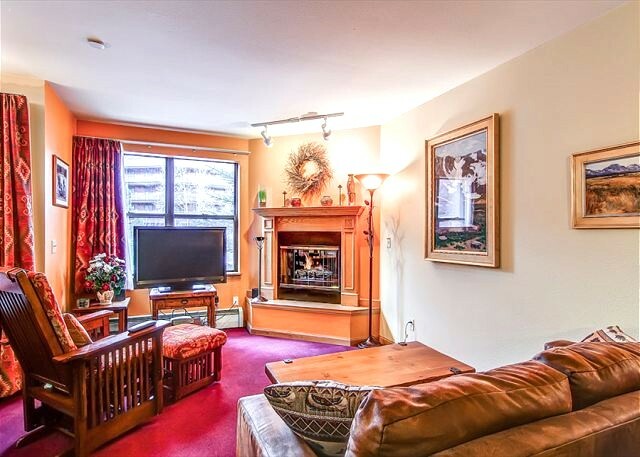 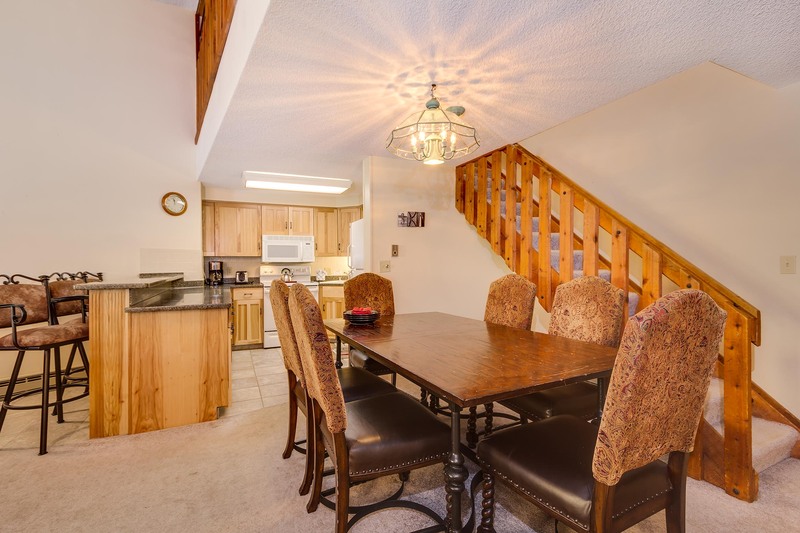 Two queen bedroom suites with private bathrooms make this triplex a great choice for two couples/families to share. 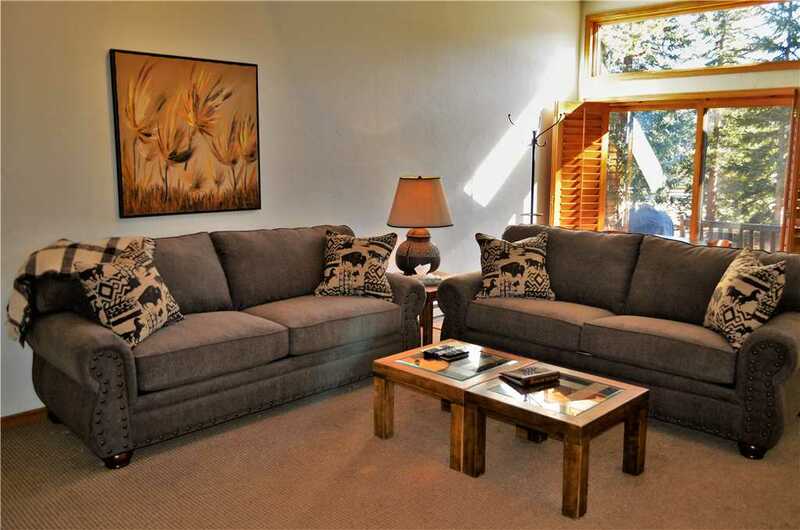 Two queen sleeper sofas in the living area (with memory foam mattresses) provide perfect sleep accommodations for the remainder of your active clan. 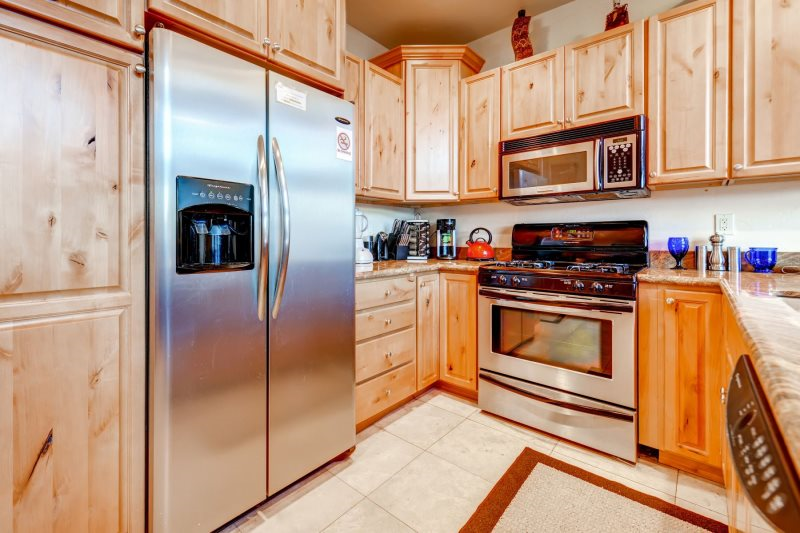 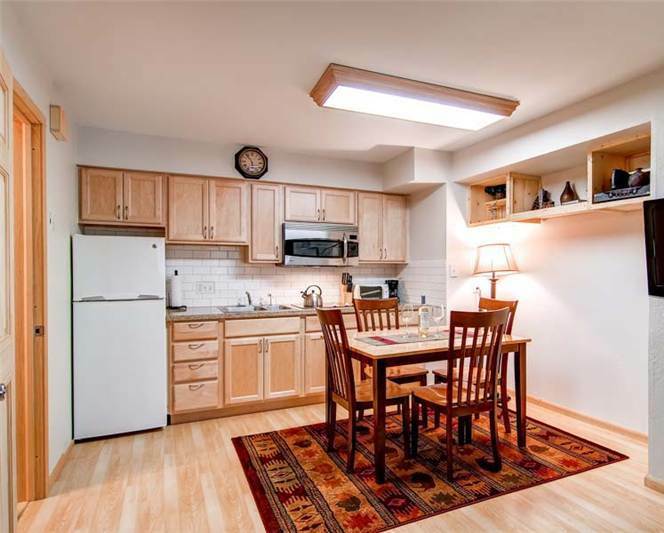 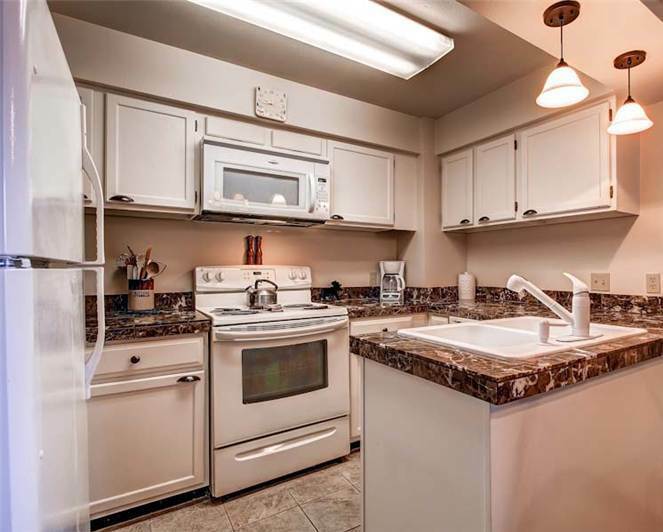 You’ll also appreciate the laundry room with a full-sized washer/dryer, large driveway with parking for three vehicles, and complementary Wi-Fi throughout the home. 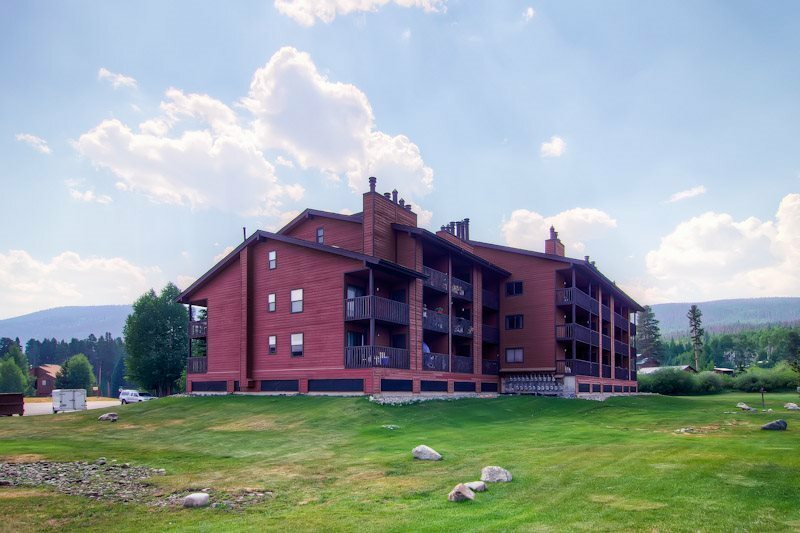 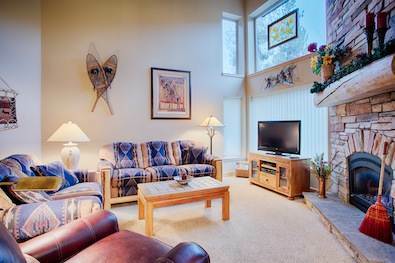 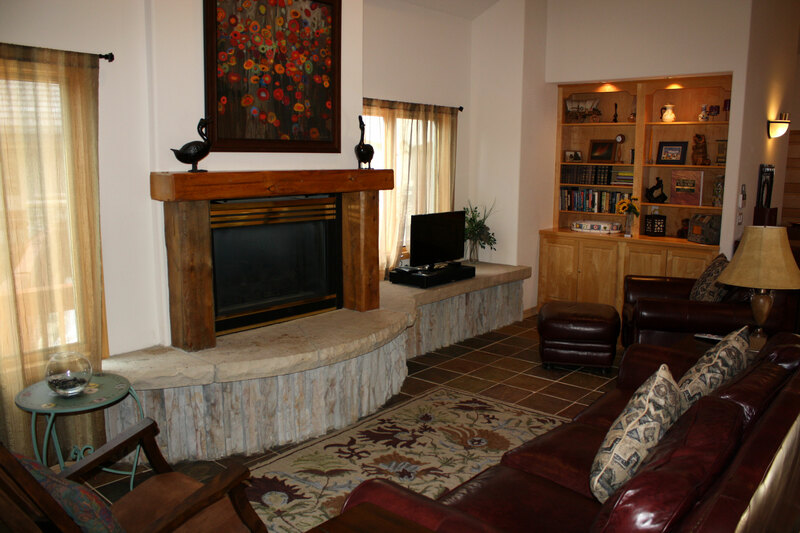 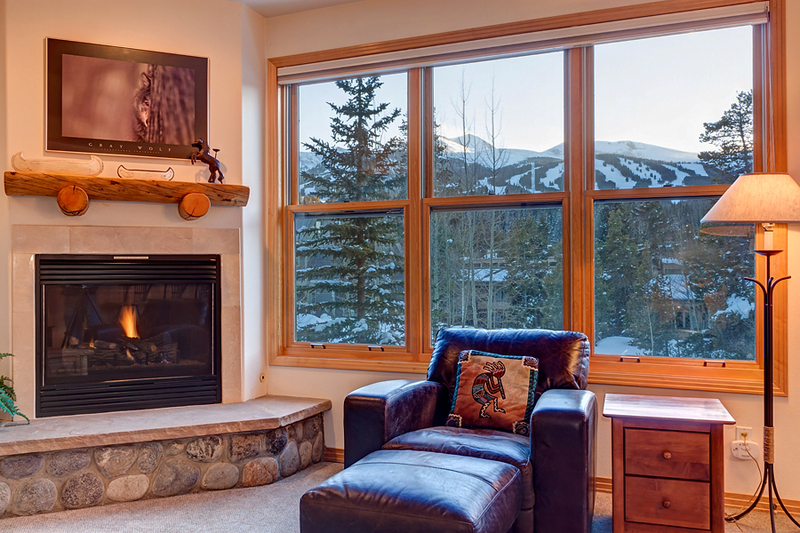 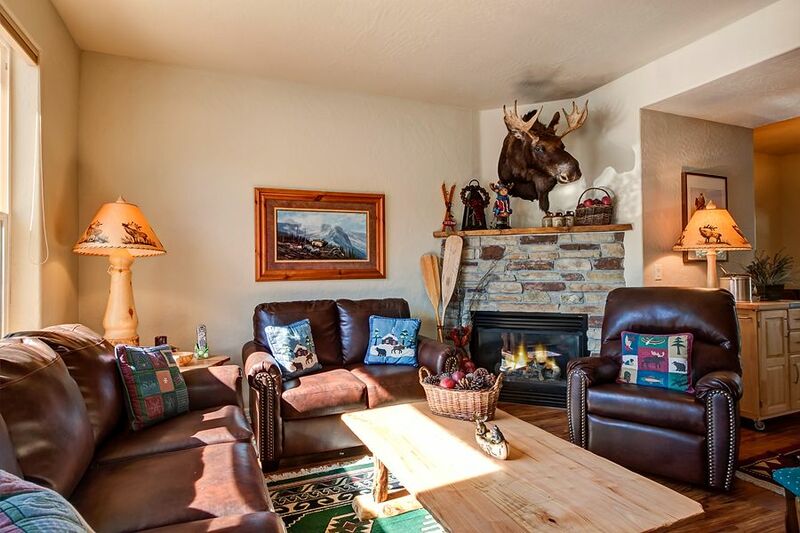 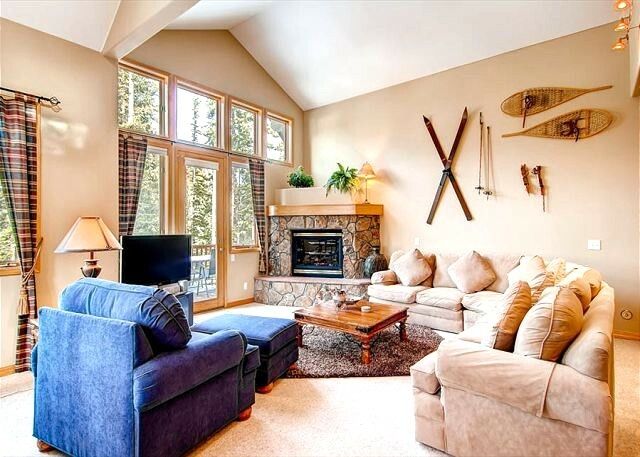 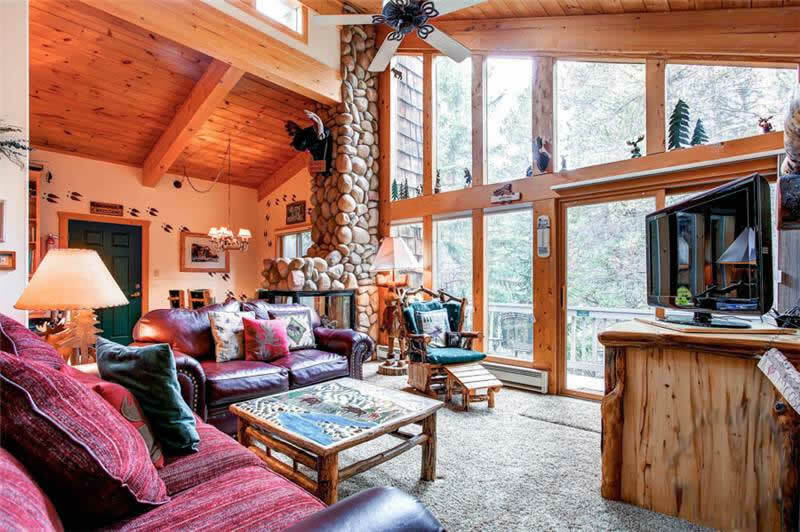 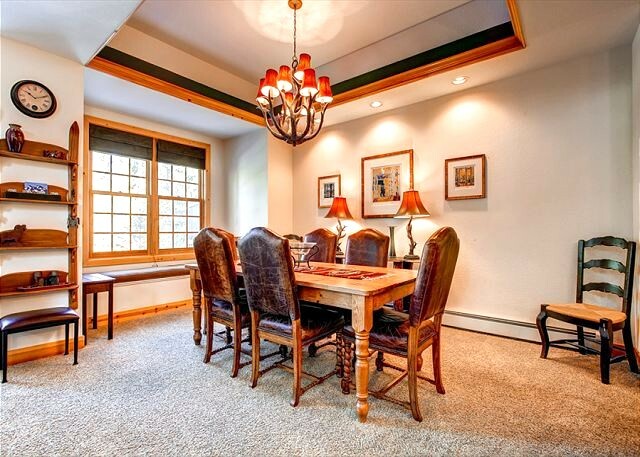 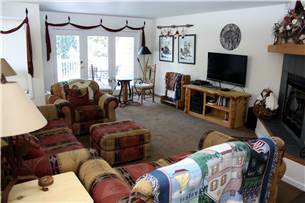 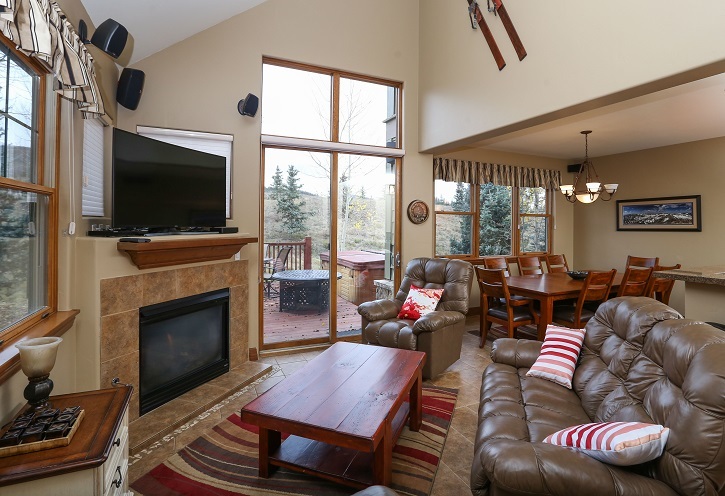 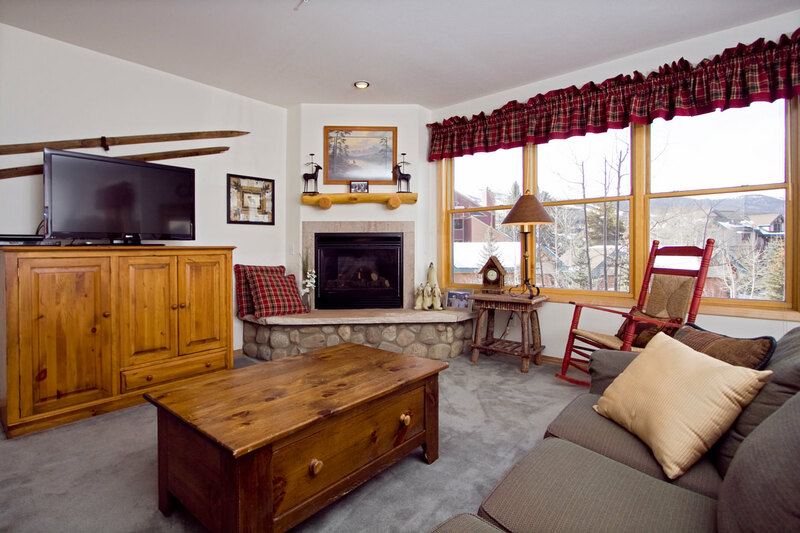 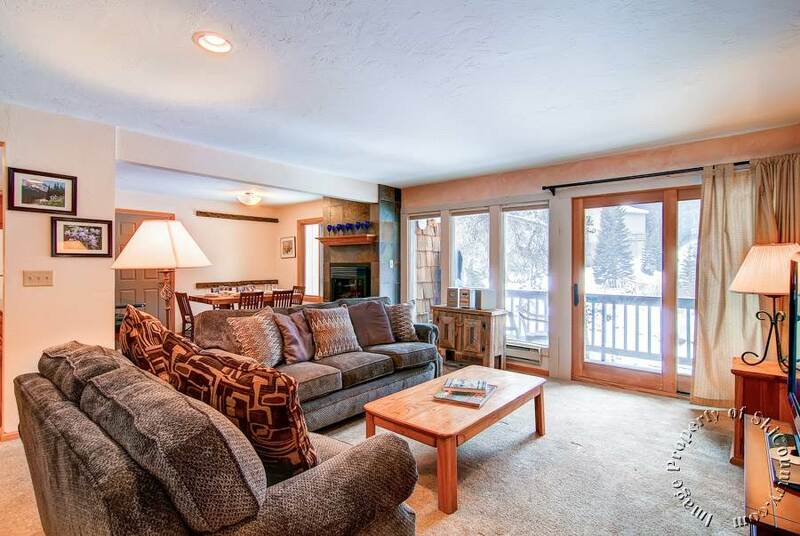 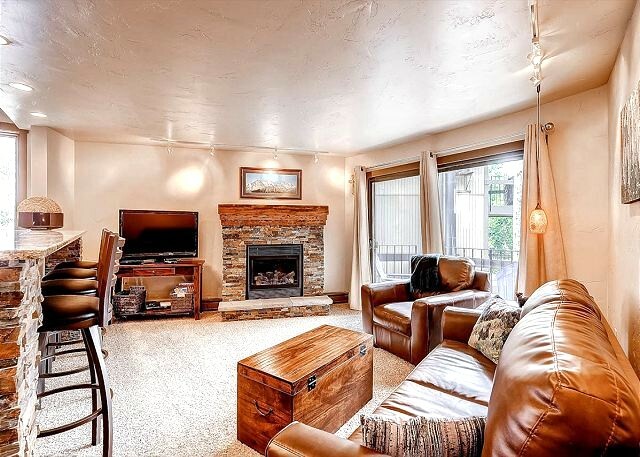 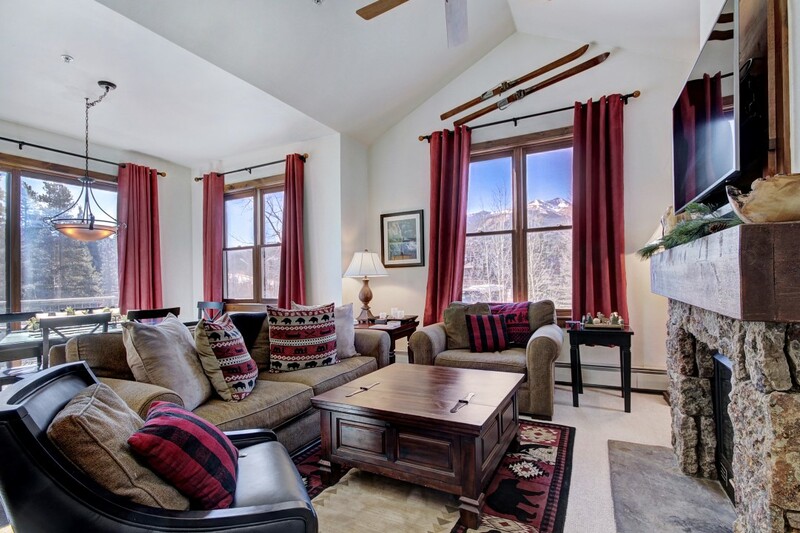 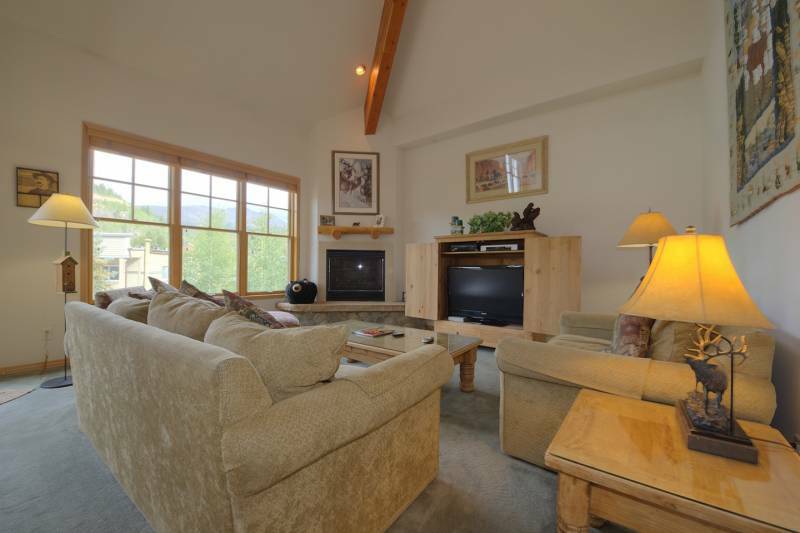 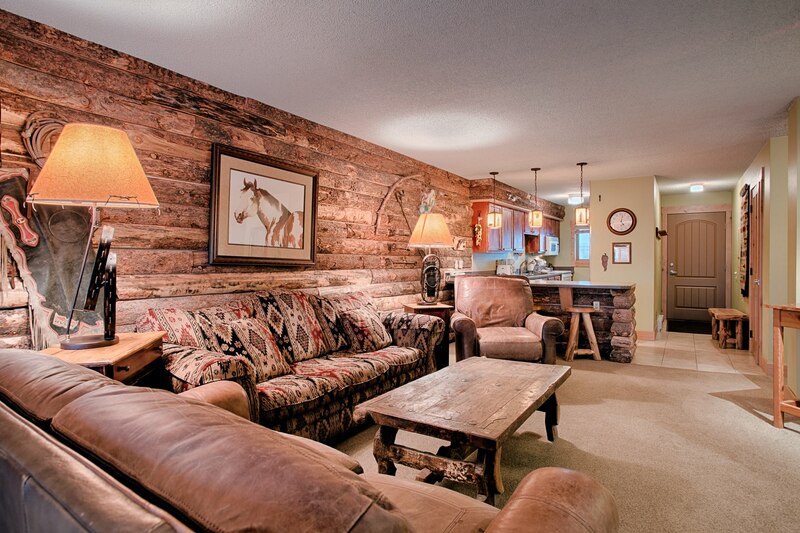 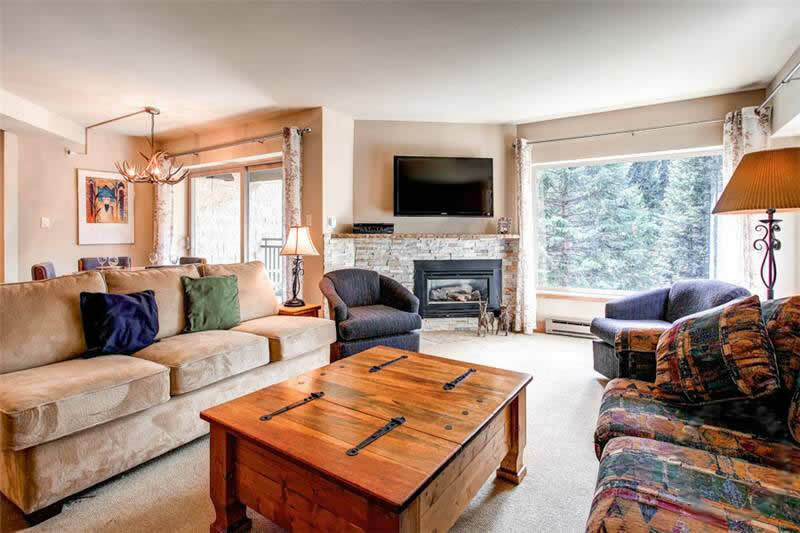 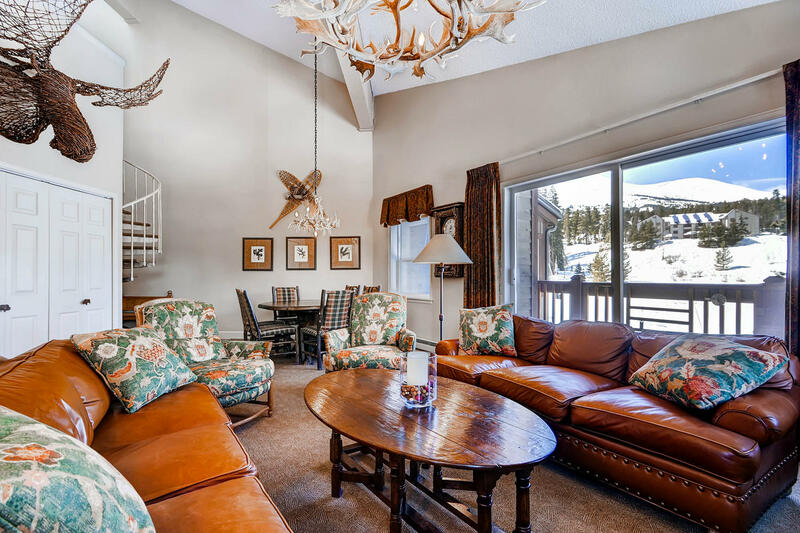 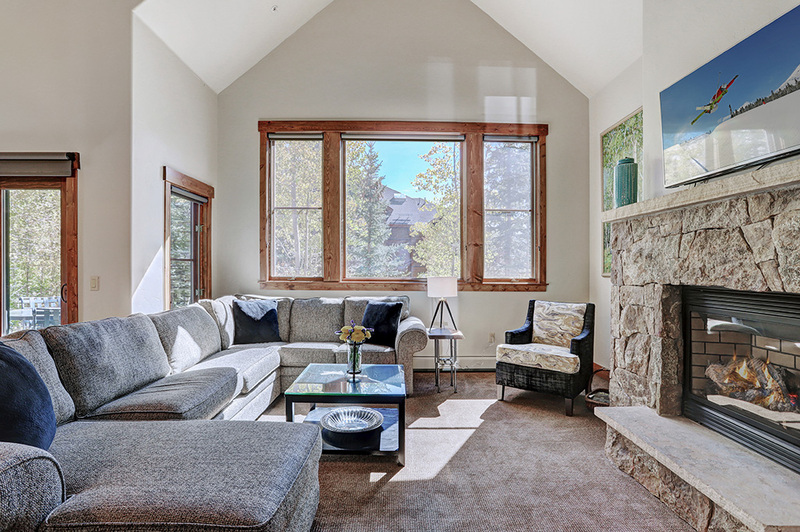 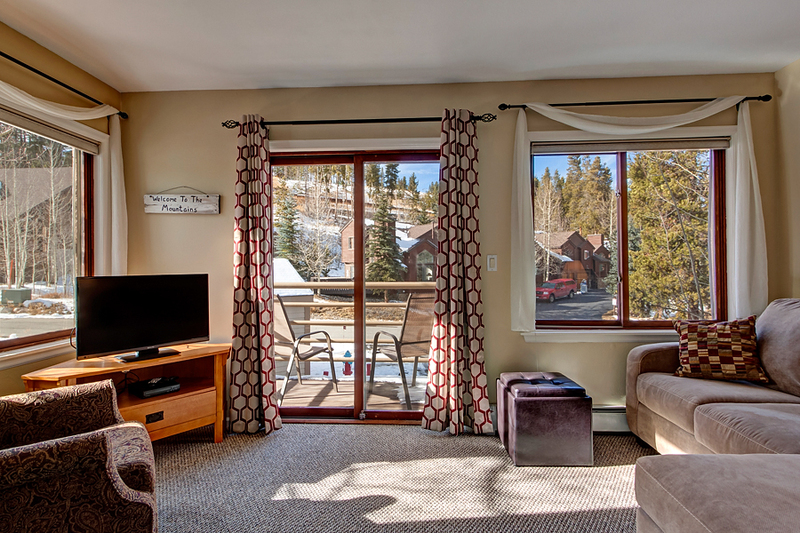 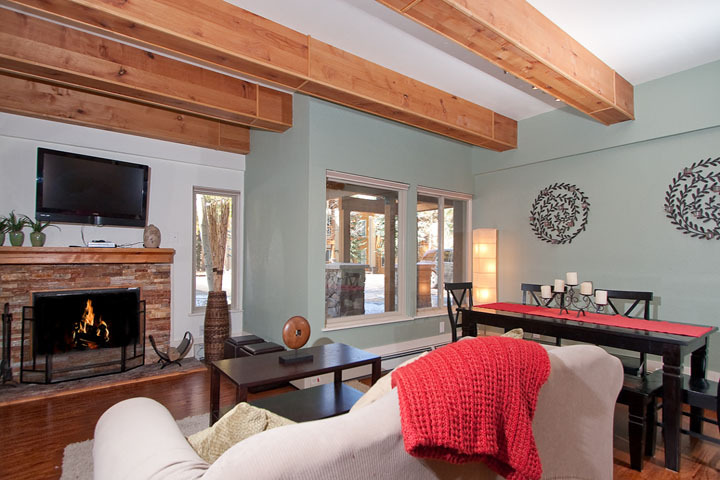 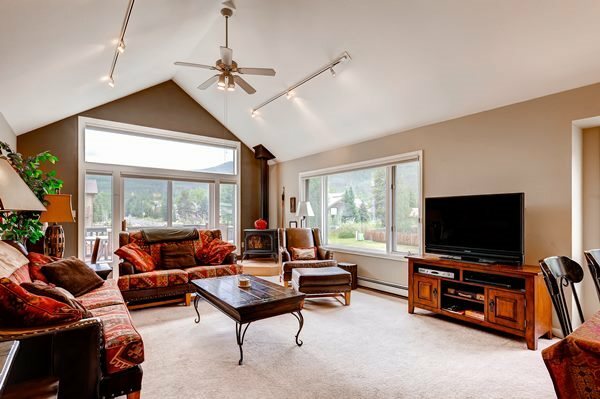 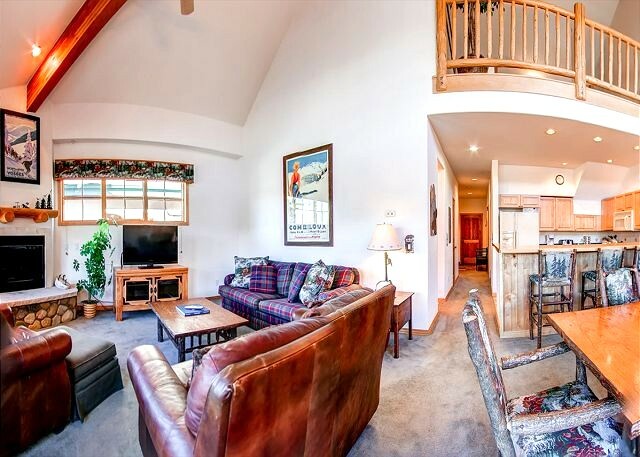 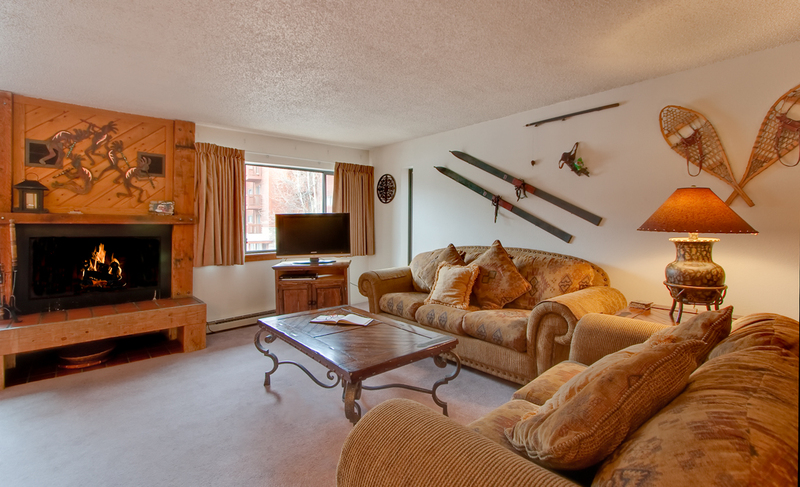 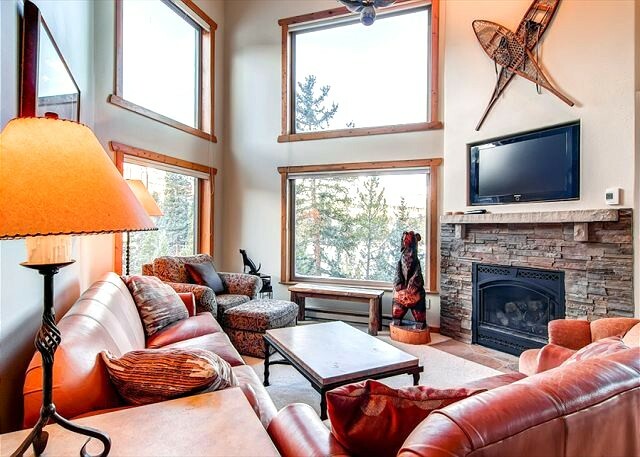 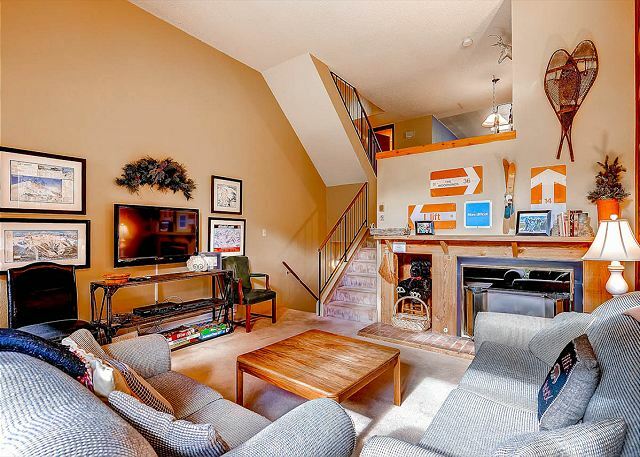 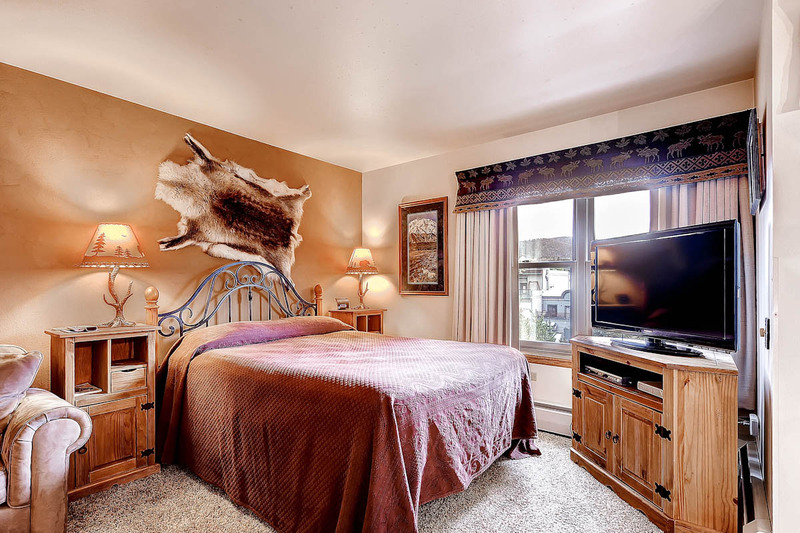 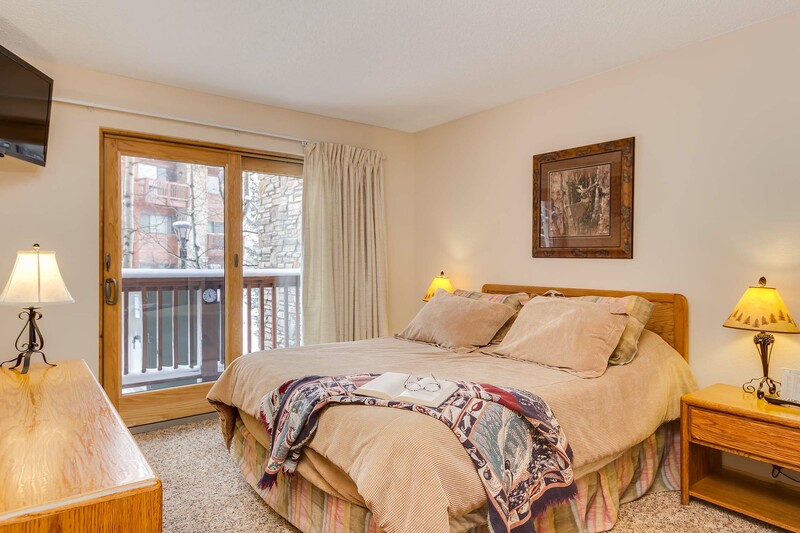 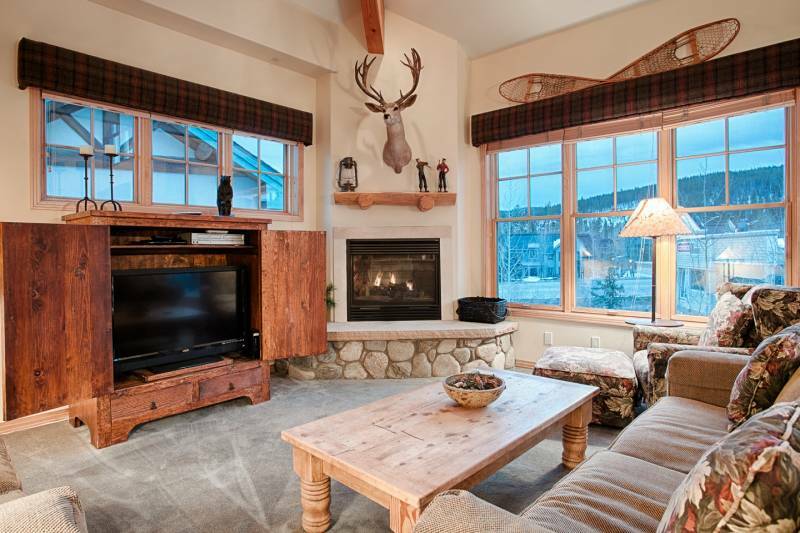 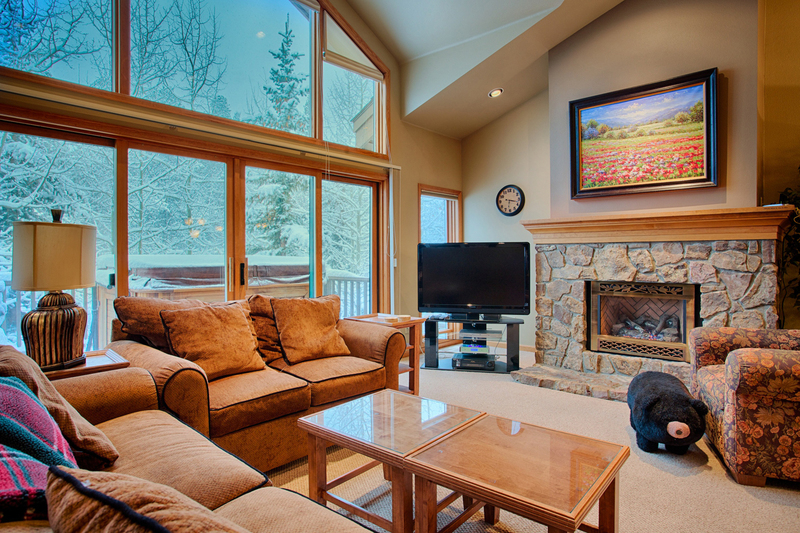 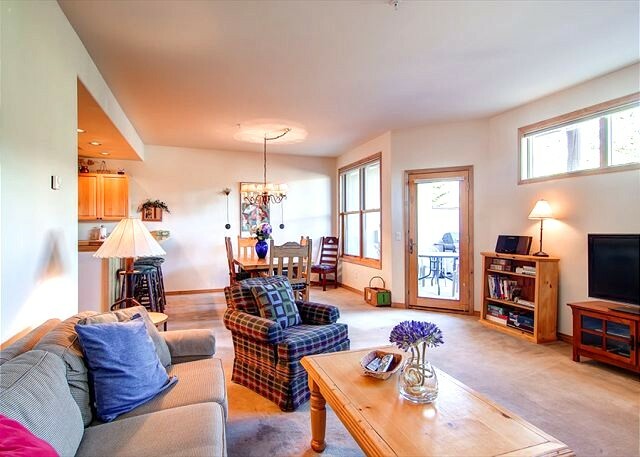 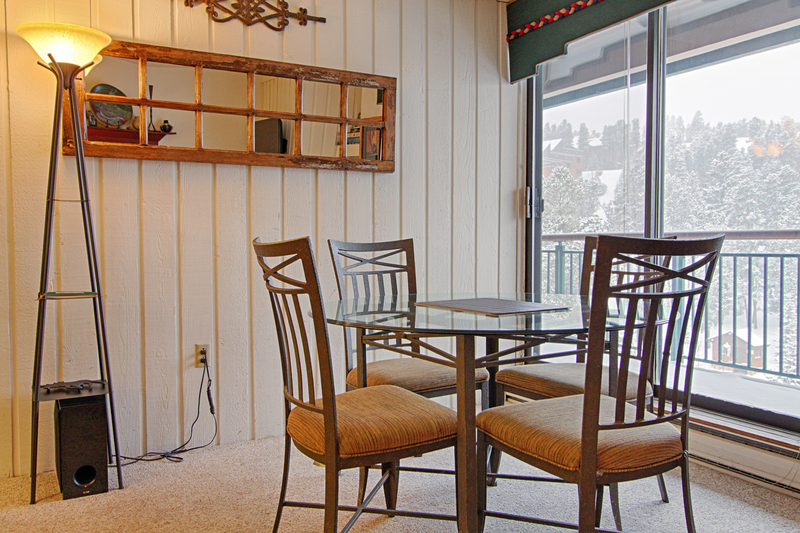 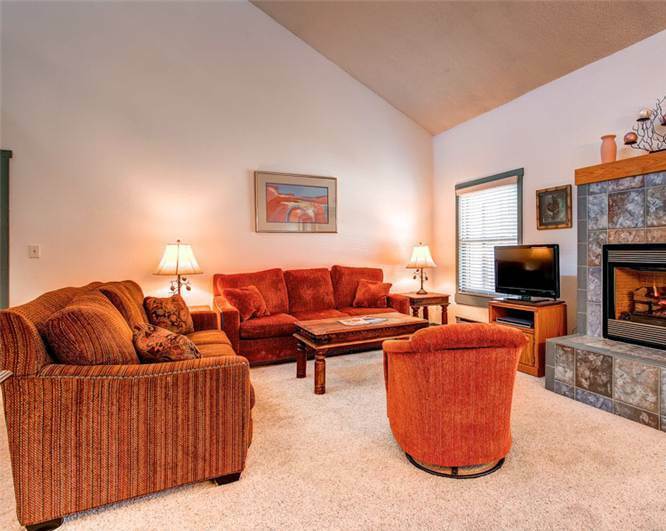 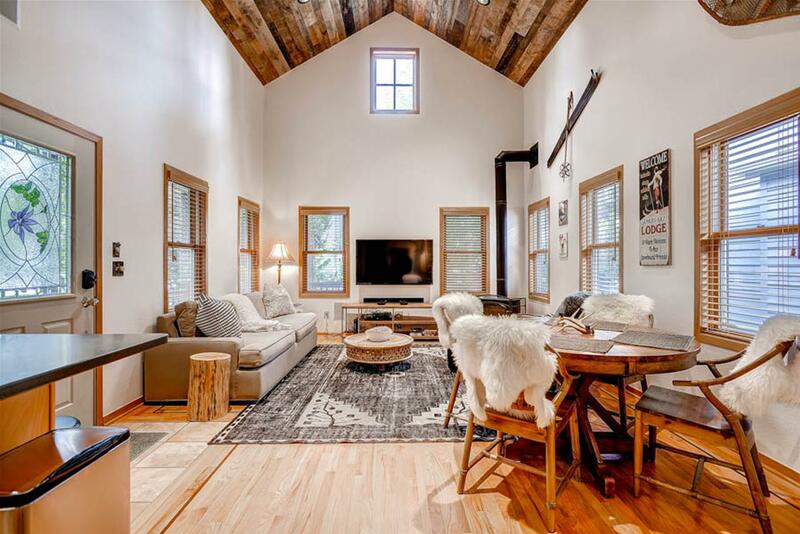 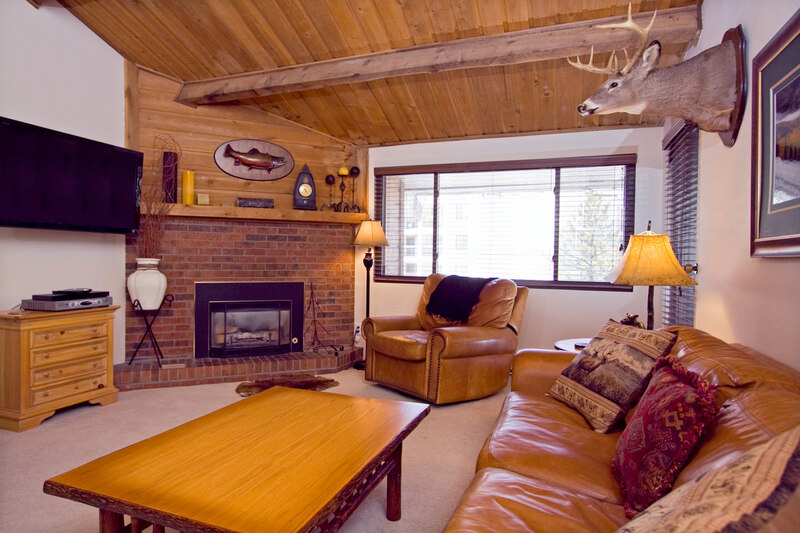 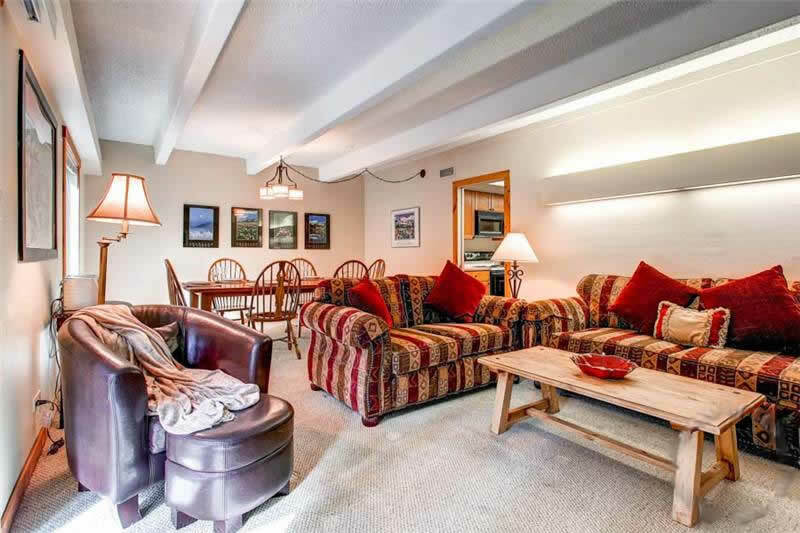 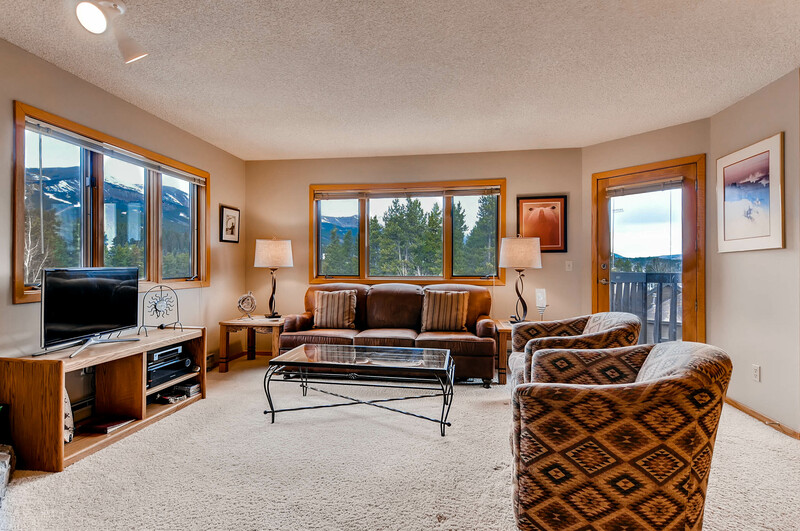 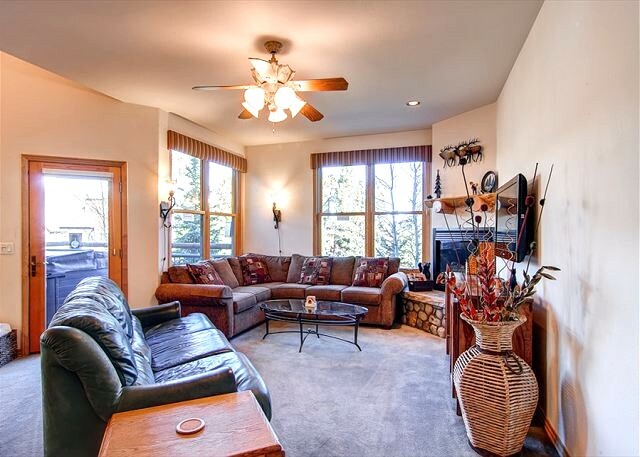 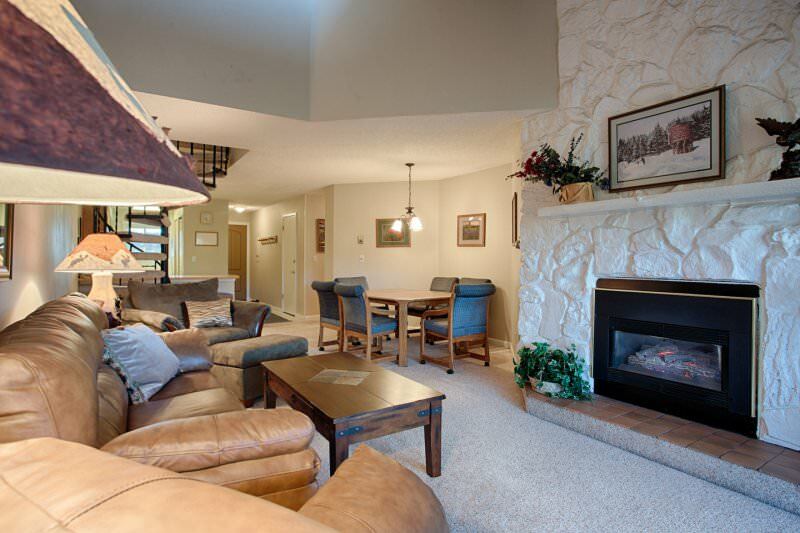 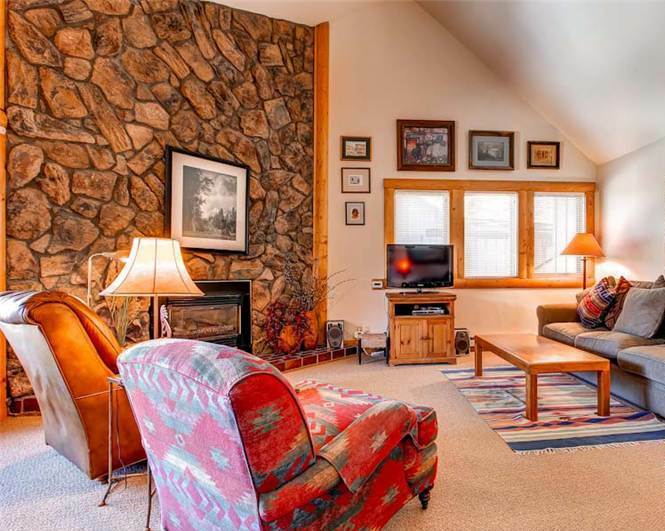 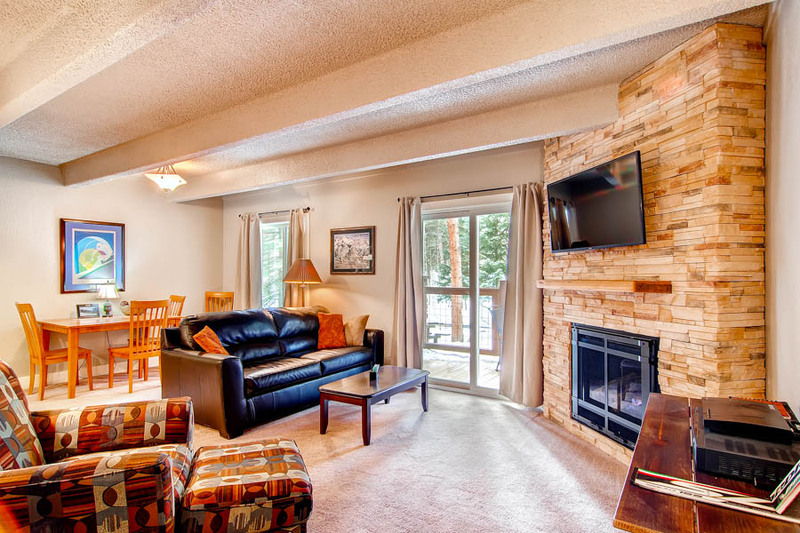 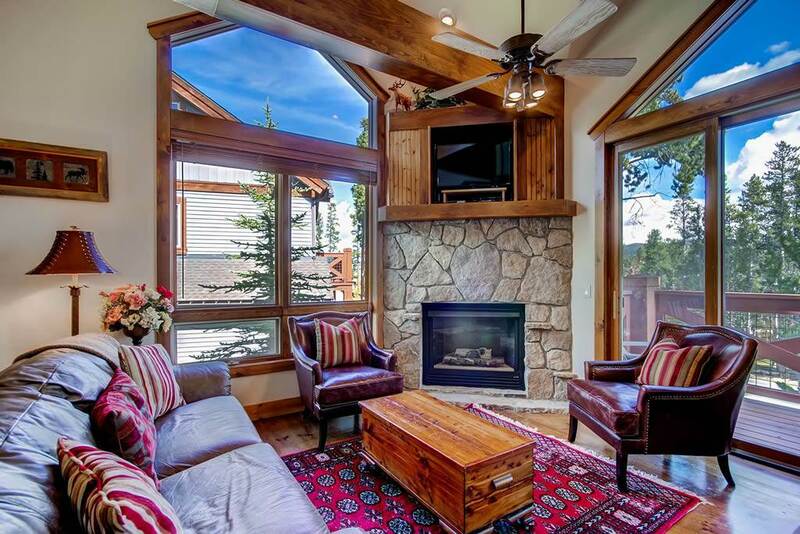 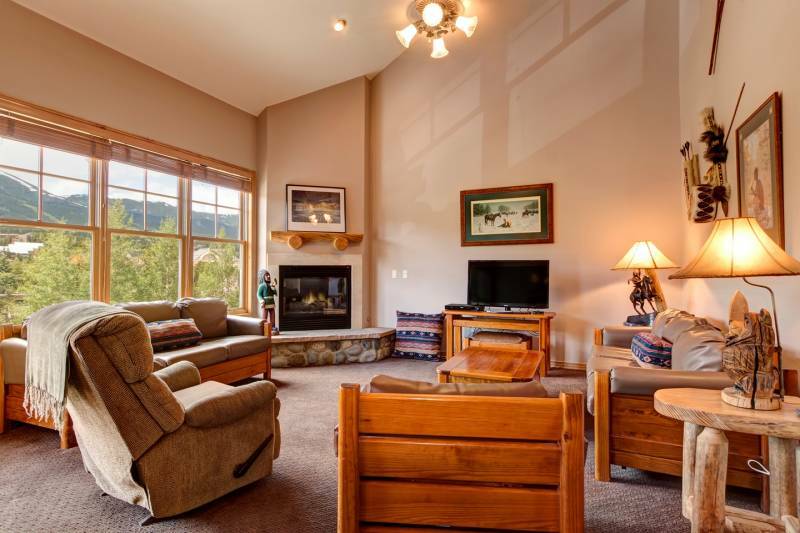 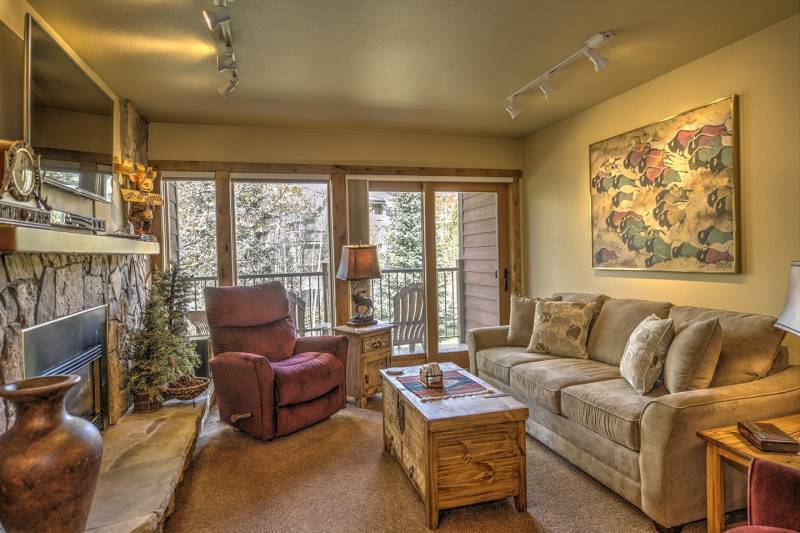 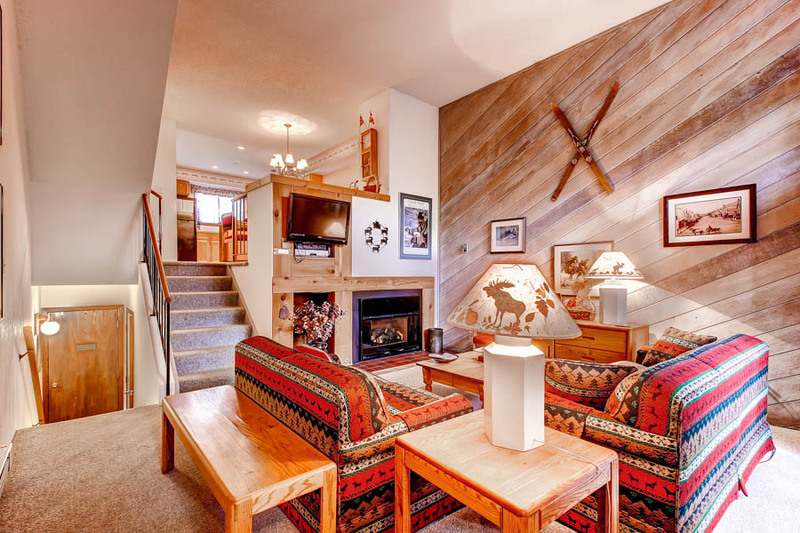 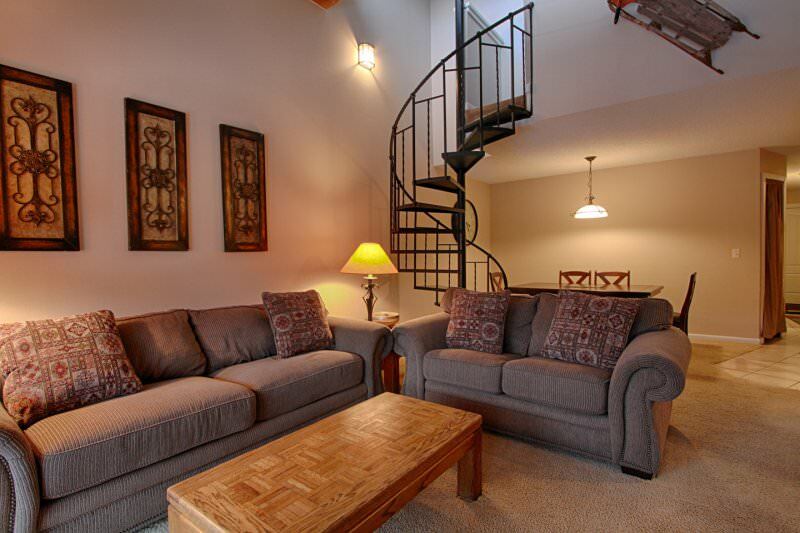 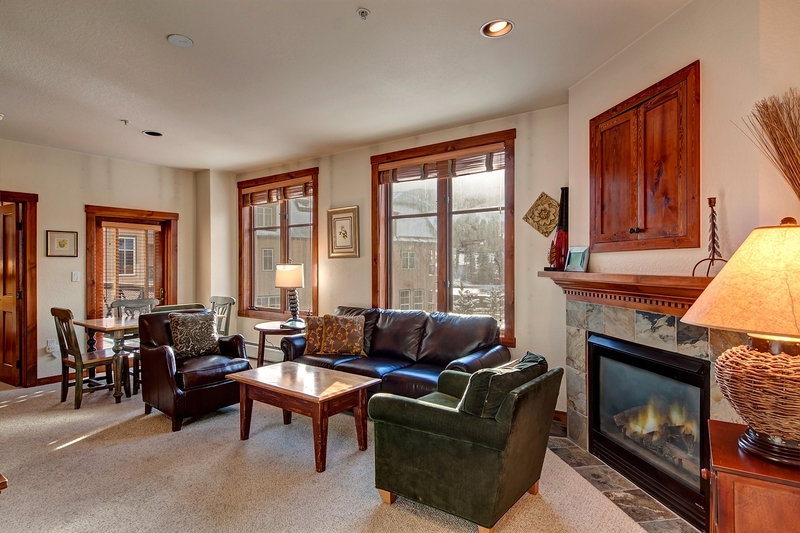 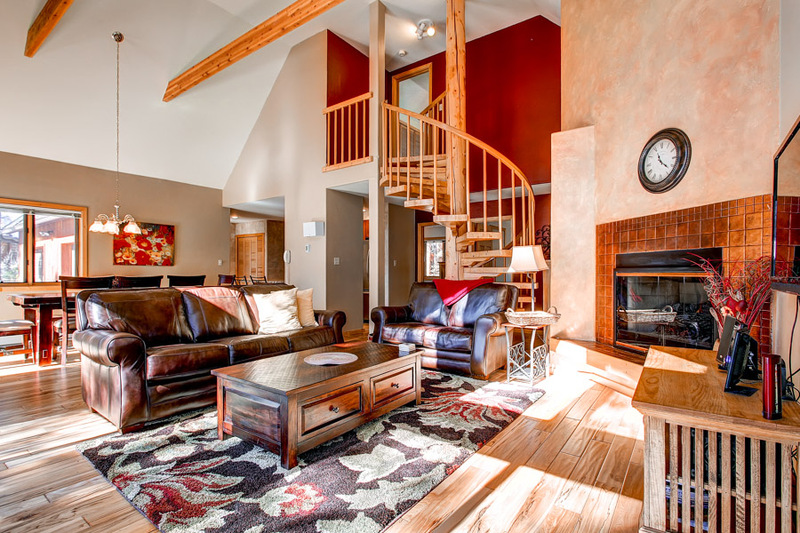 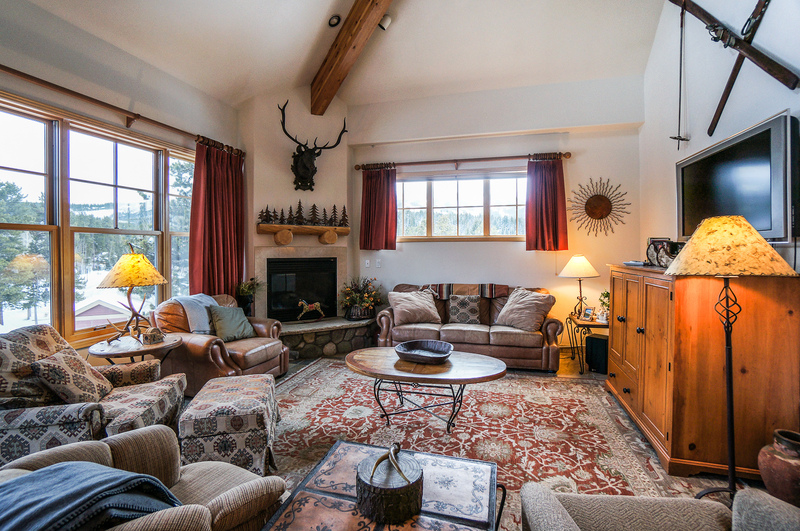 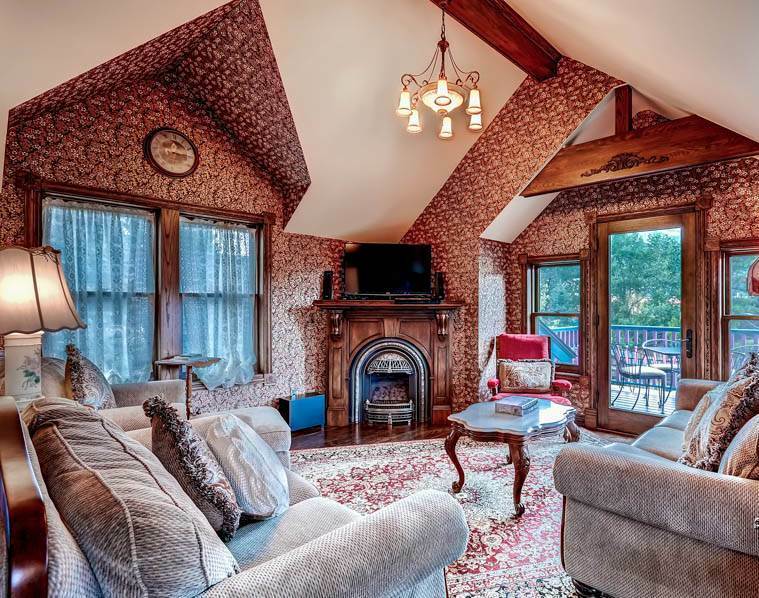 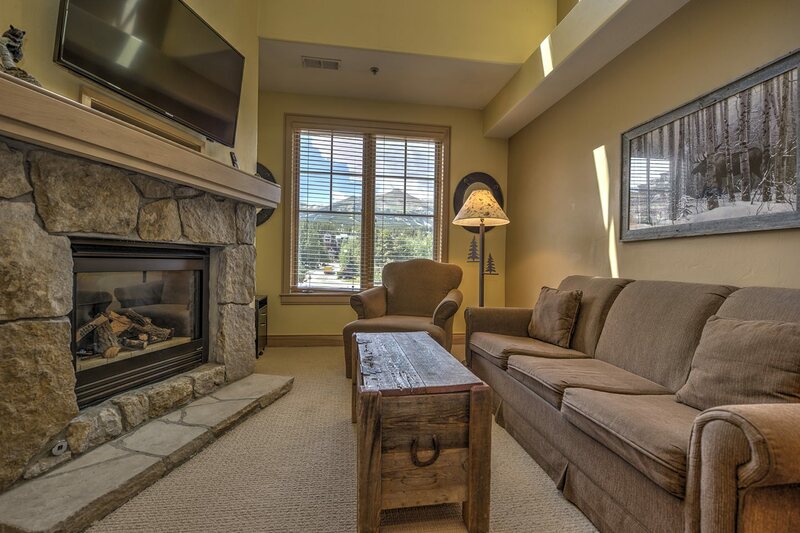 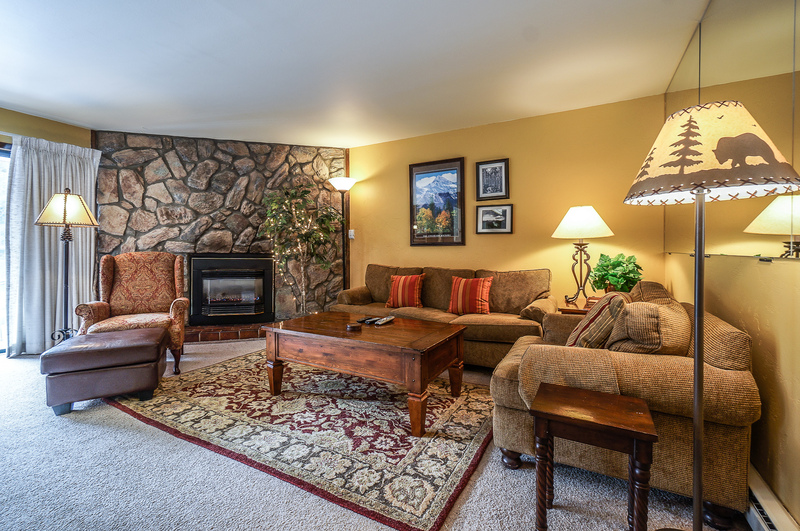 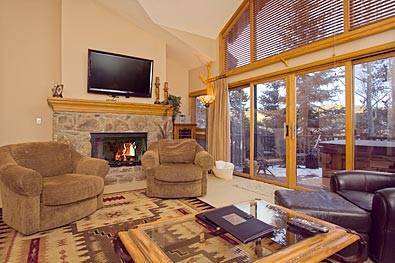 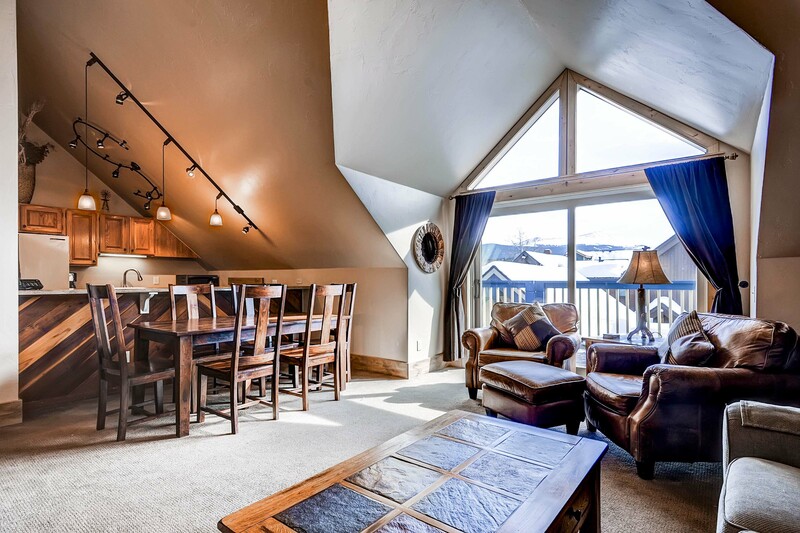 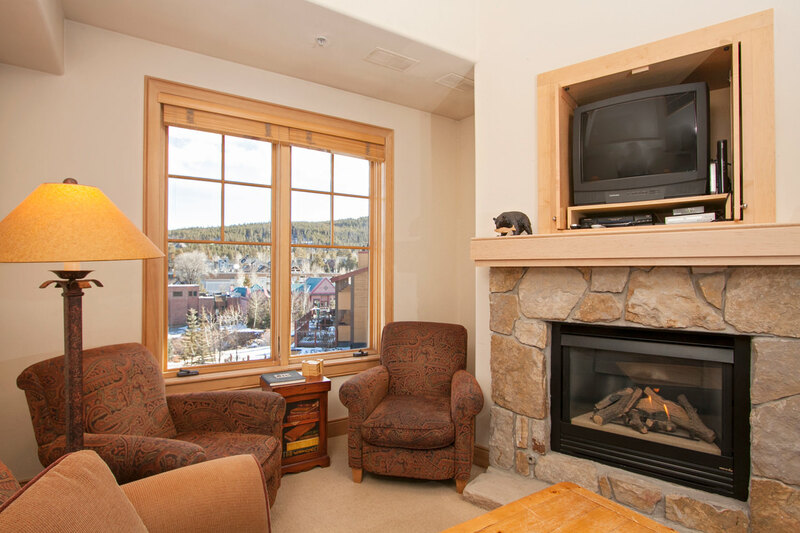 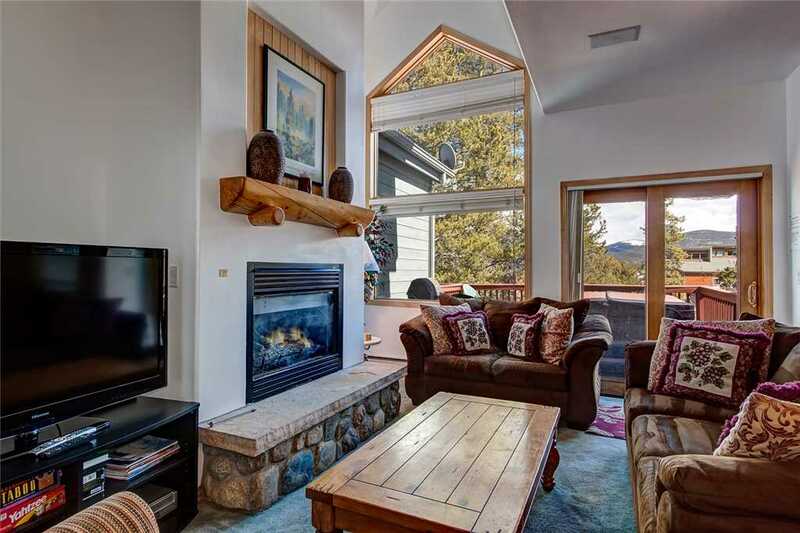 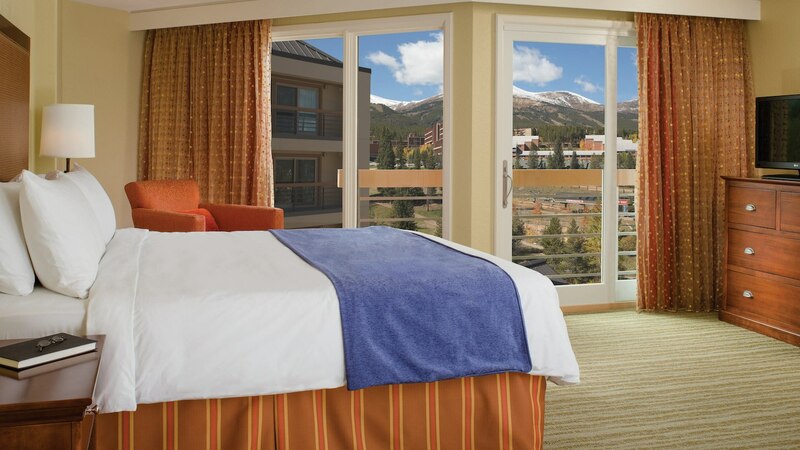 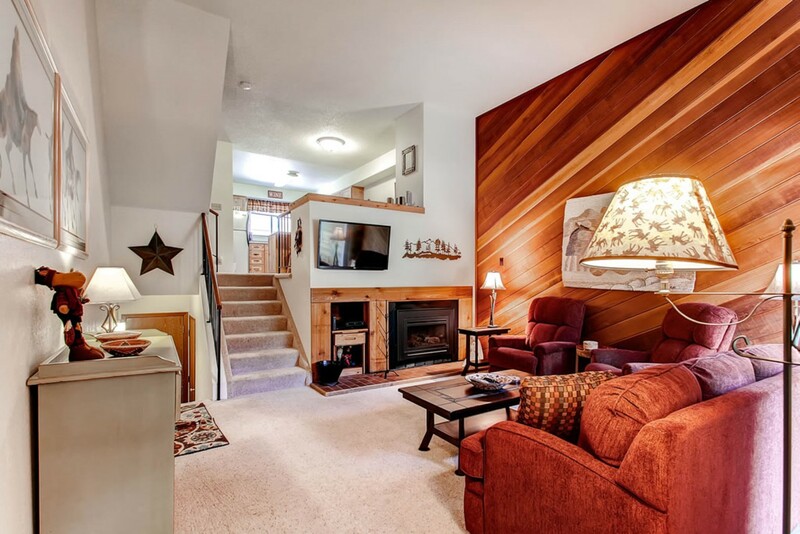 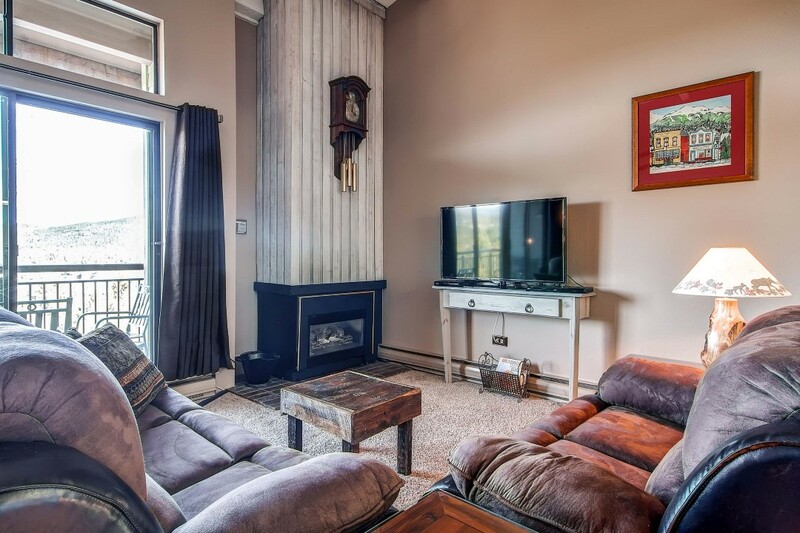 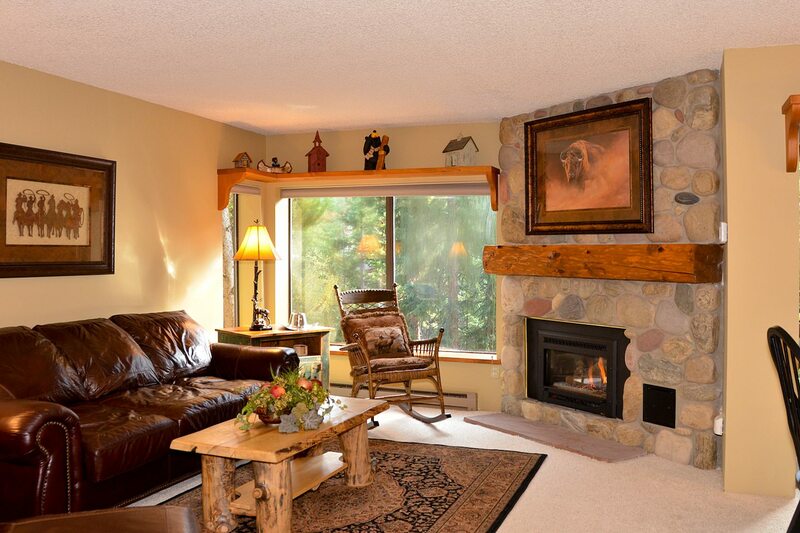 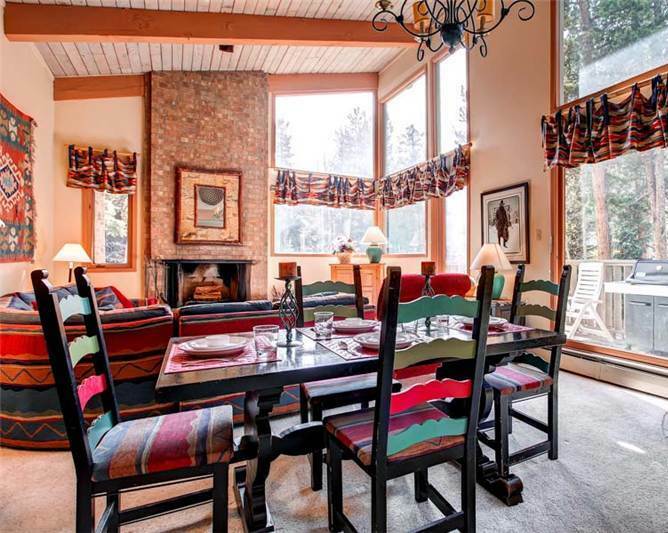 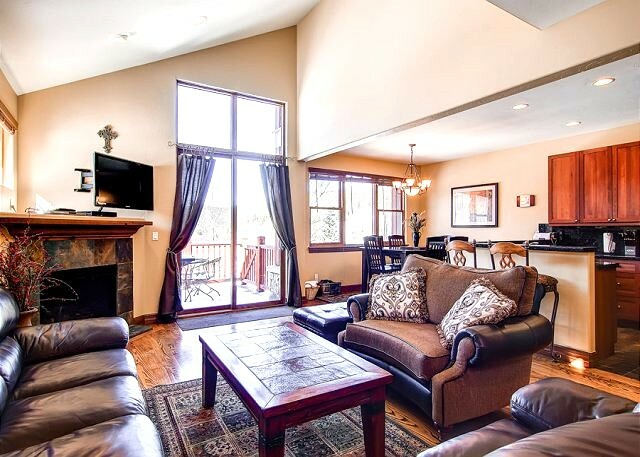 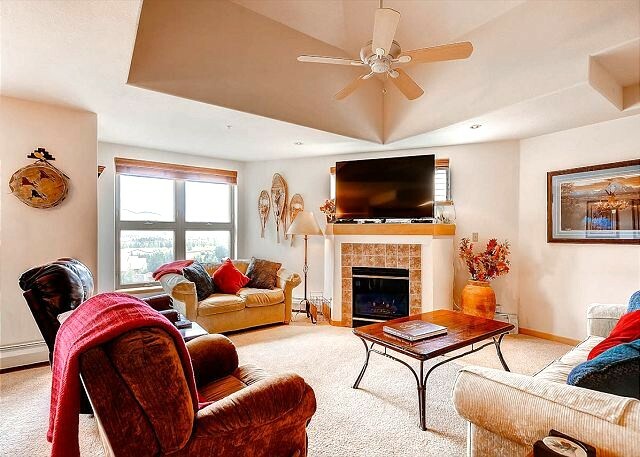 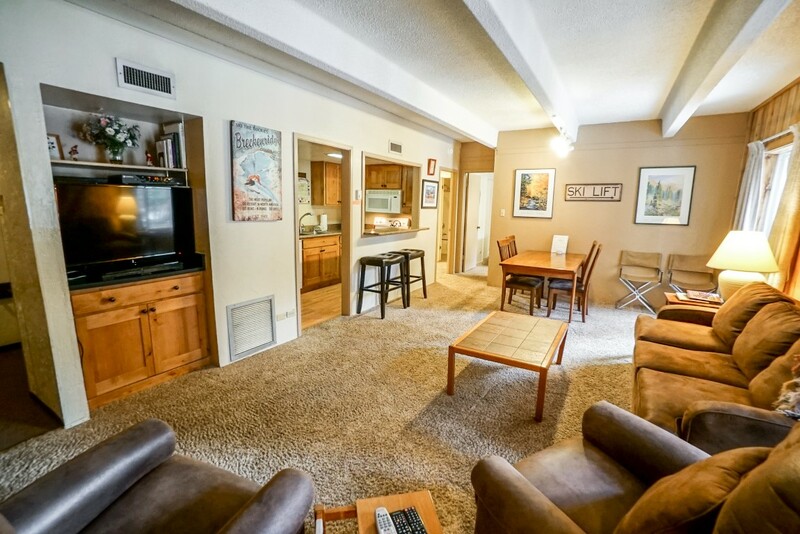 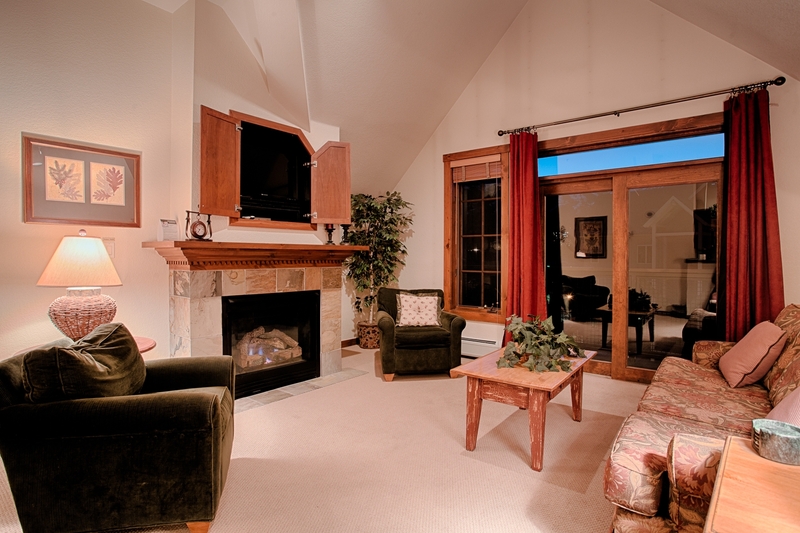 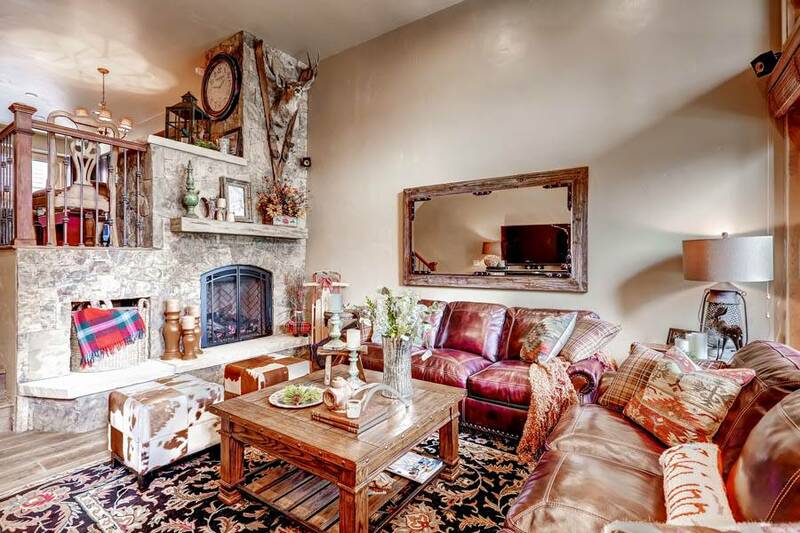 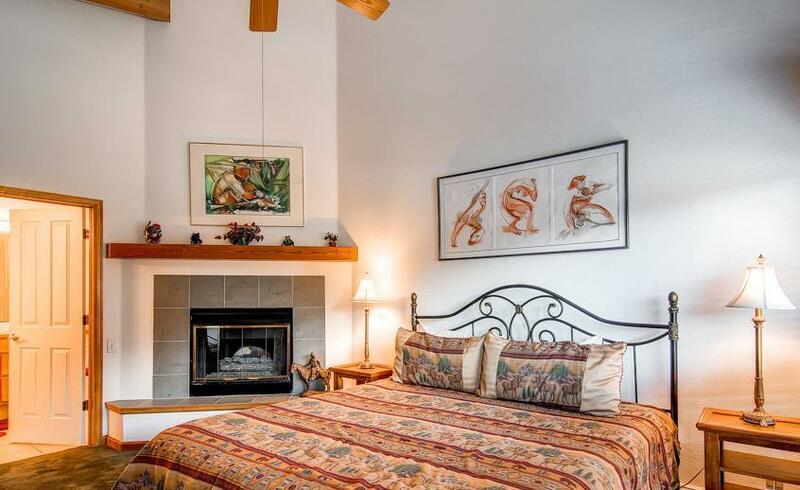 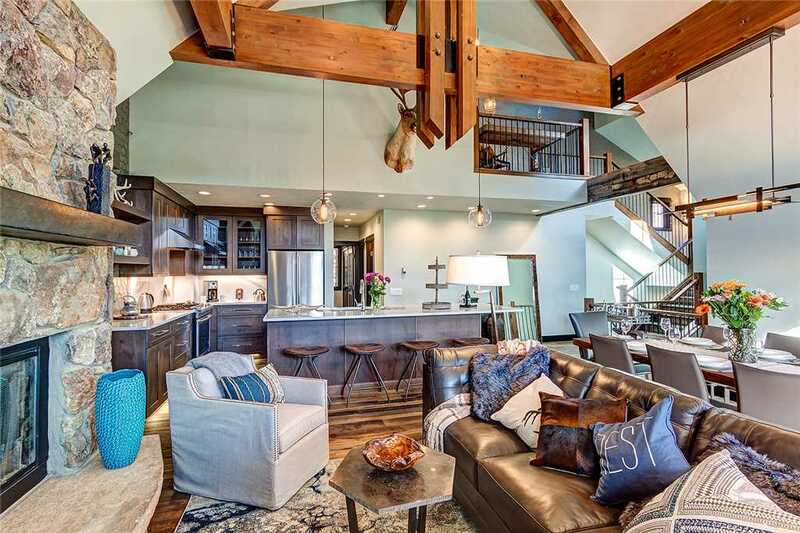 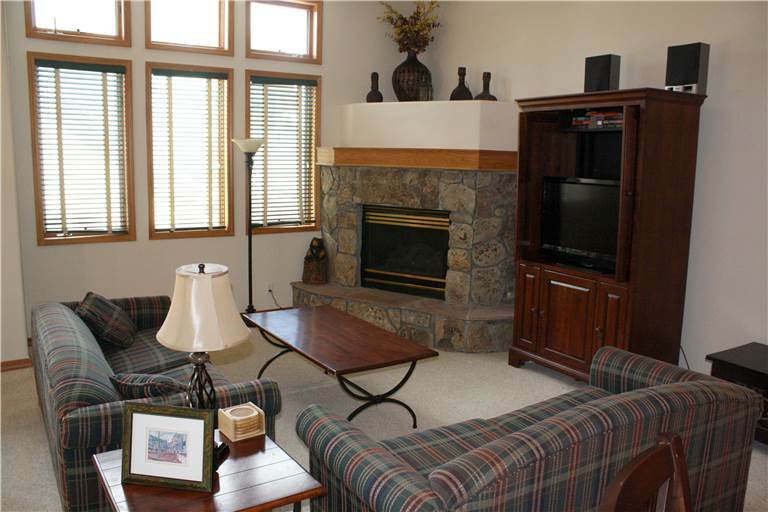 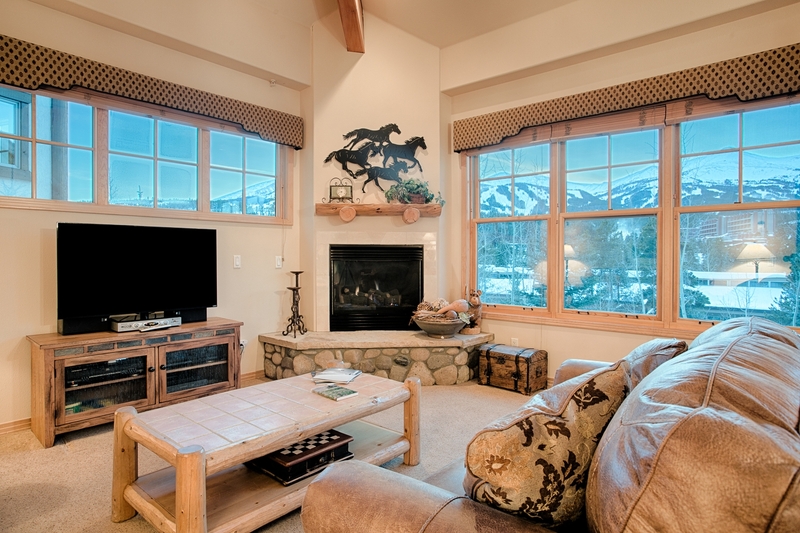 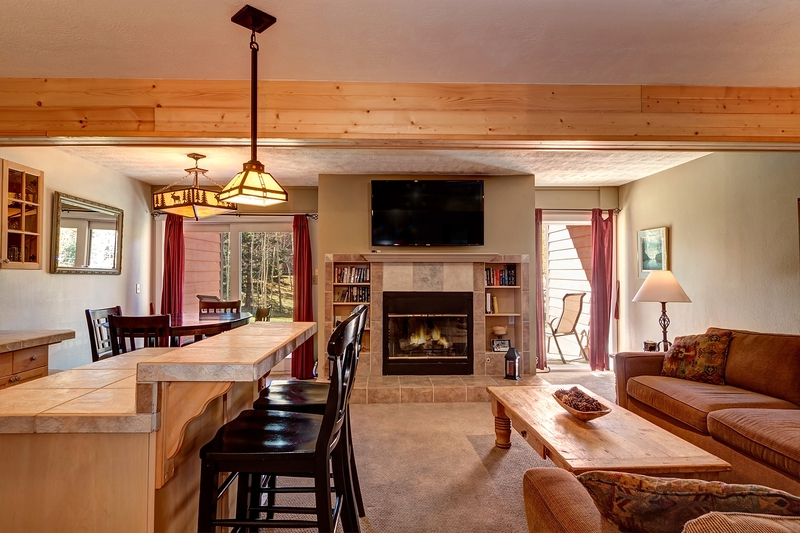 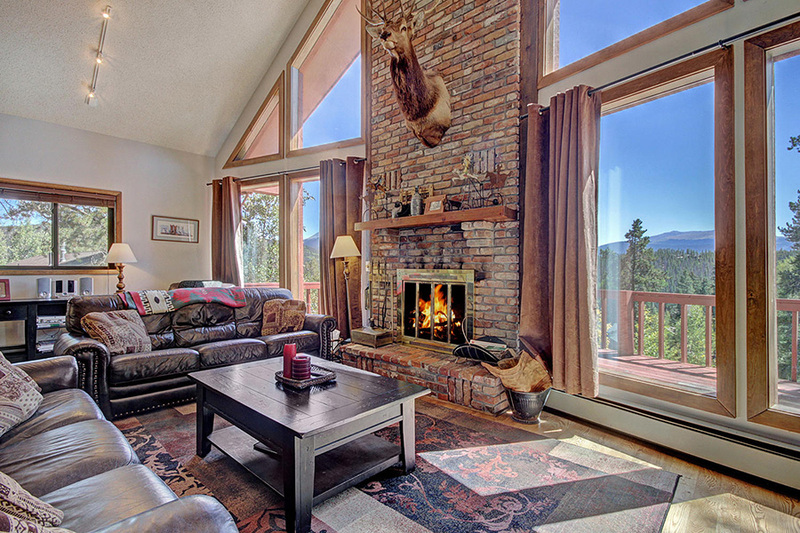 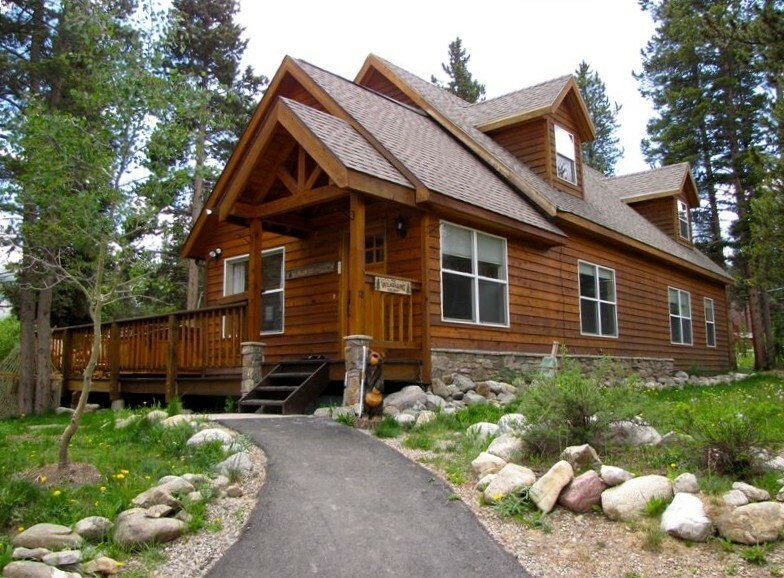 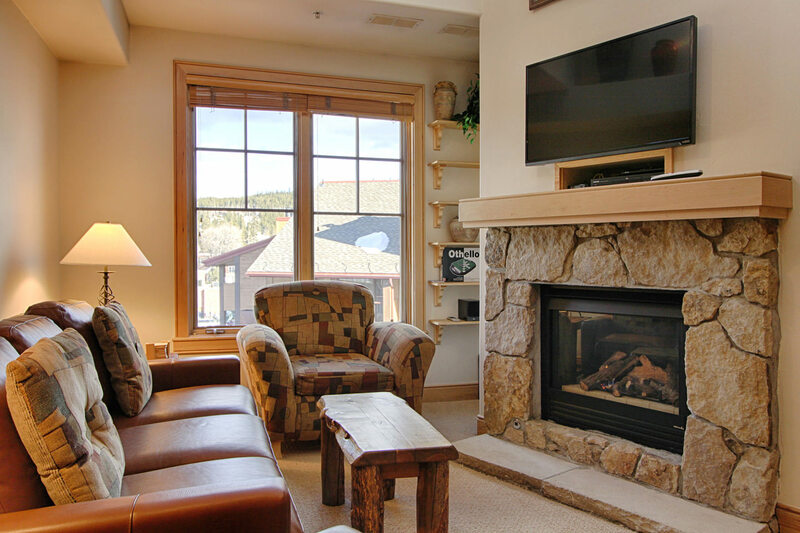 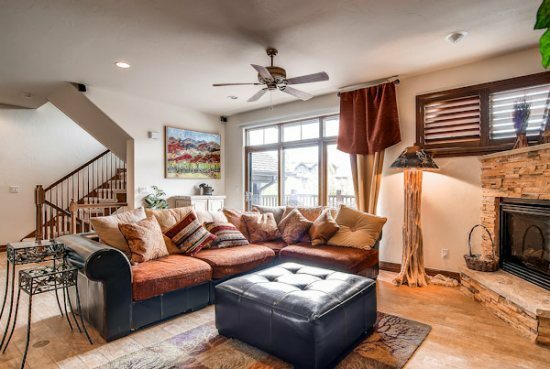 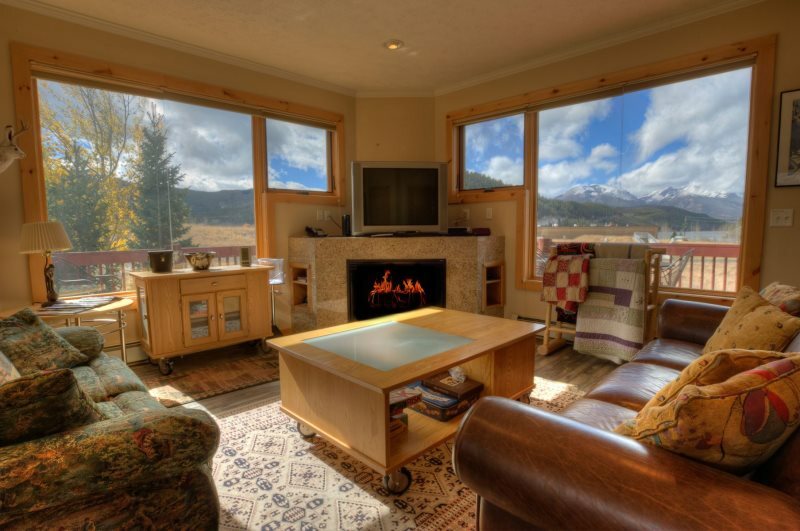 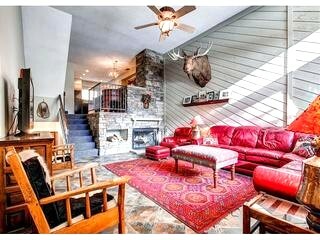 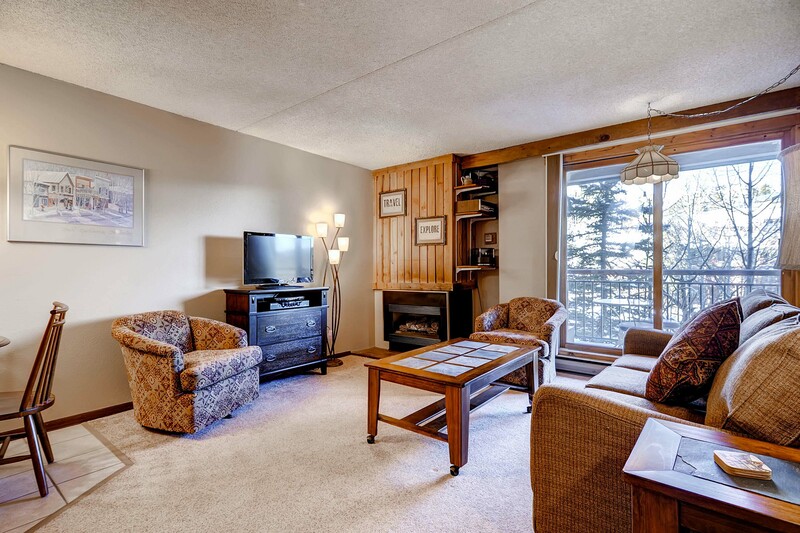 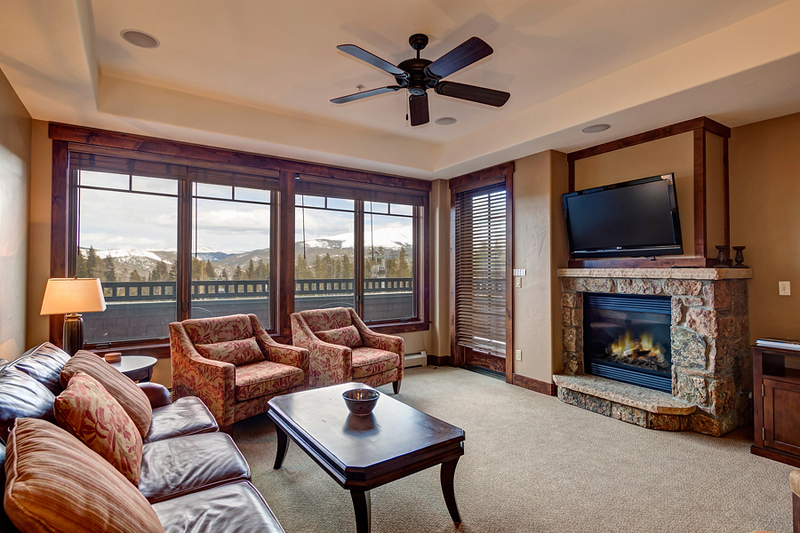 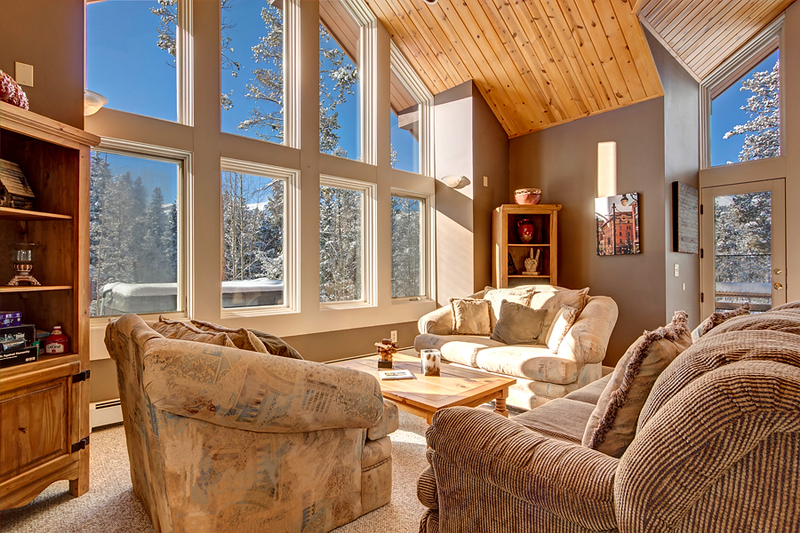 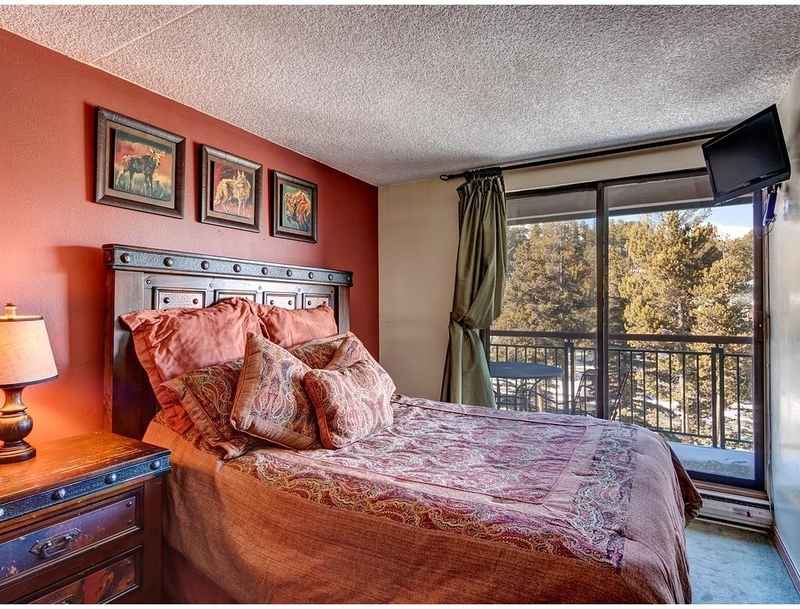 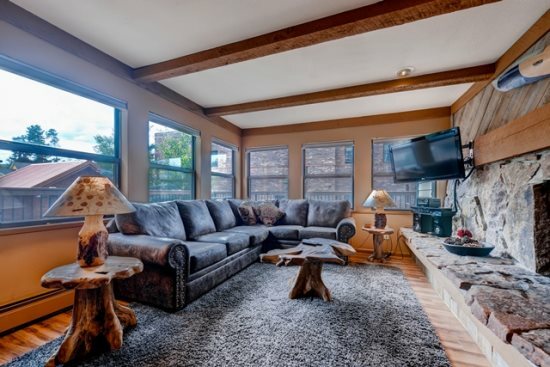 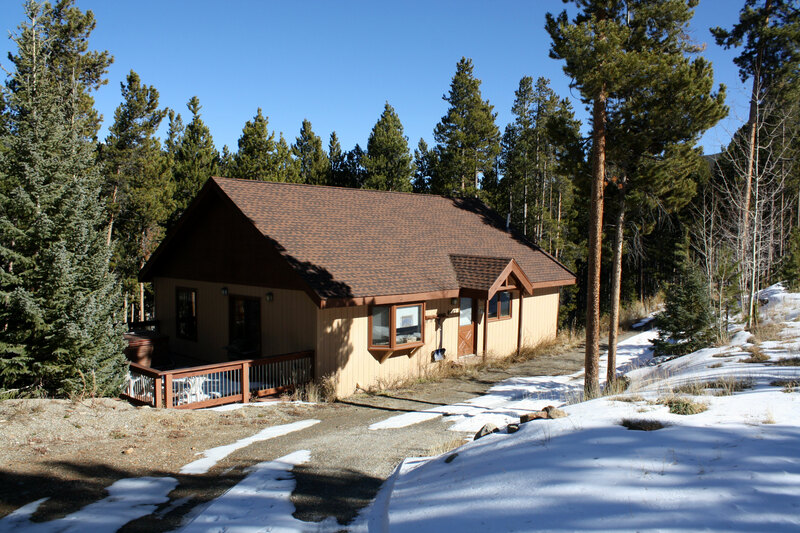 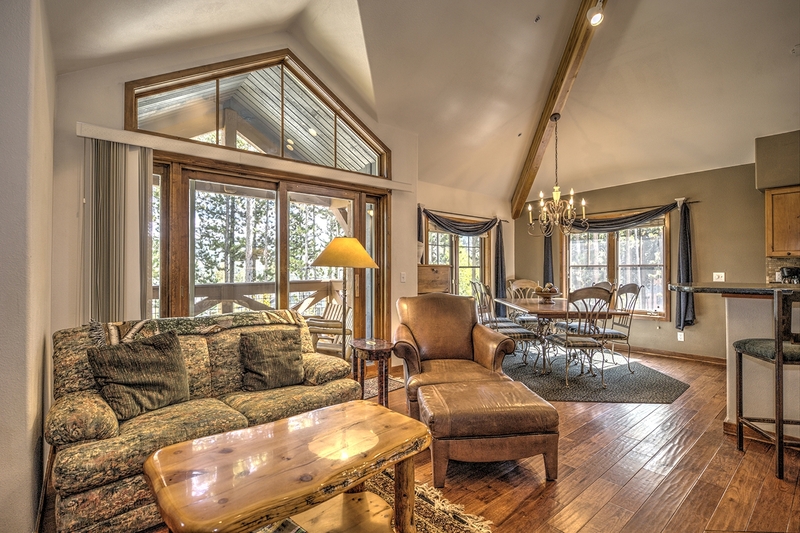 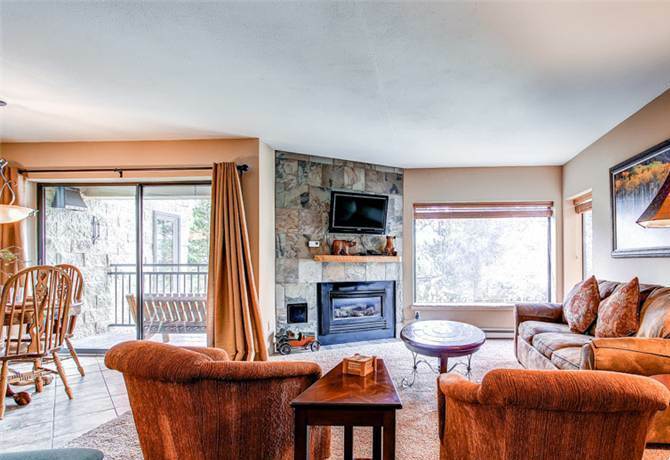 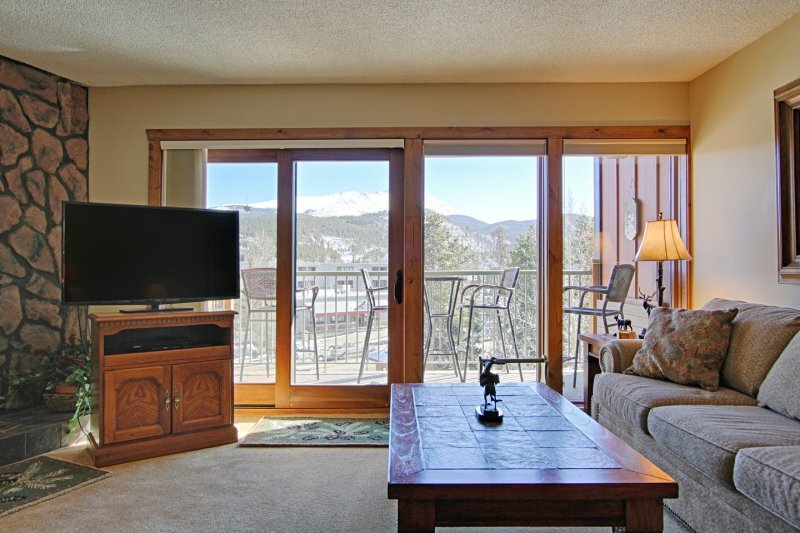 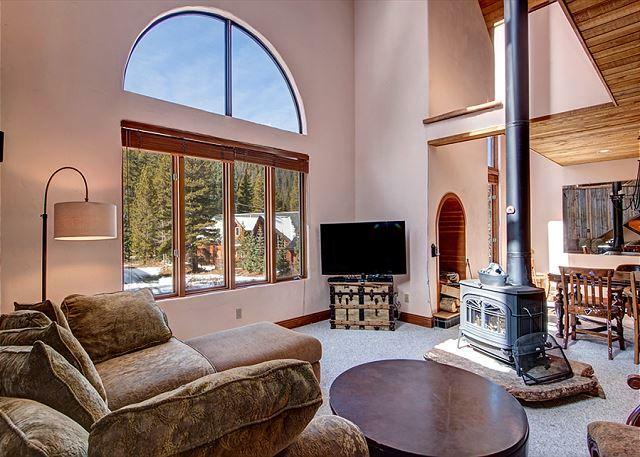 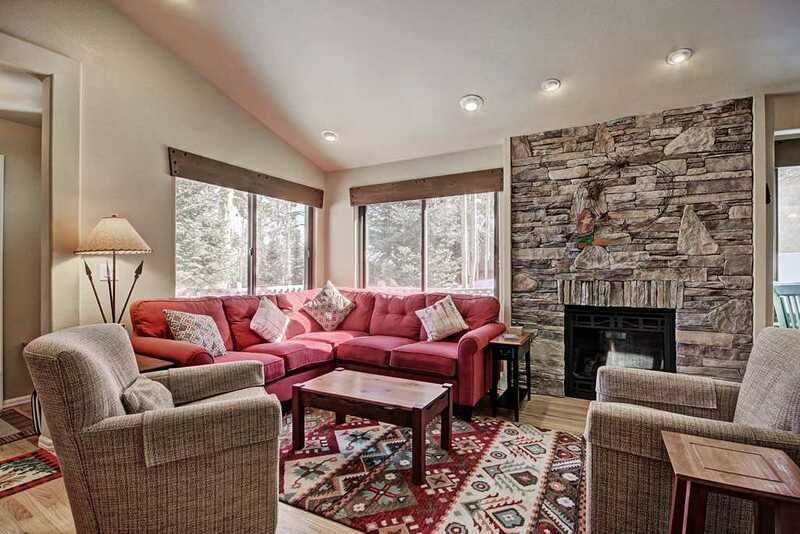 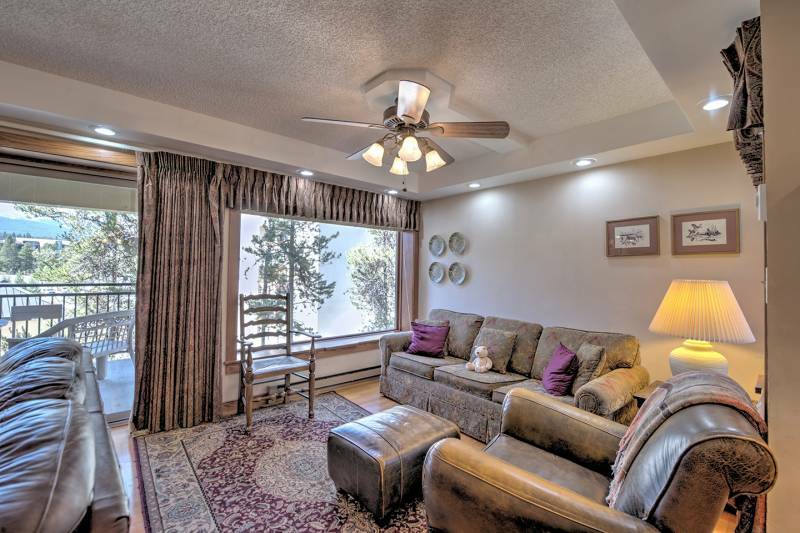 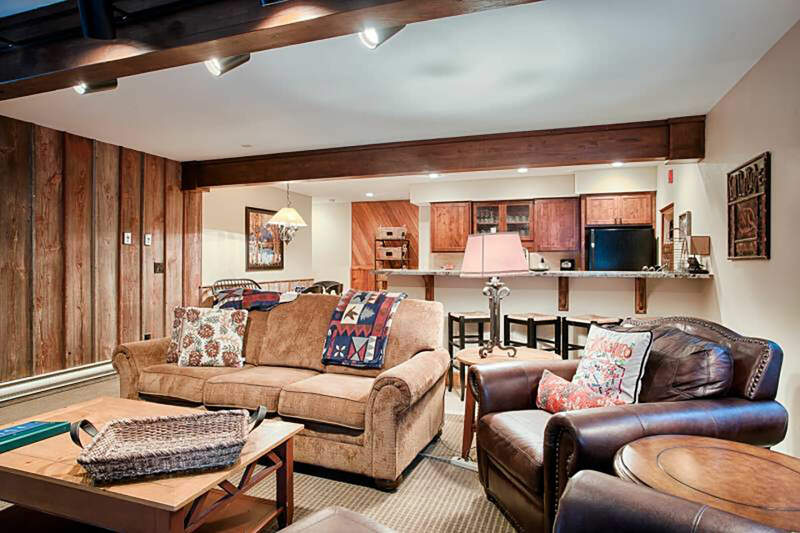 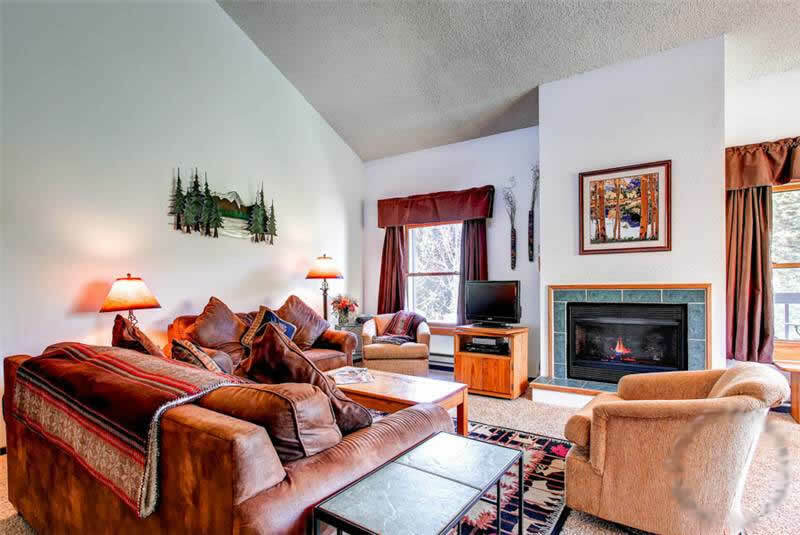 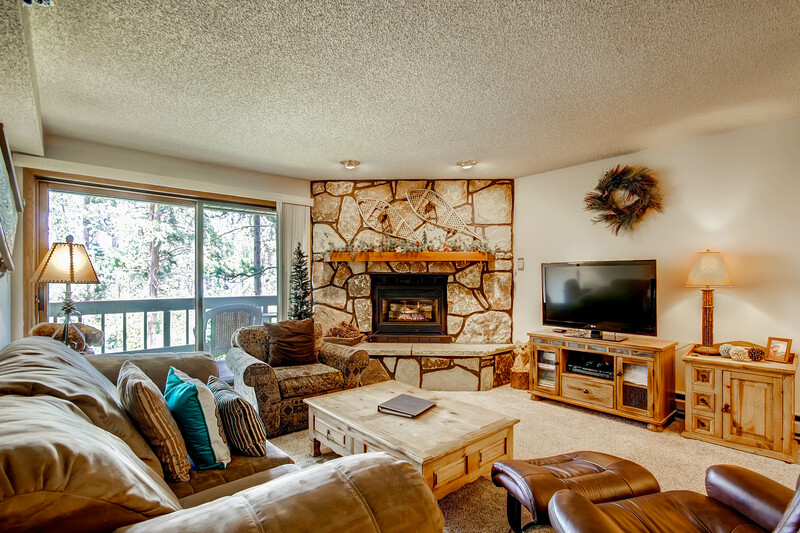 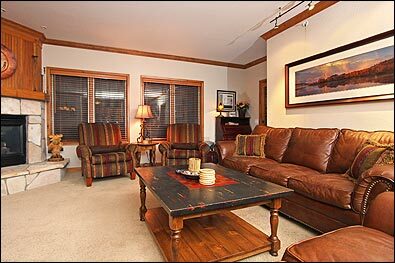 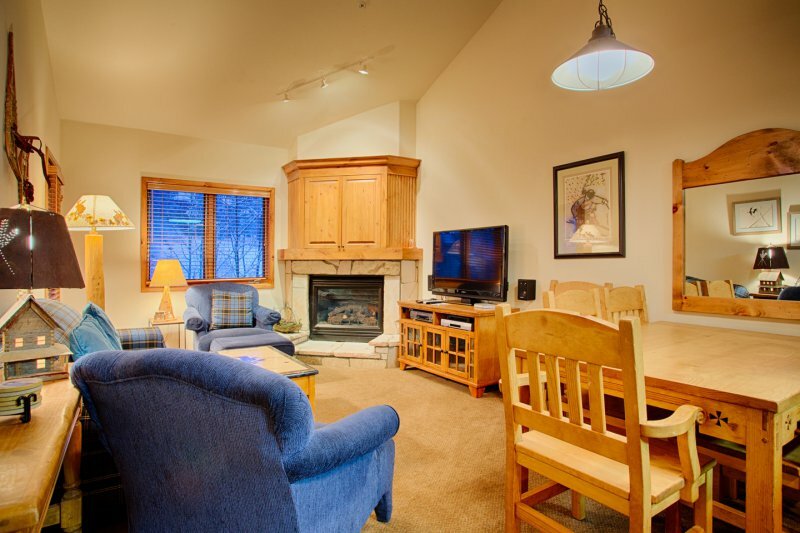 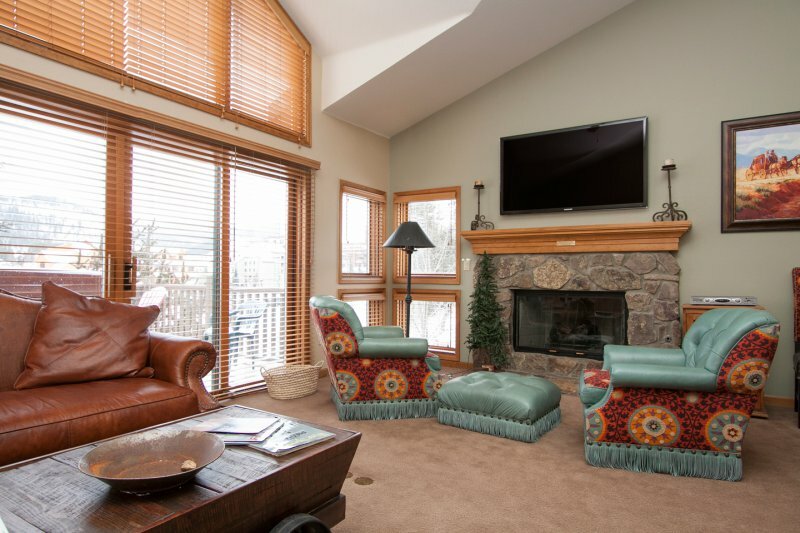 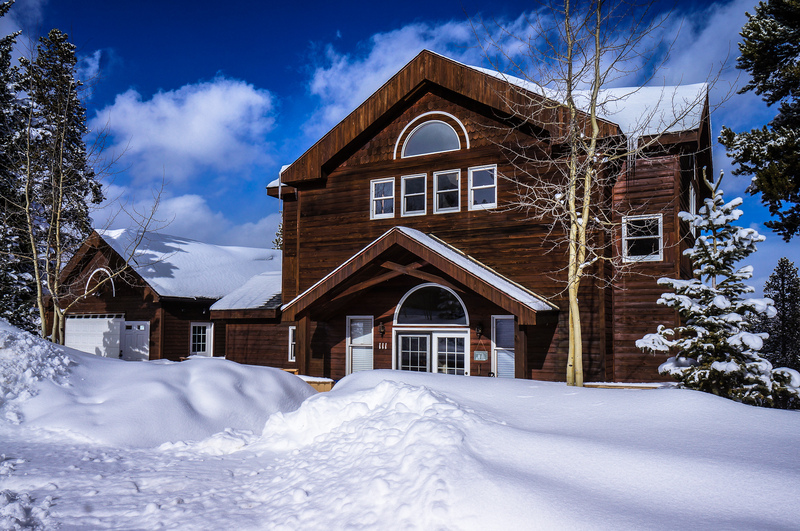 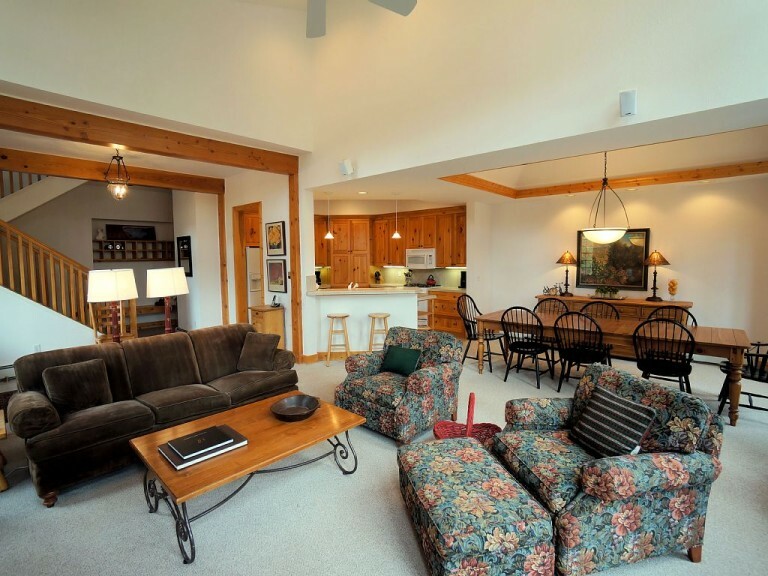 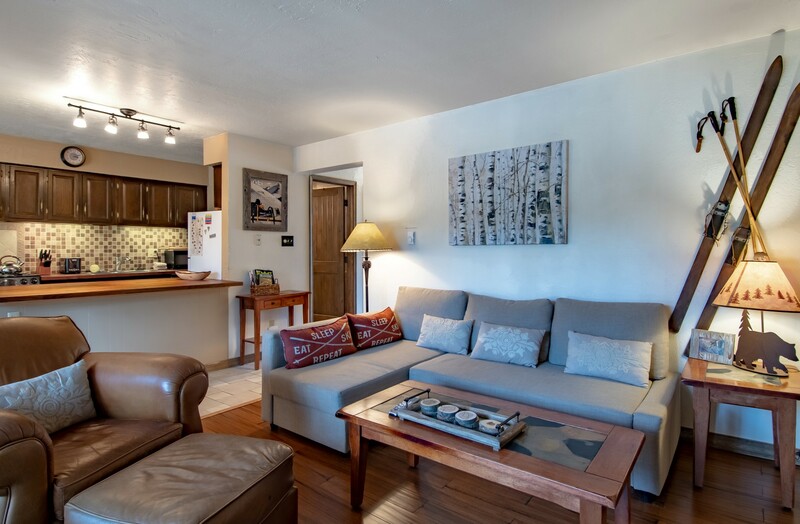 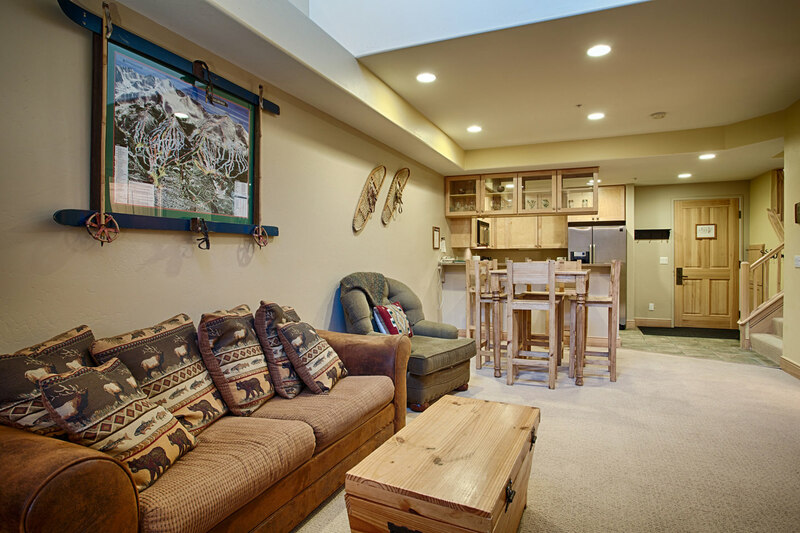 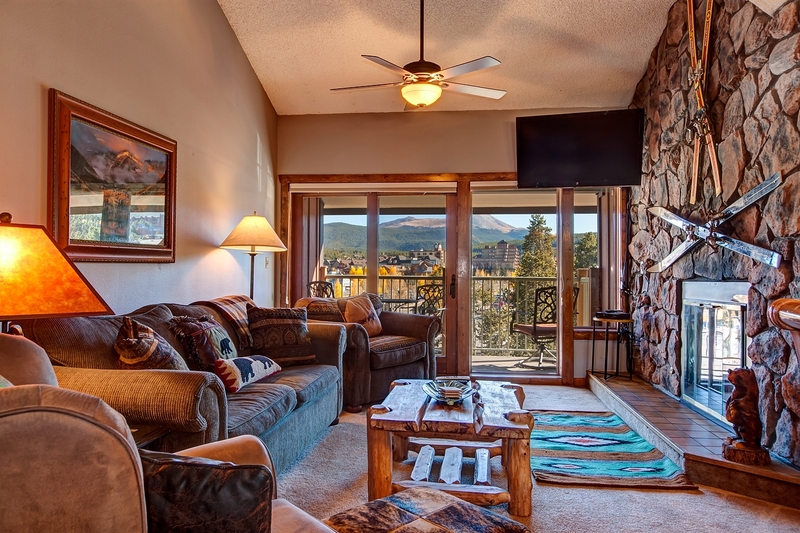 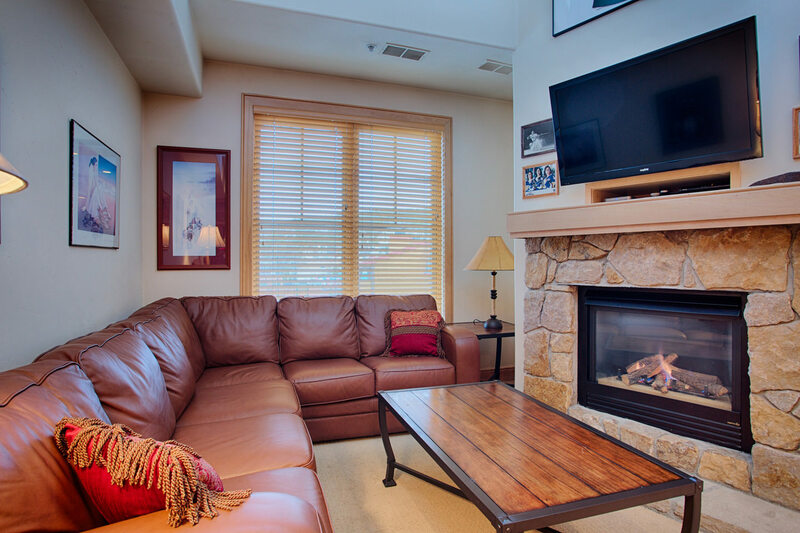 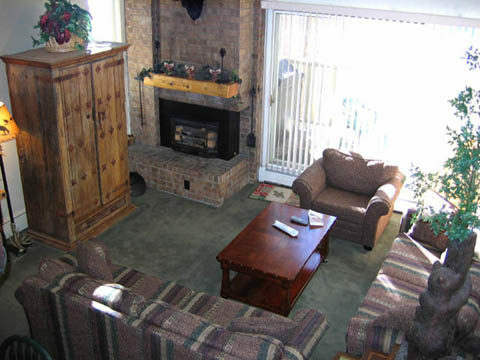 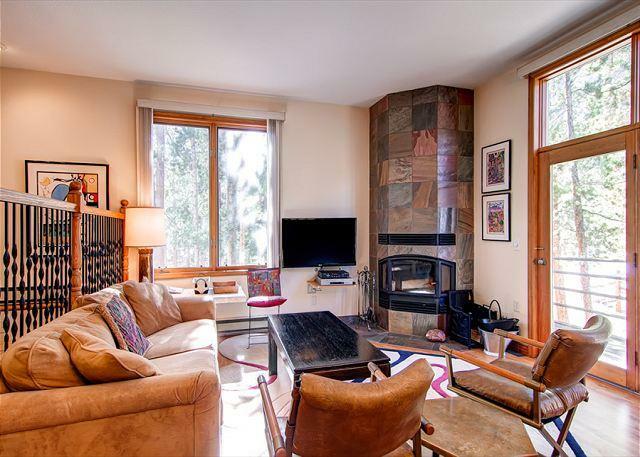 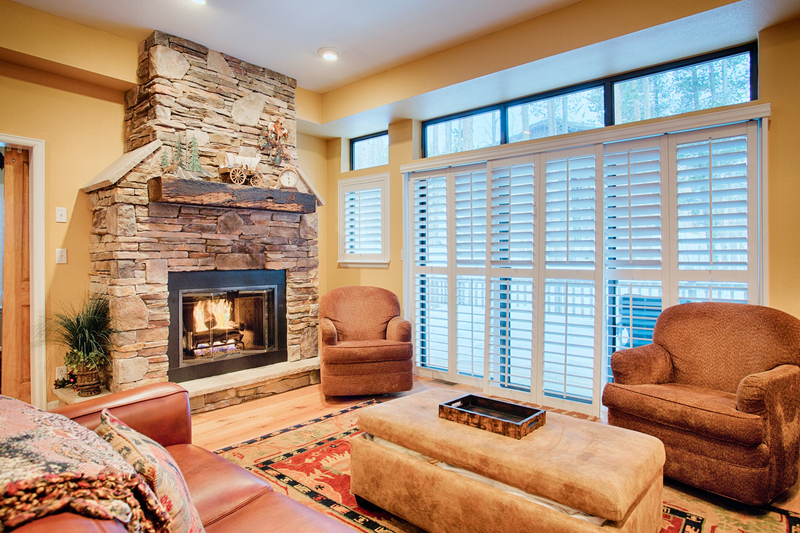 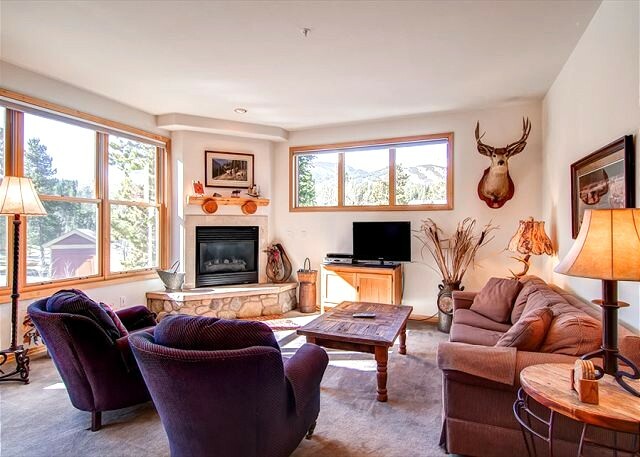 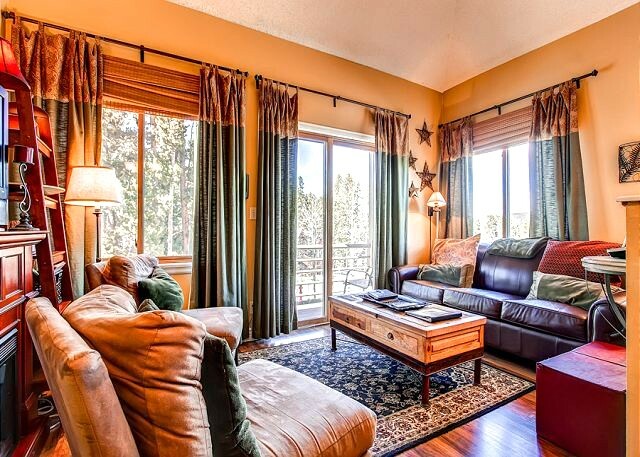 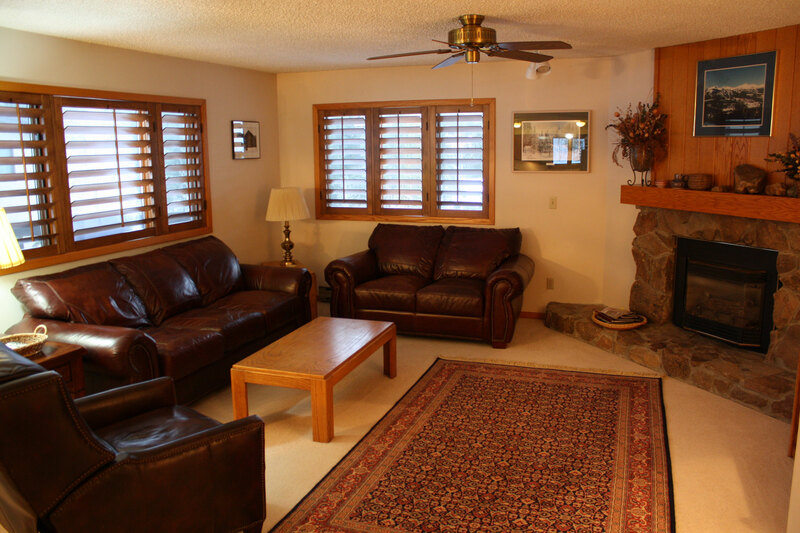 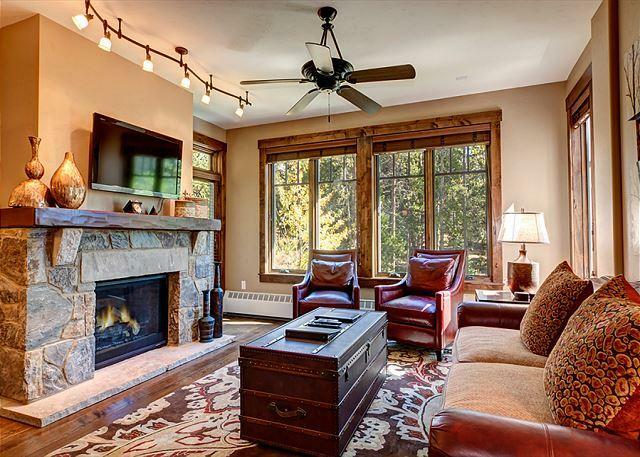 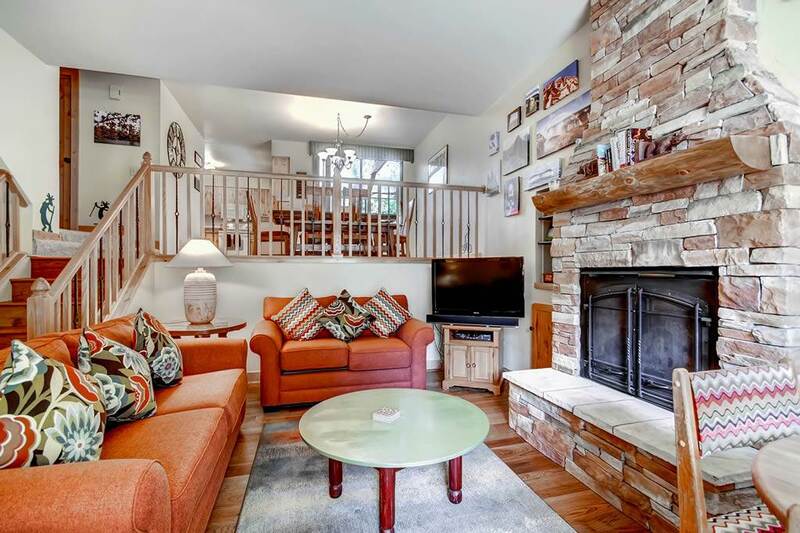 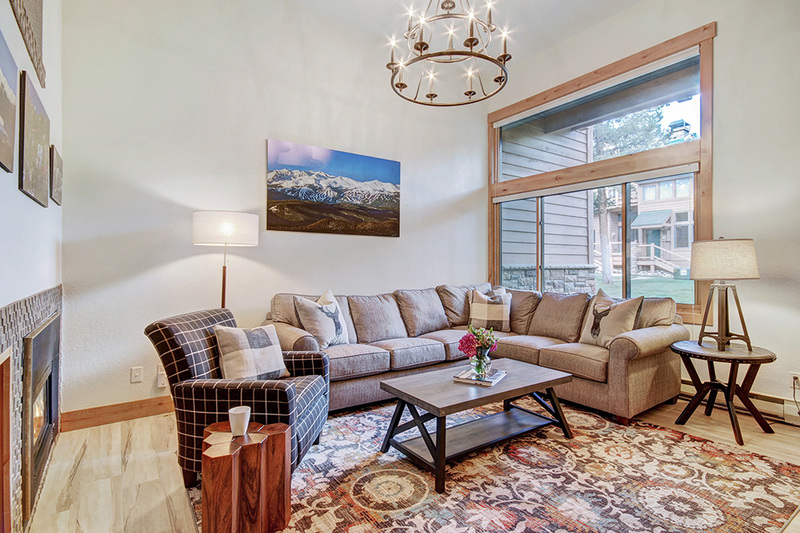 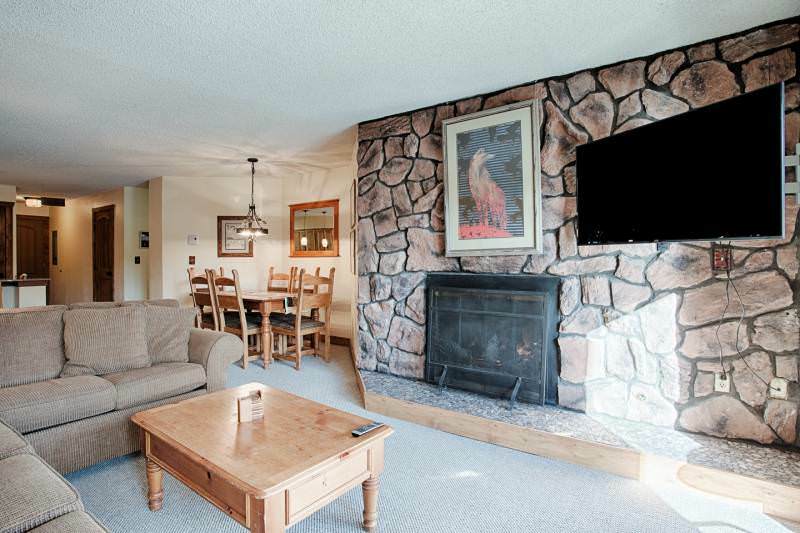 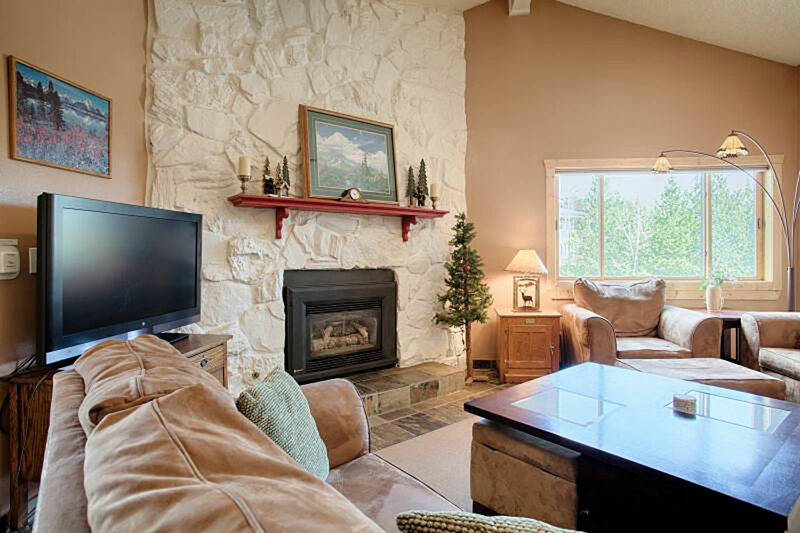 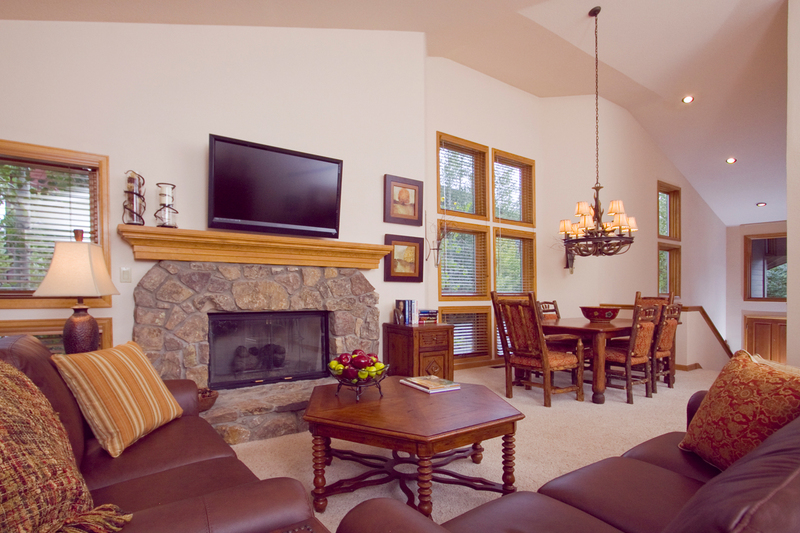 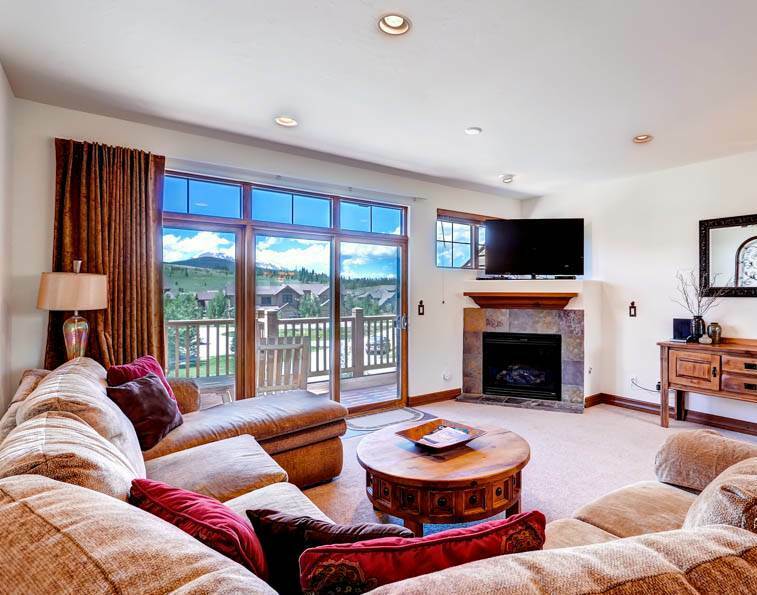 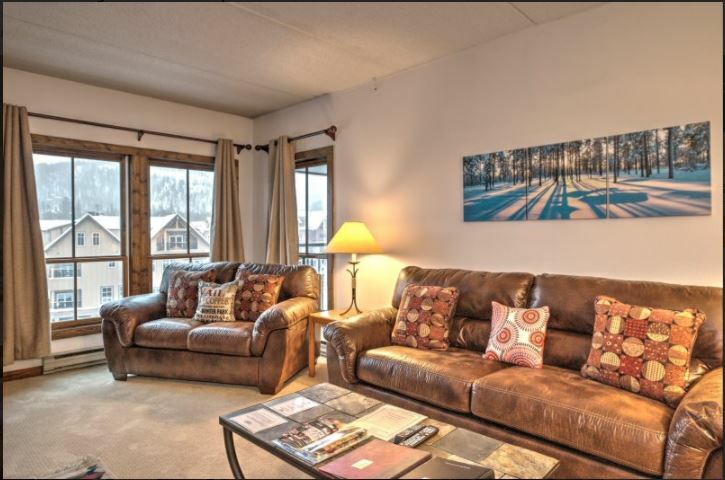 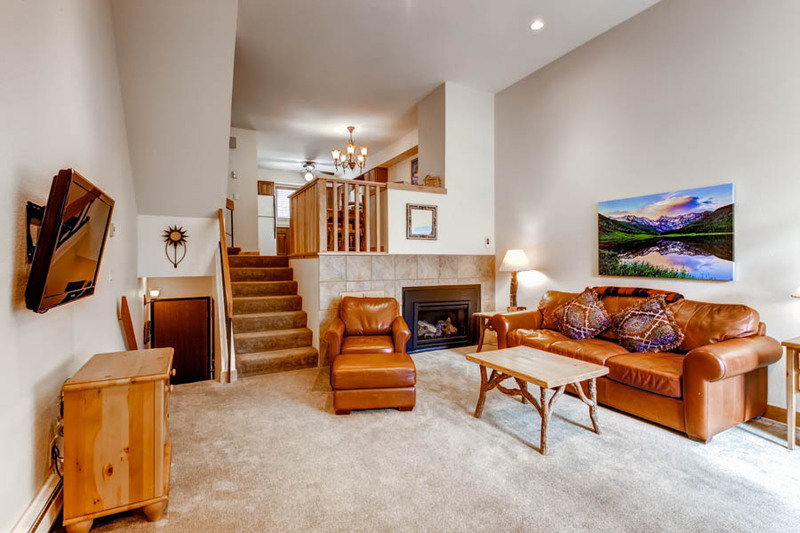 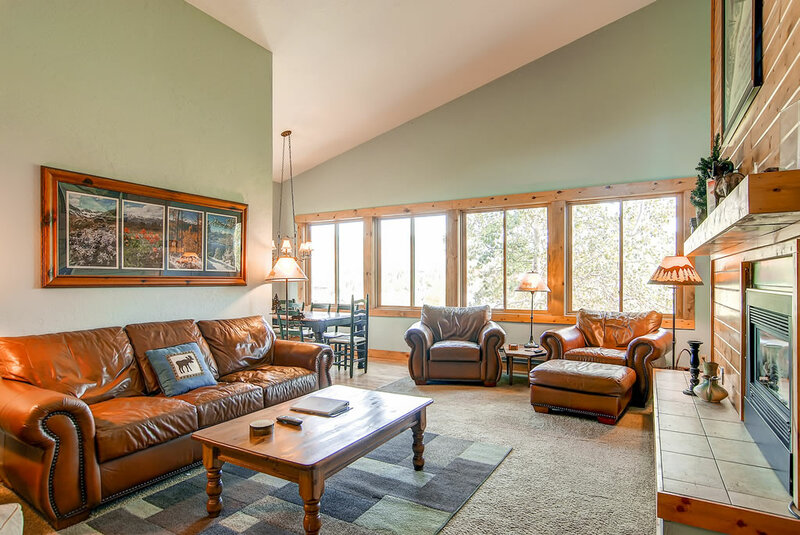 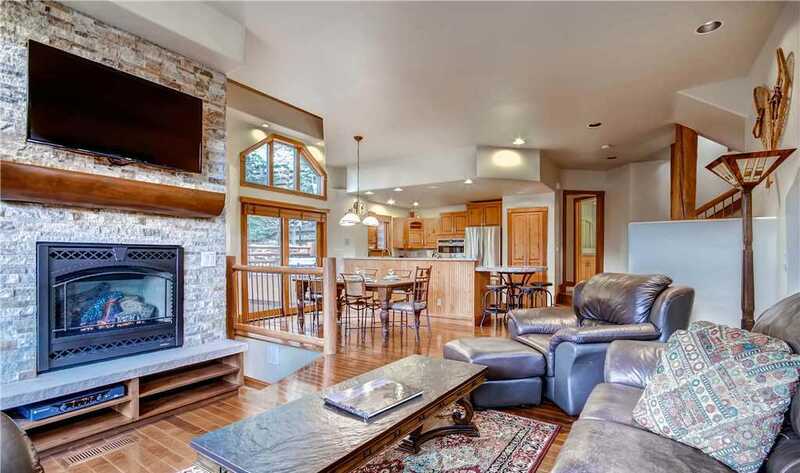 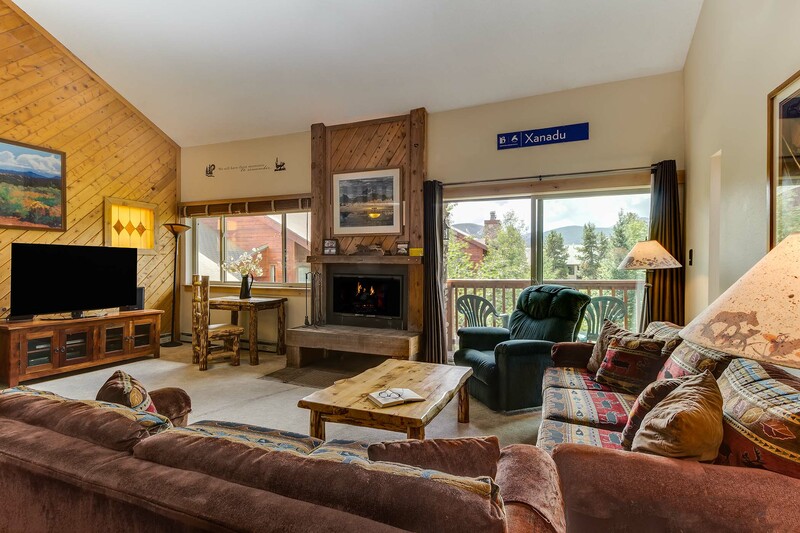 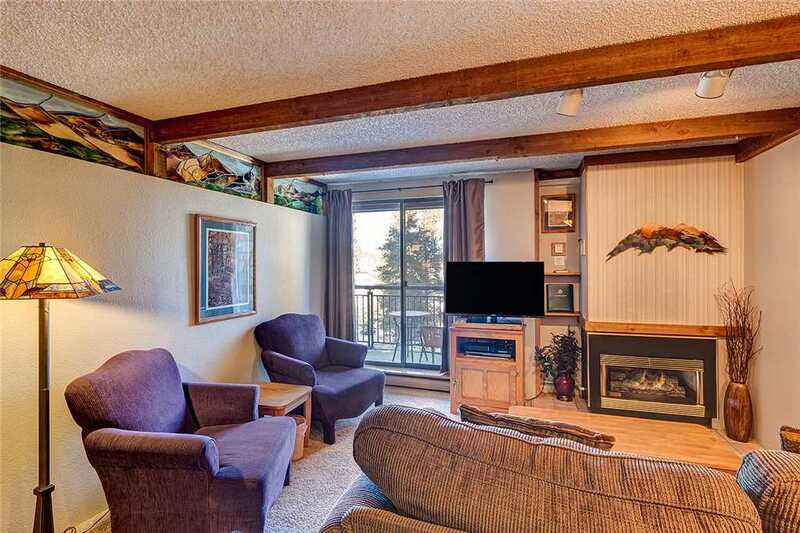 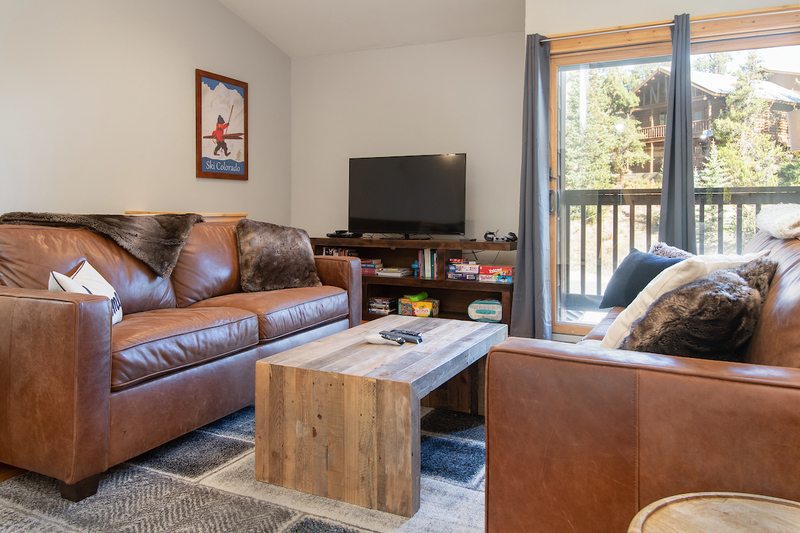 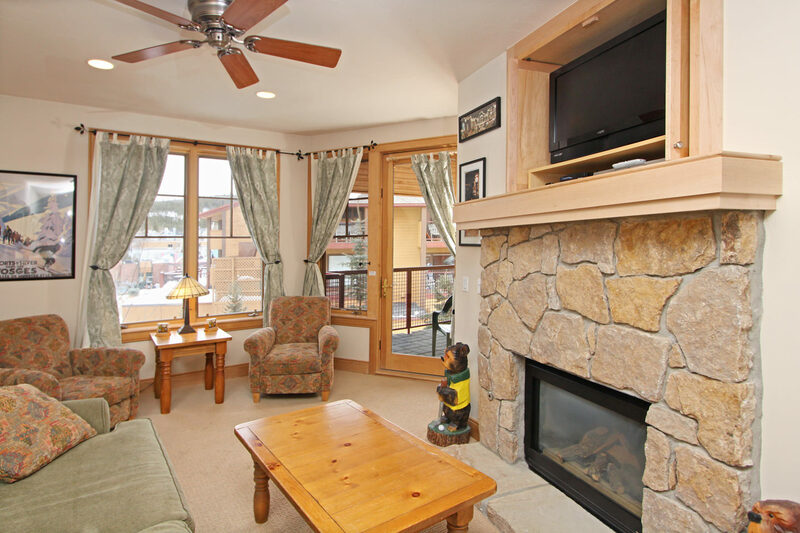 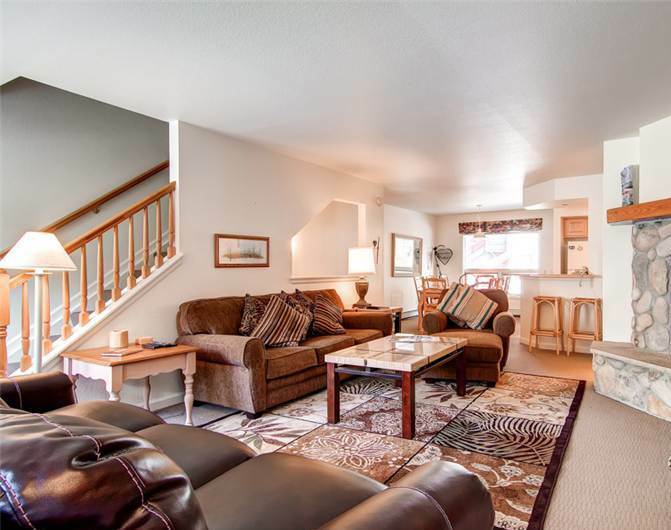 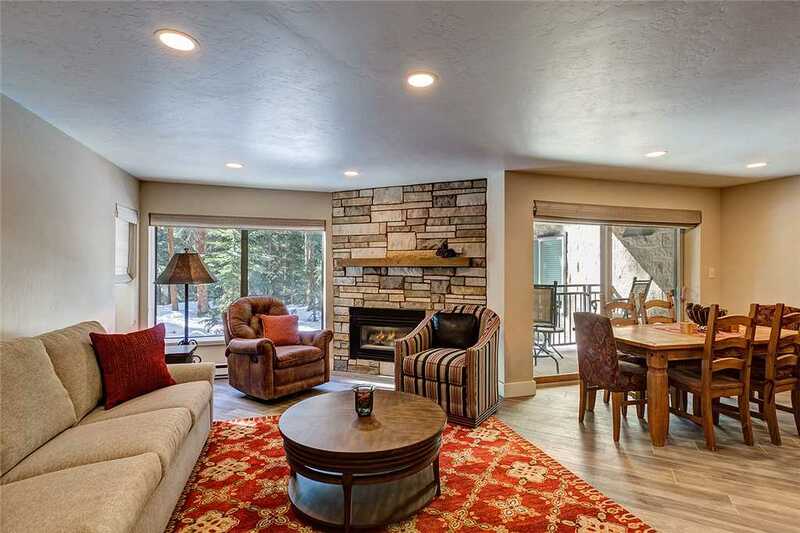 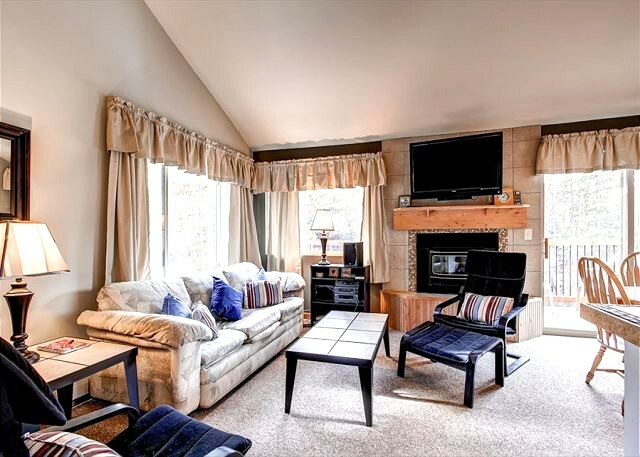 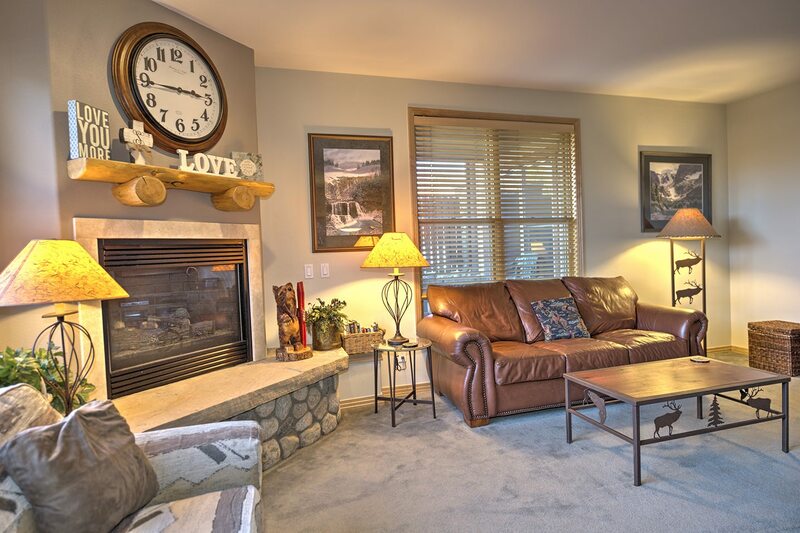 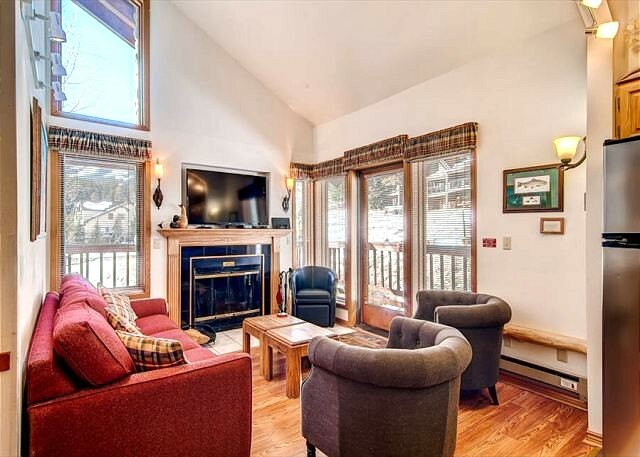 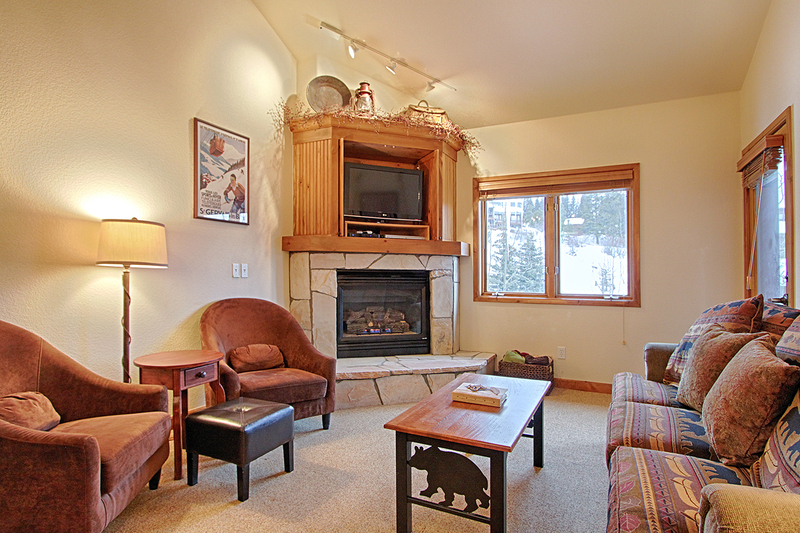 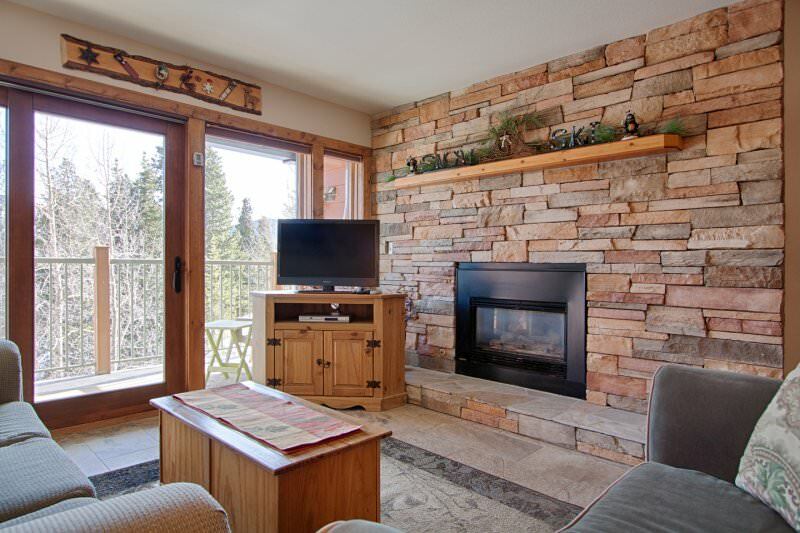 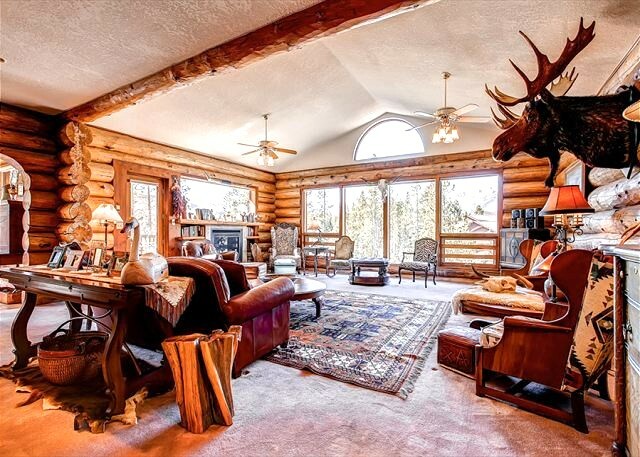 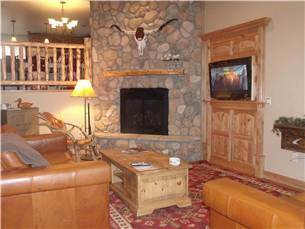 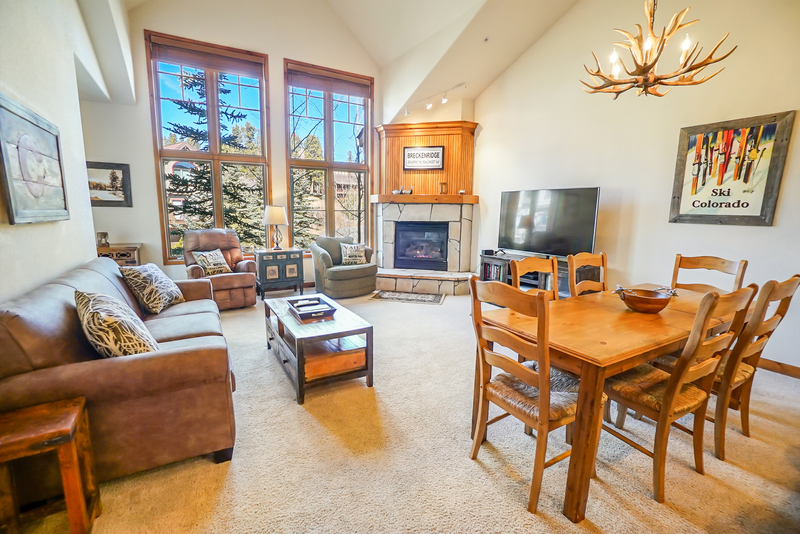 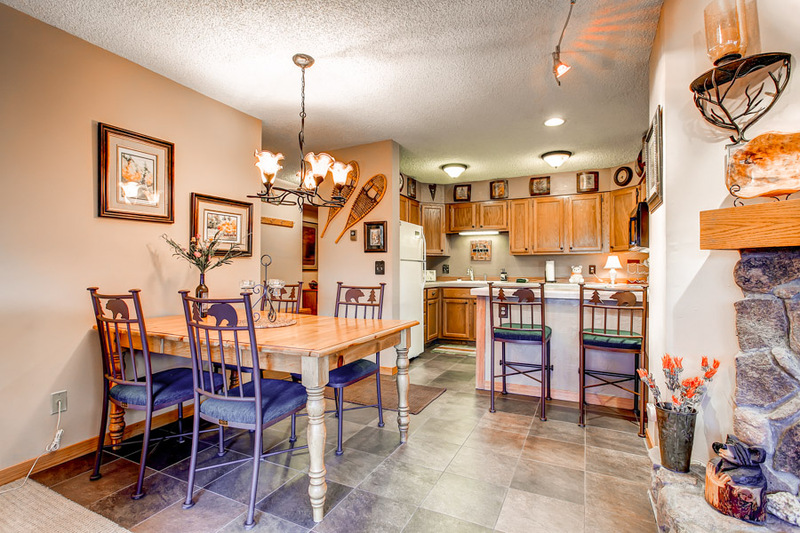 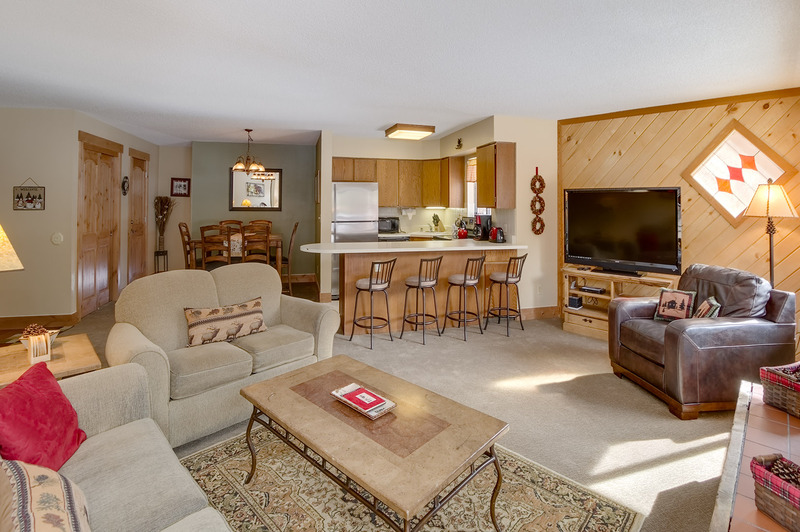 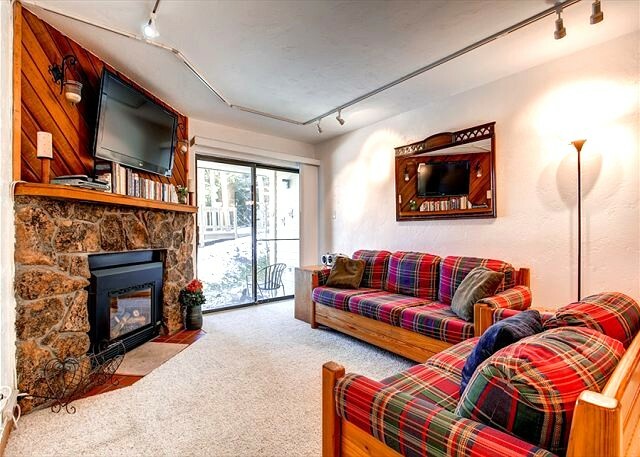 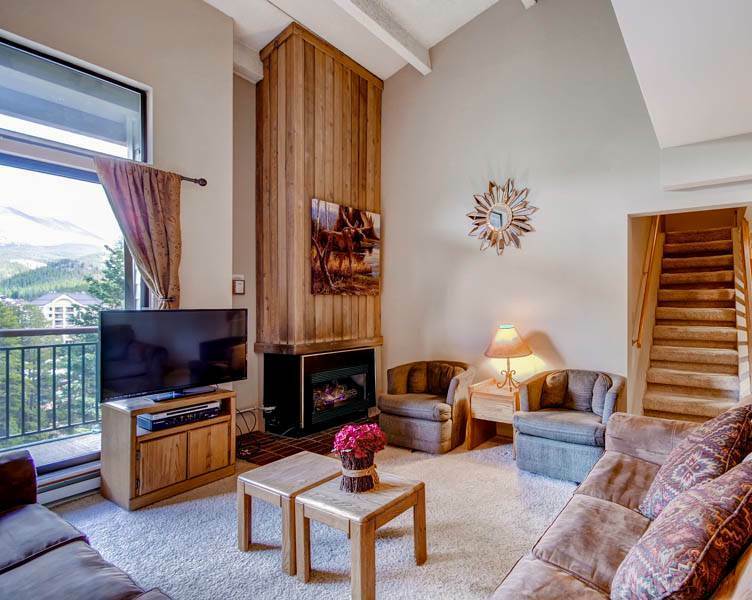 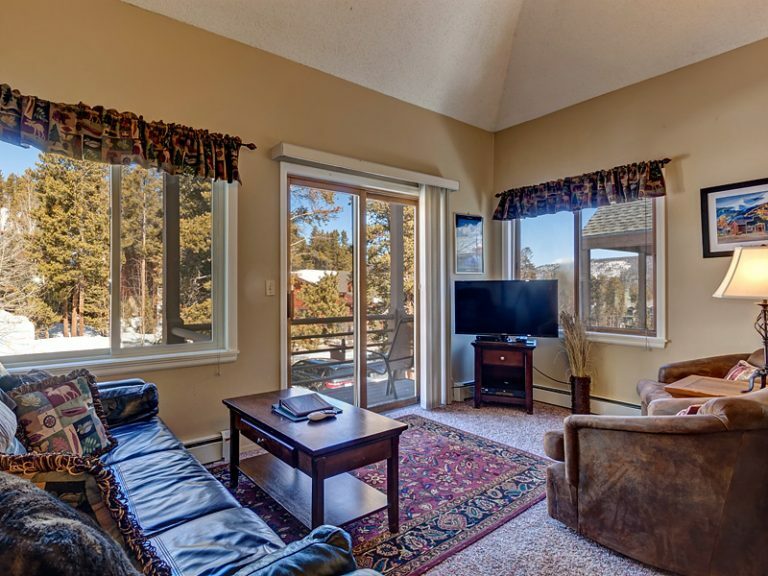 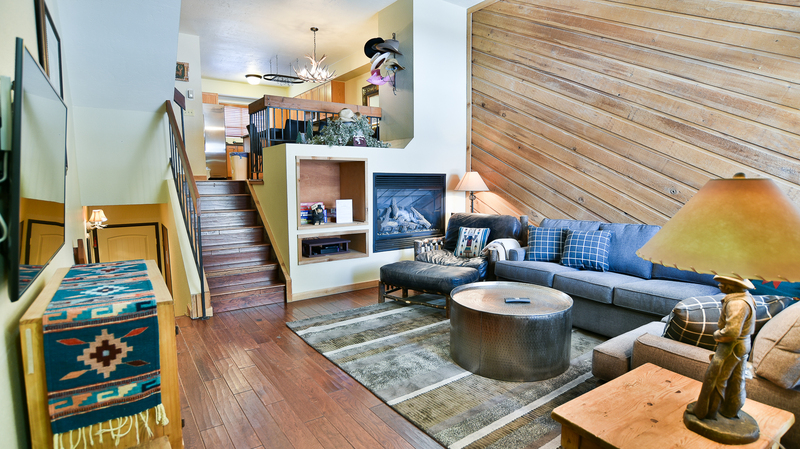 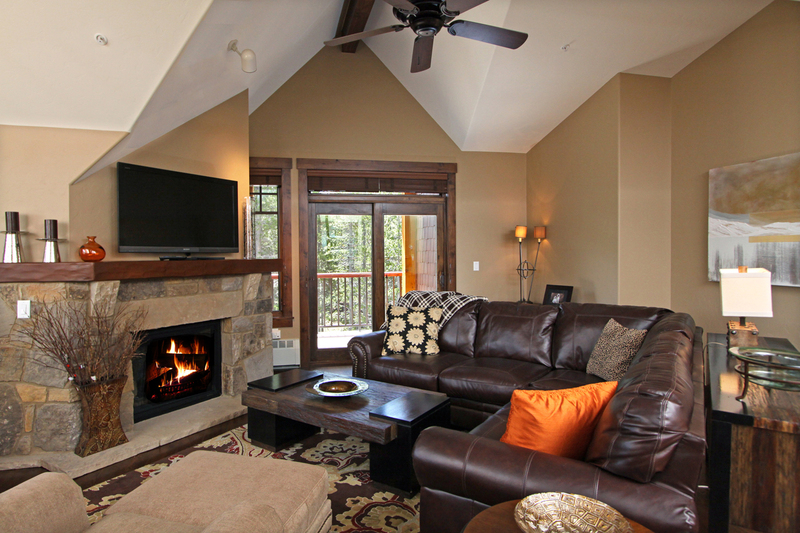 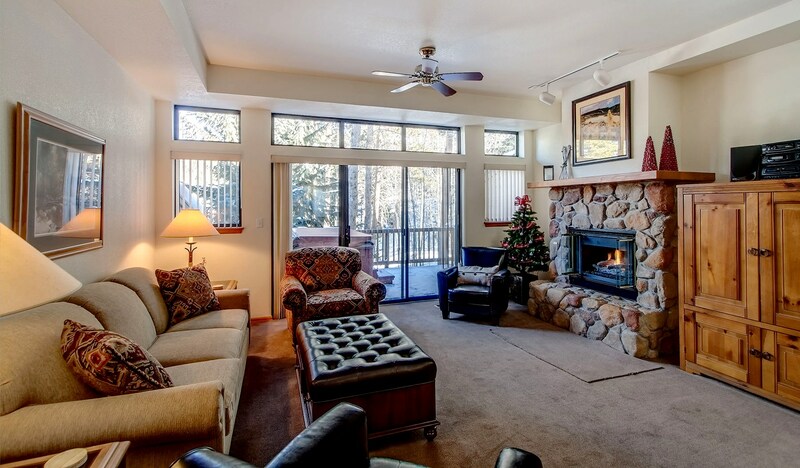 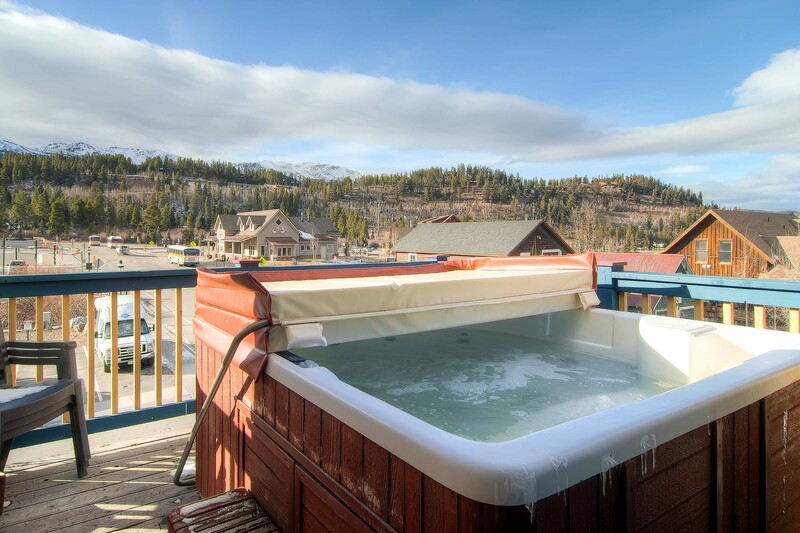 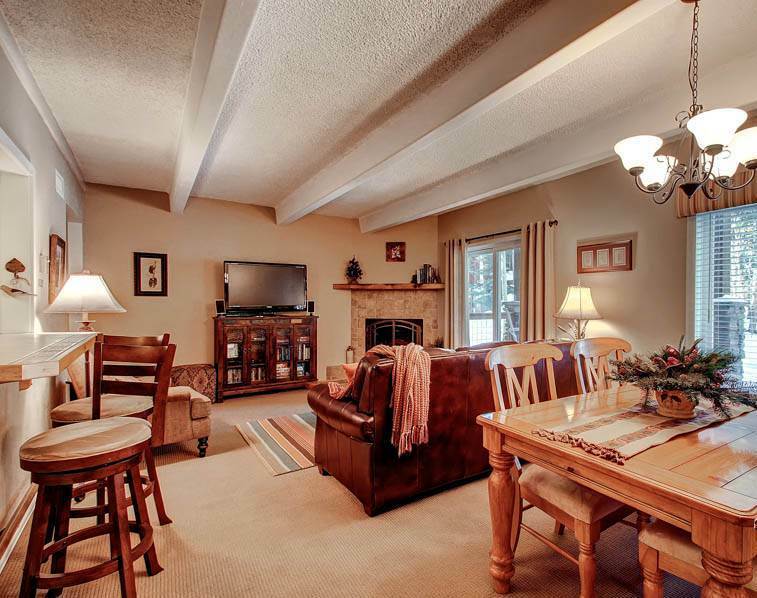 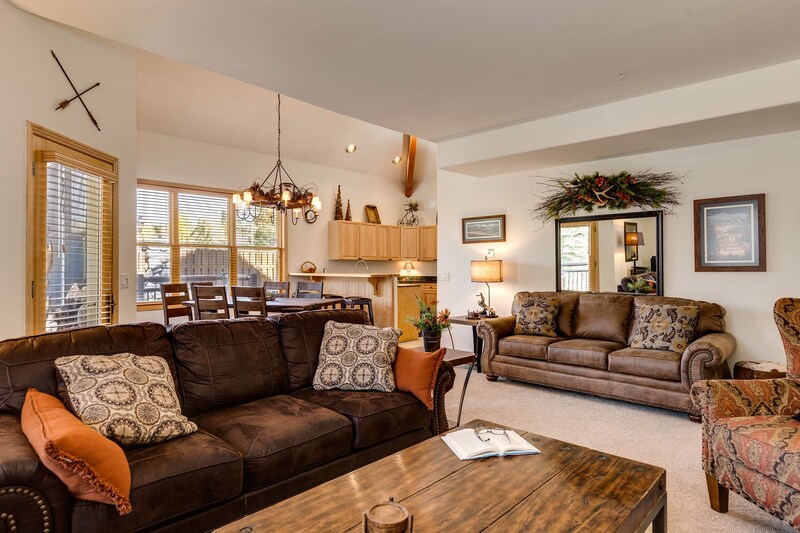 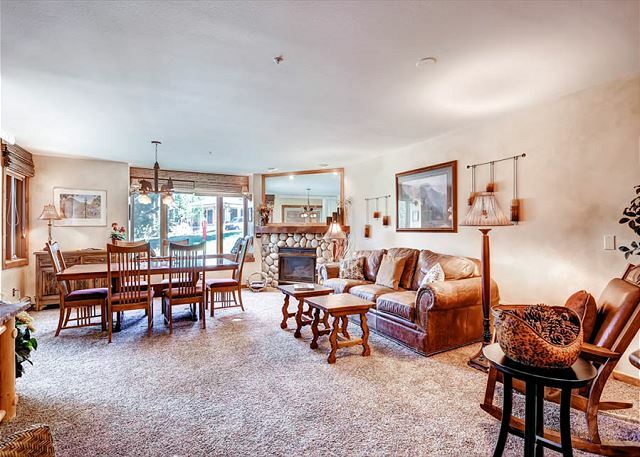 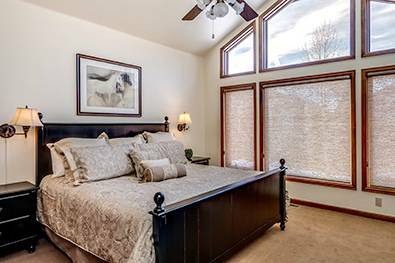 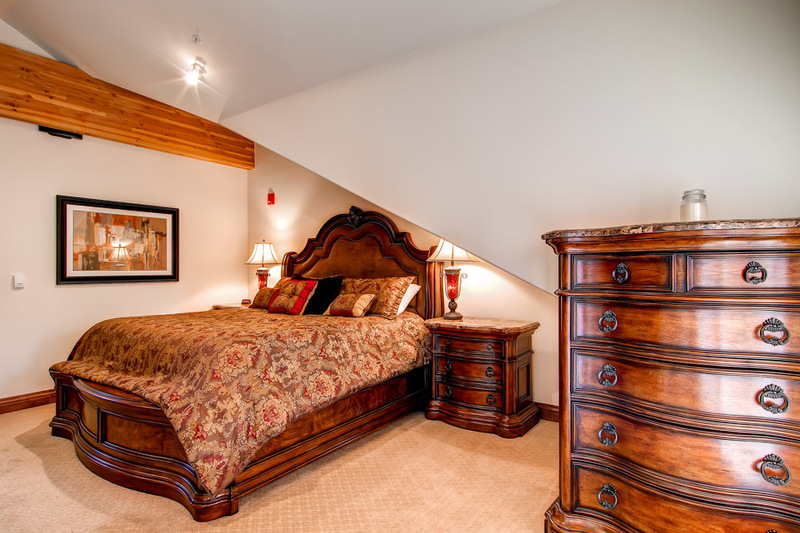 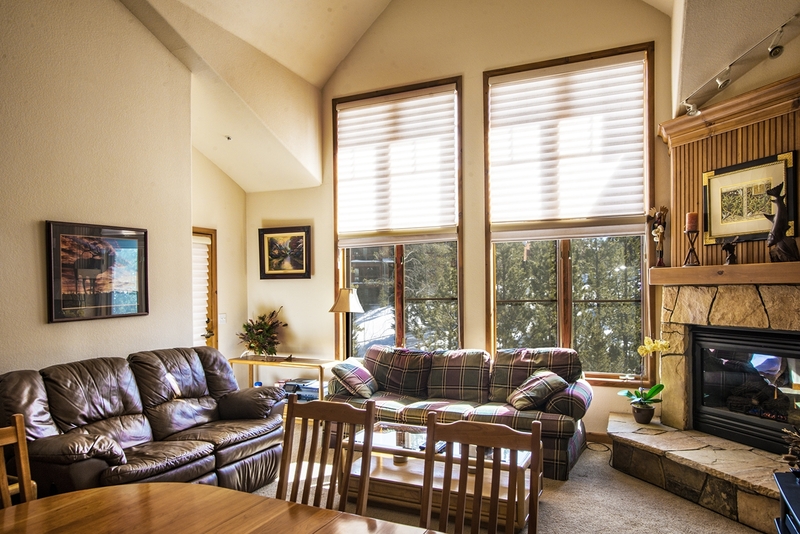 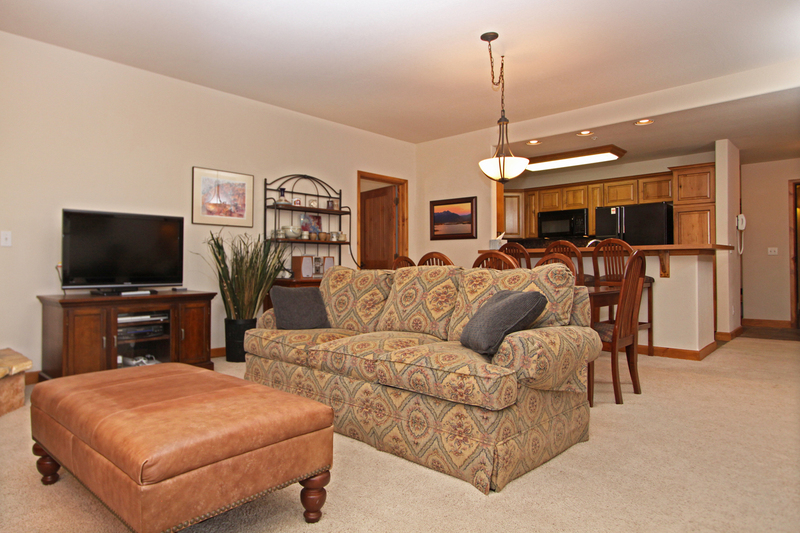 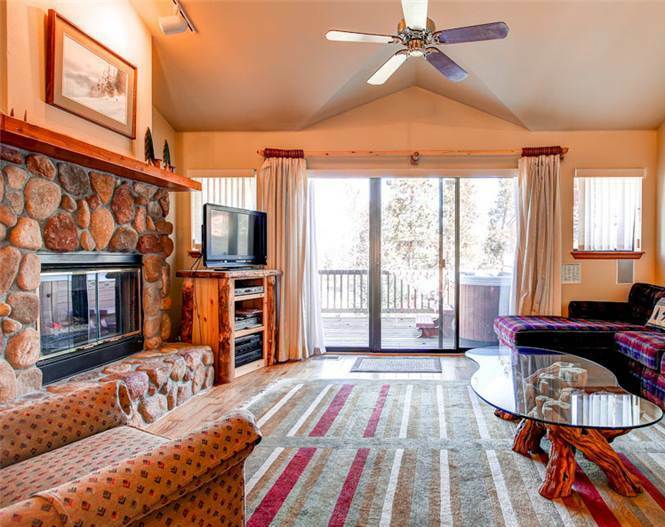 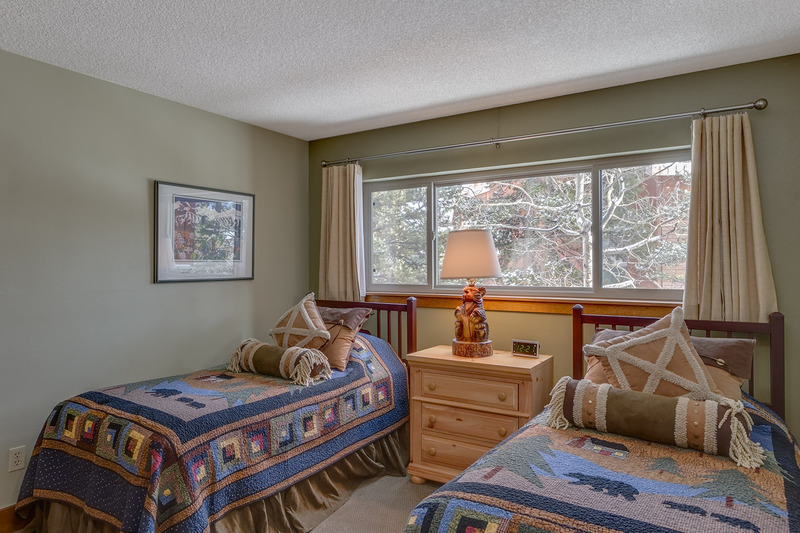 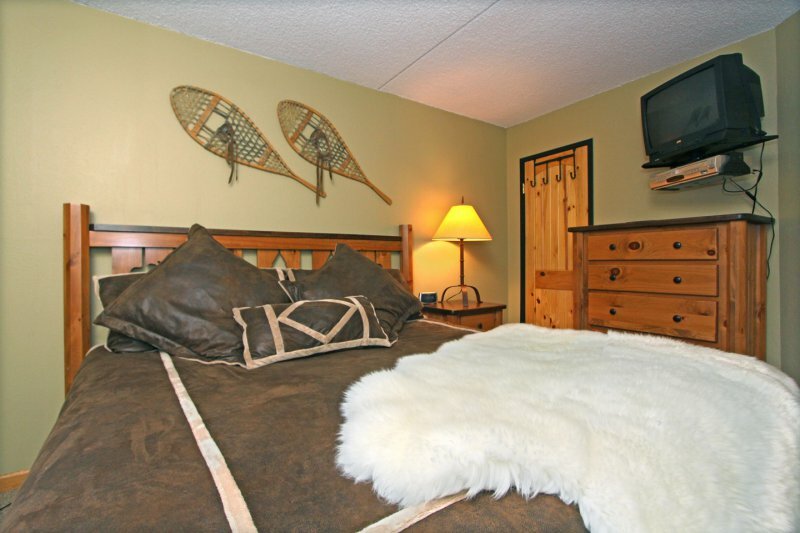 Foxed Inn Breckenridge is a cozy mountain triplex that you, your family and friends (even the four-legged variety) will love. 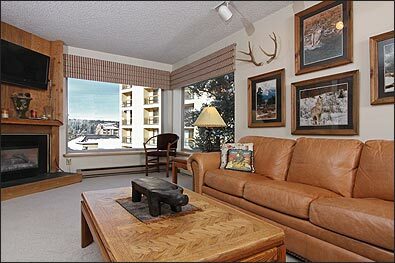 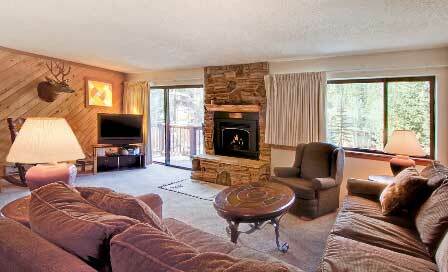 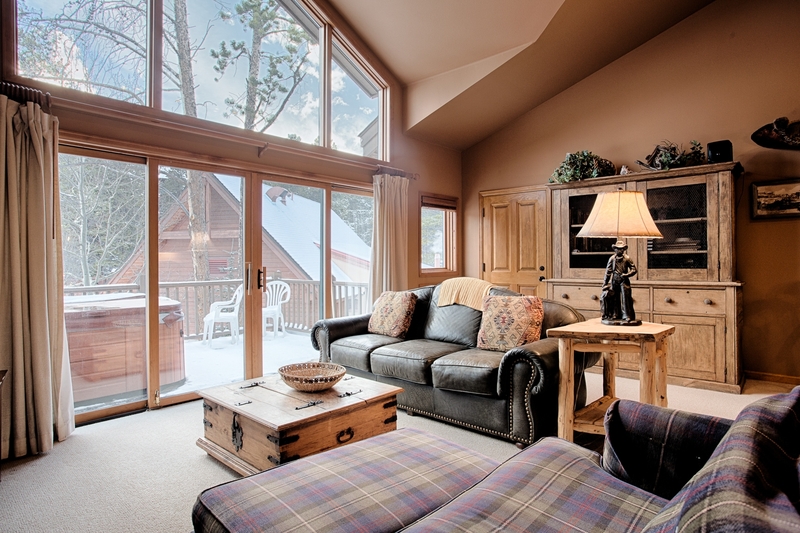 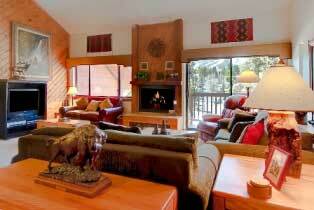 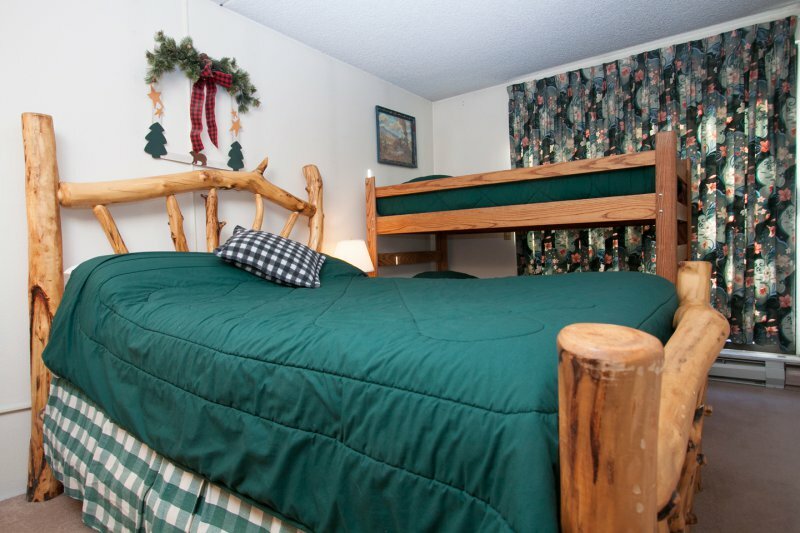 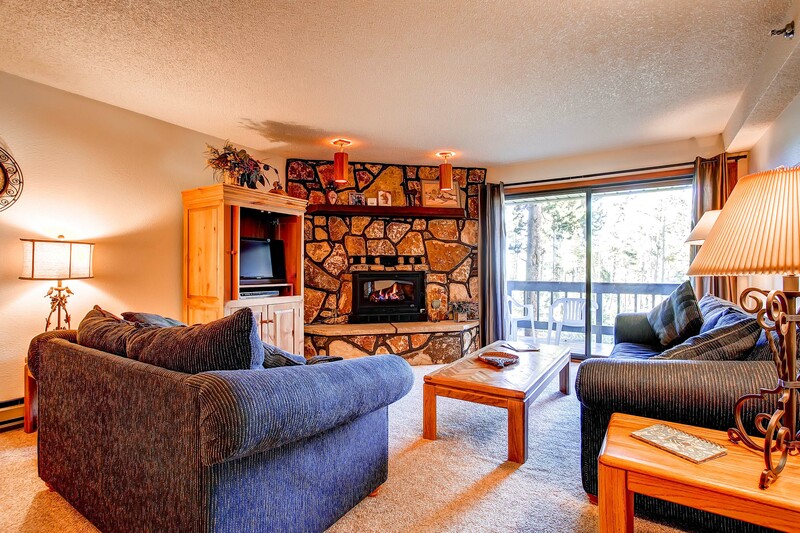 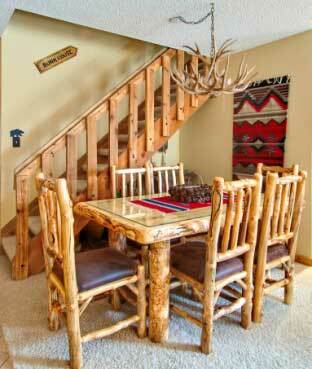 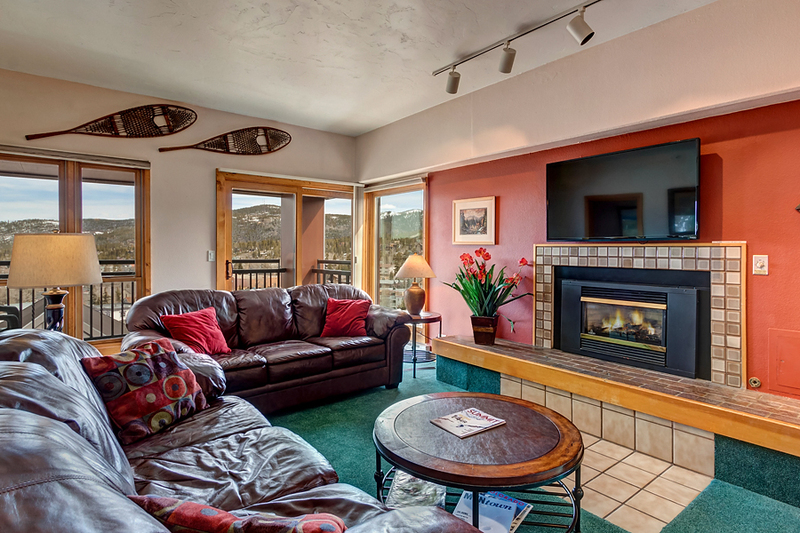 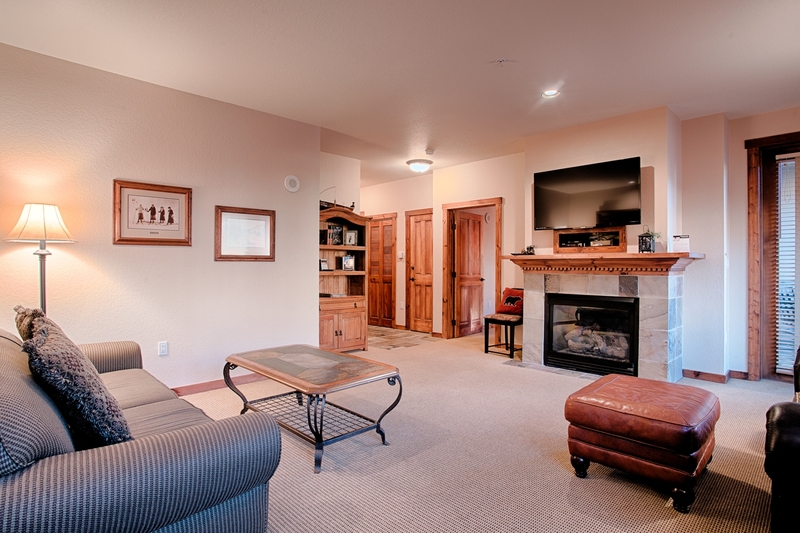 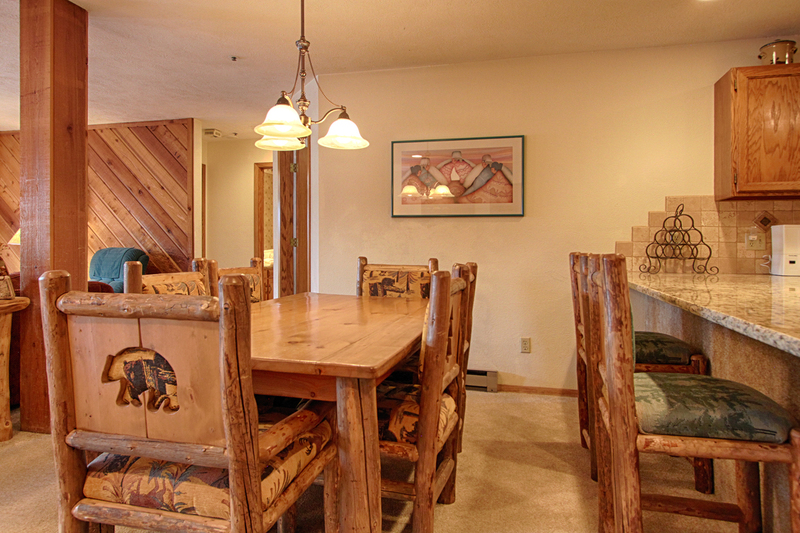 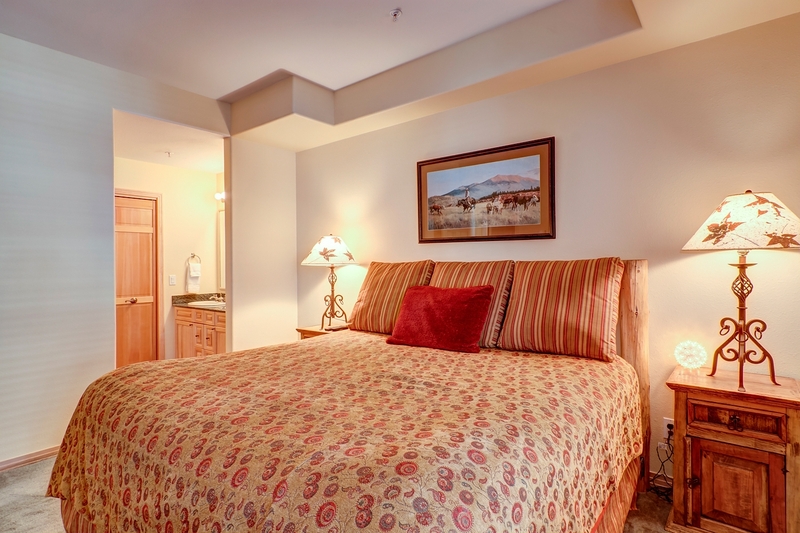 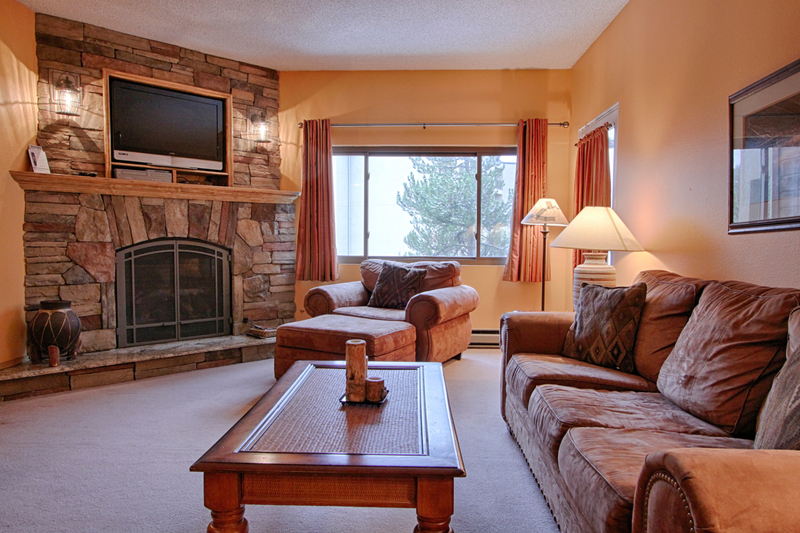 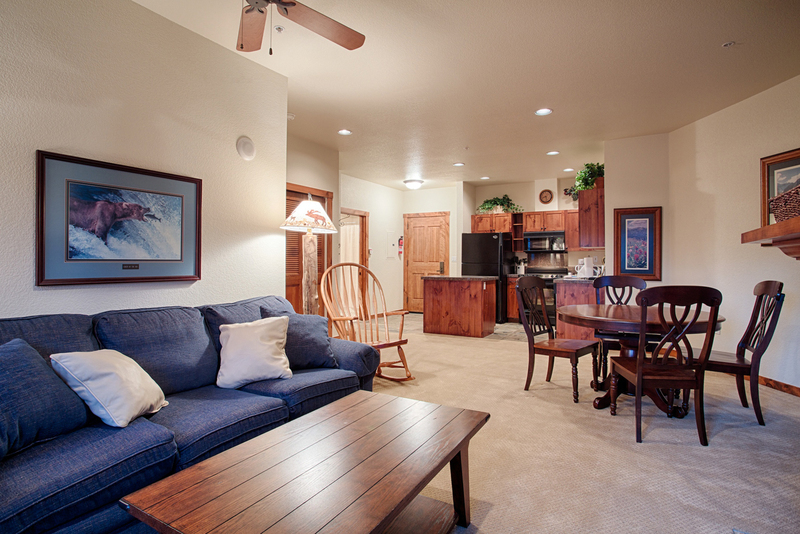 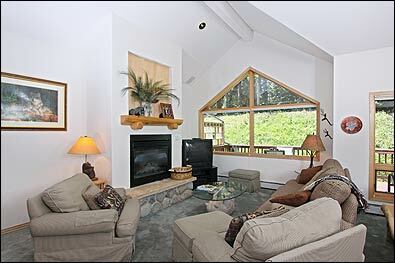 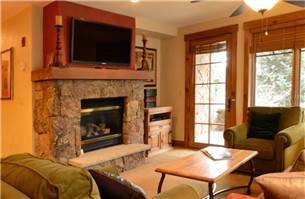 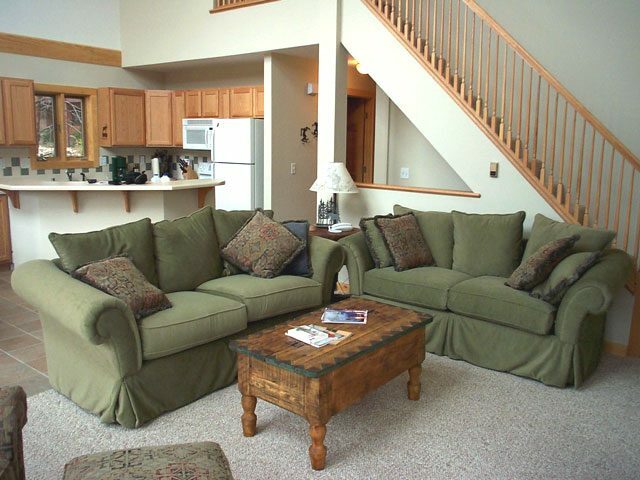 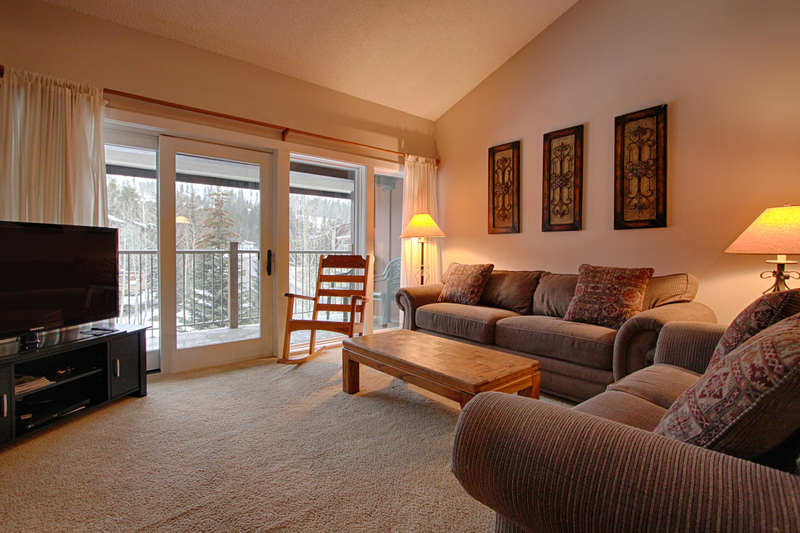 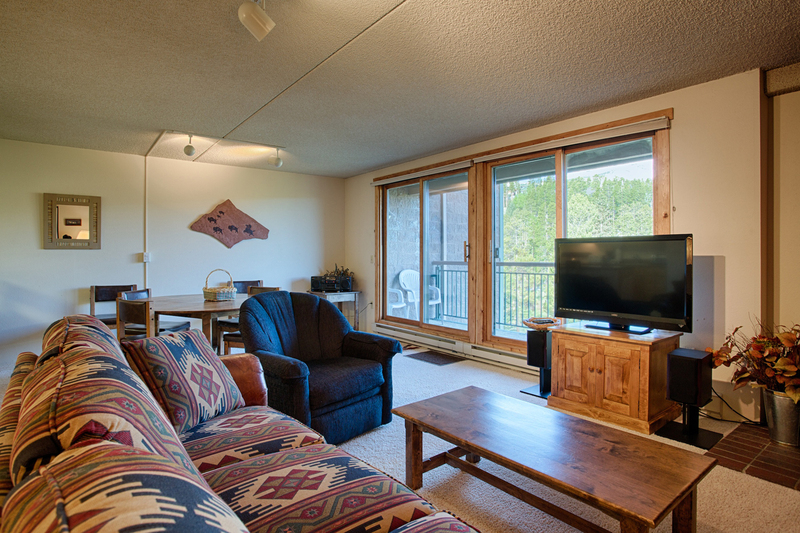 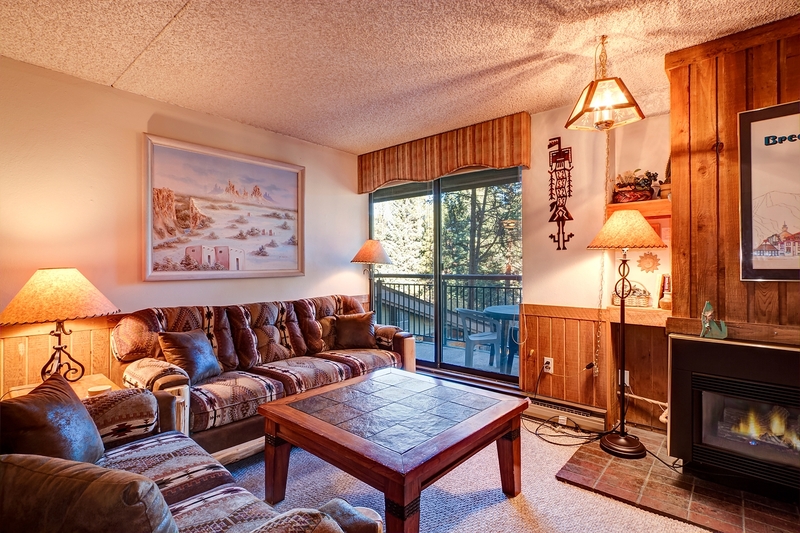 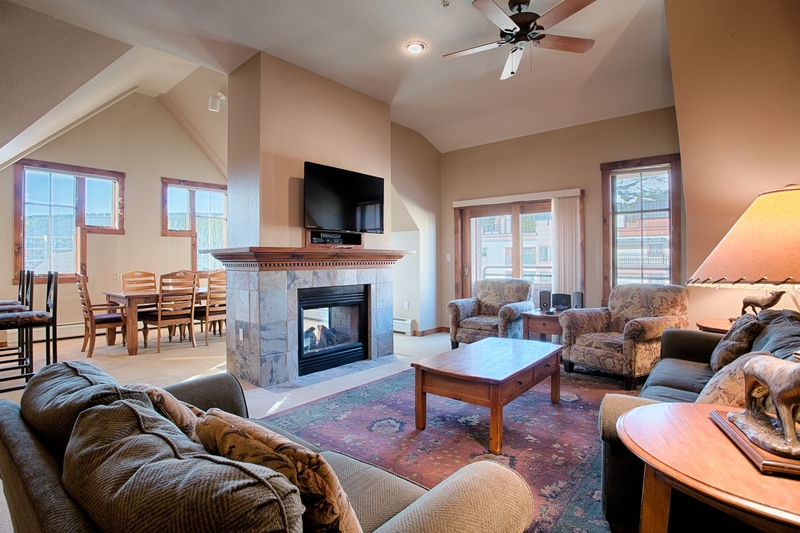 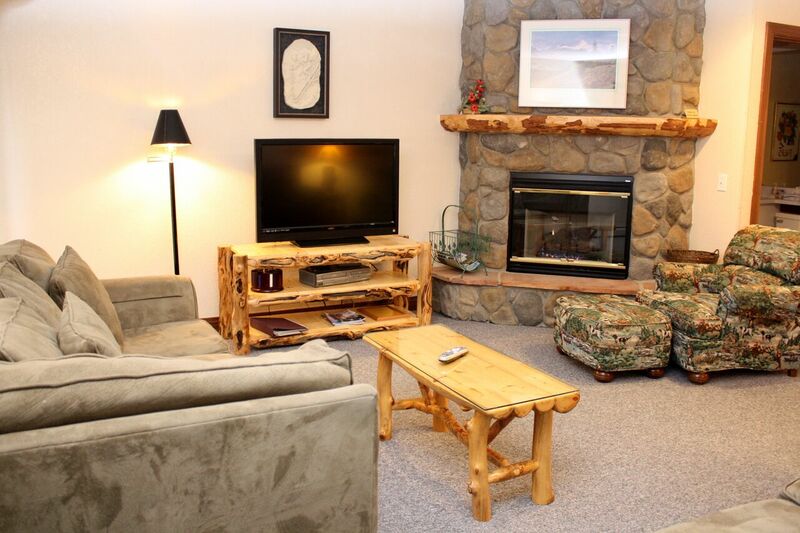 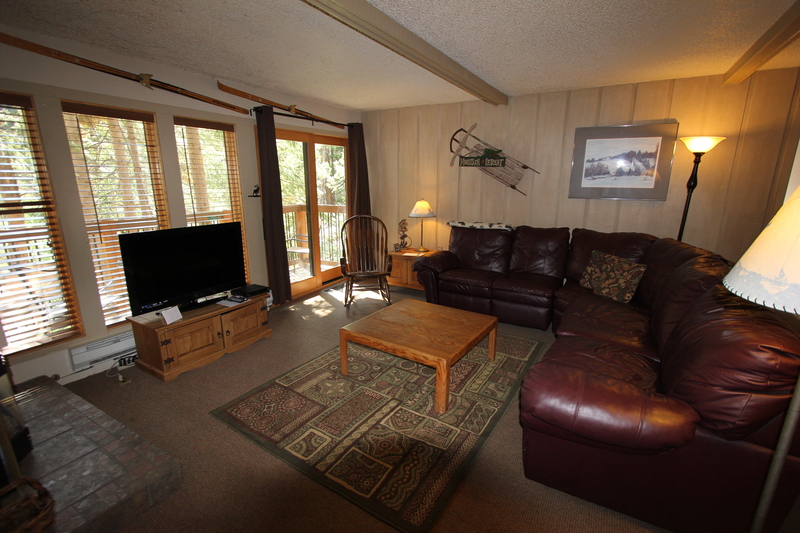 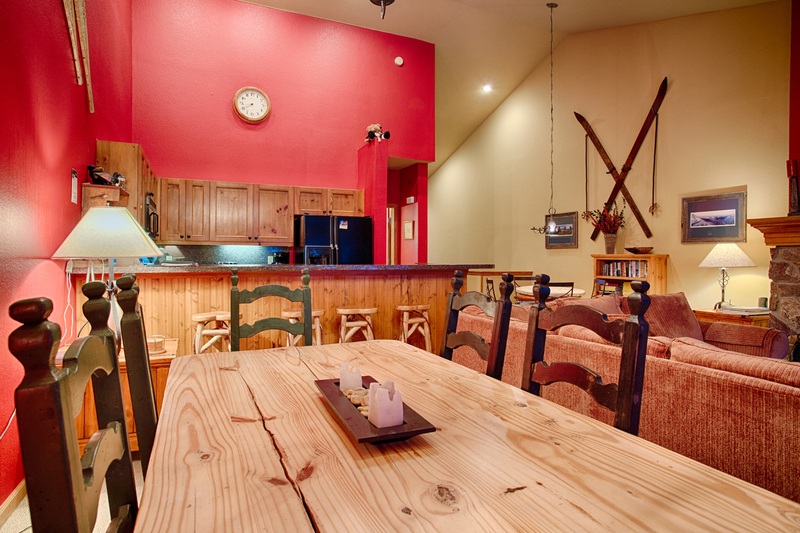 Call us to book your mountain vacation today! 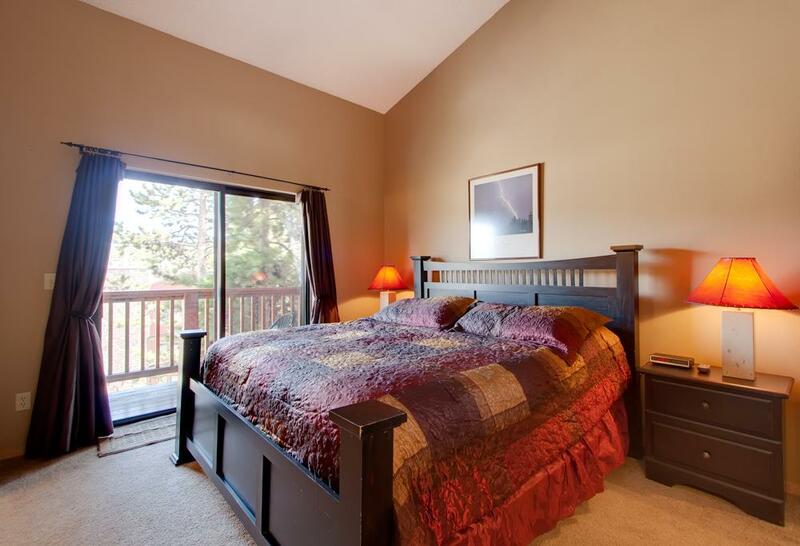 – Queen suite 1: queen bed, private bathroom with shower, LCD TV, mini refrigerator, private entrance. 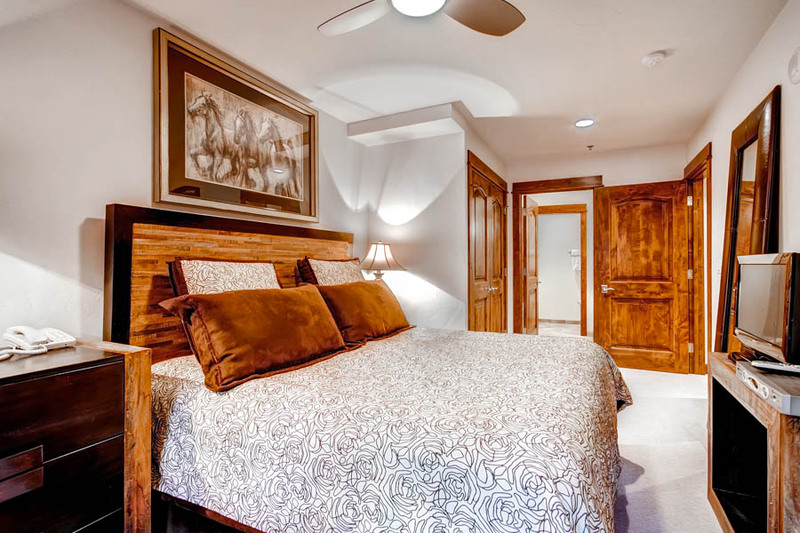 – Queen suite 2: queen bed, private bathroom with shower, LCD TV. 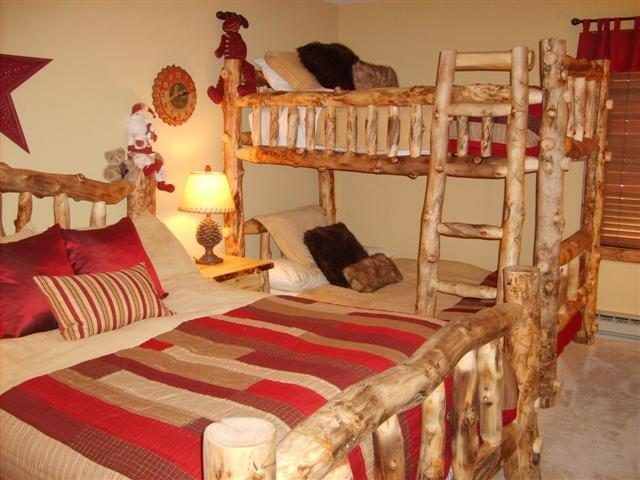 – Bedroom 3: twin bed. 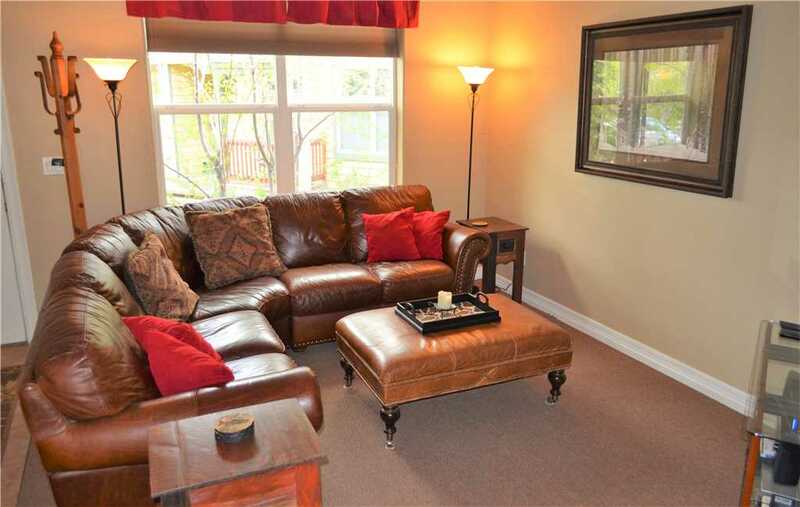 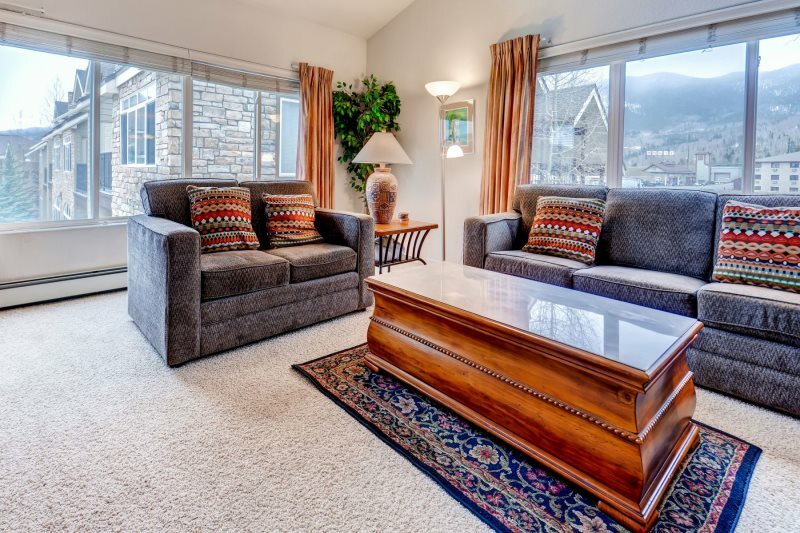 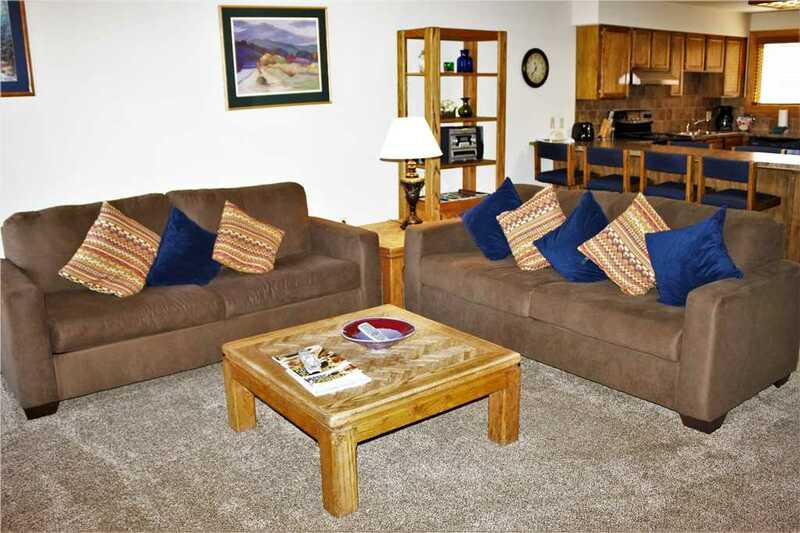 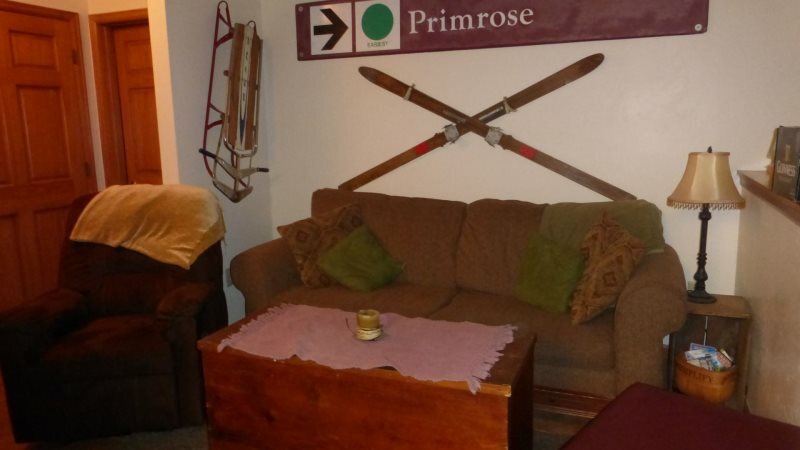 – Living area: two queen sleeper sofas. 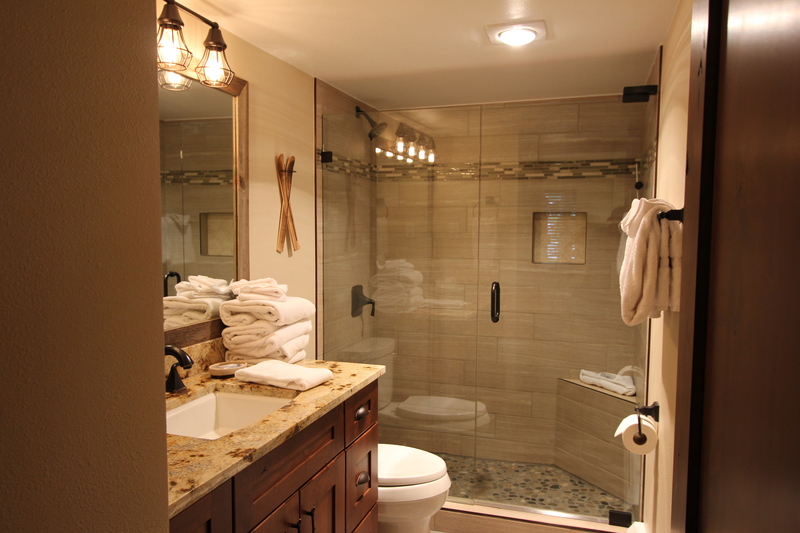 – Bathroom: 1/2 guest bath.